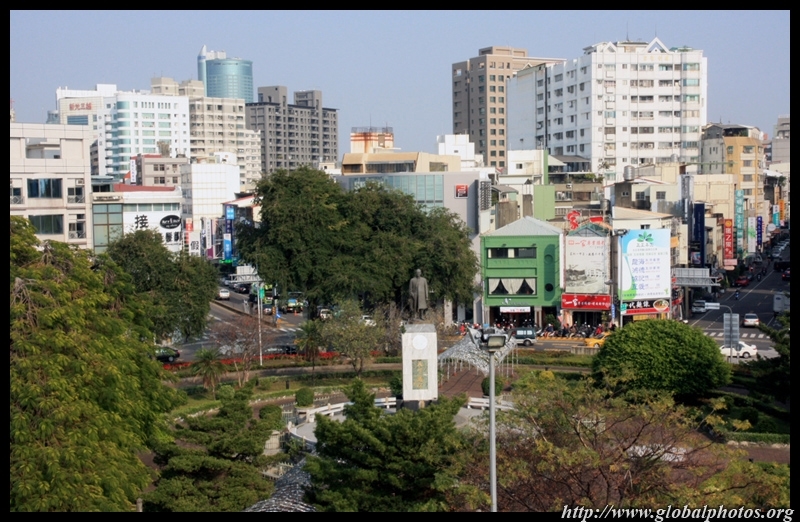 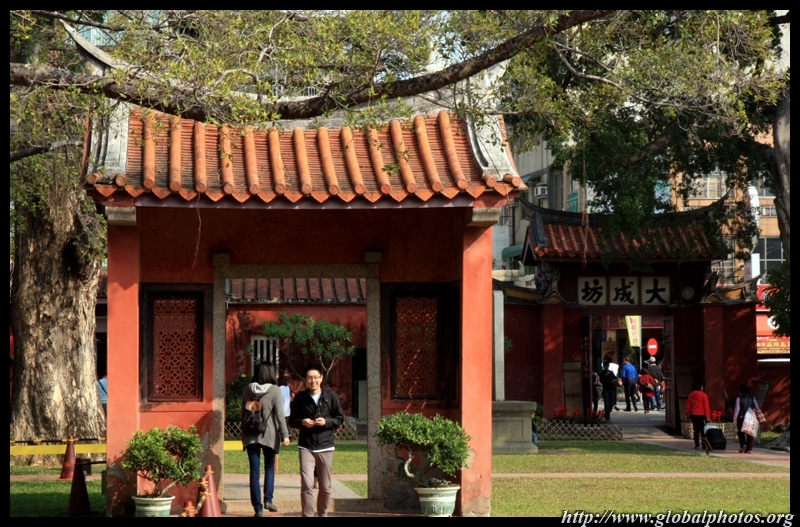 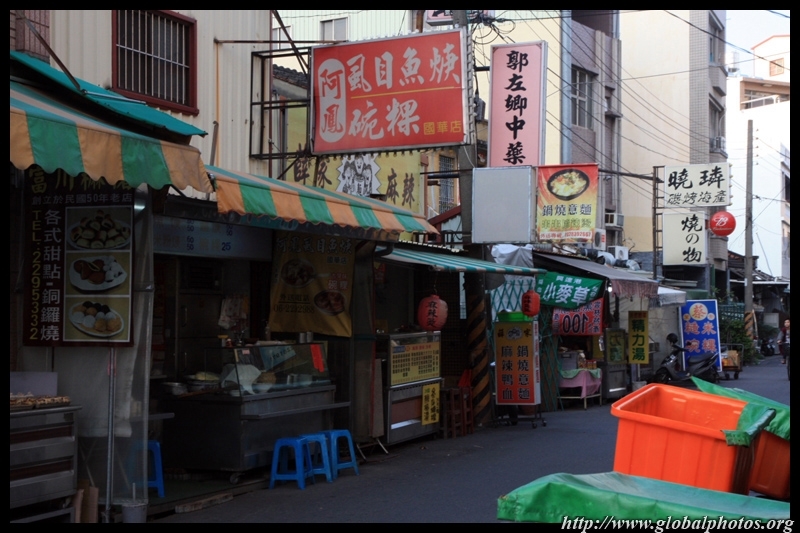 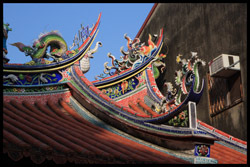 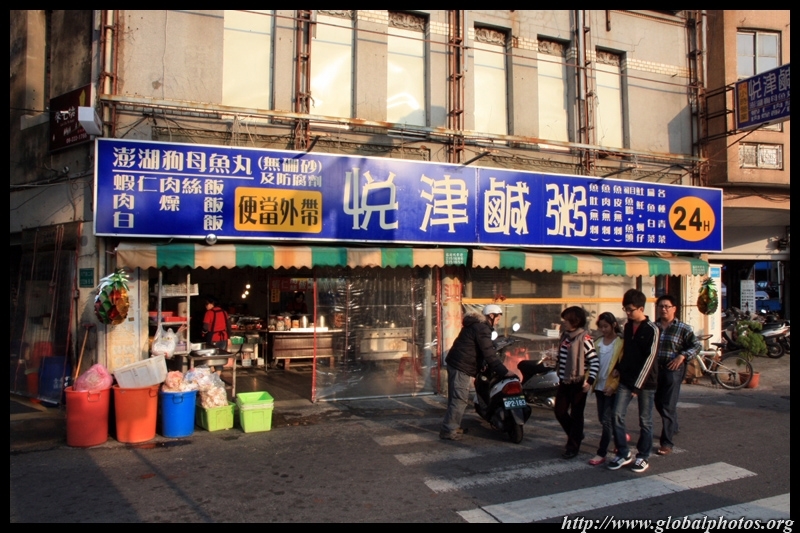 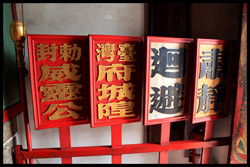 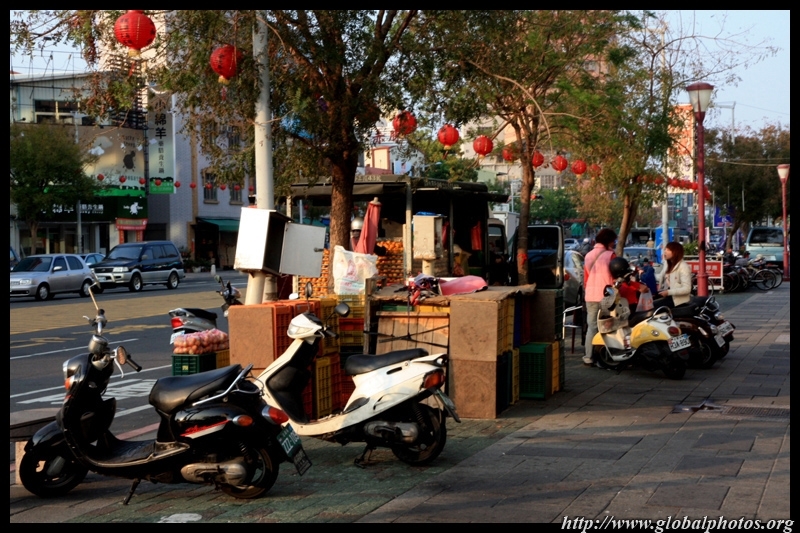 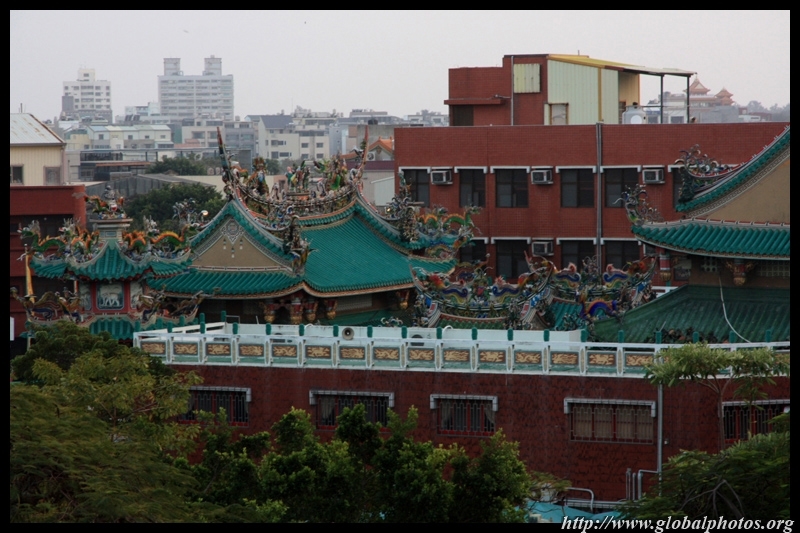 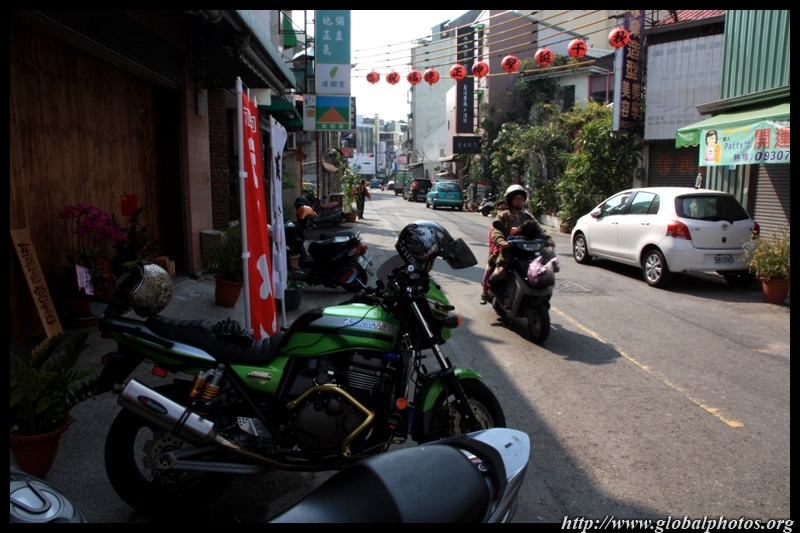 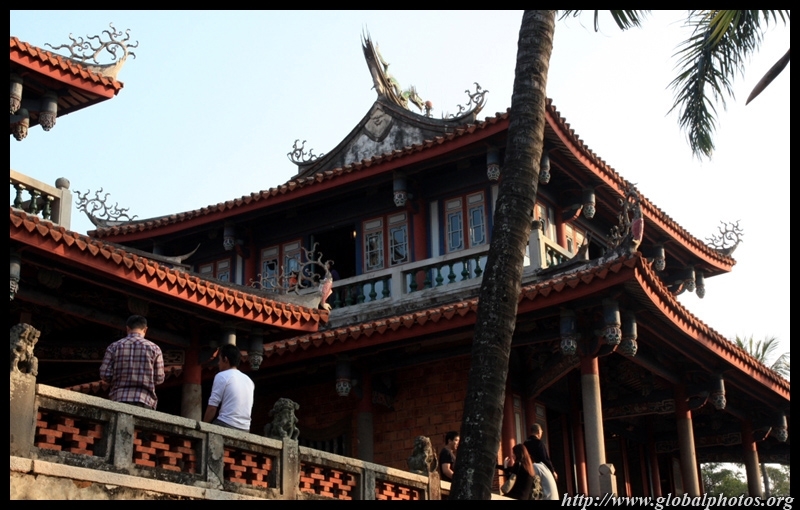 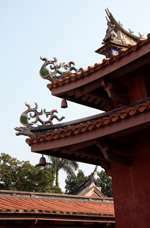 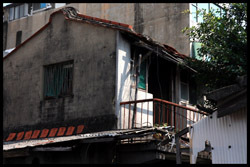 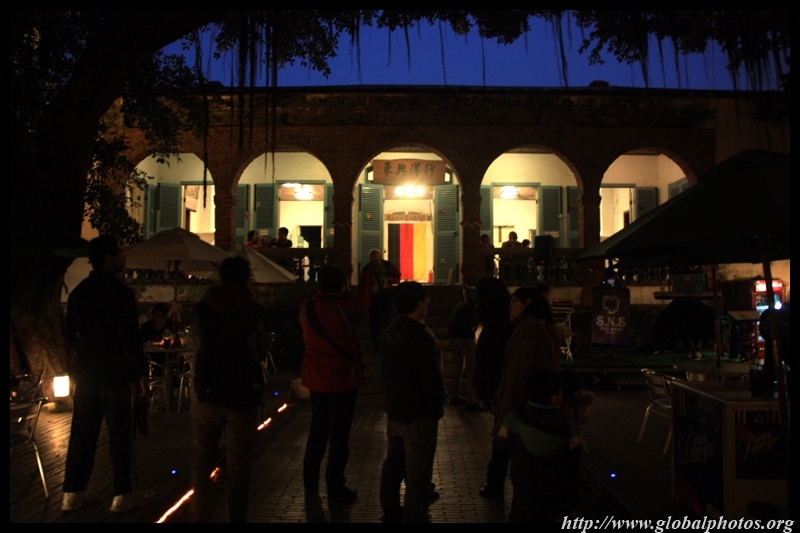 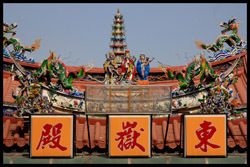 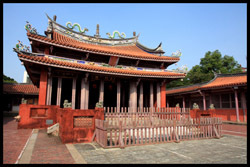 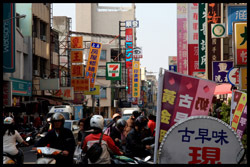 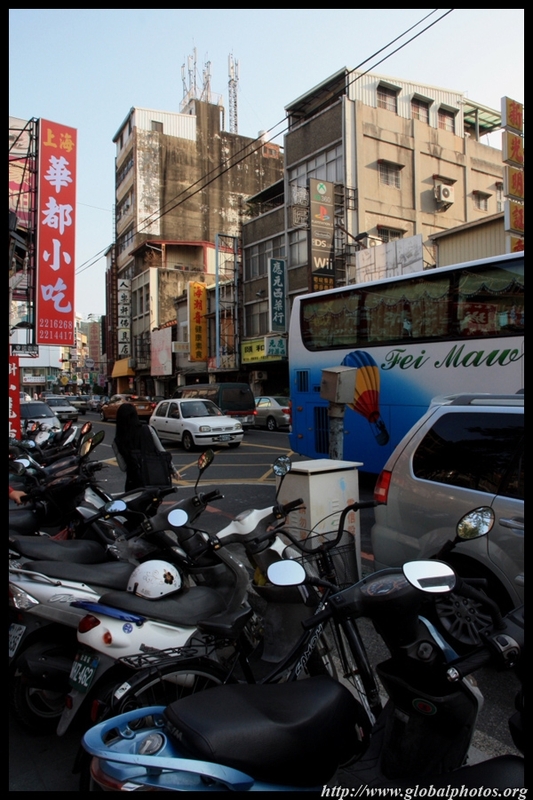 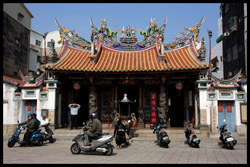 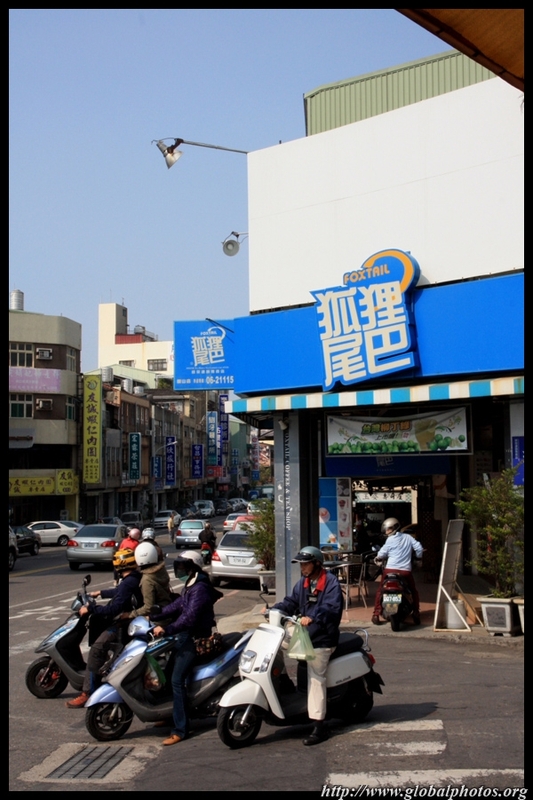 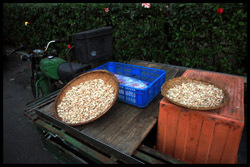 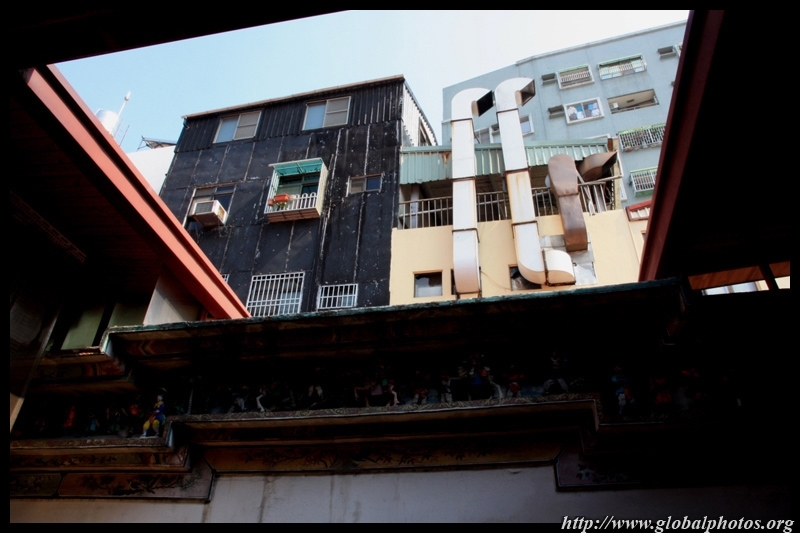 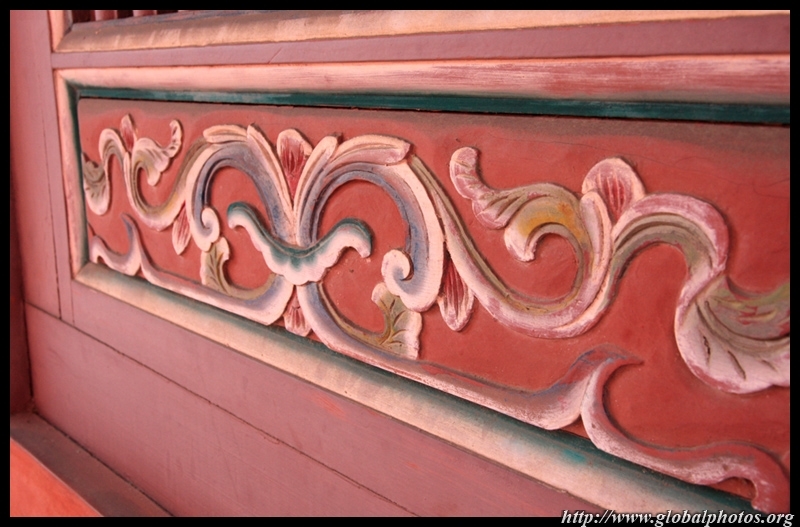 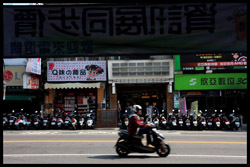 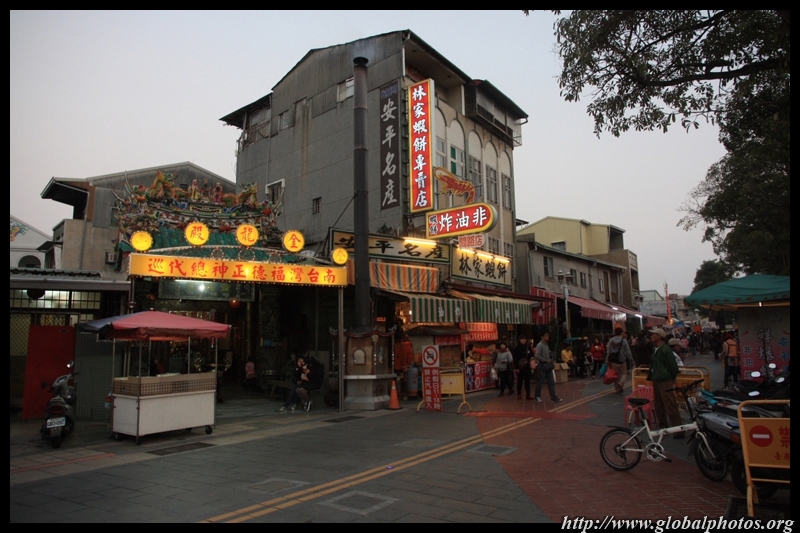 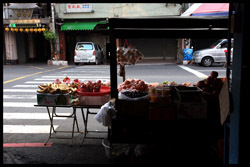 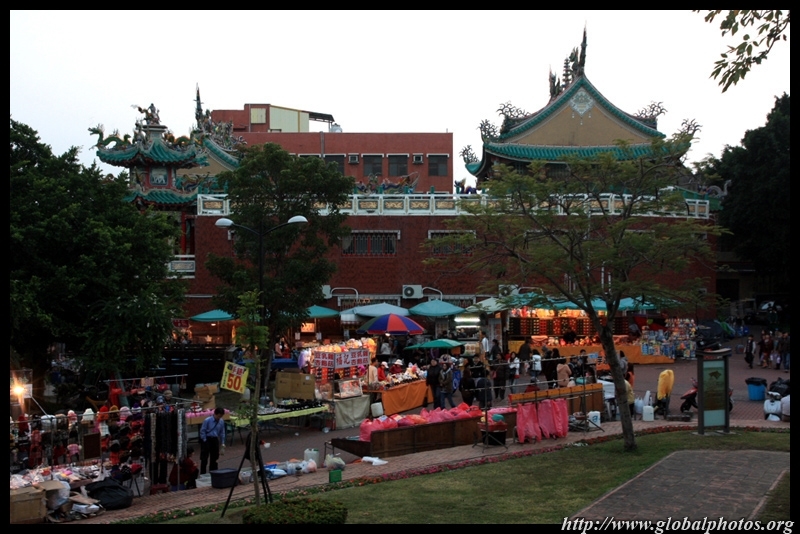 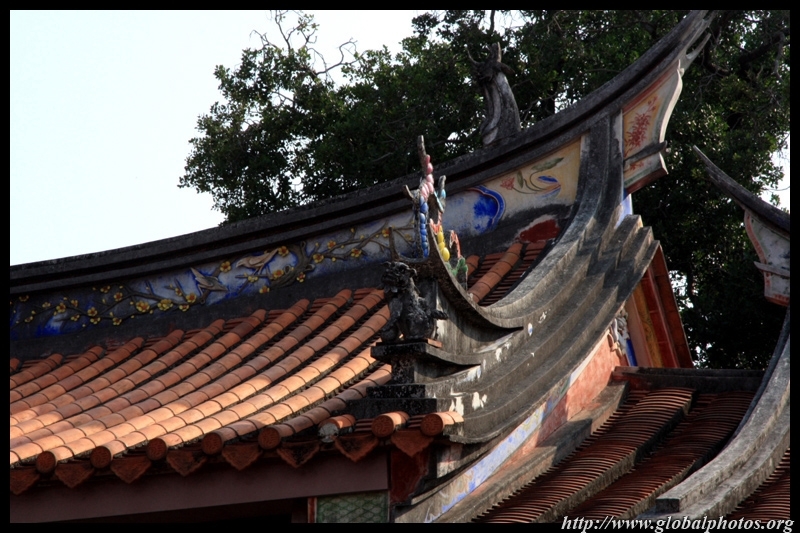 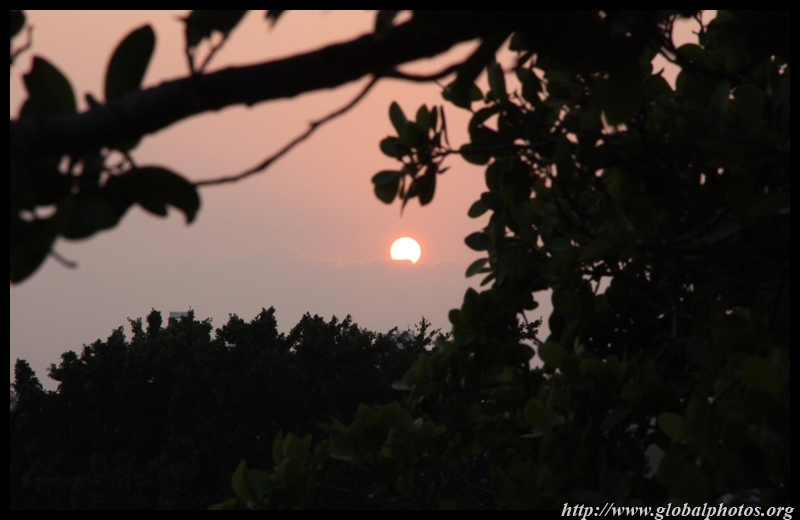 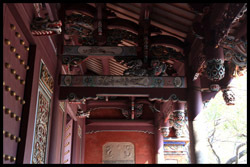 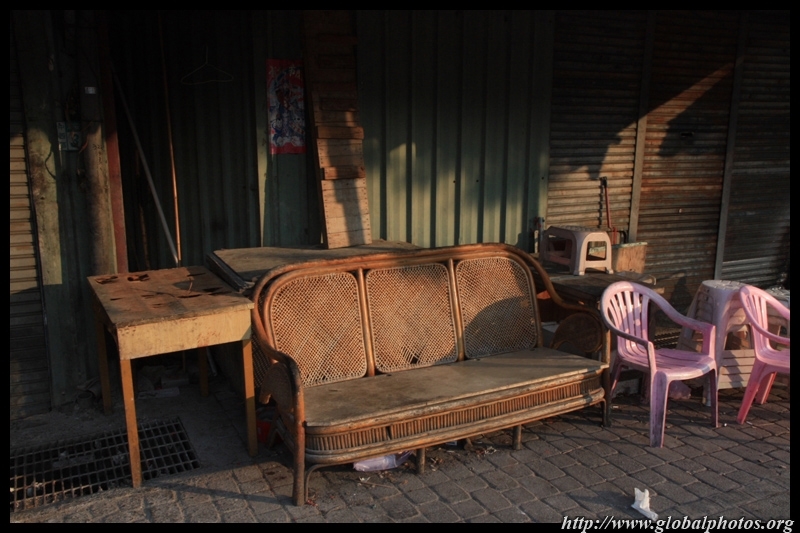 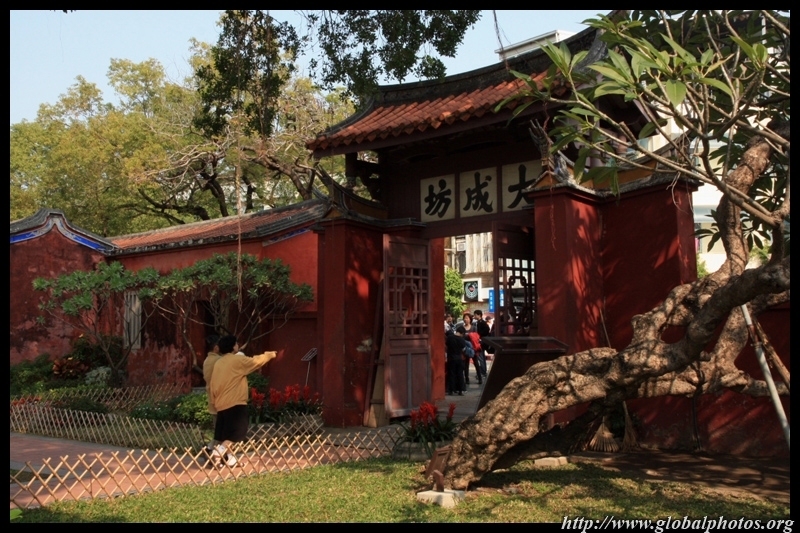 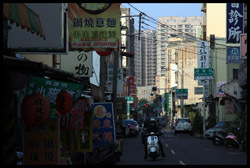 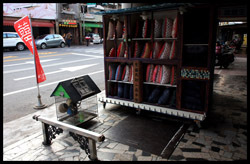 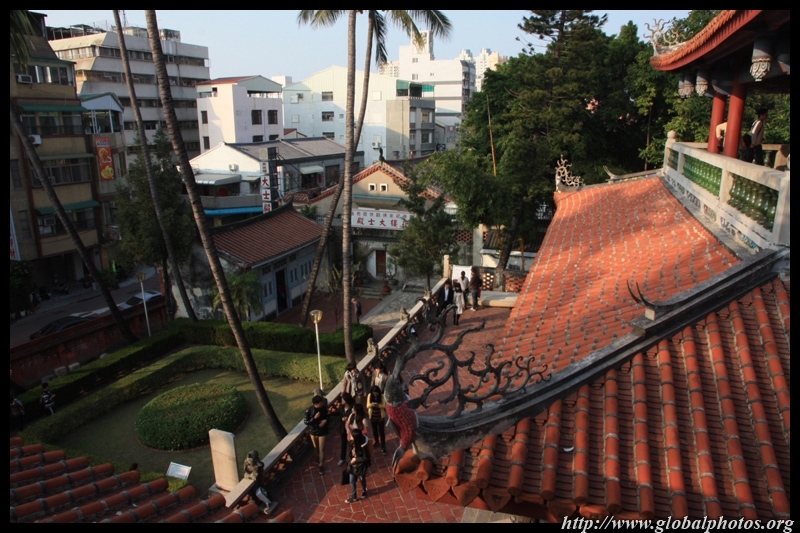 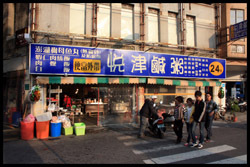 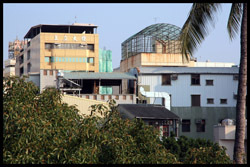 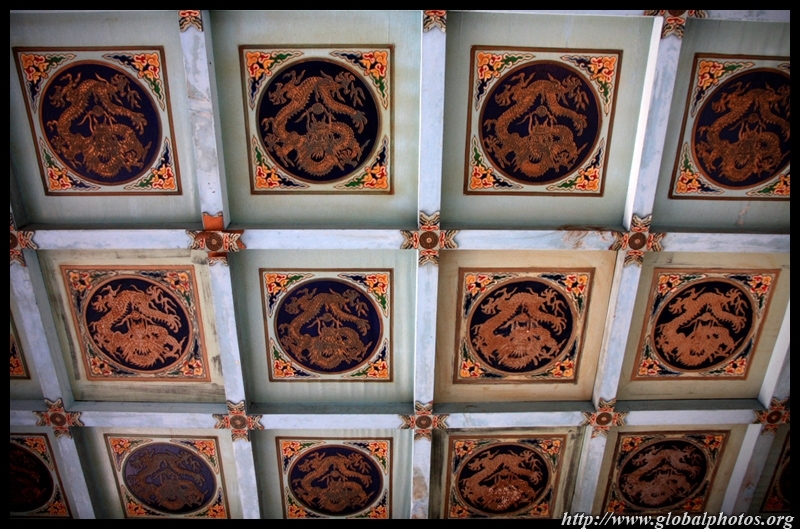 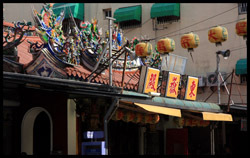 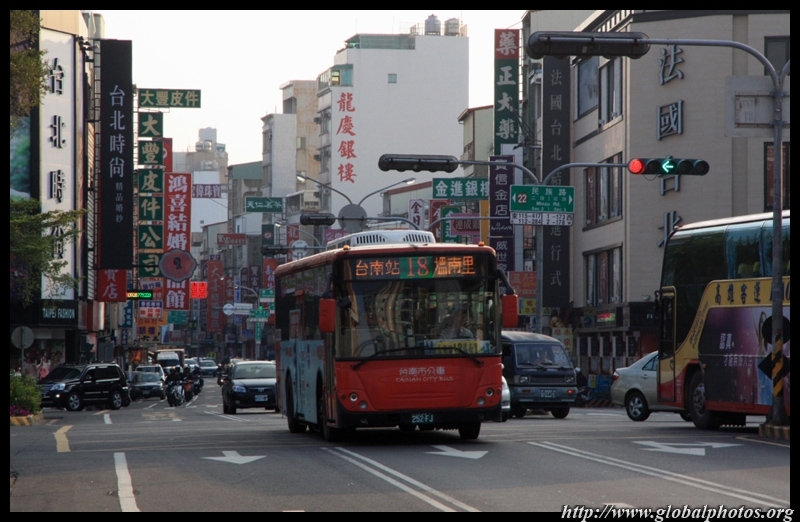 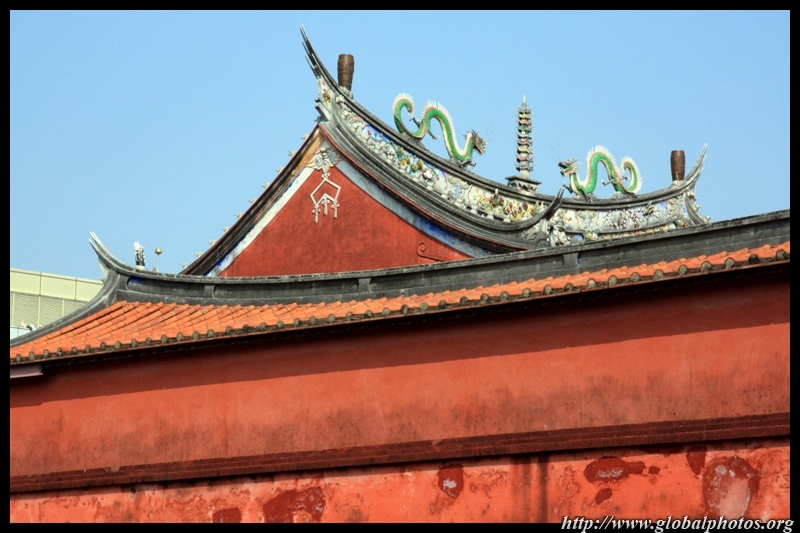 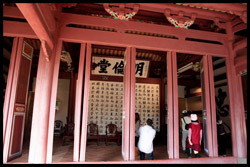 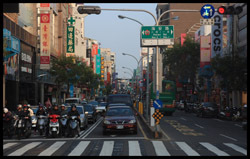 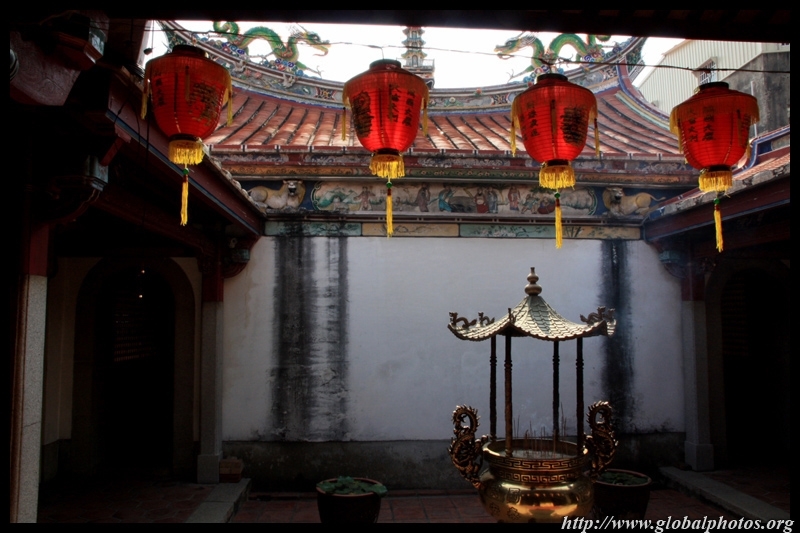 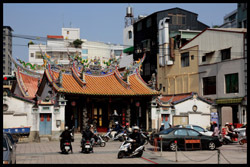 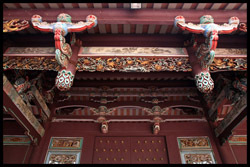 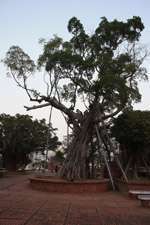 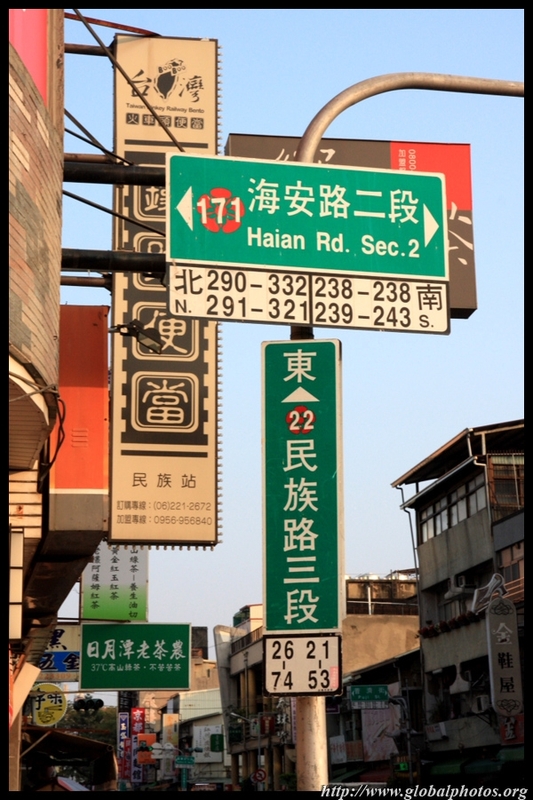 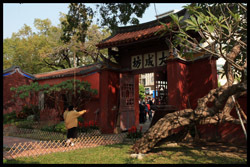 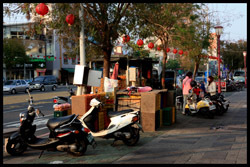 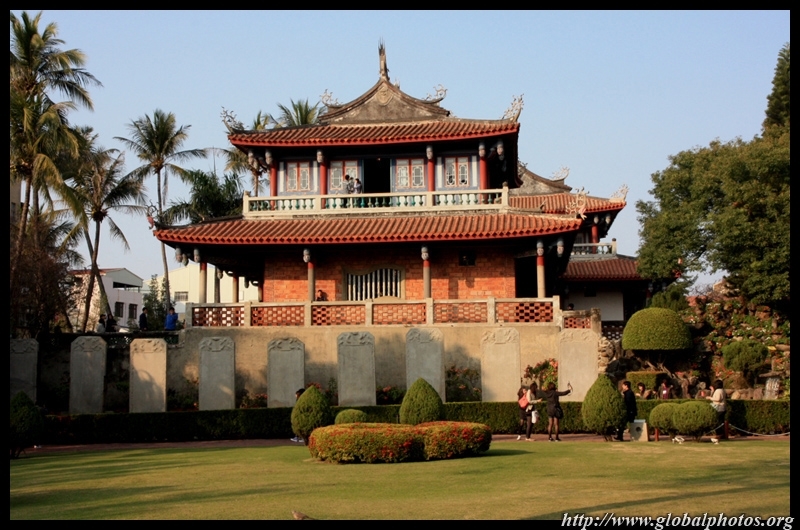 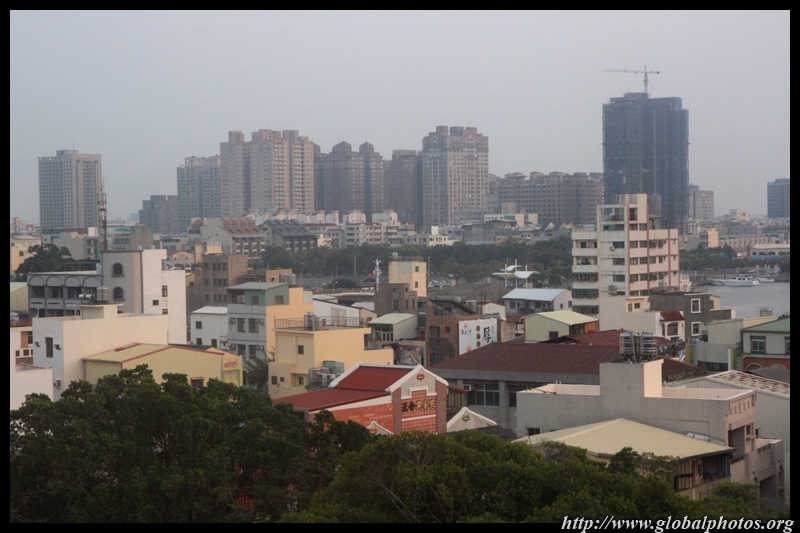 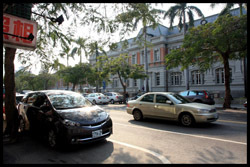 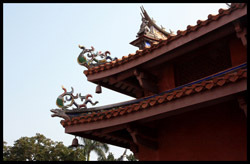 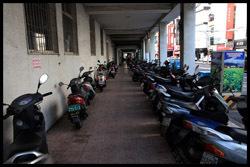 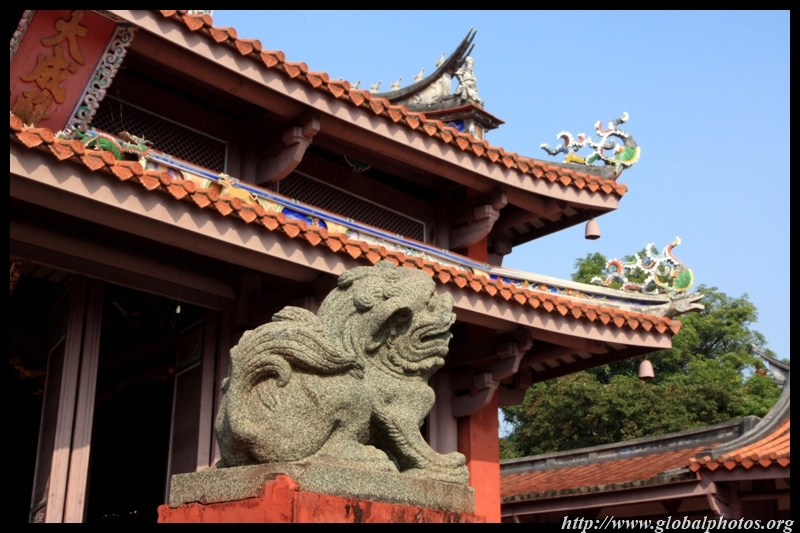 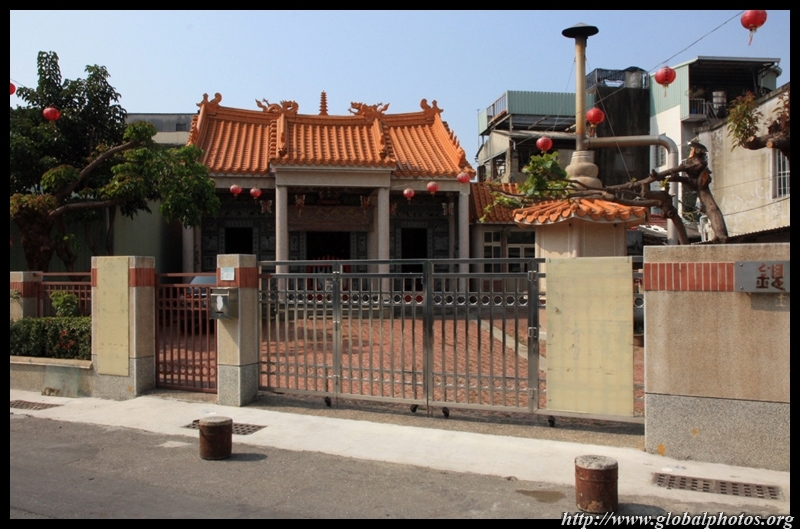 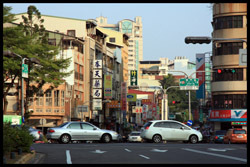 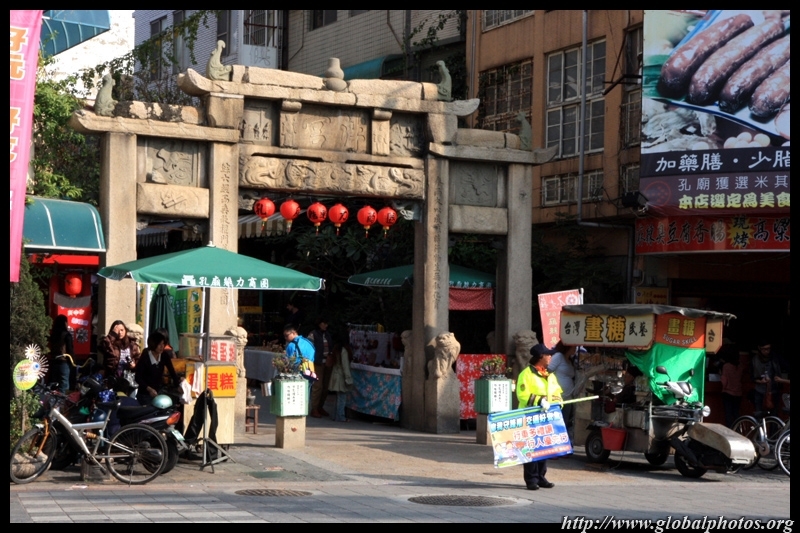 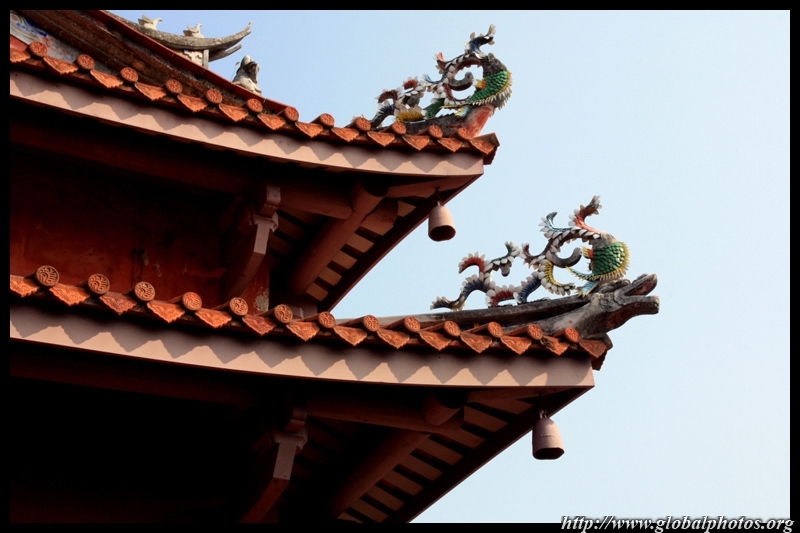 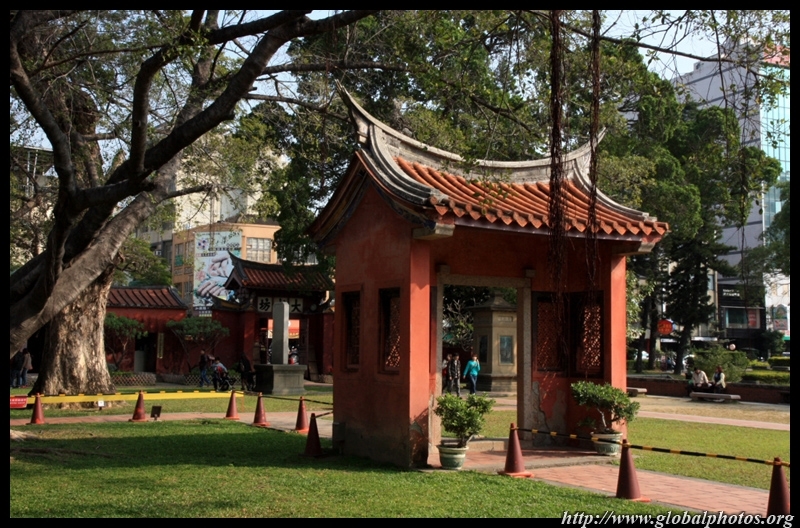 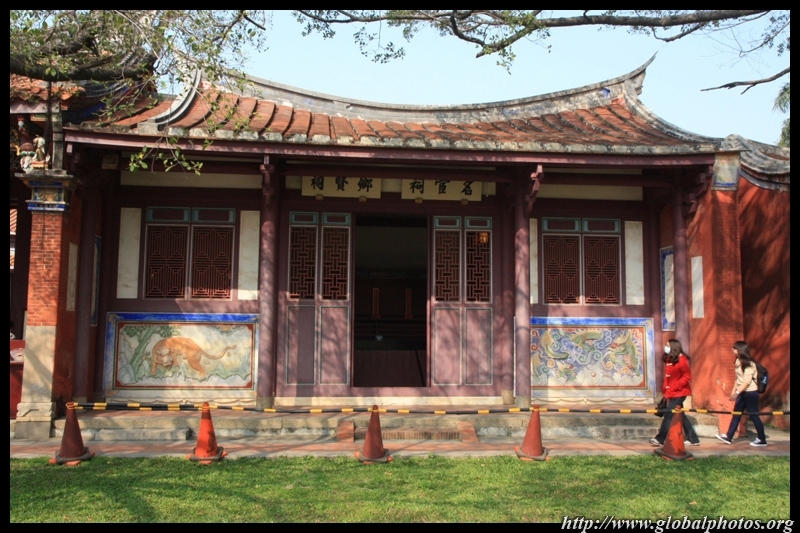 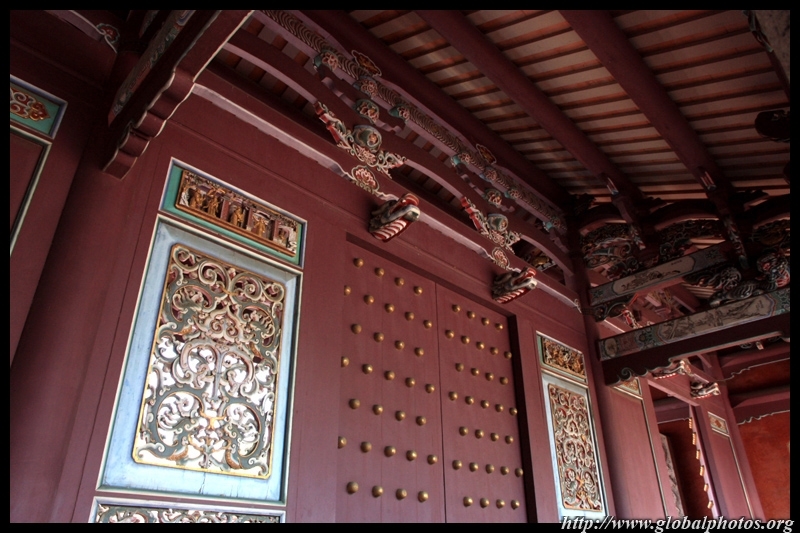 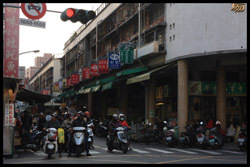 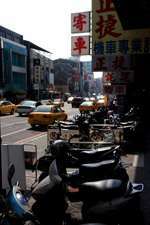 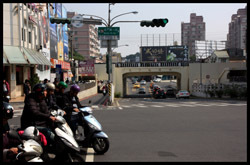 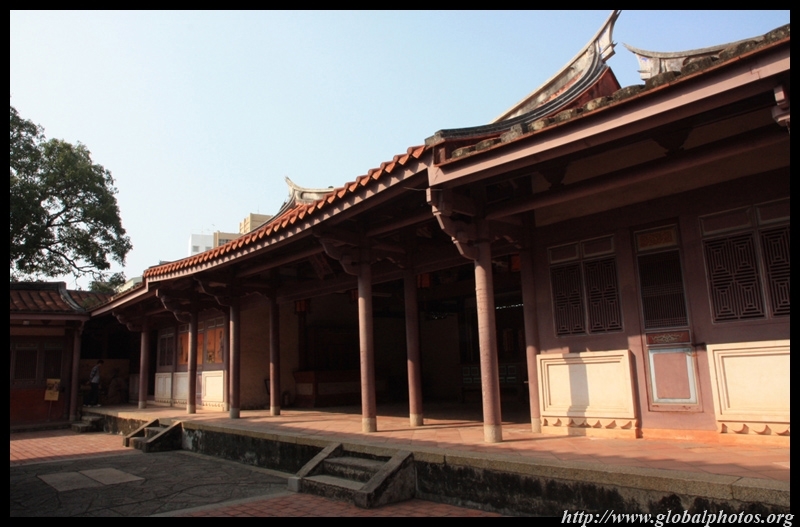 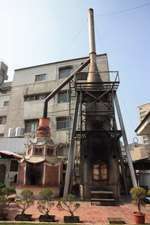 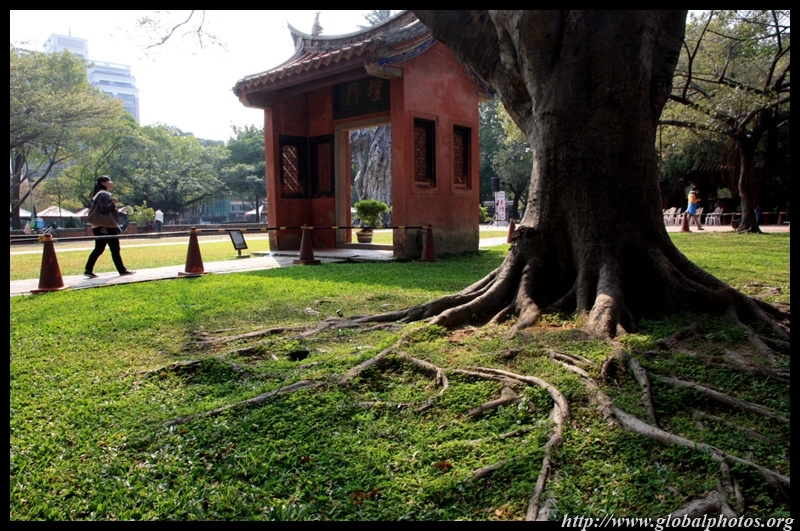 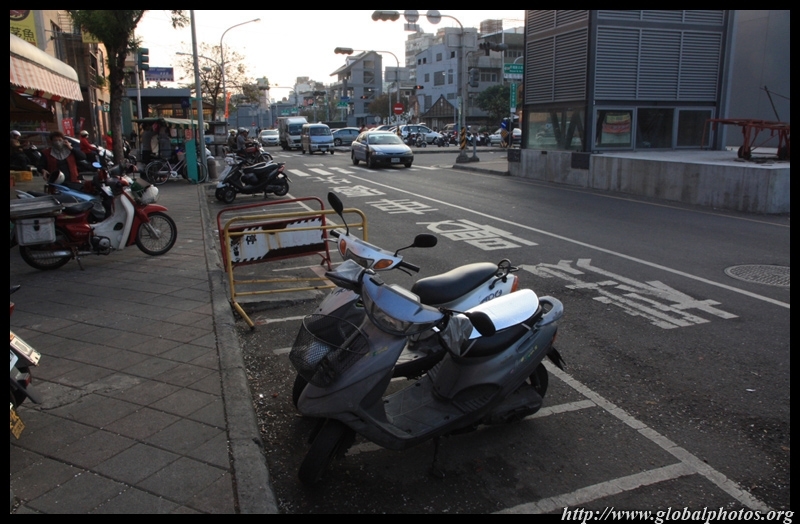 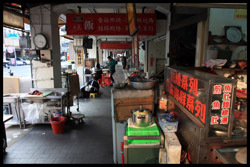 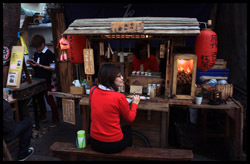 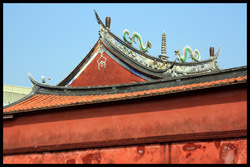 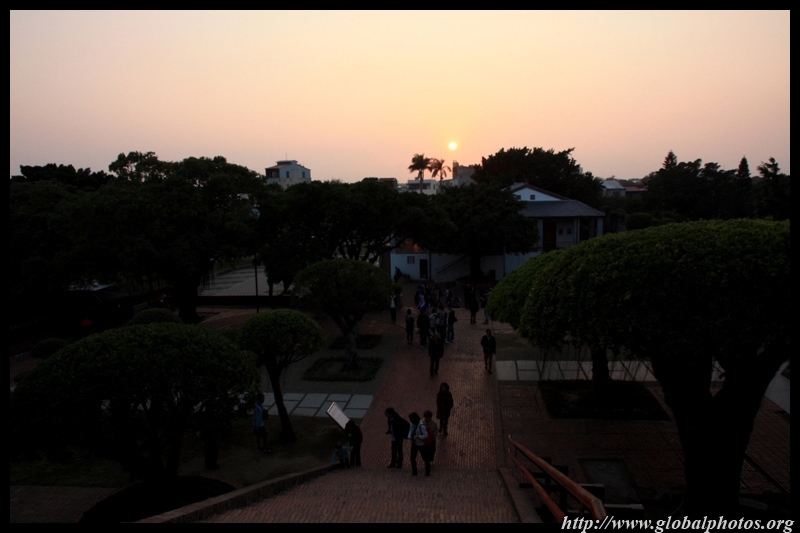 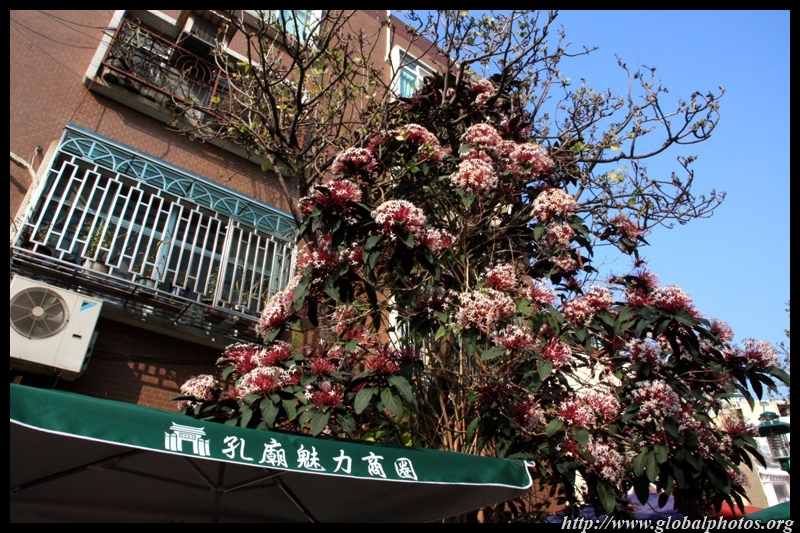 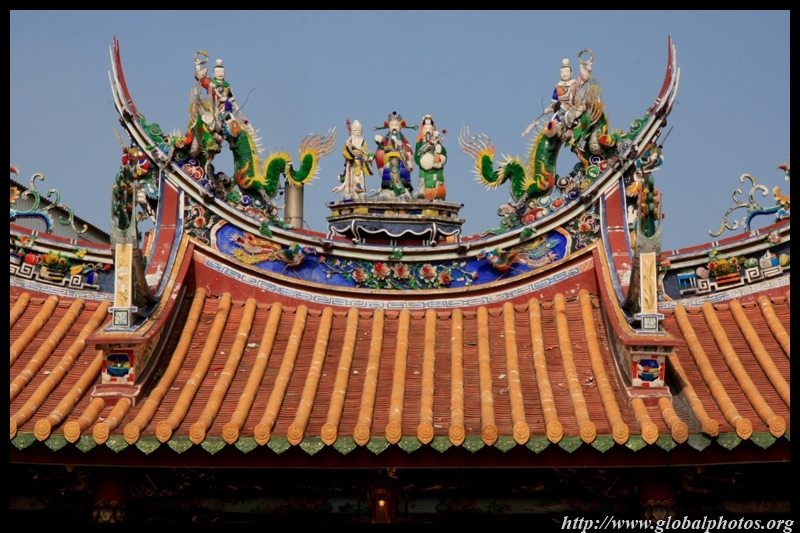 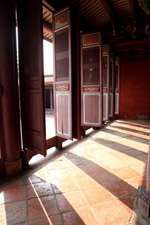 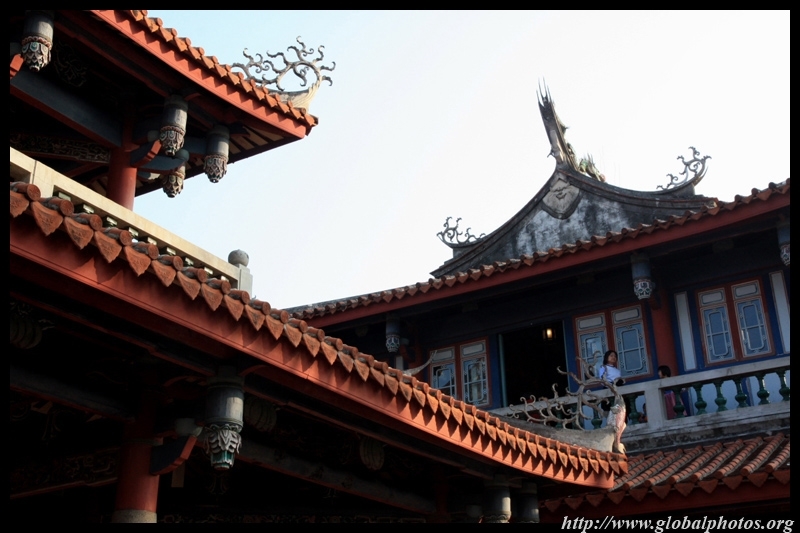 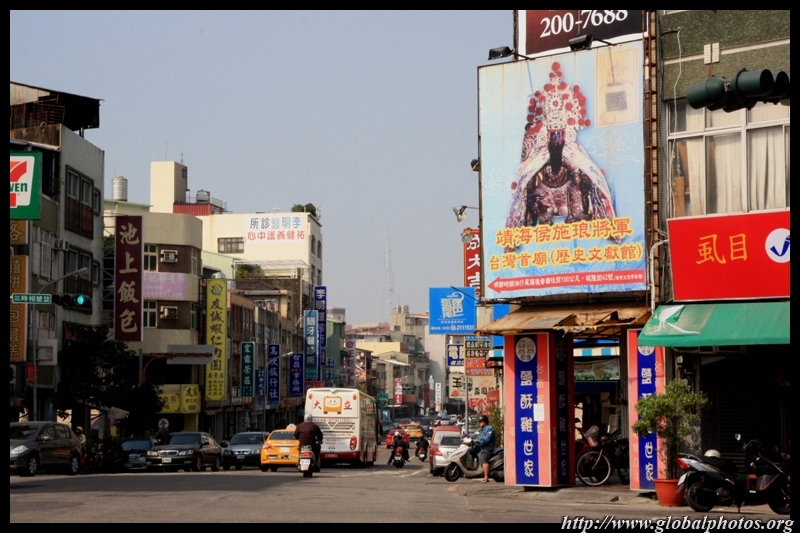 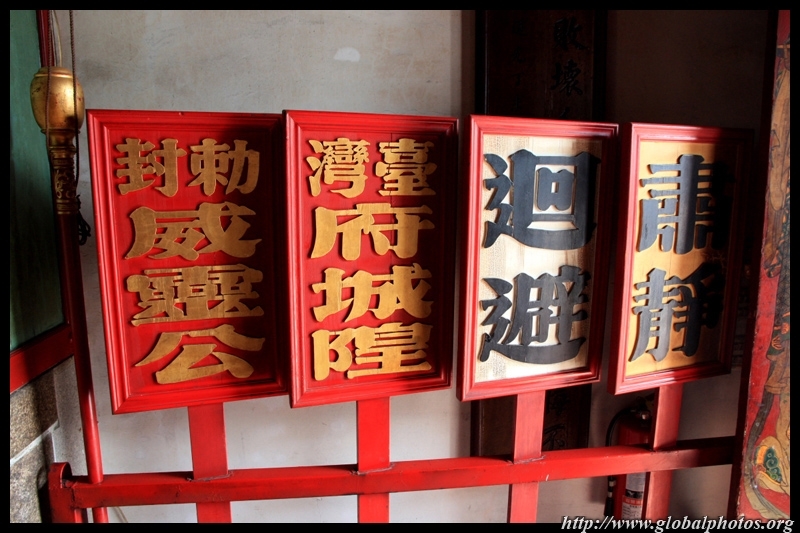 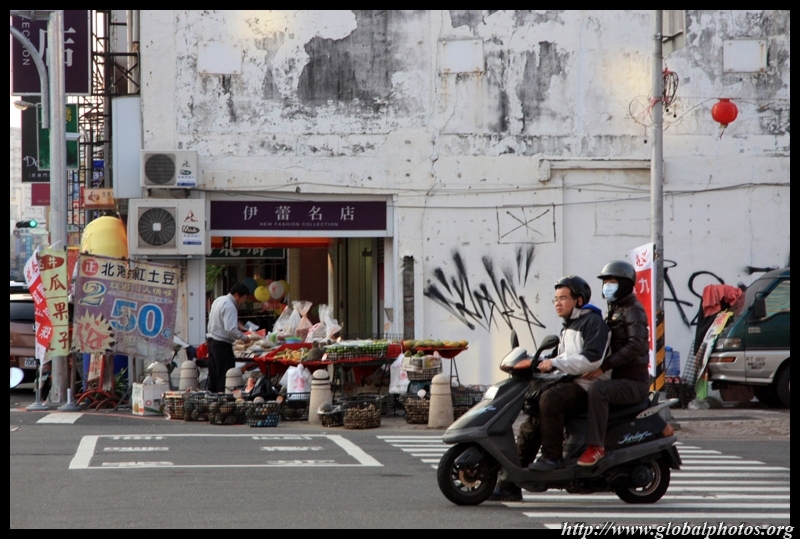 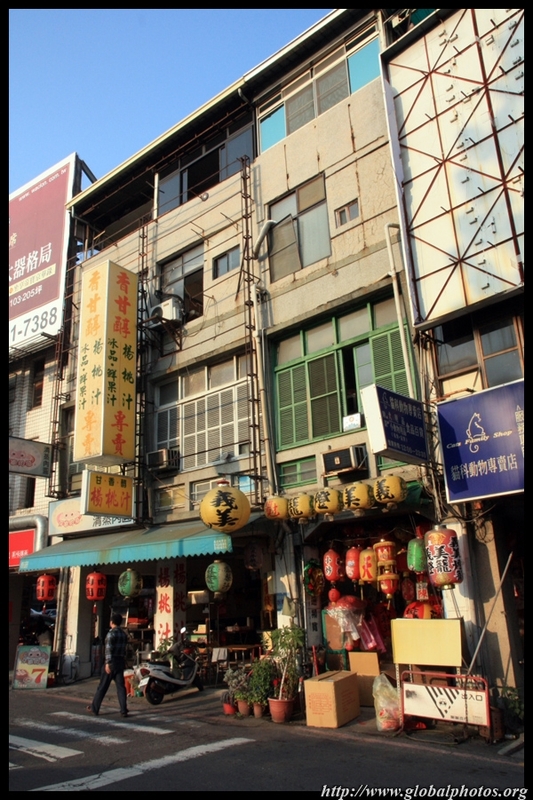 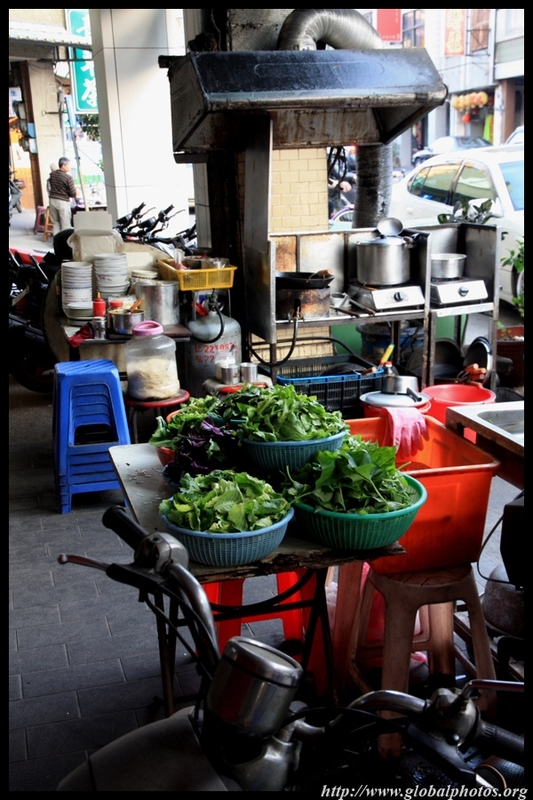 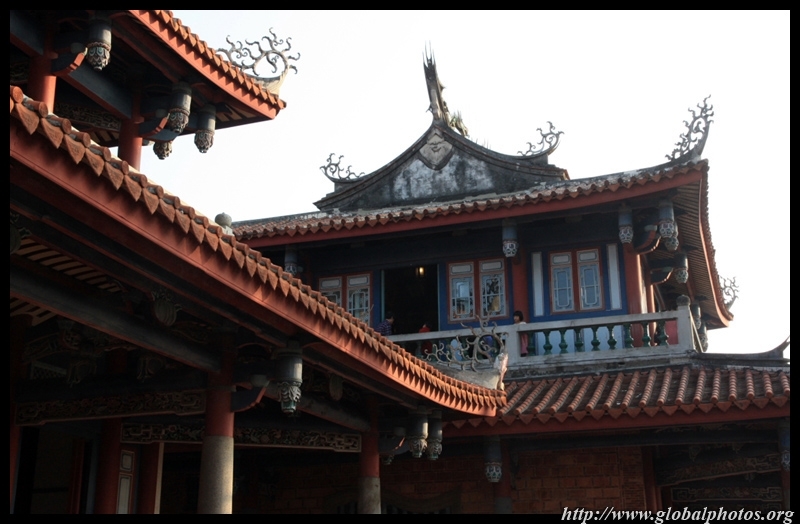 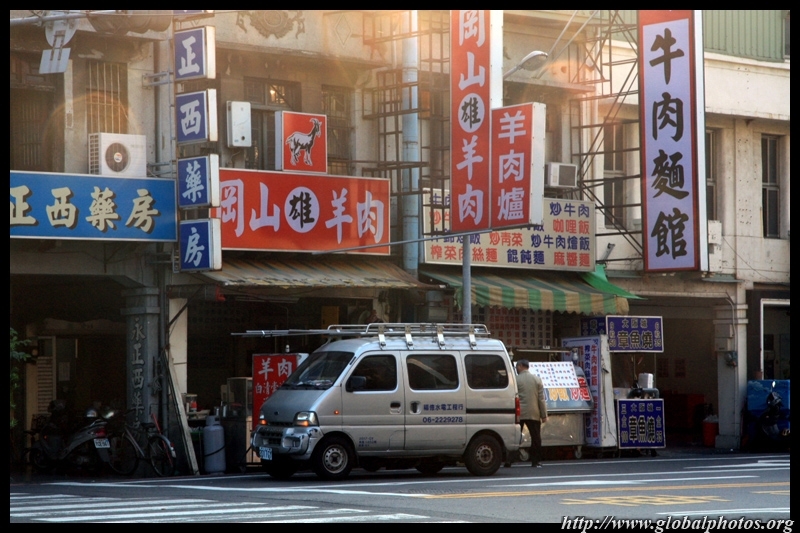 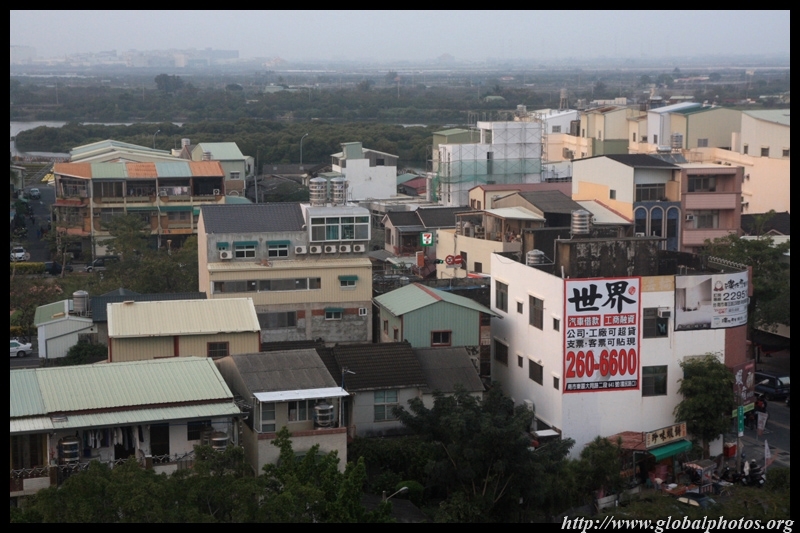 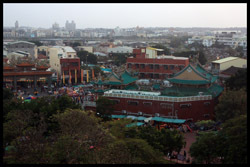 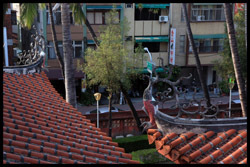 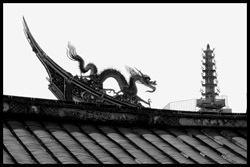 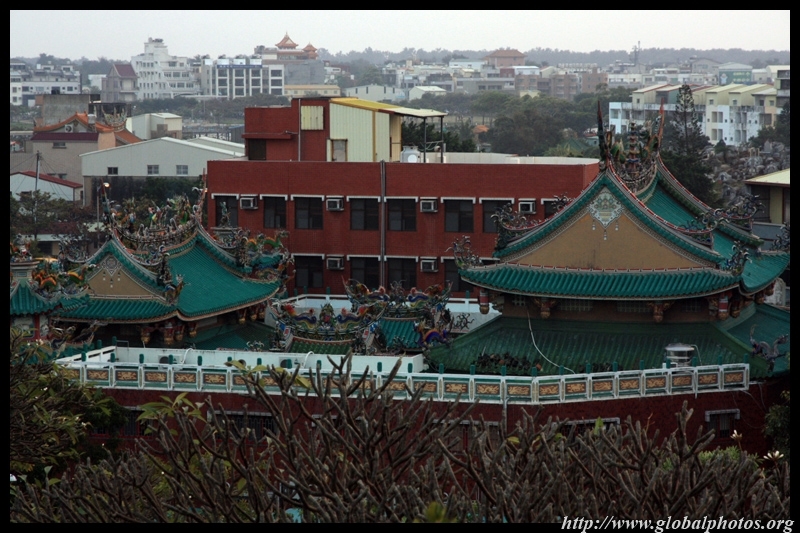 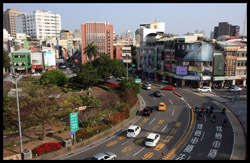 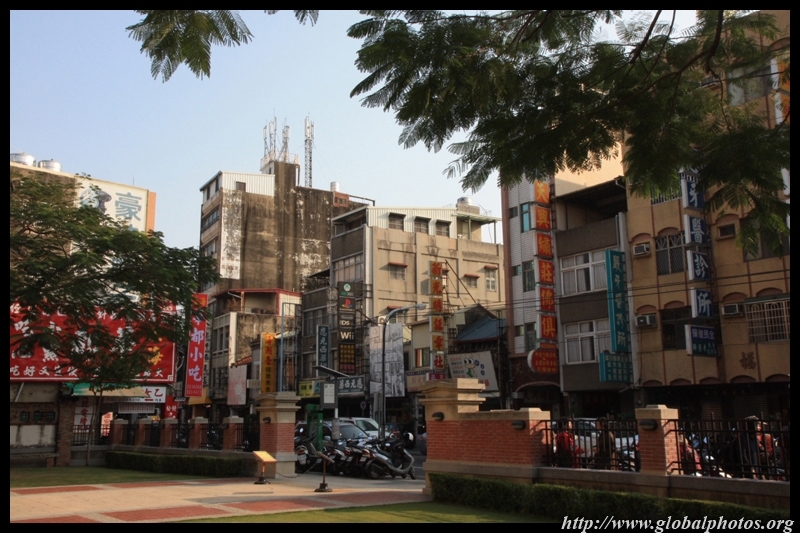 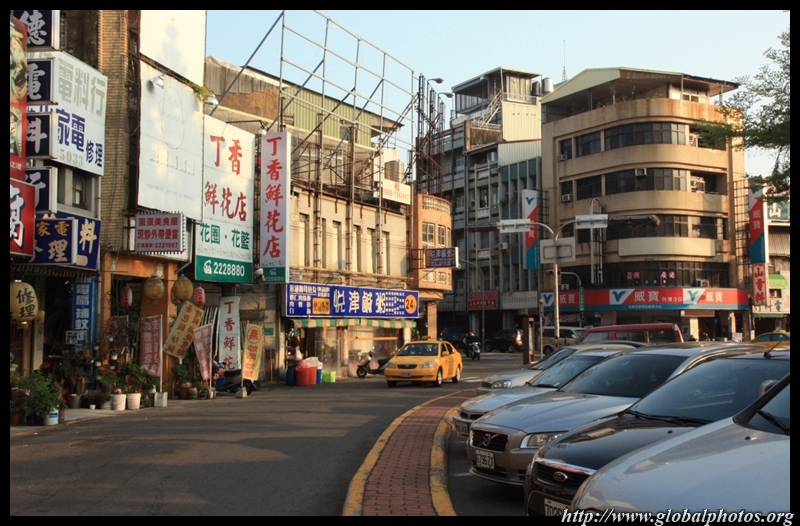 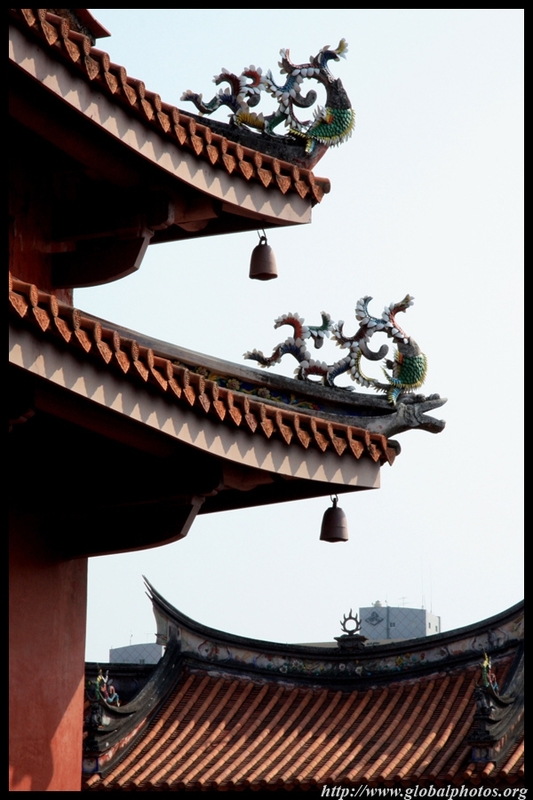 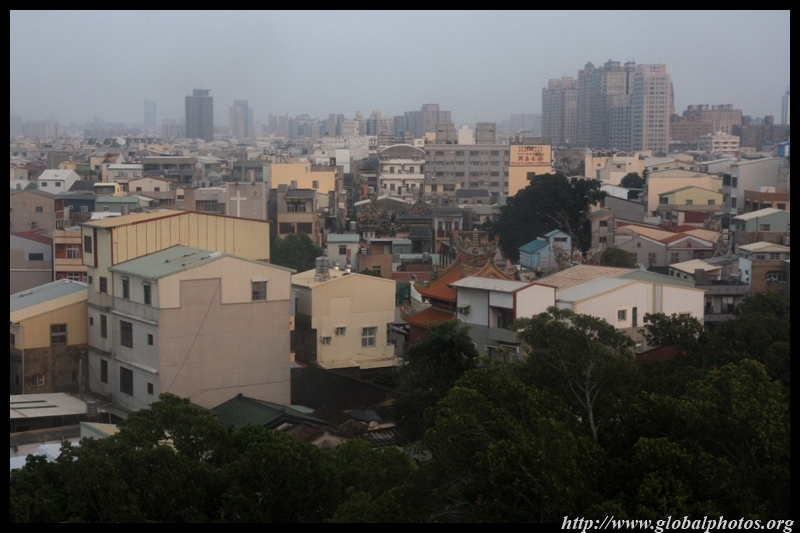 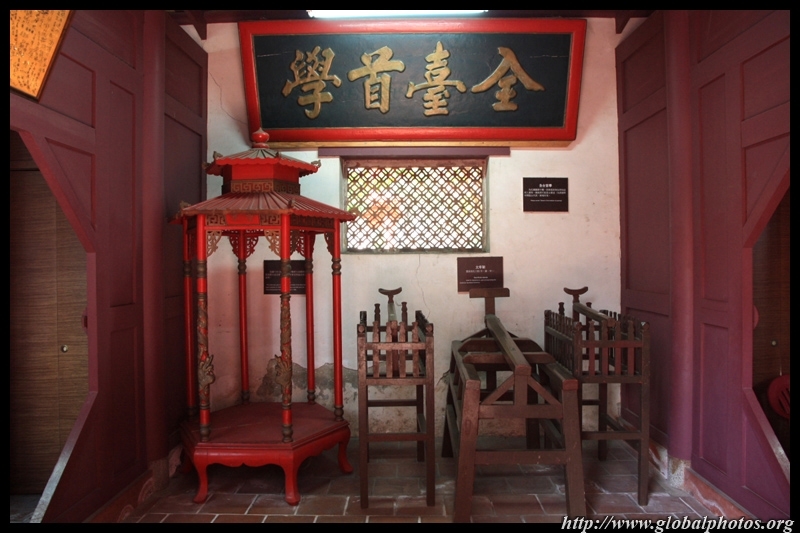 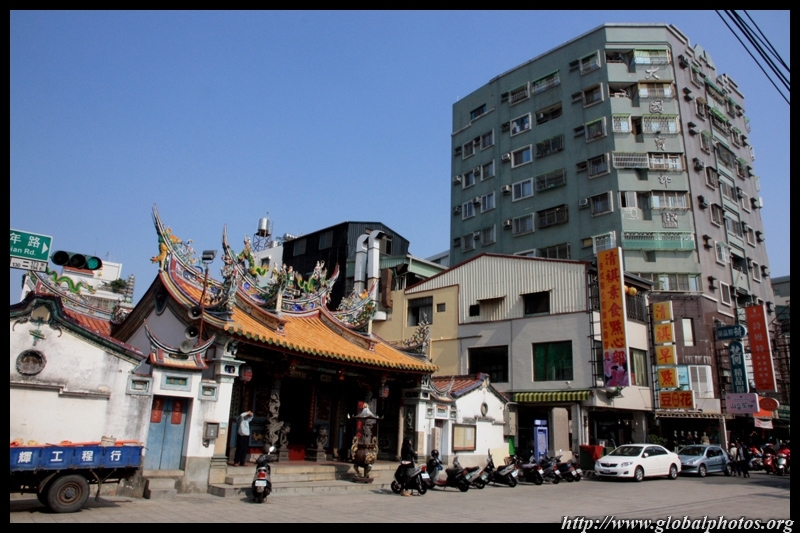 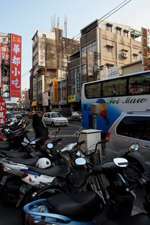 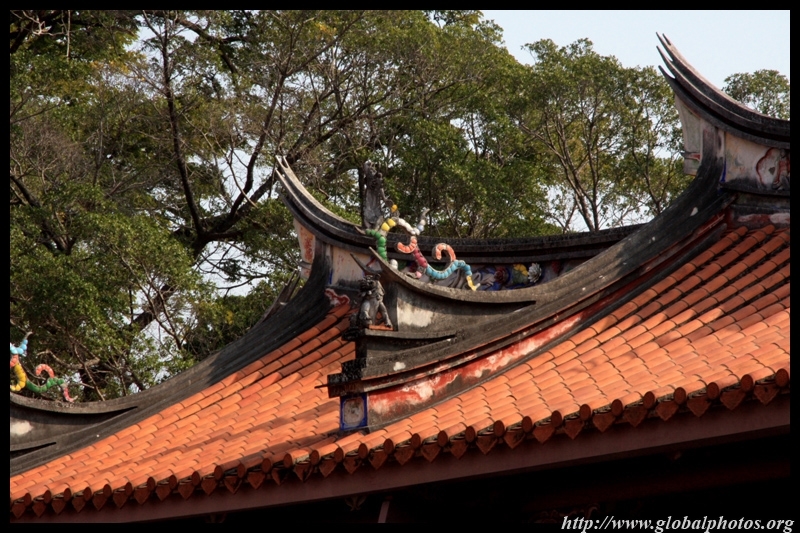 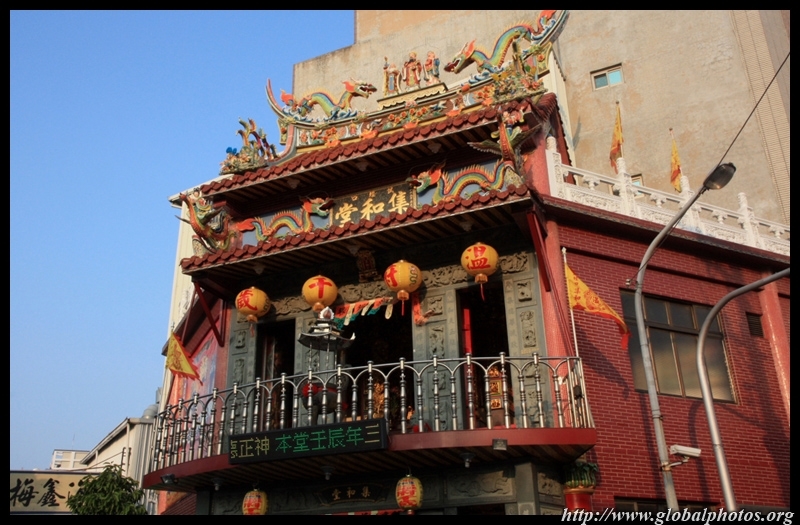 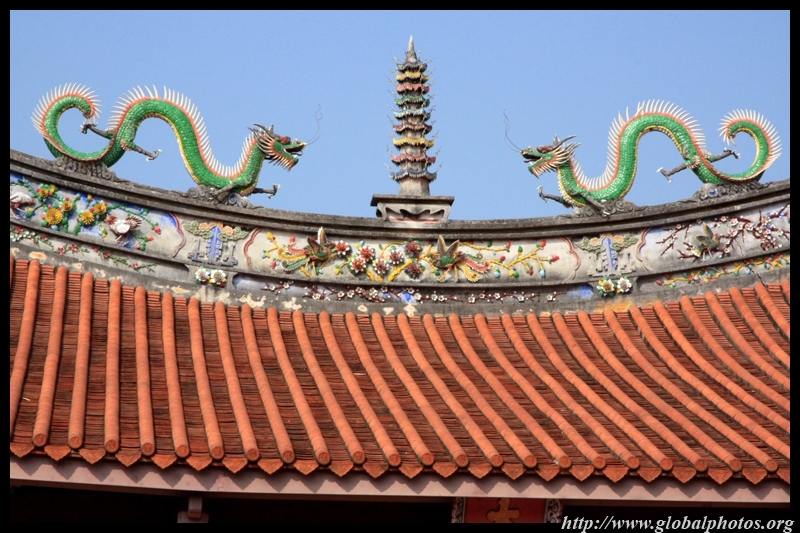 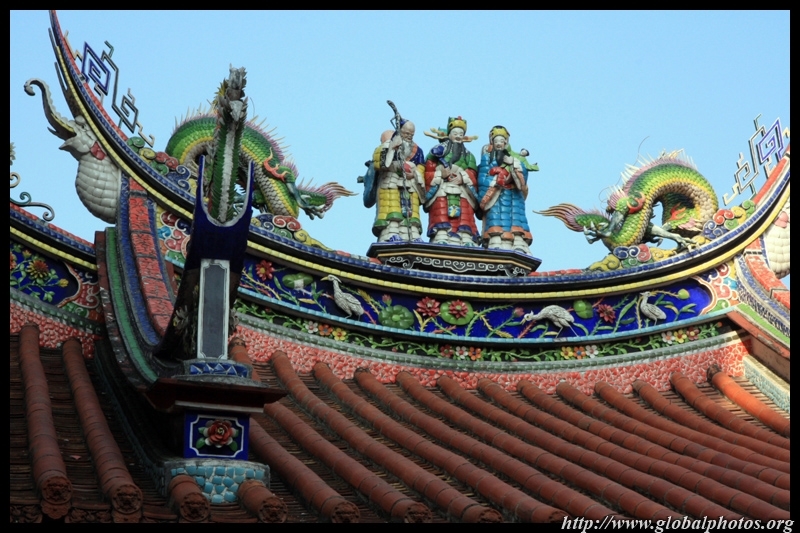 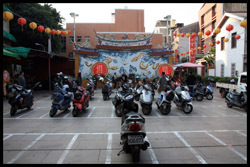 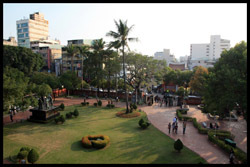 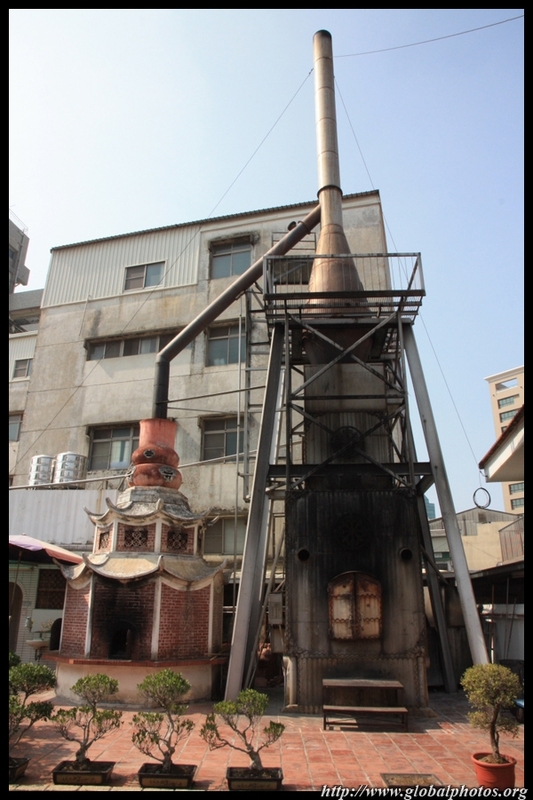 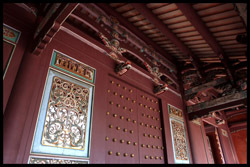 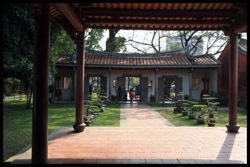 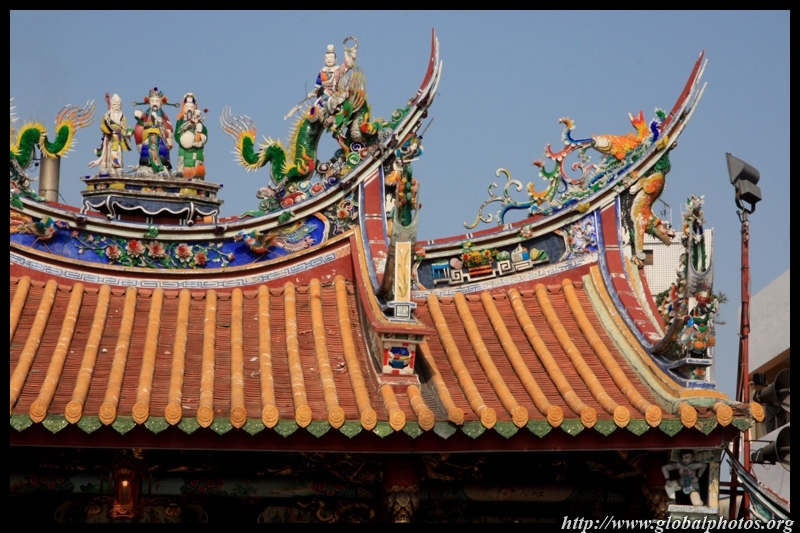 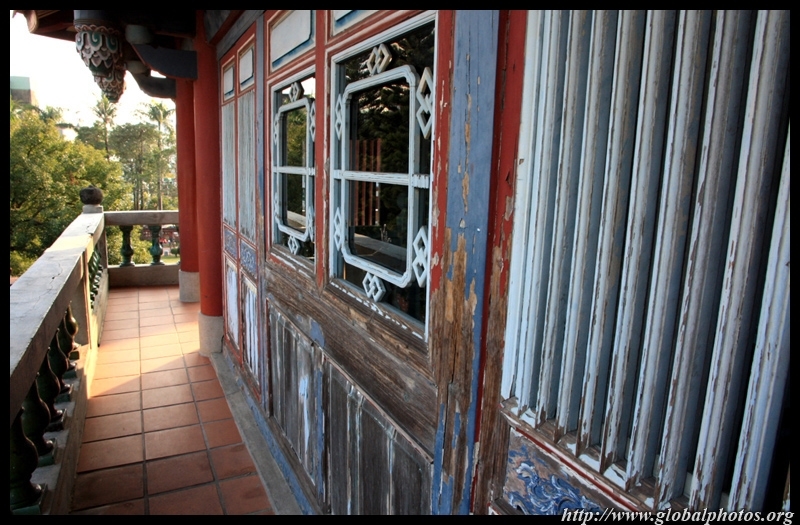 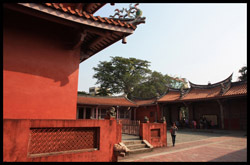 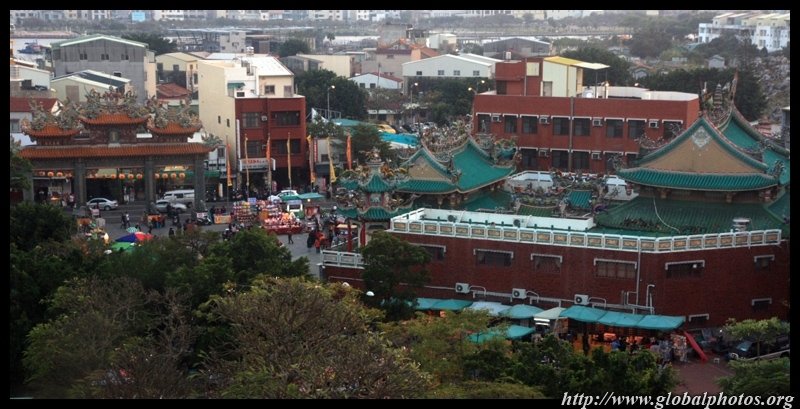 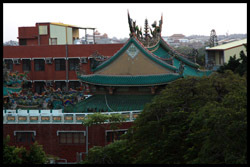 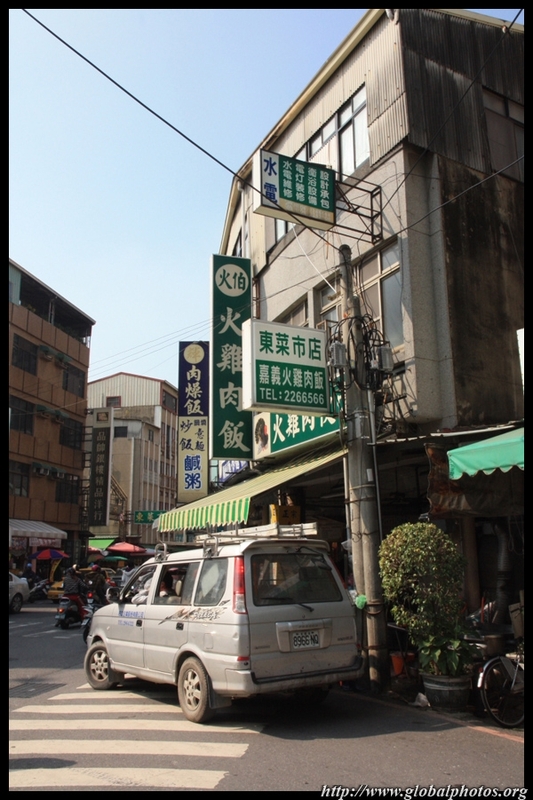 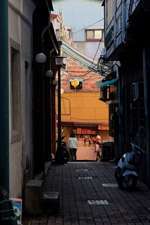 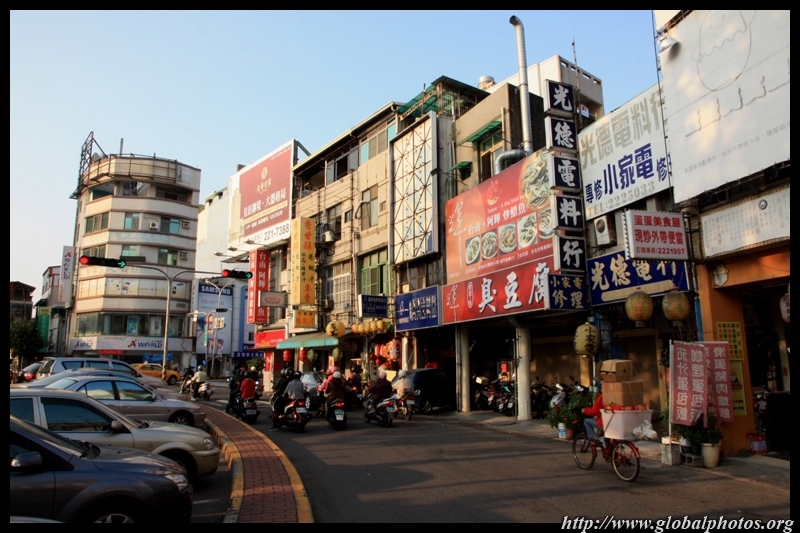 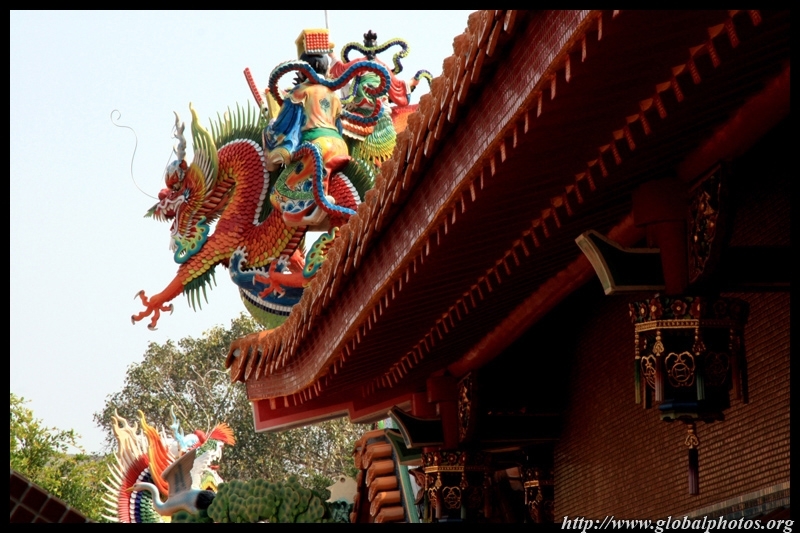 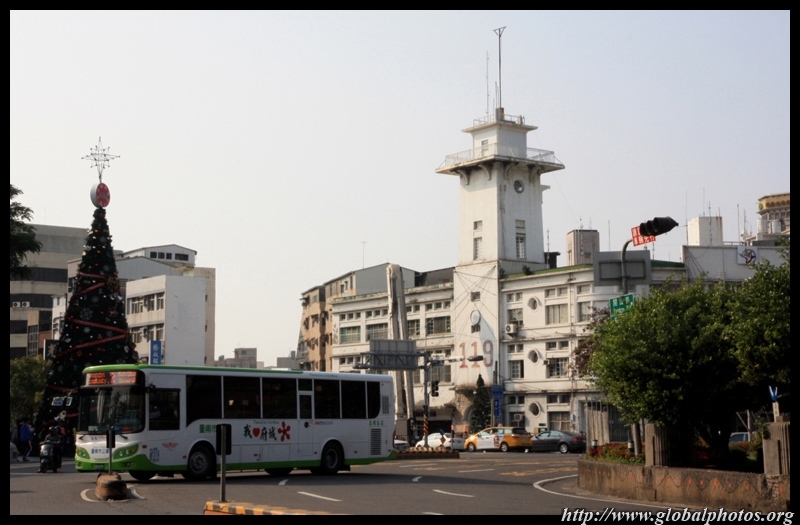 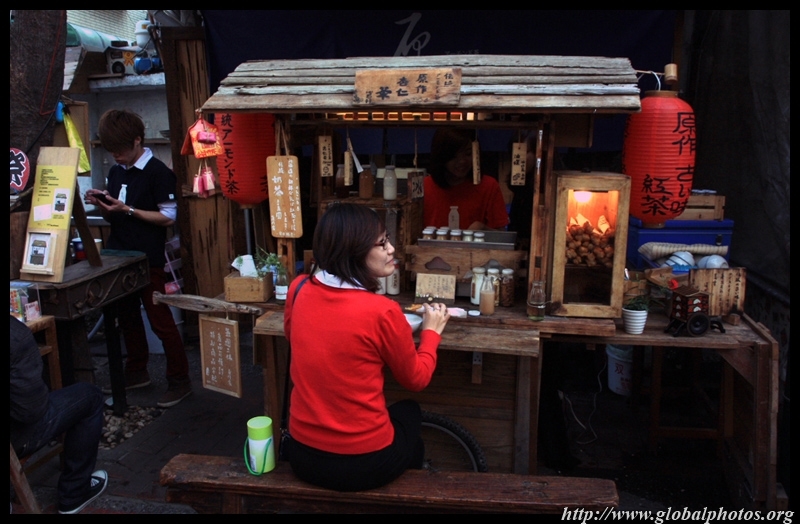 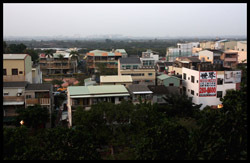 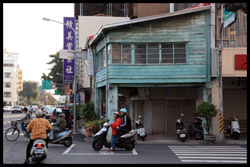 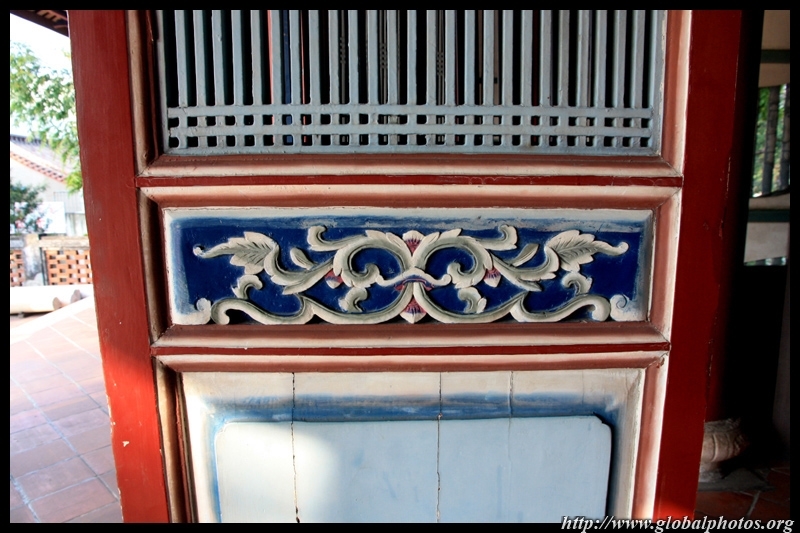 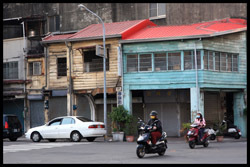 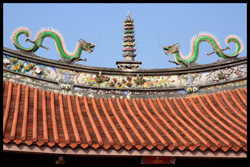 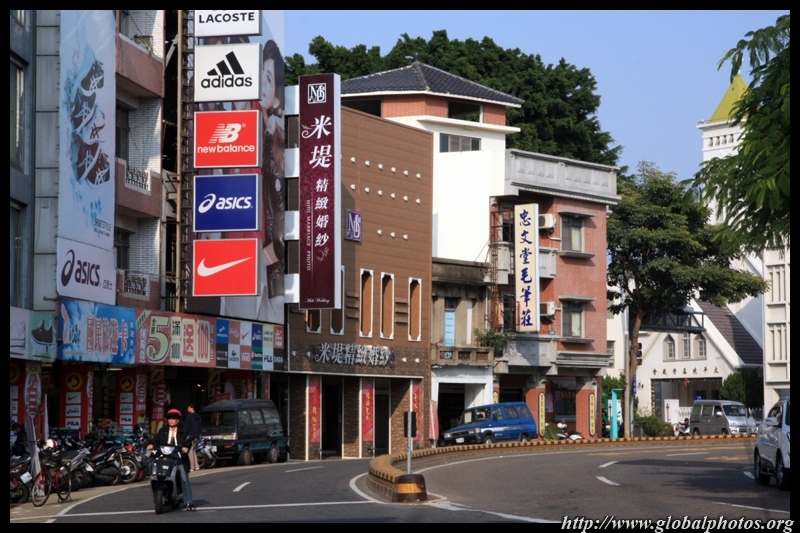 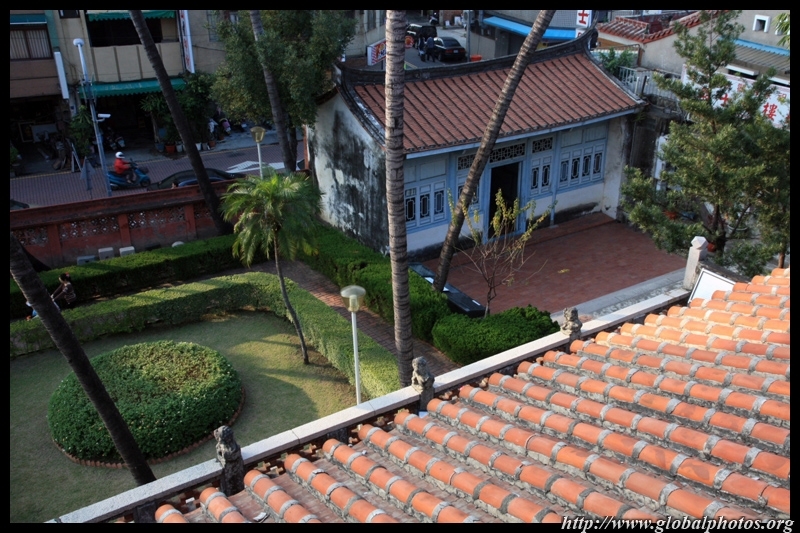 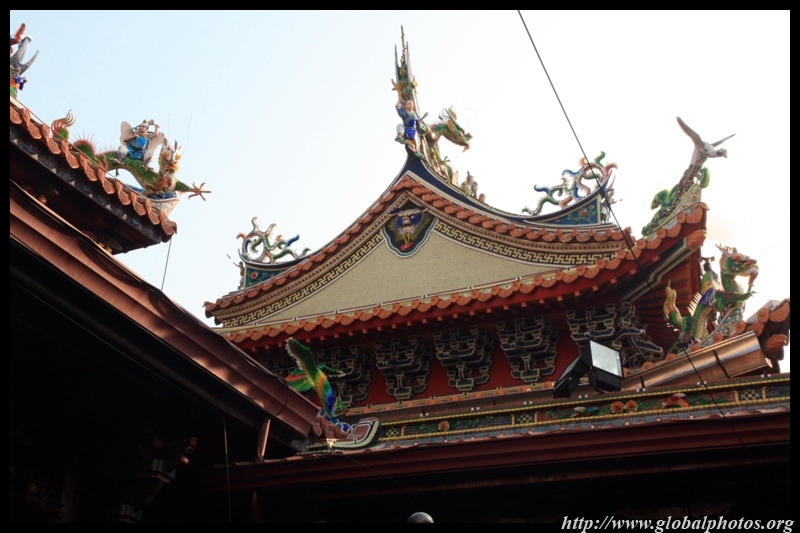 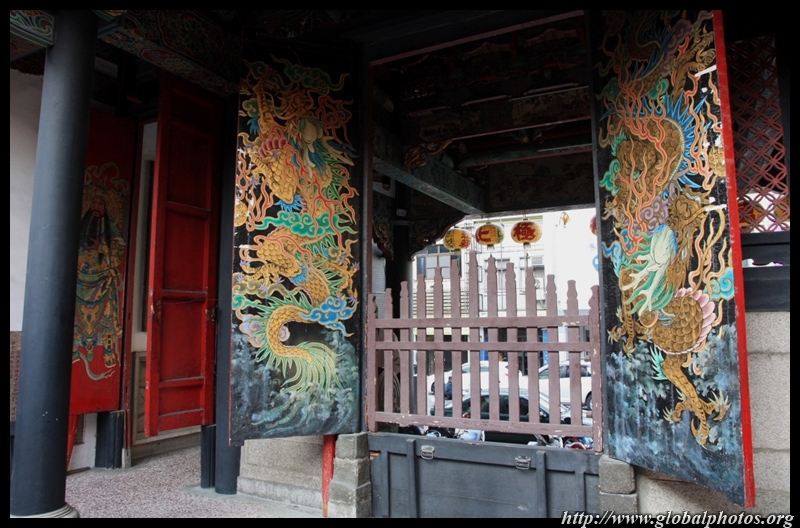 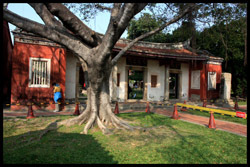 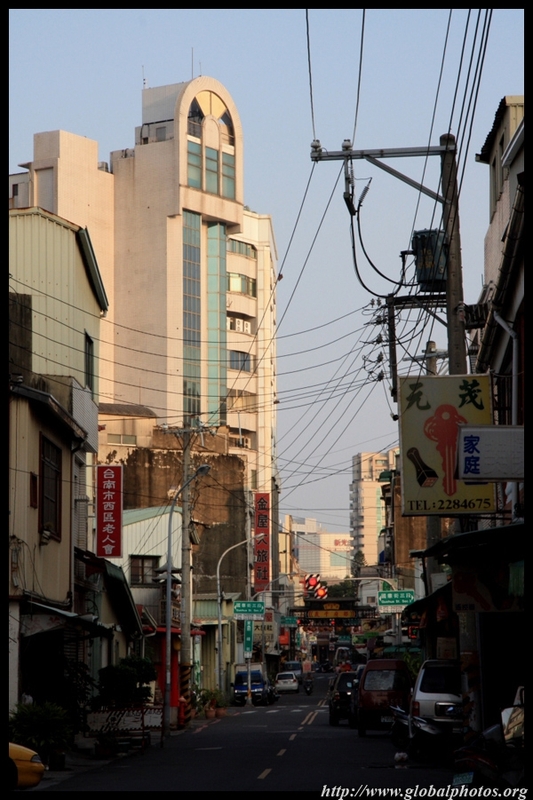 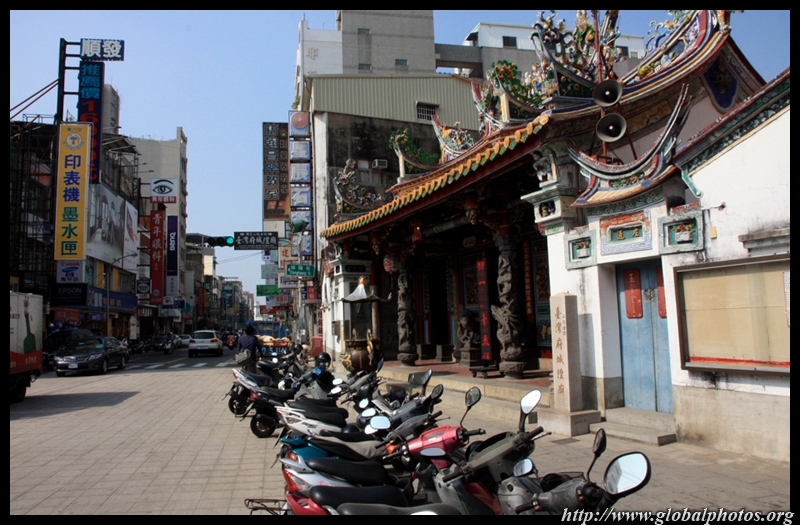 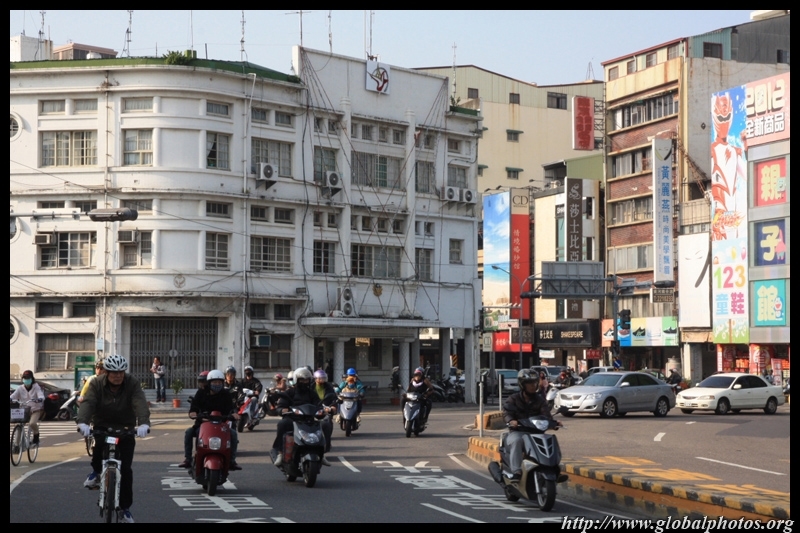 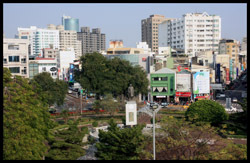 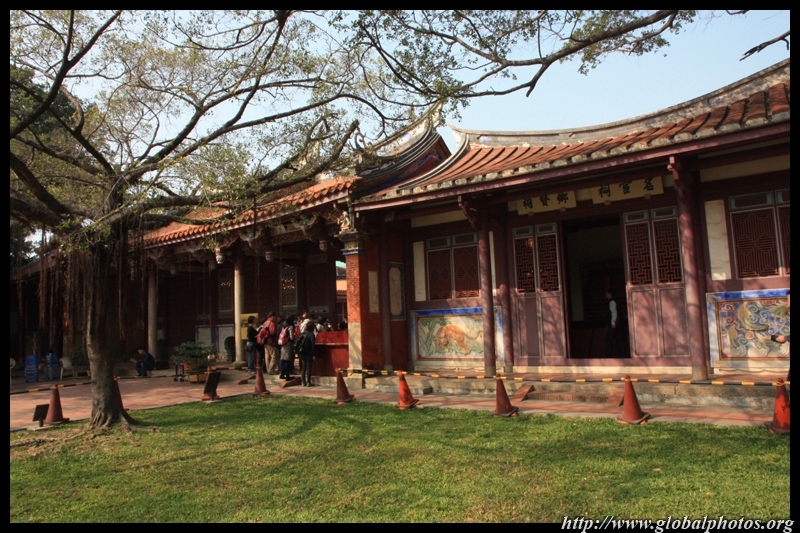 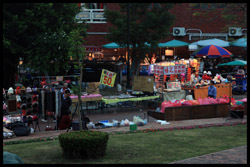 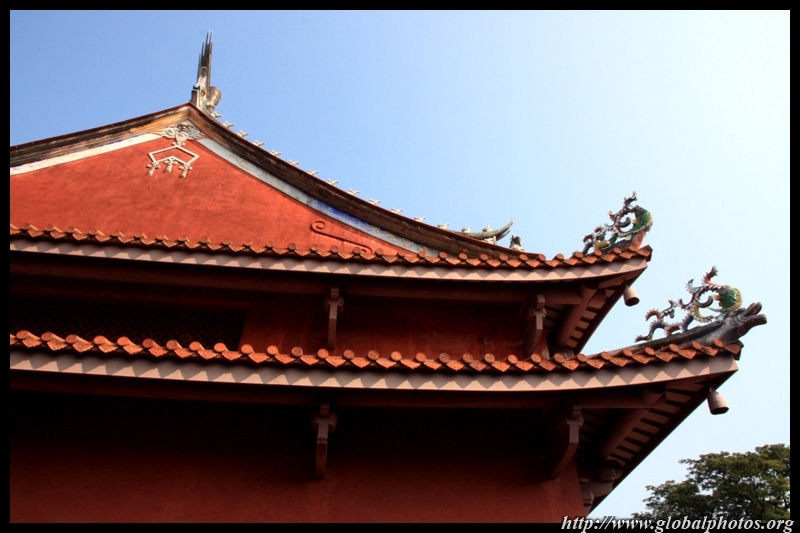 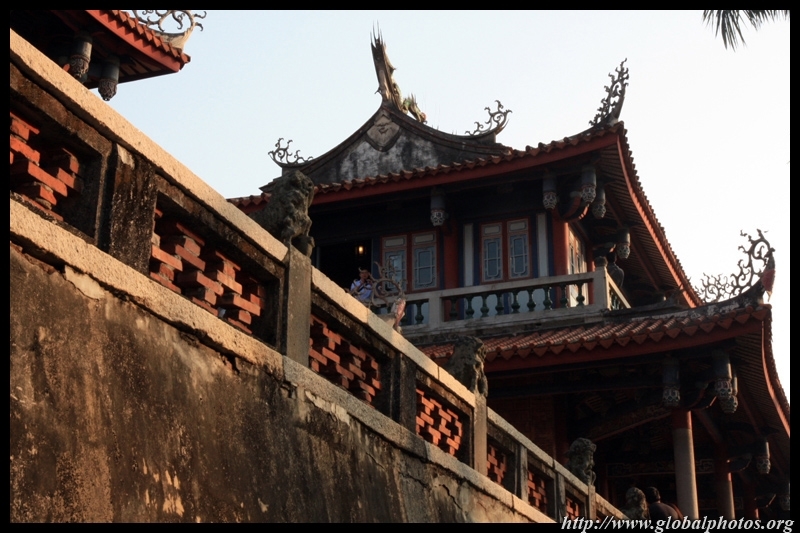 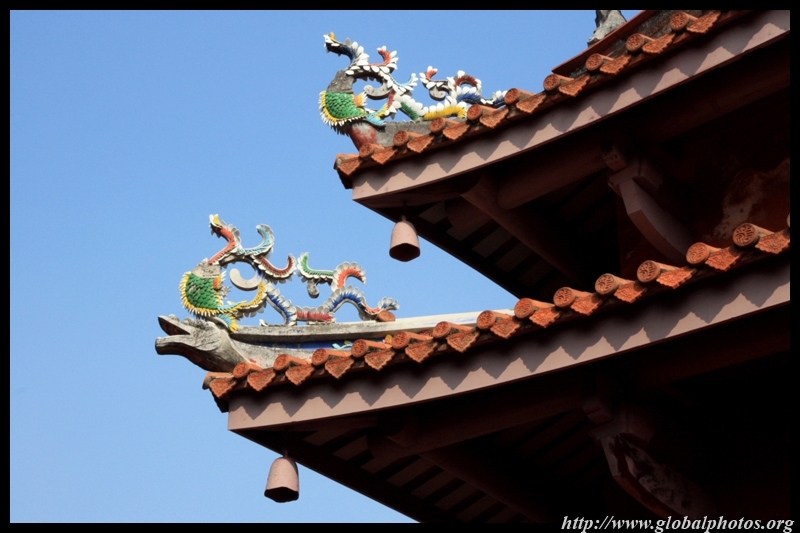 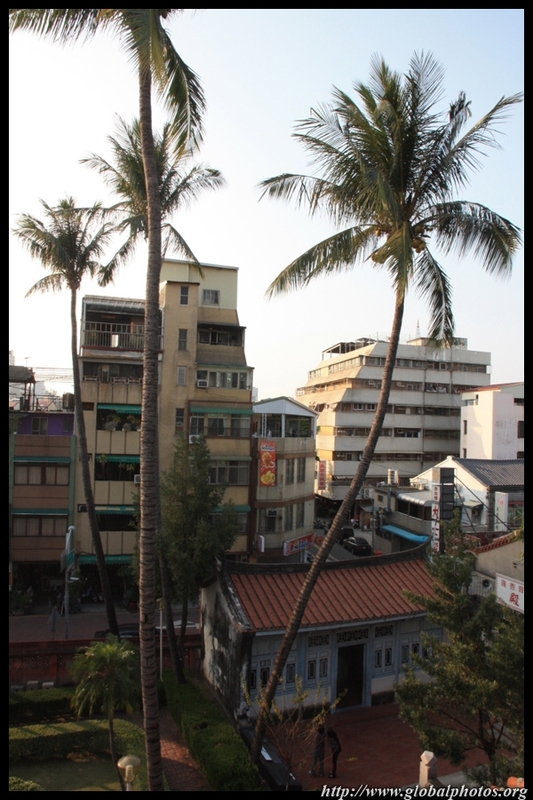 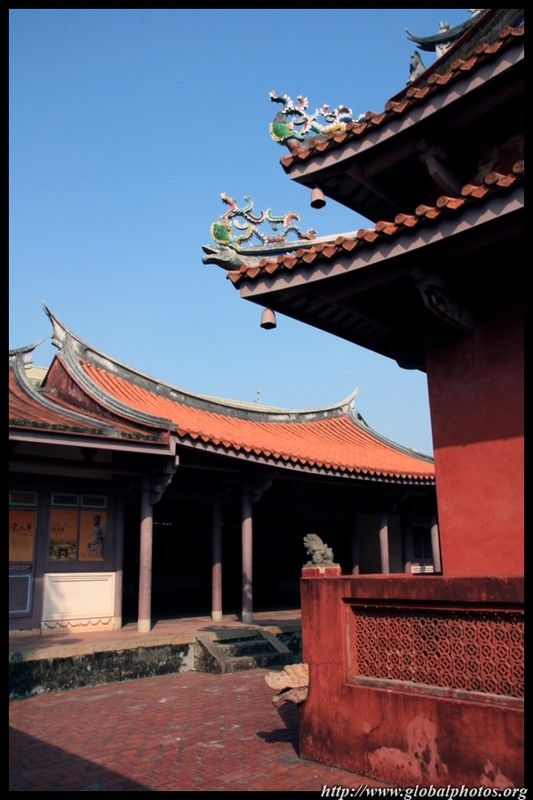 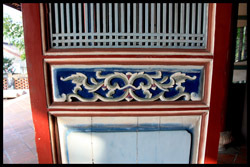 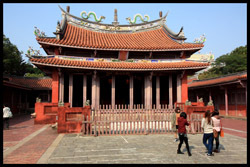 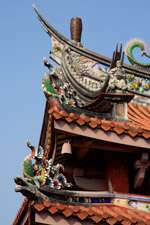 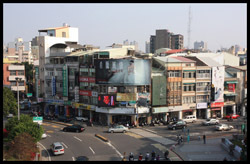 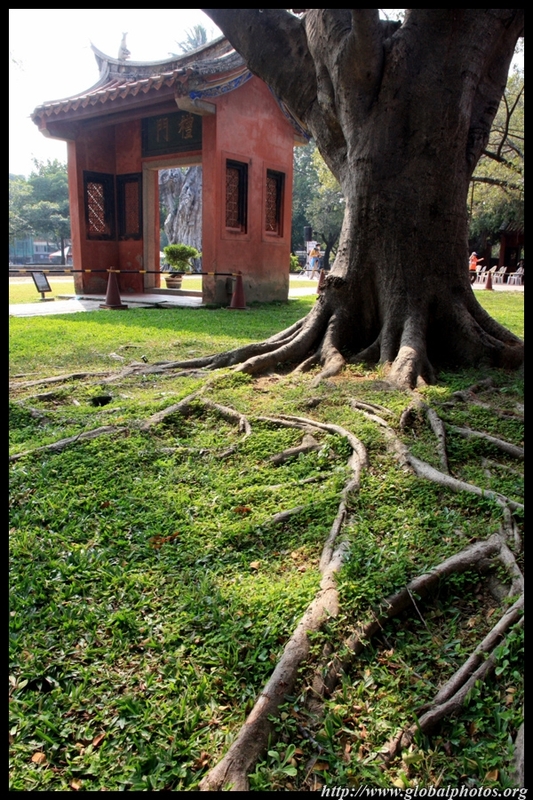 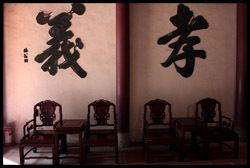 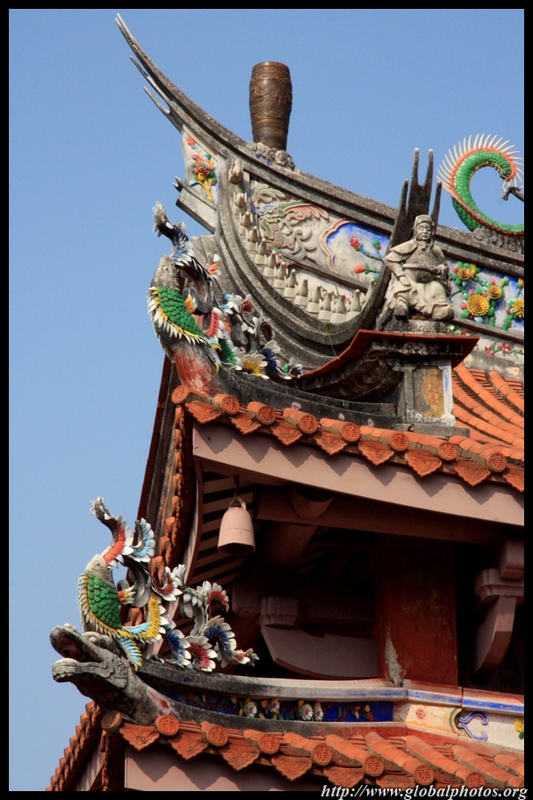 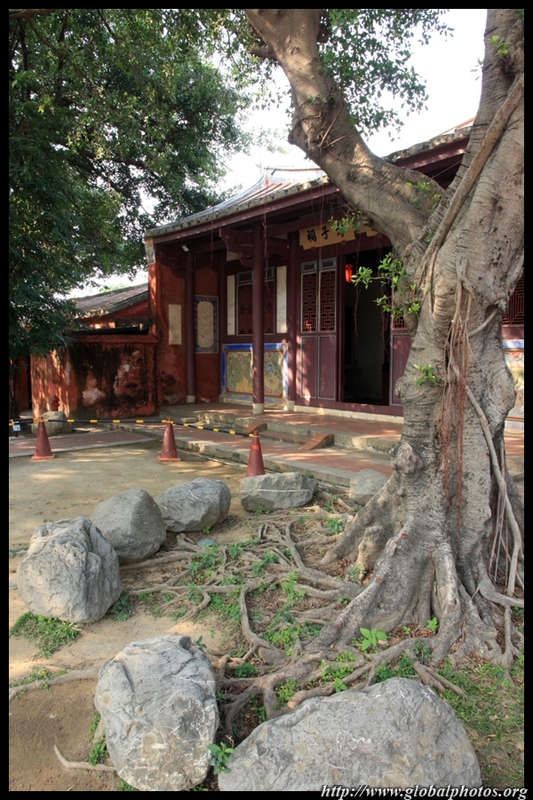 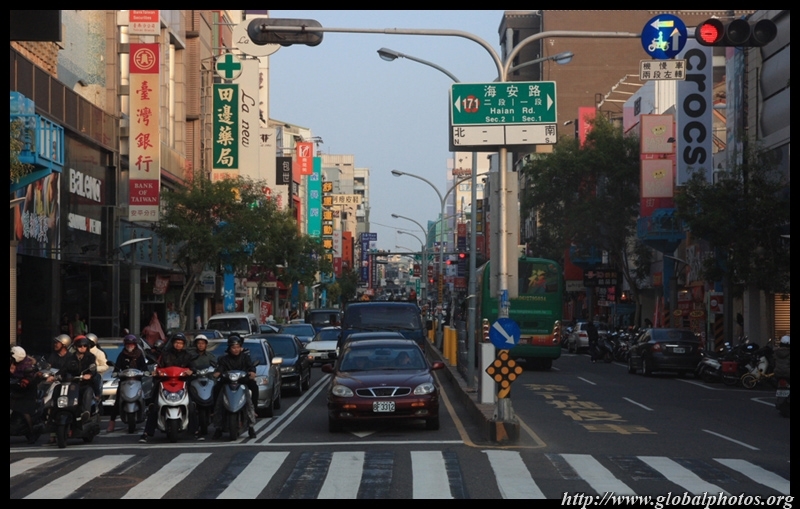 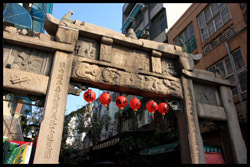 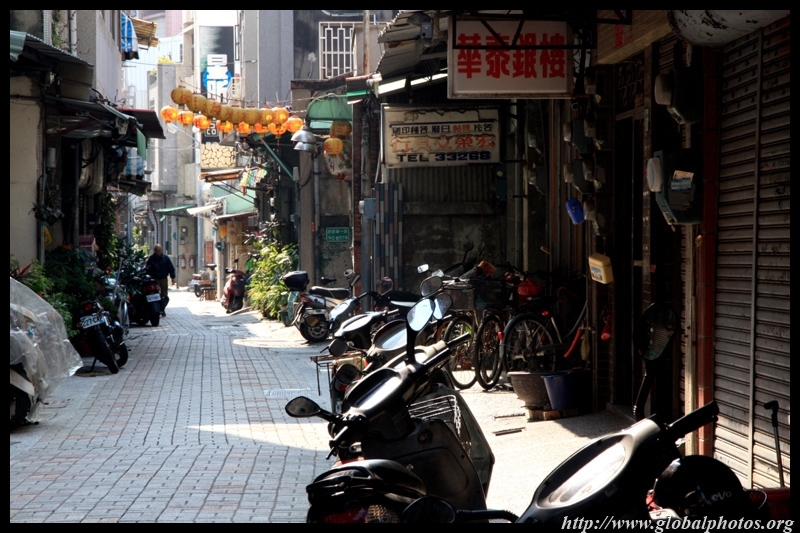 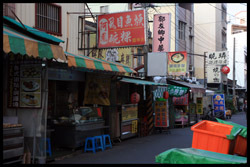 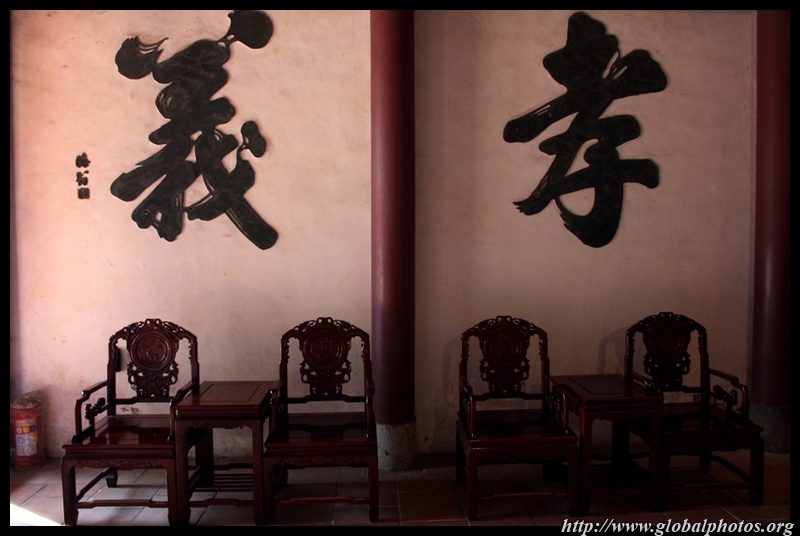 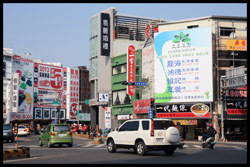 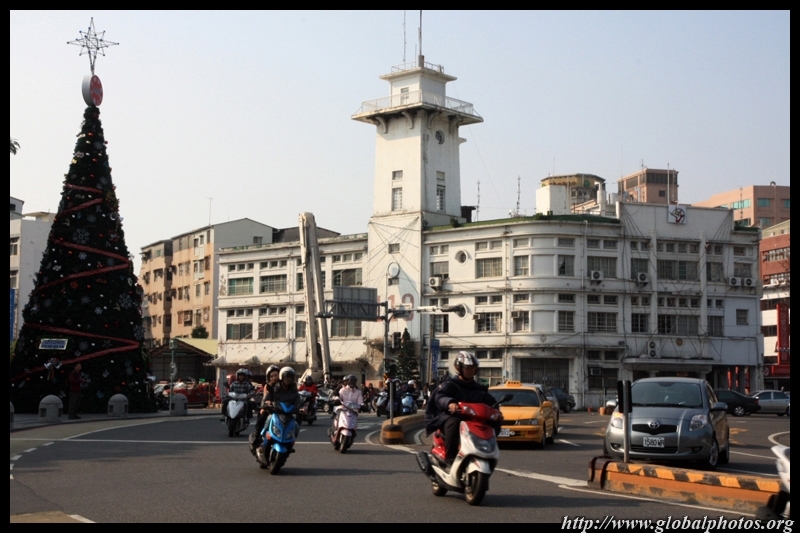 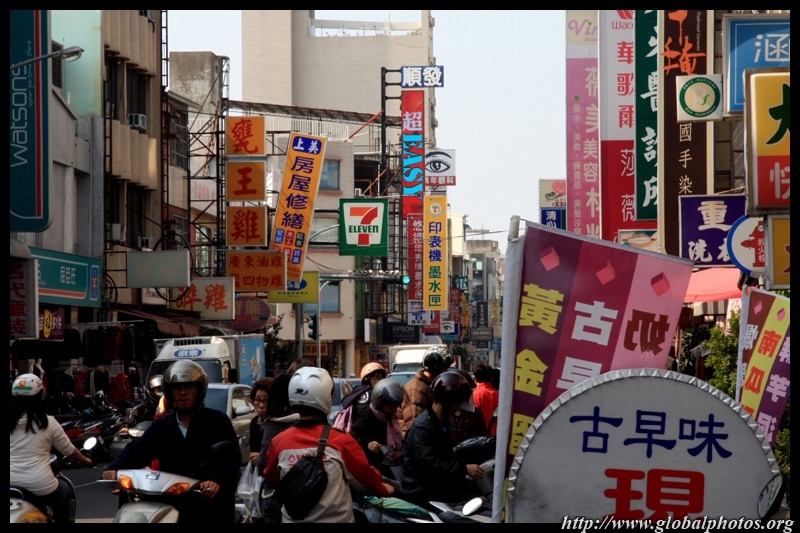 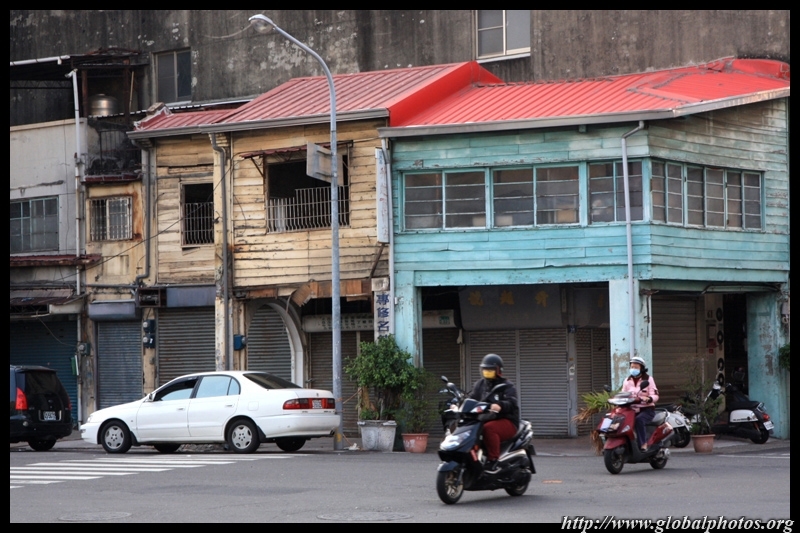 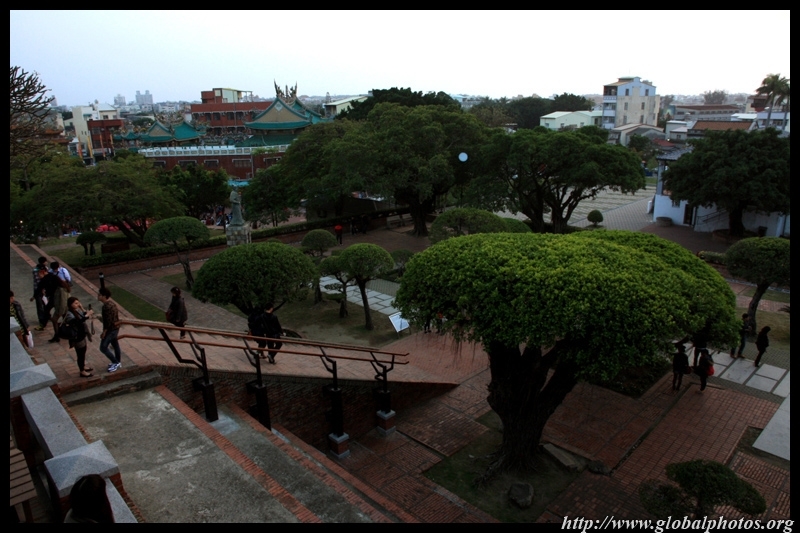 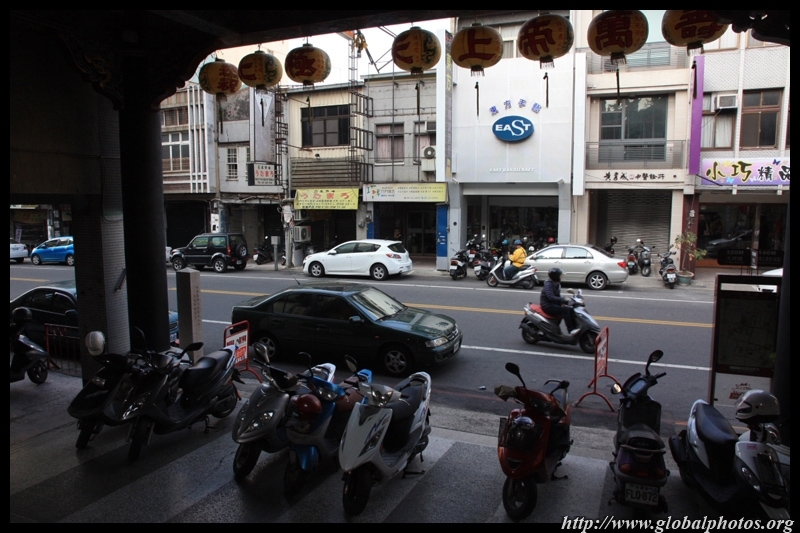 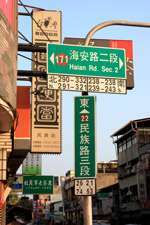 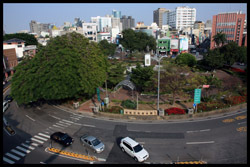 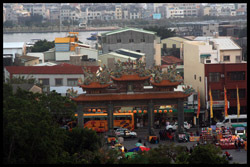 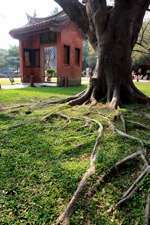 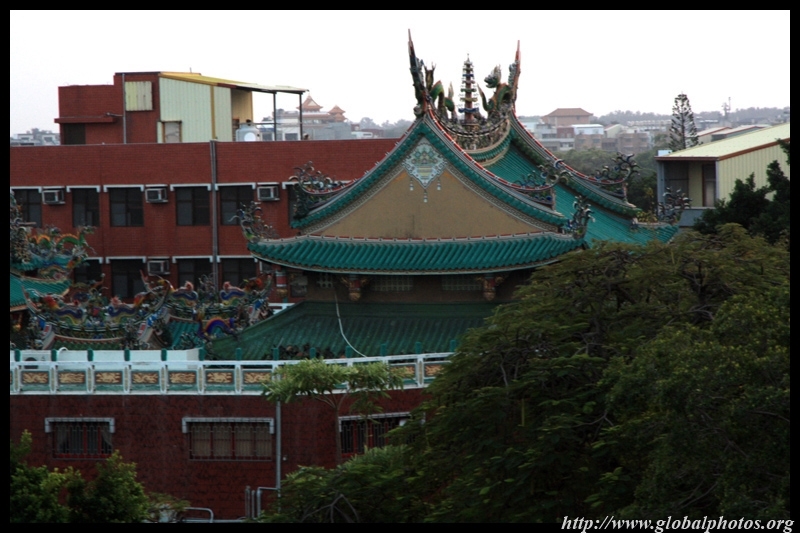 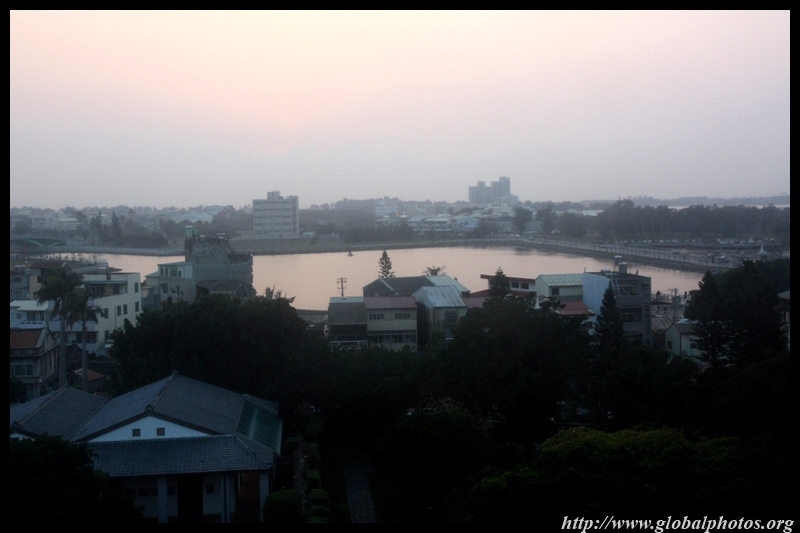 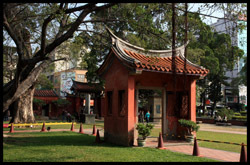 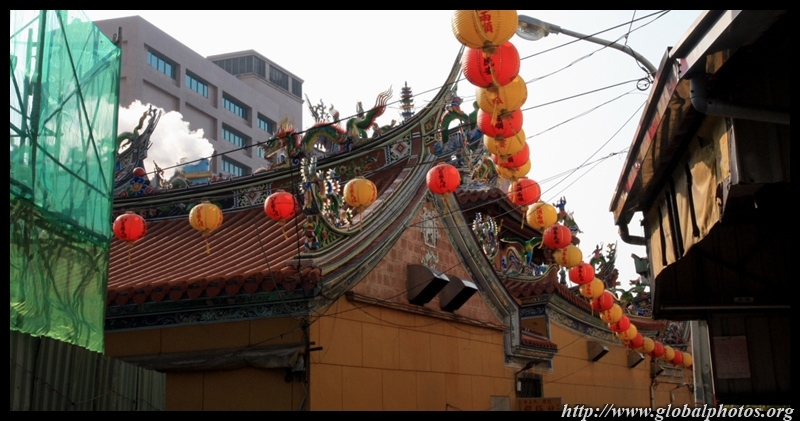 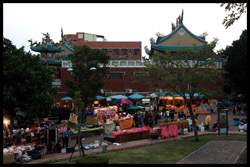 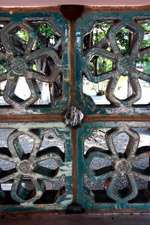 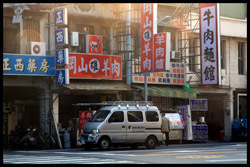 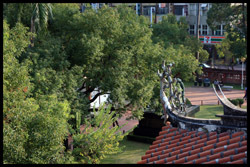 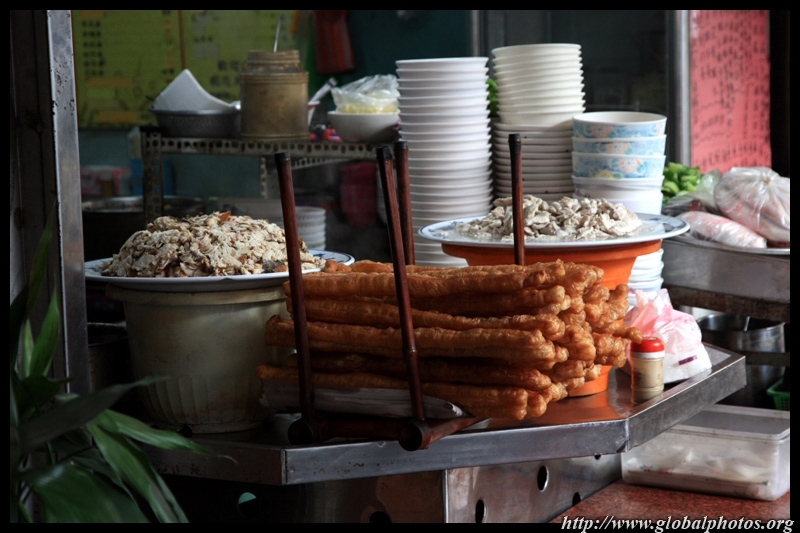 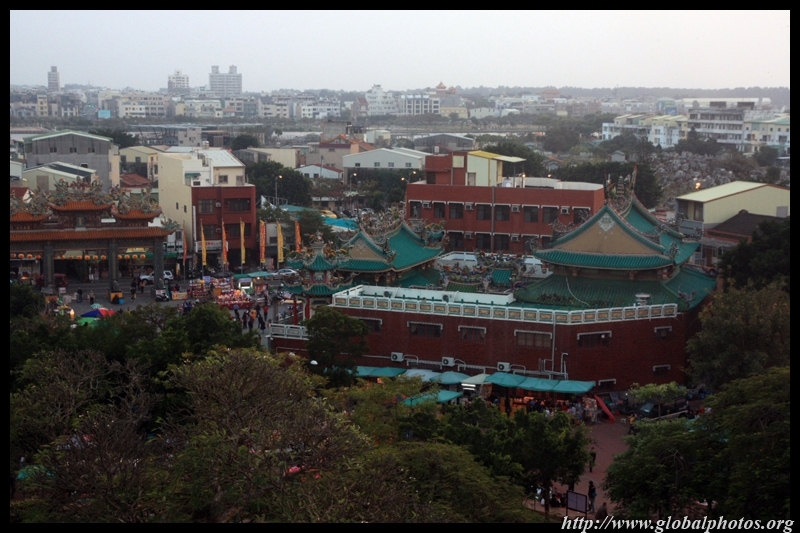 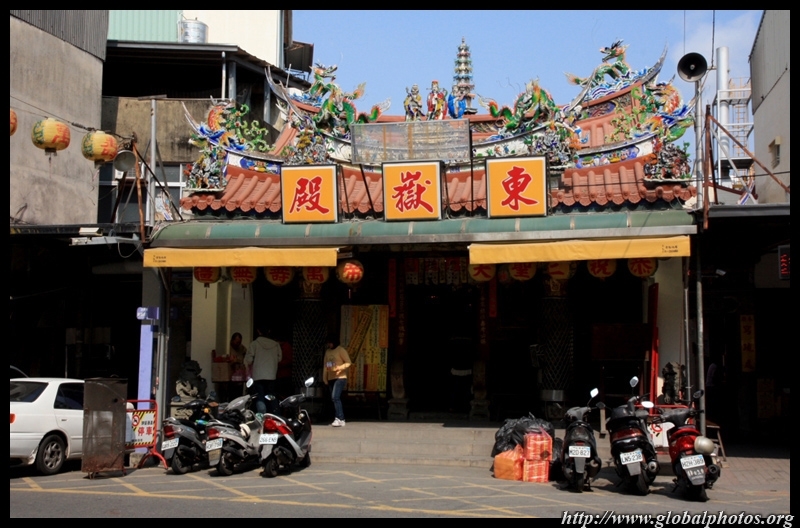 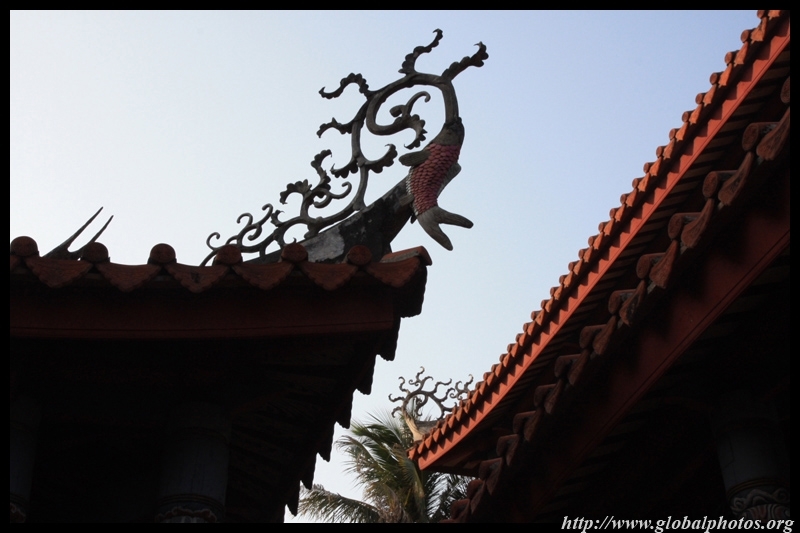 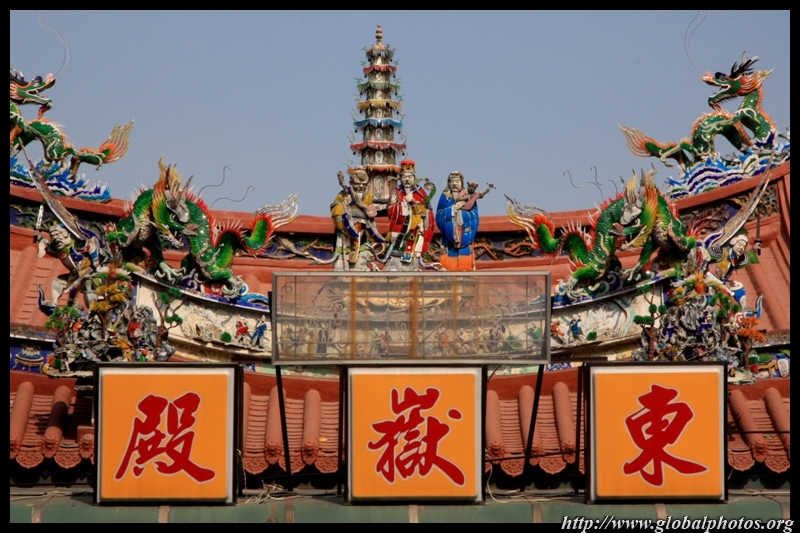 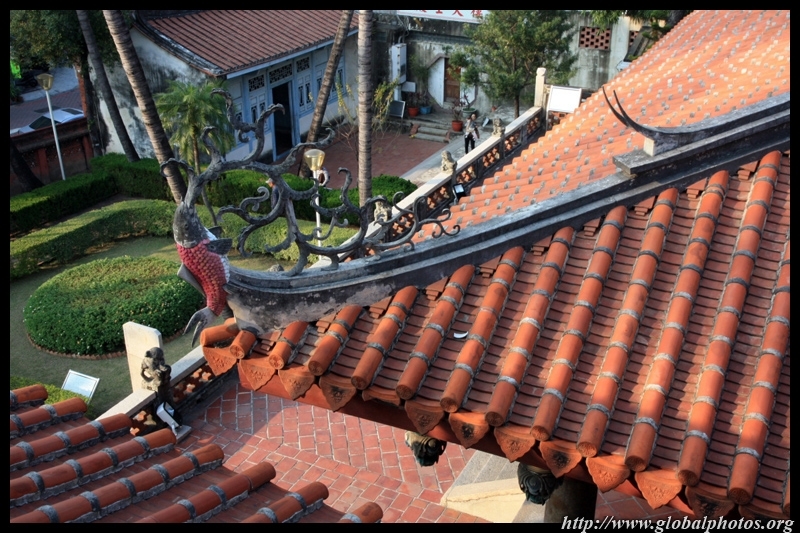 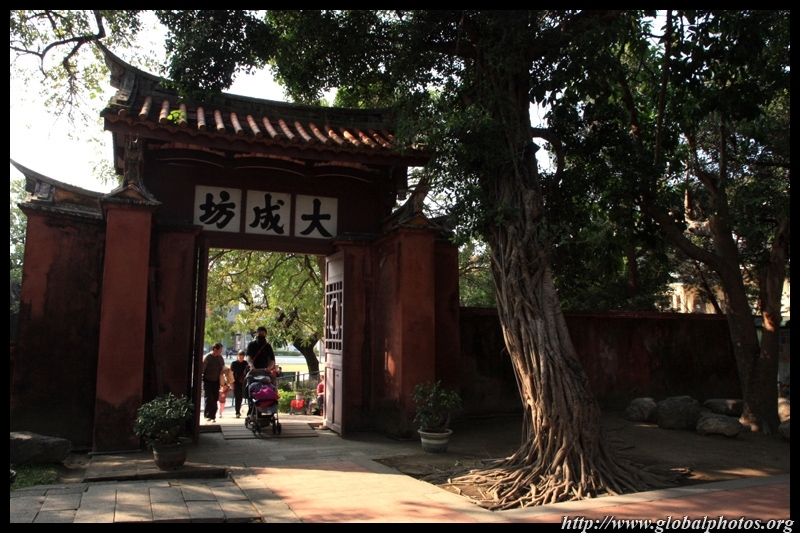 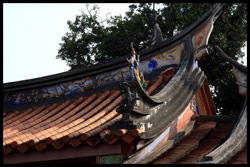 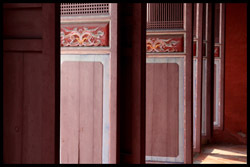 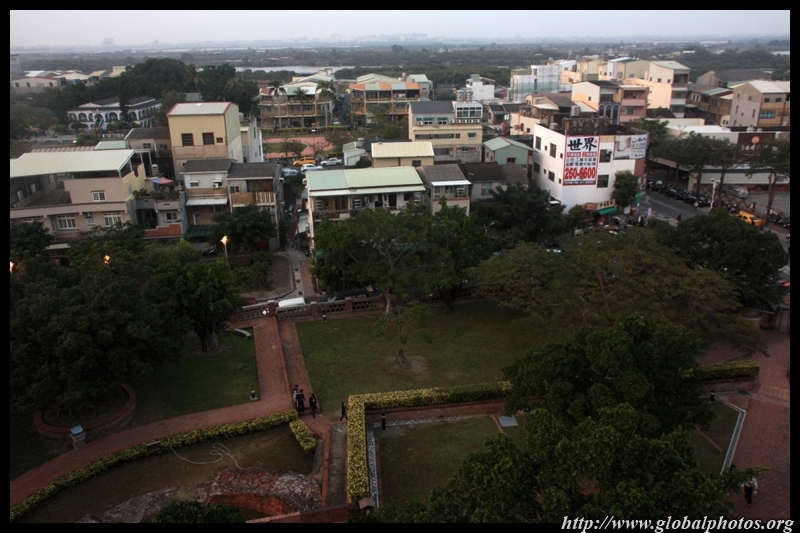 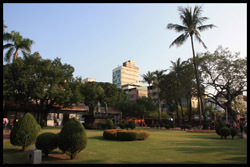 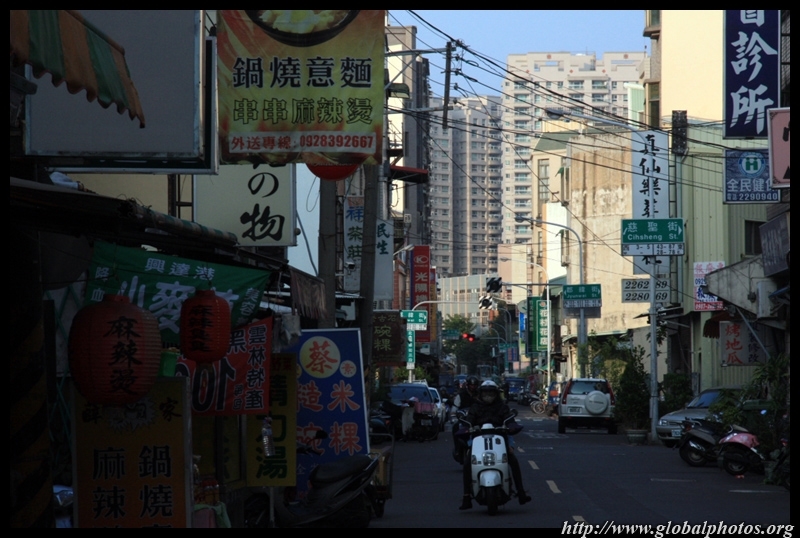 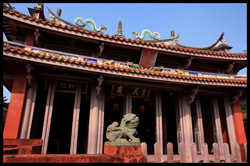 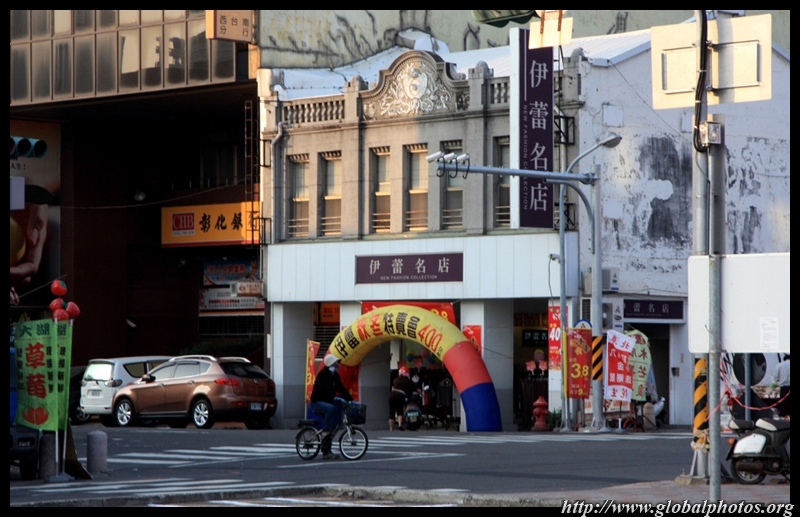 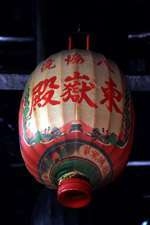 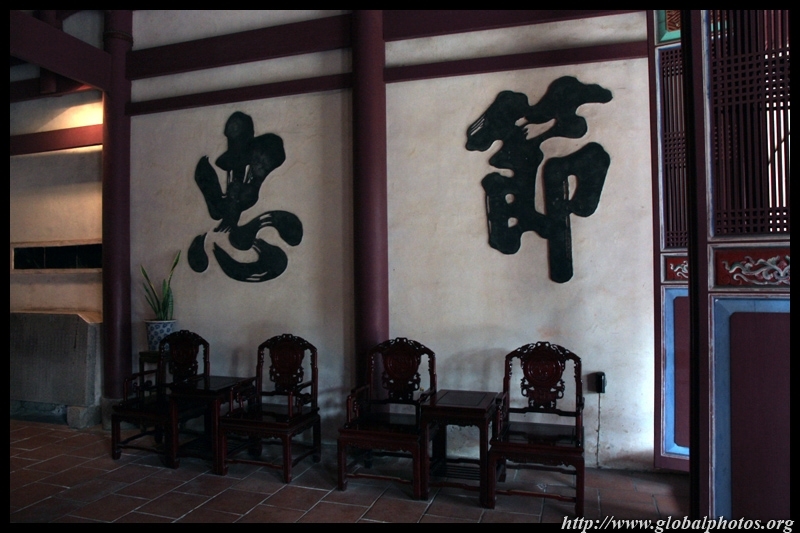 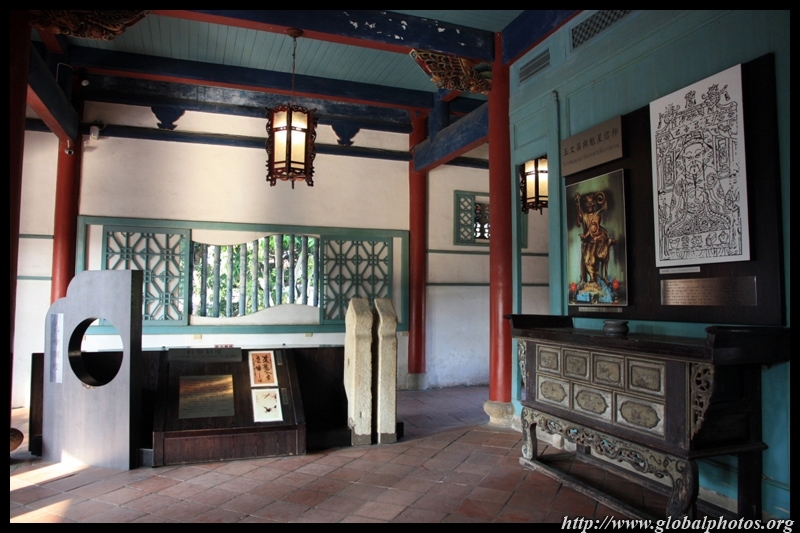 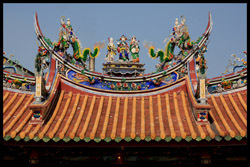 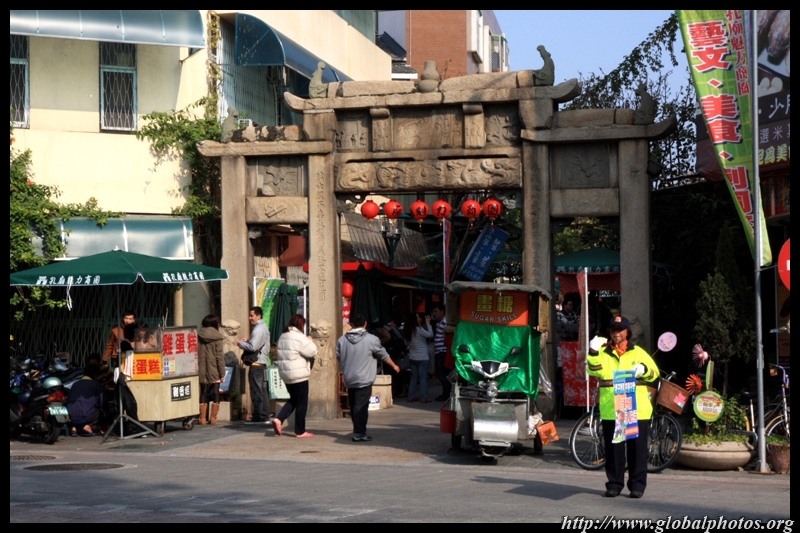 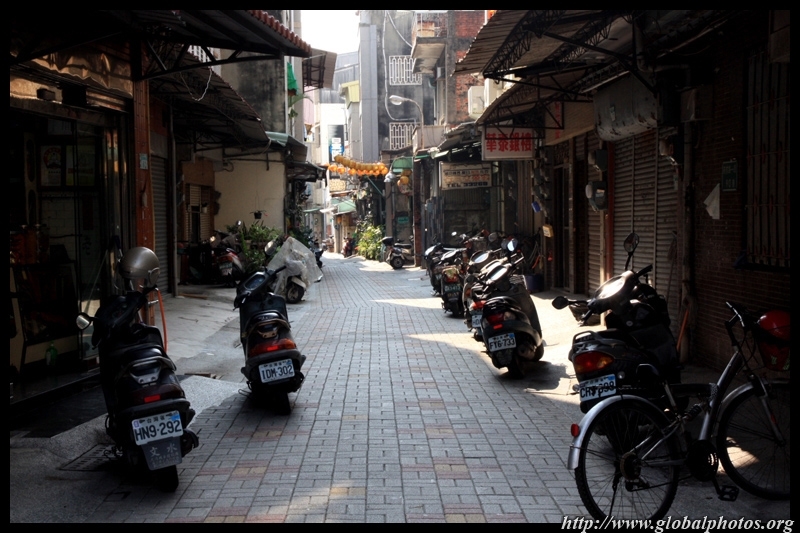 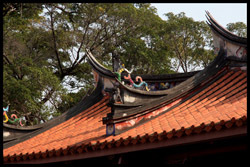 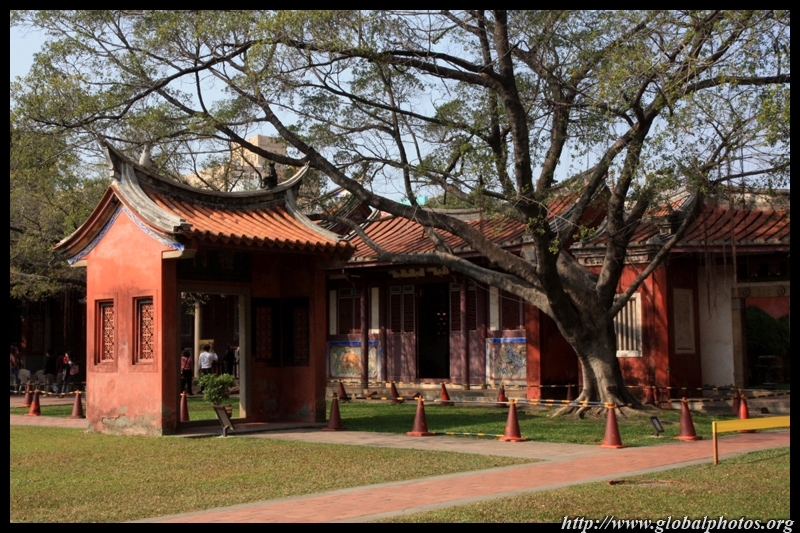 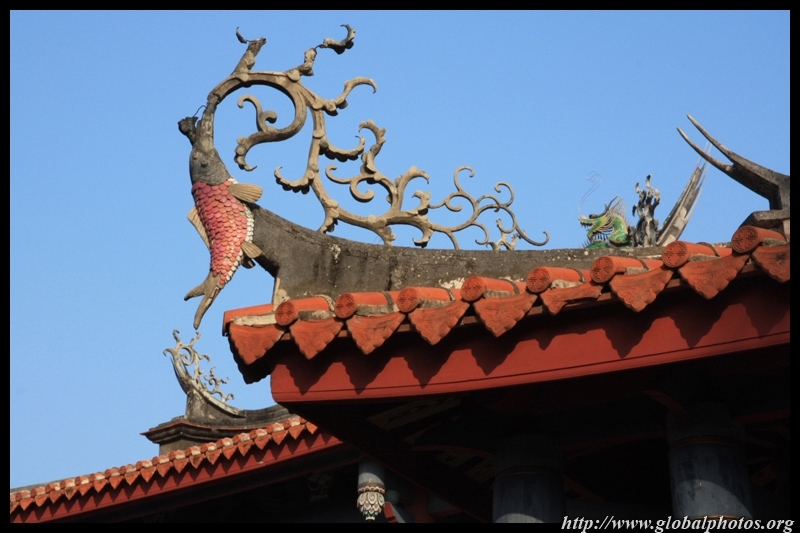 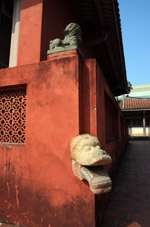 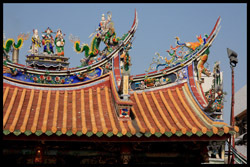 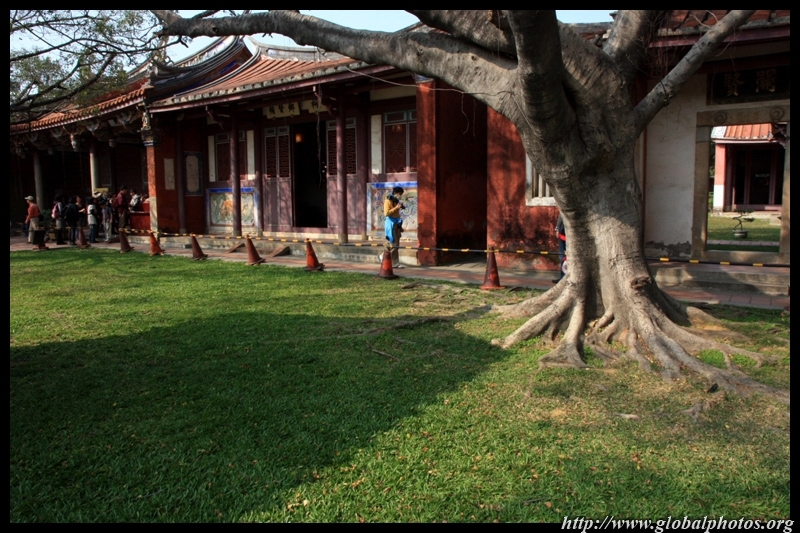 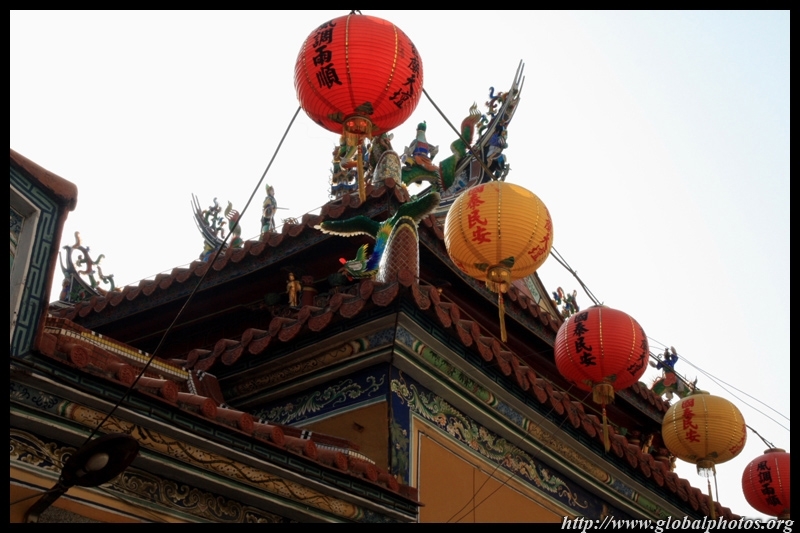 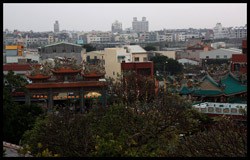 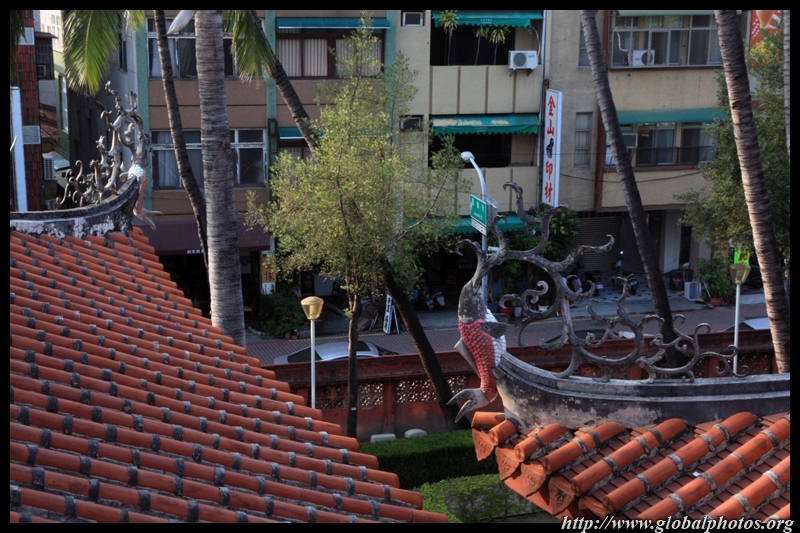 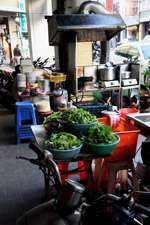 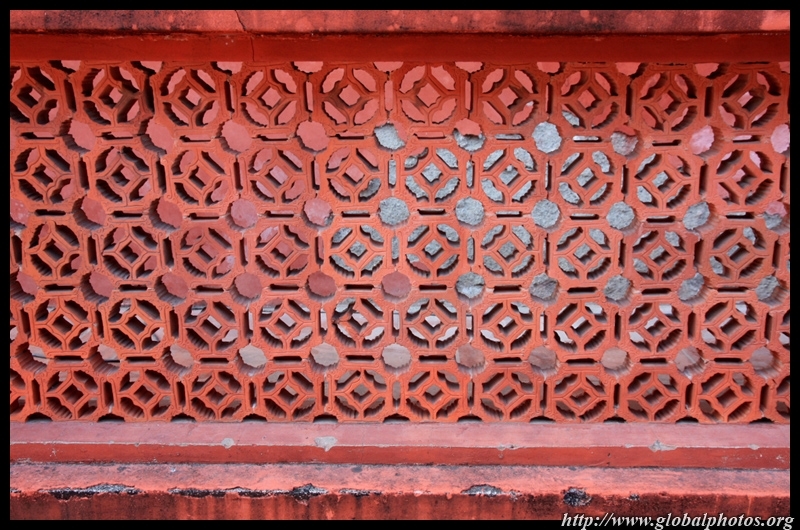 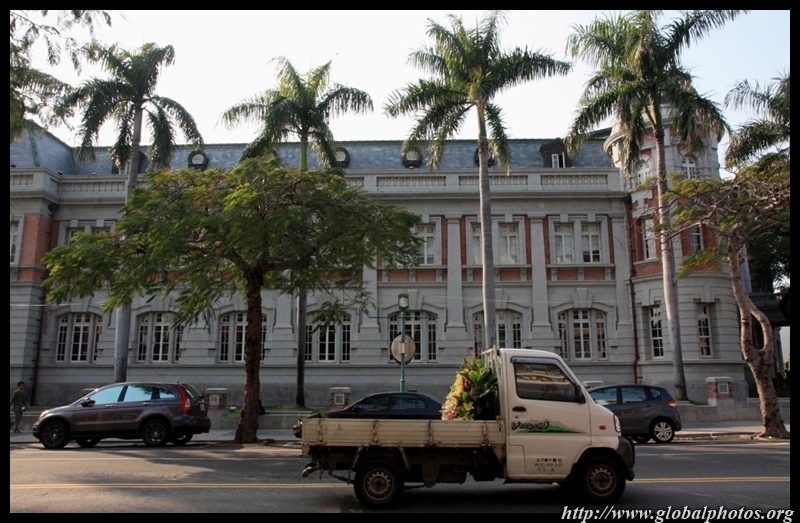 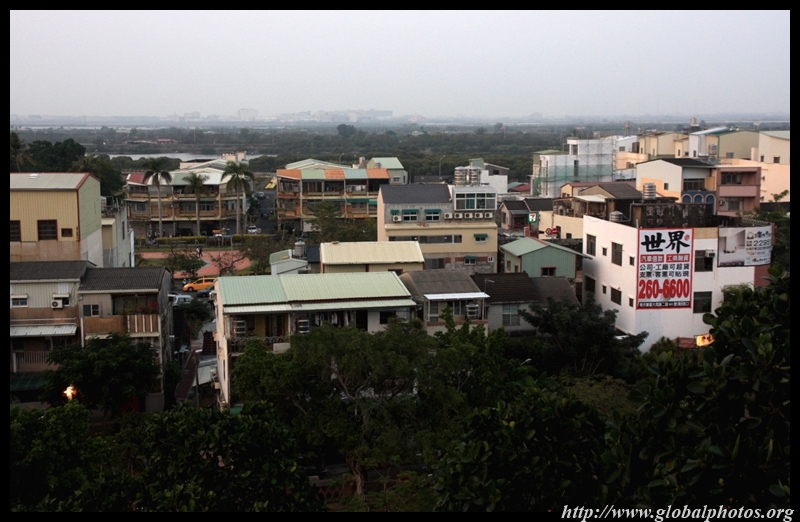 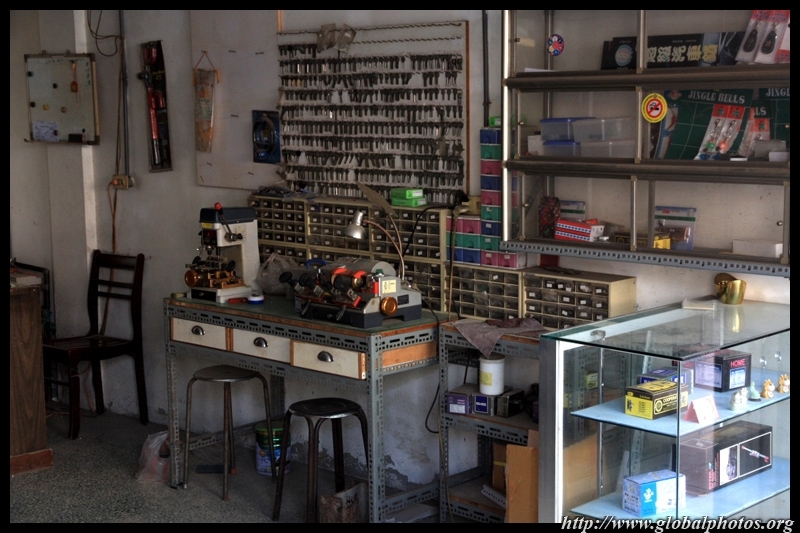 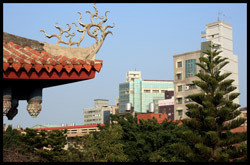 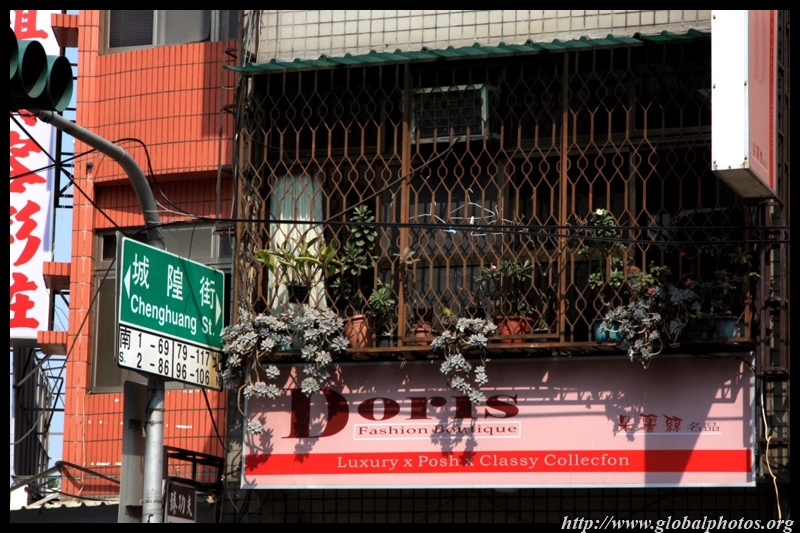 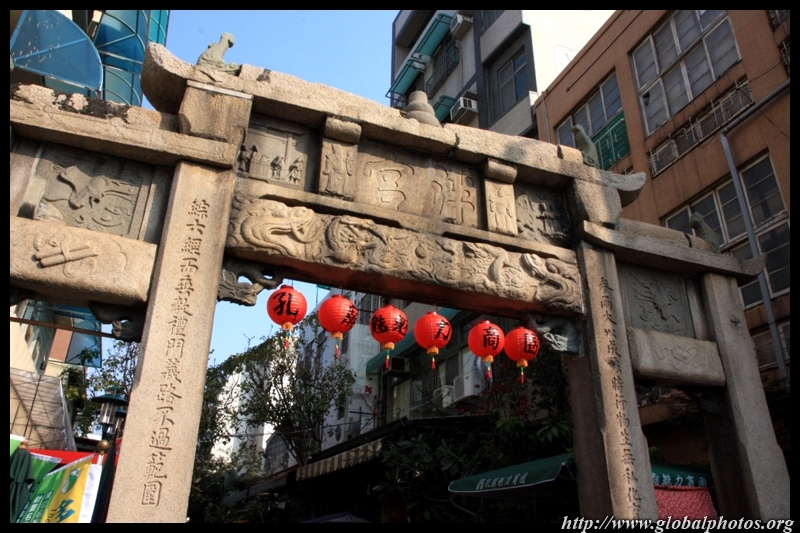 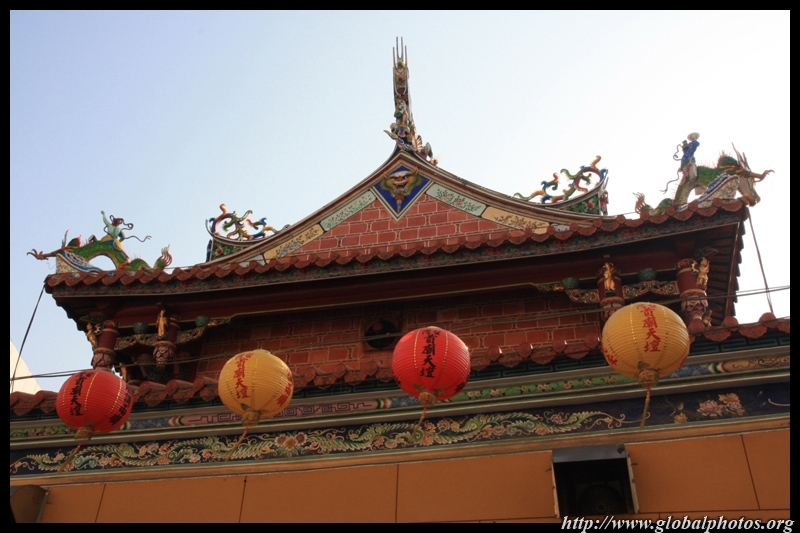 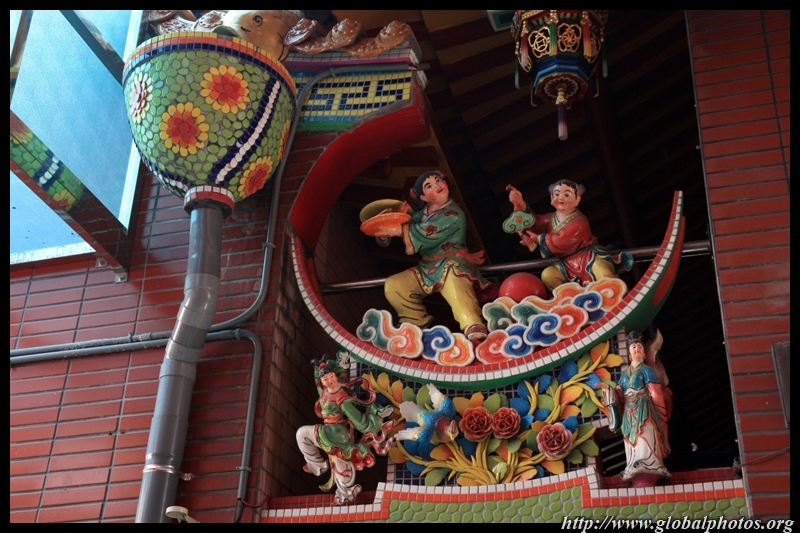 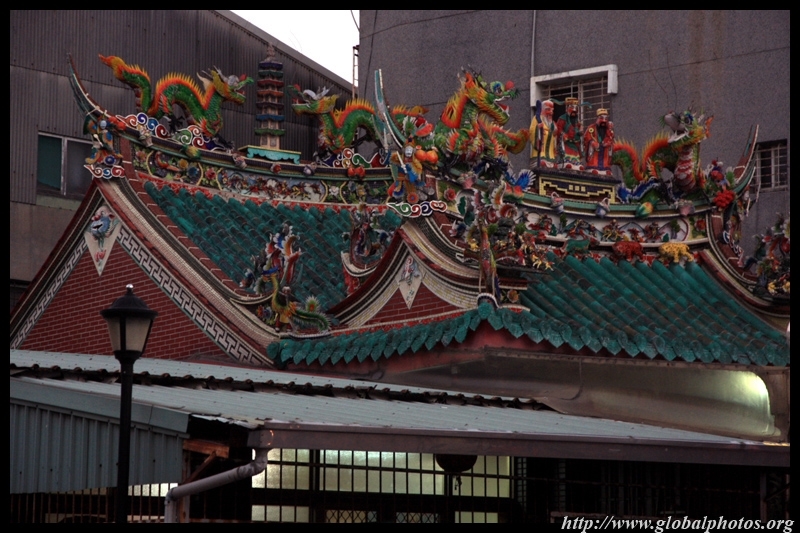 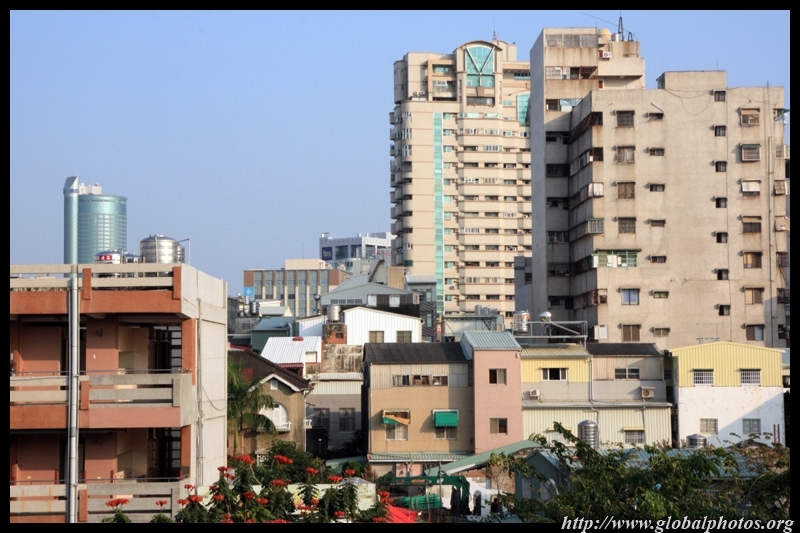 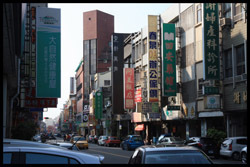 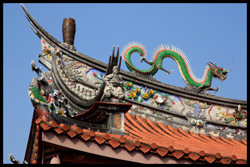 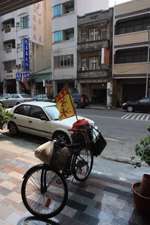 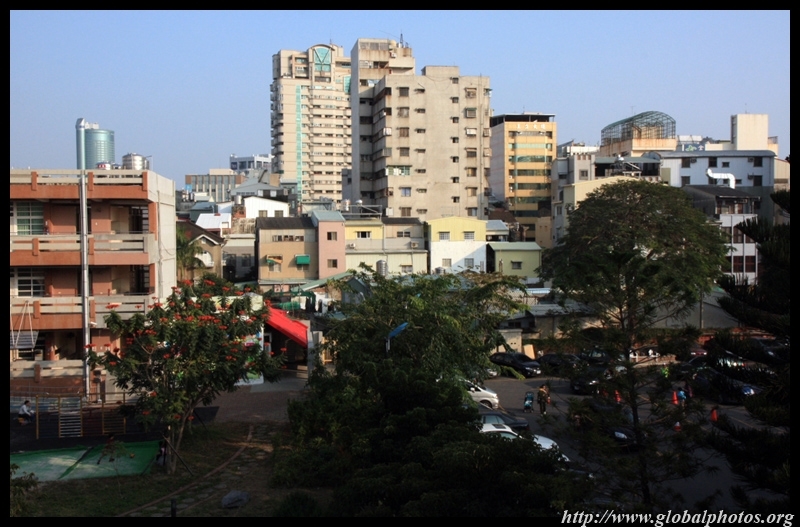 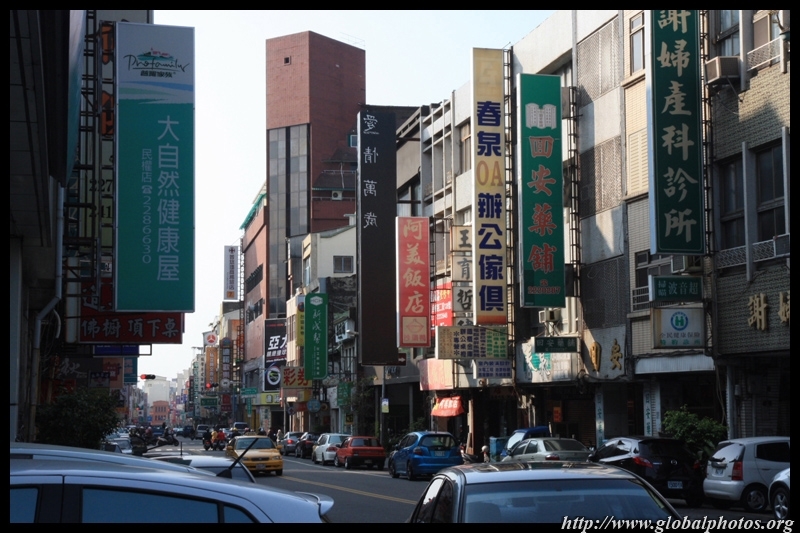 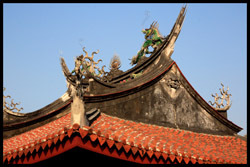 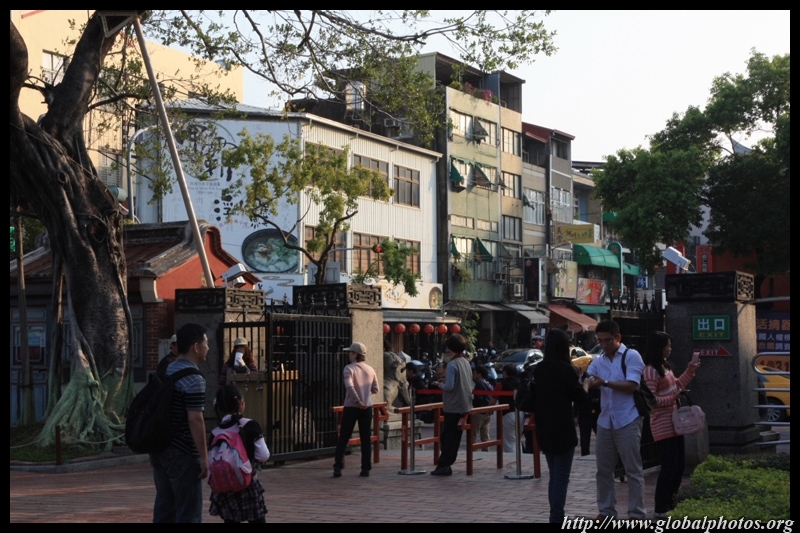 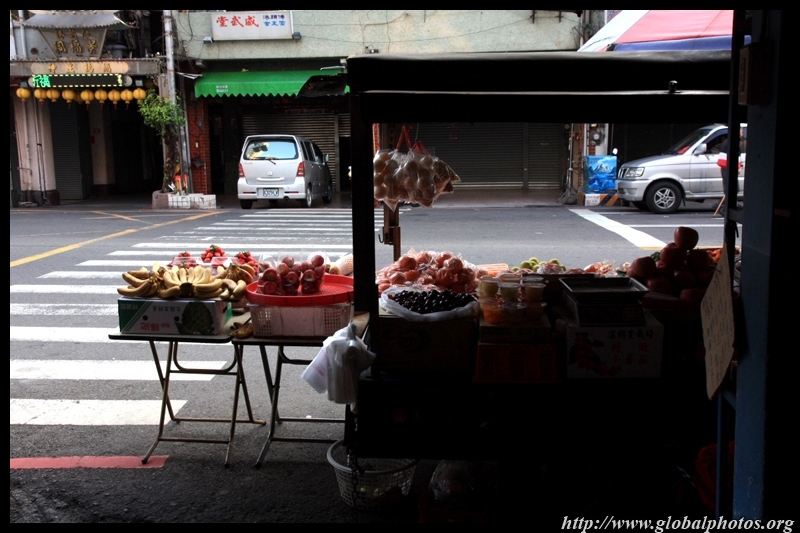 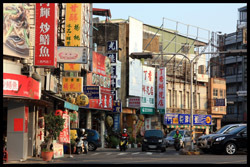 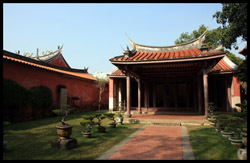 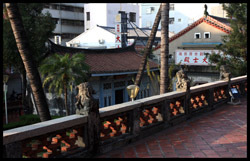 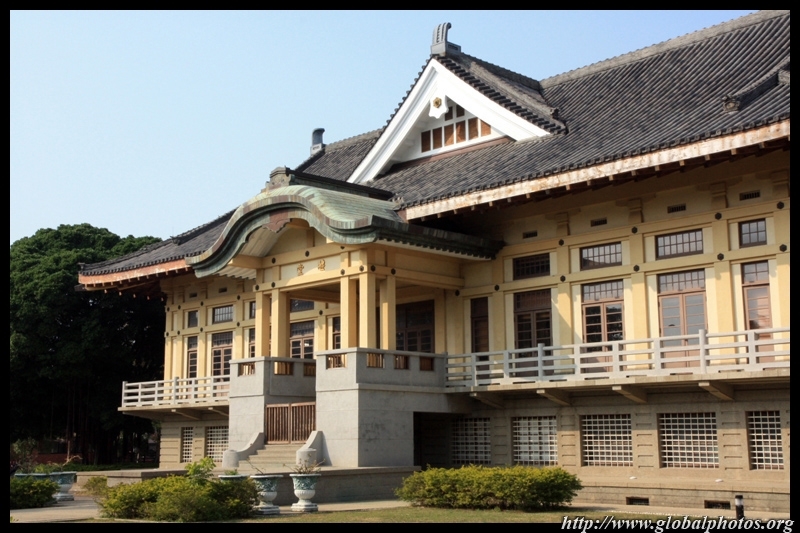 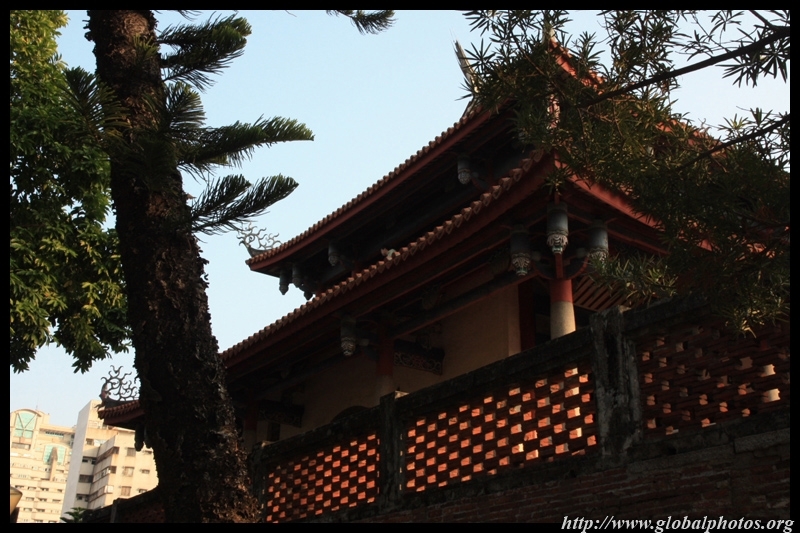 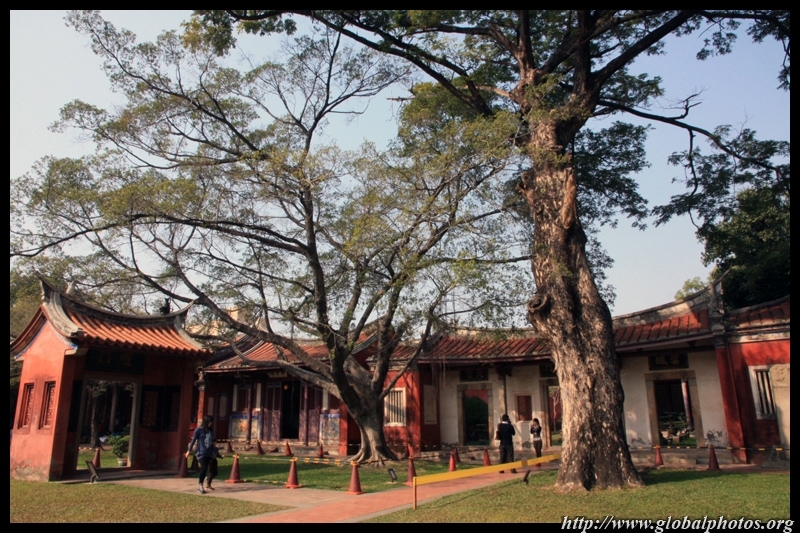 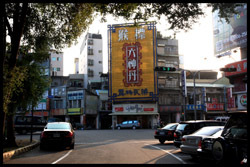 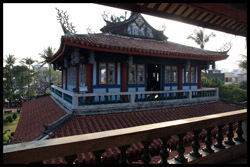 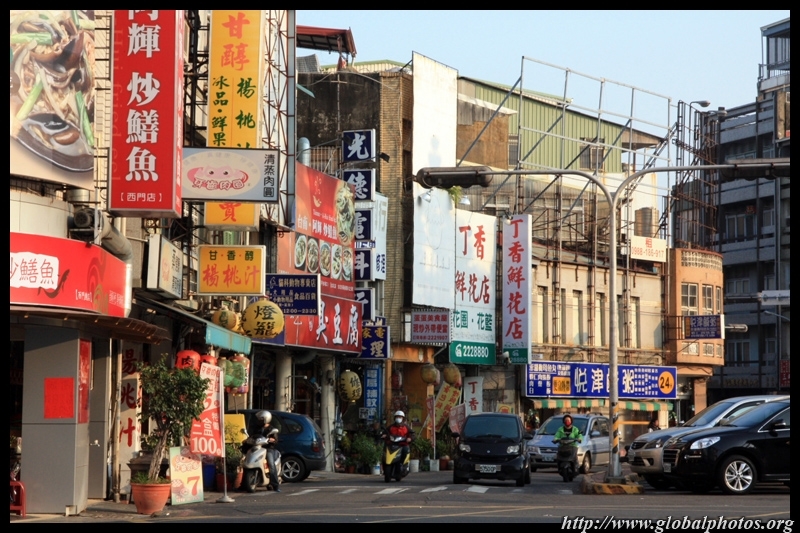 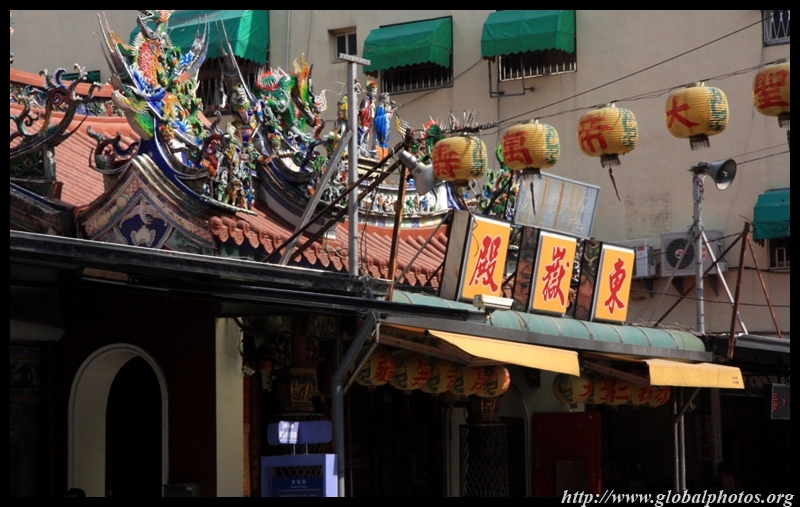 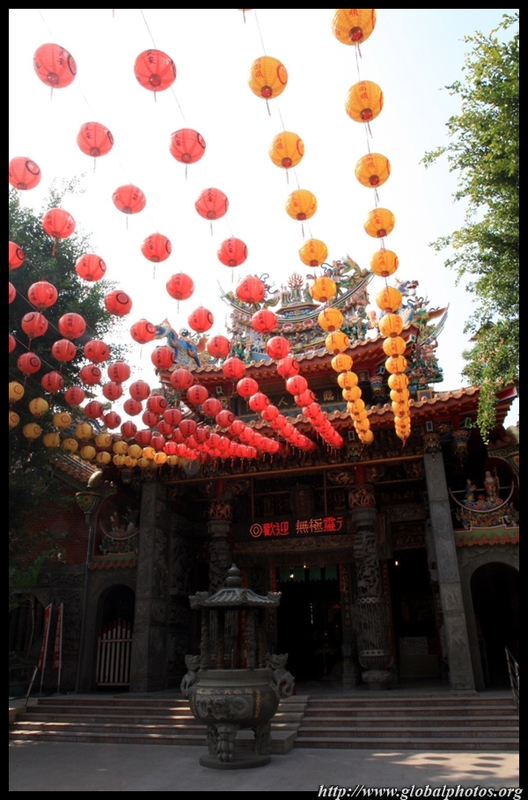 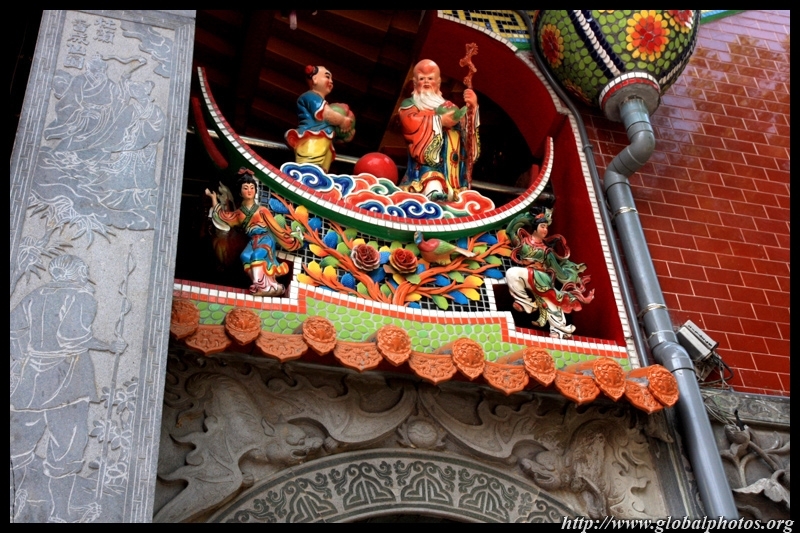 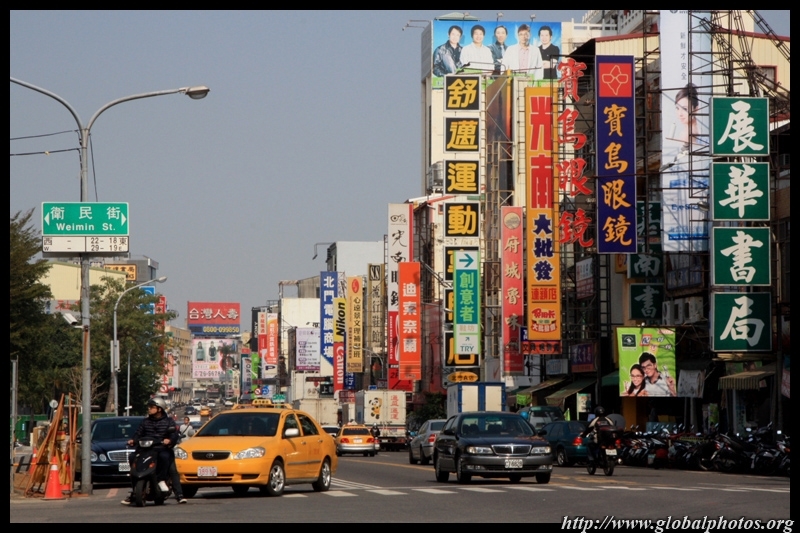 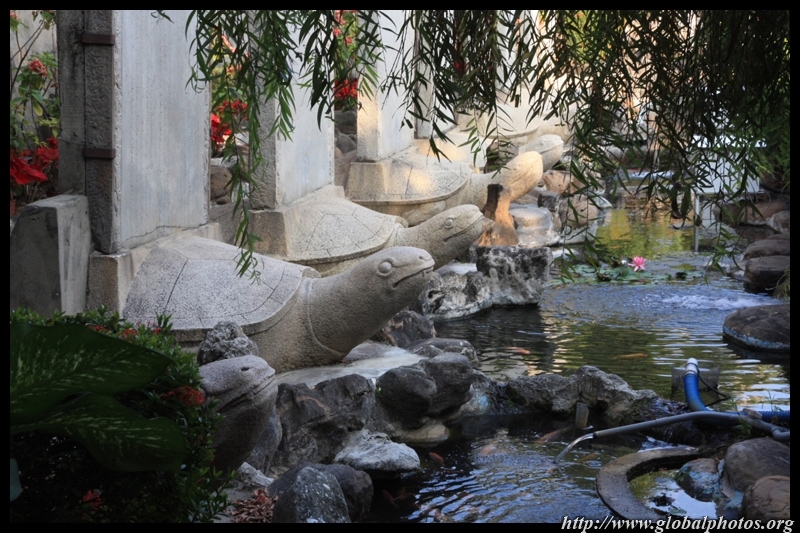 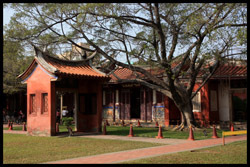 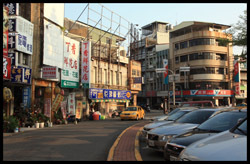 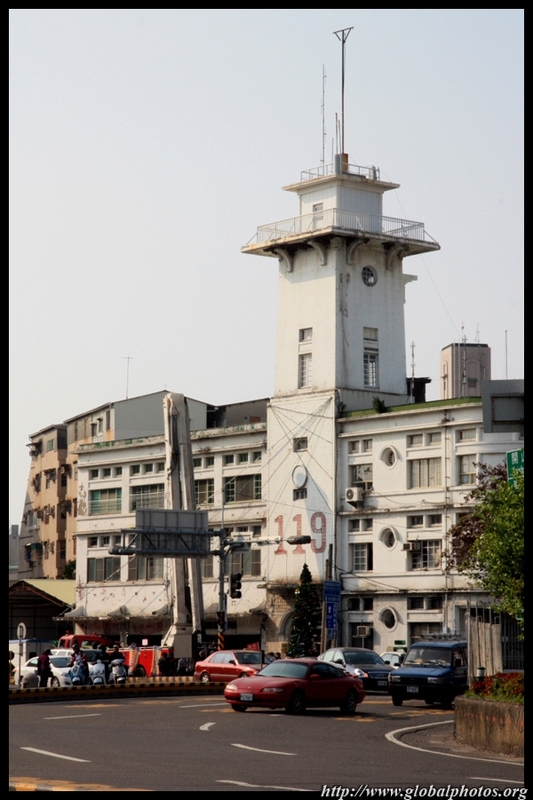 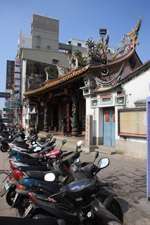 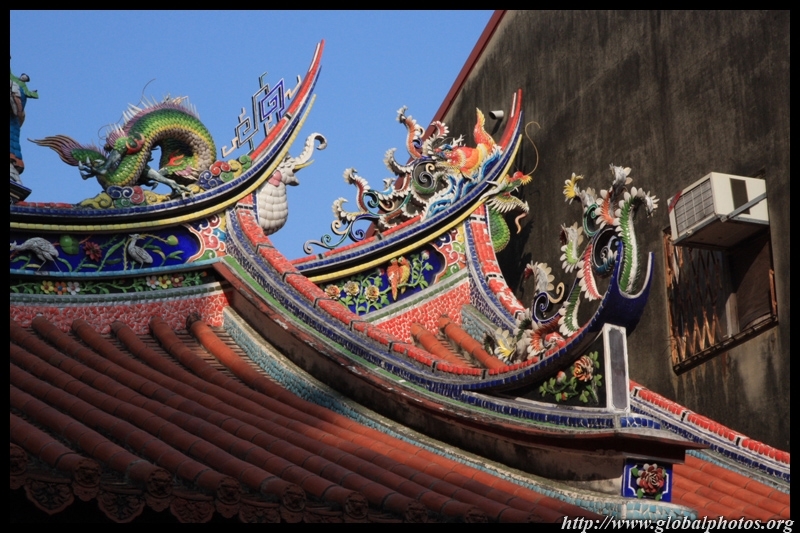 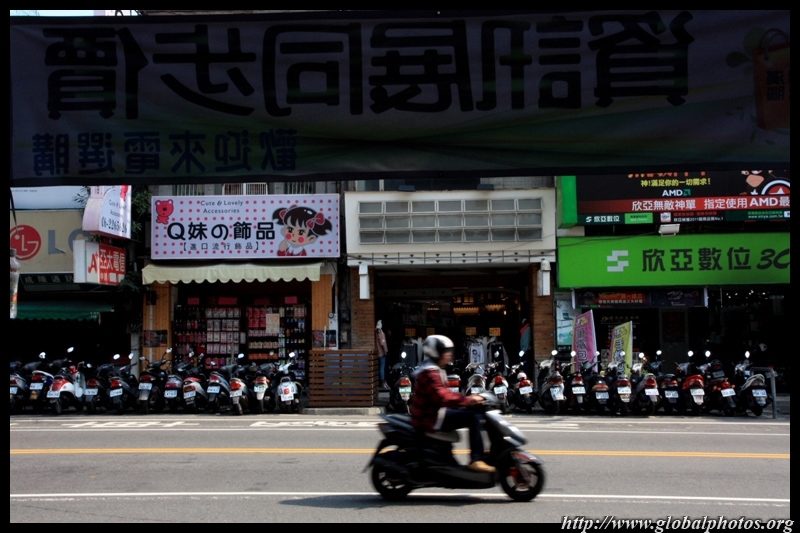 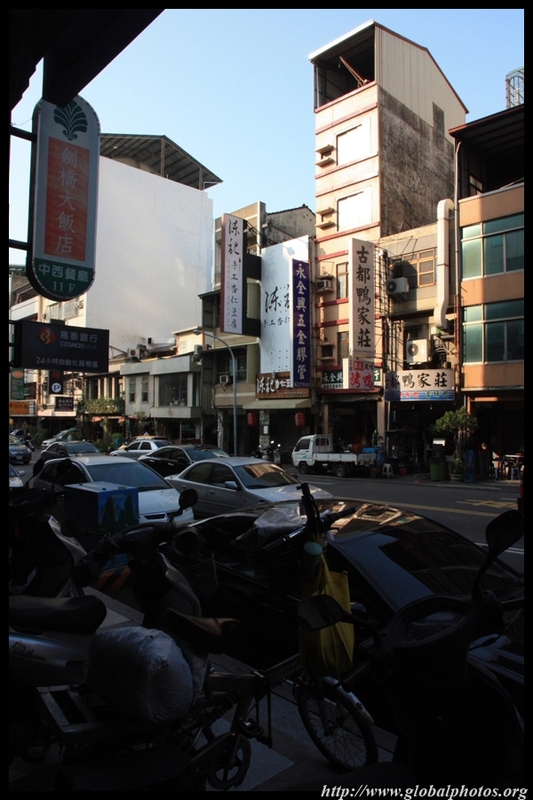 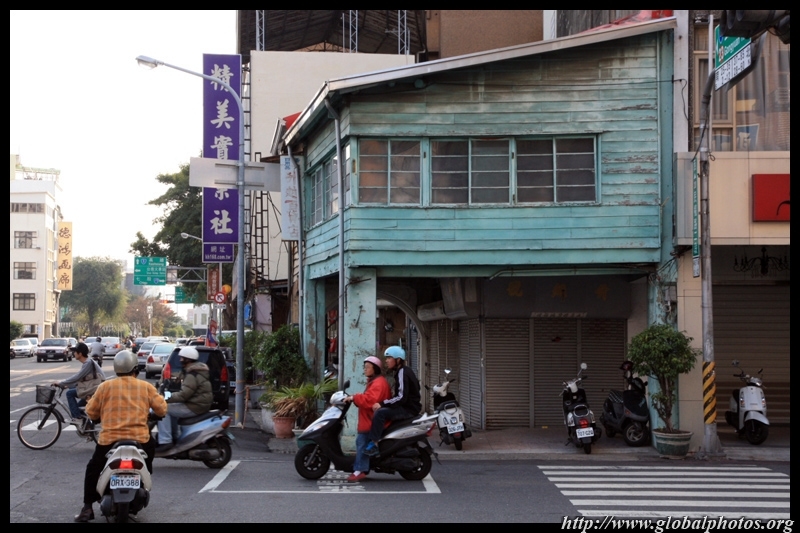 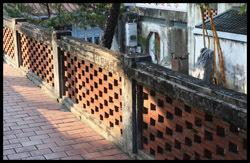 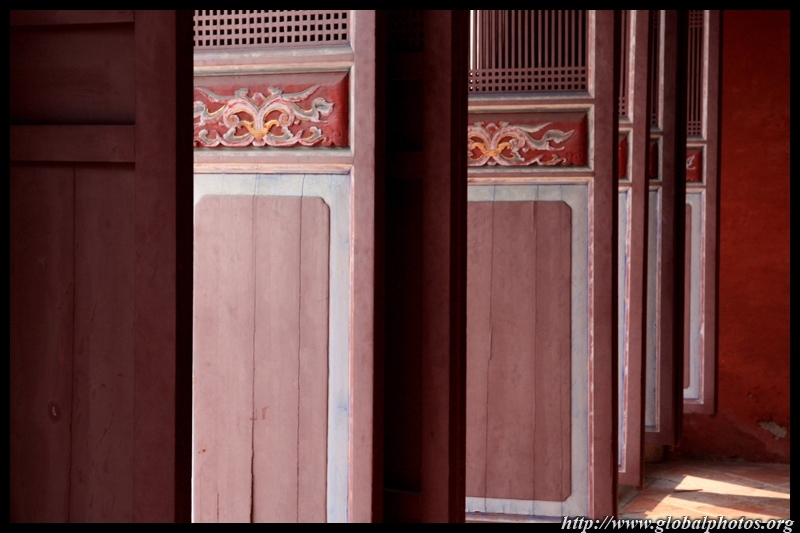 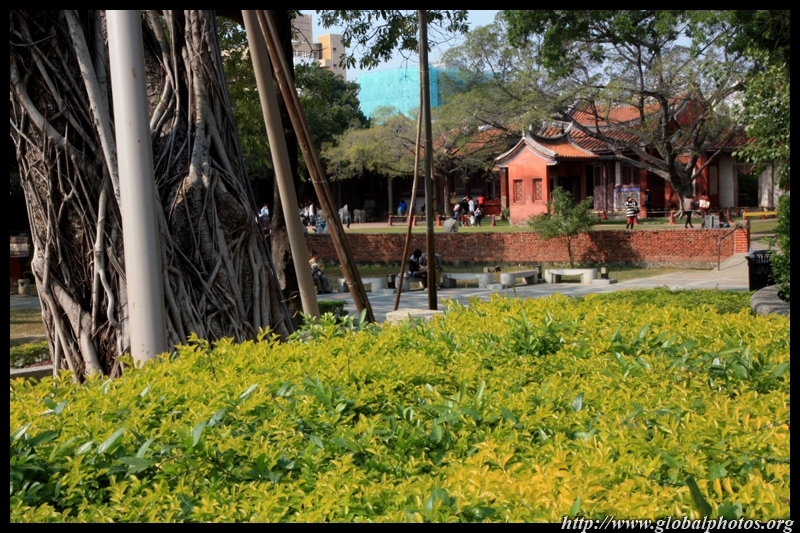 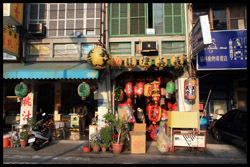 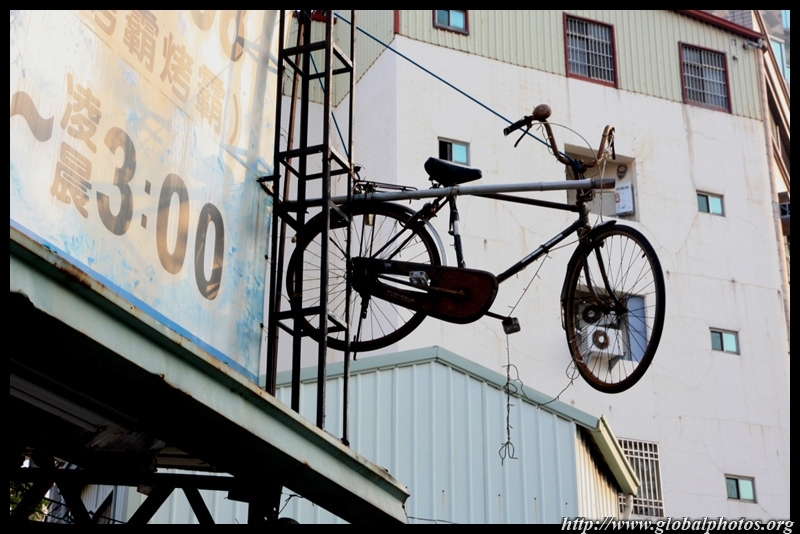 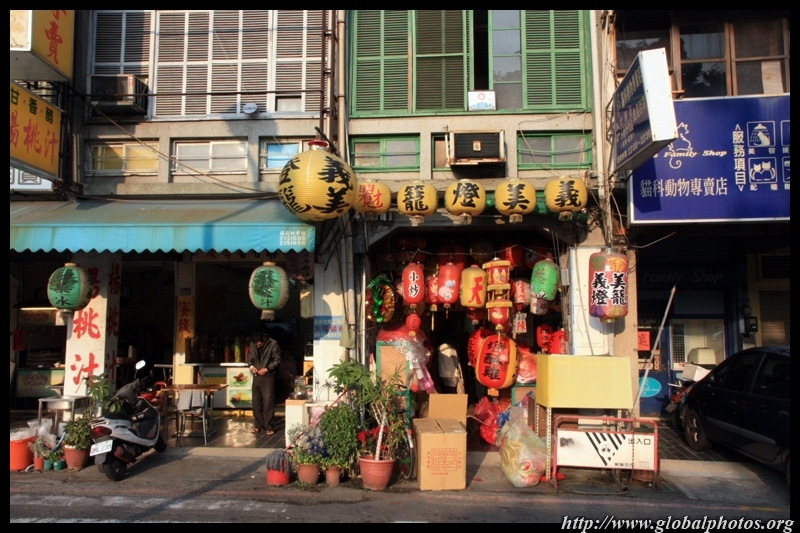 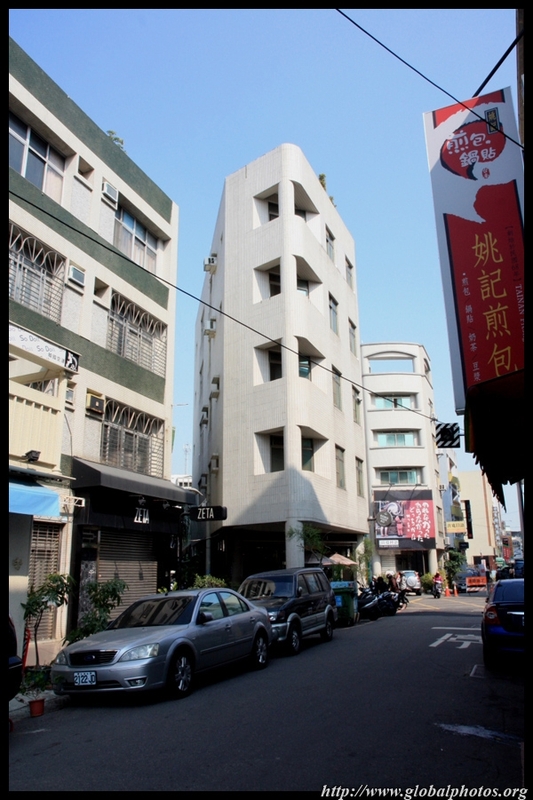 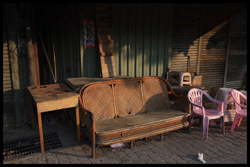 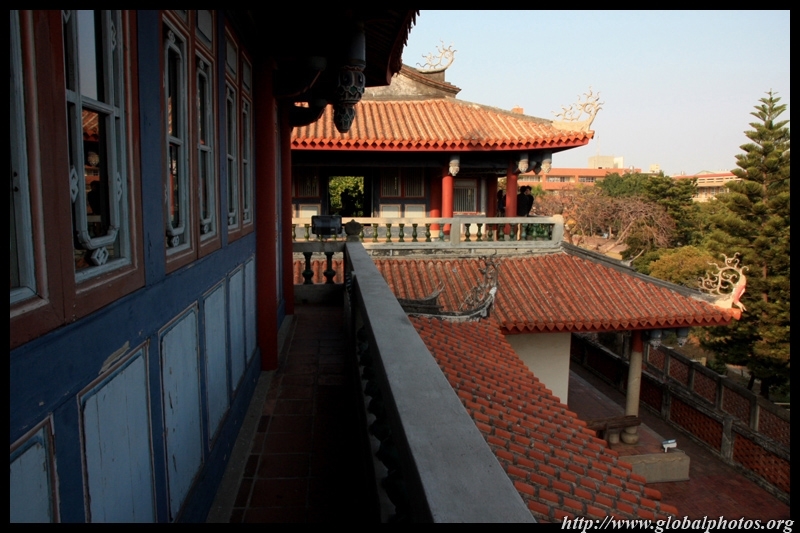 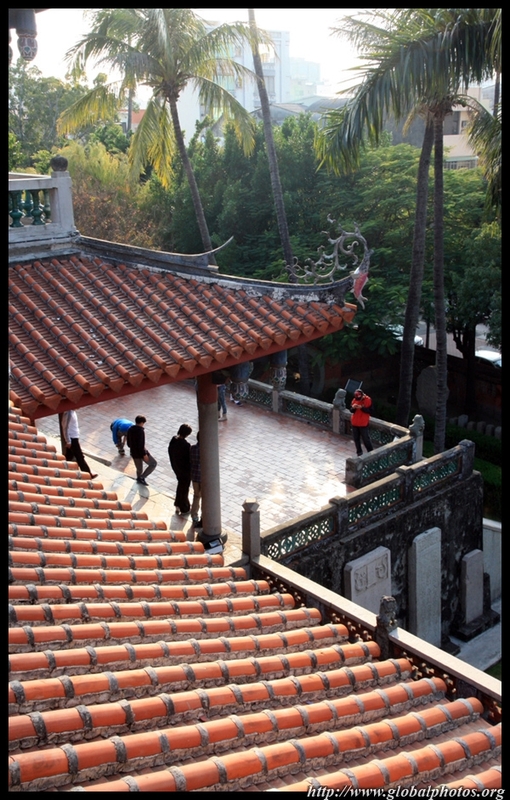 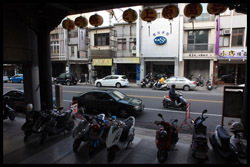 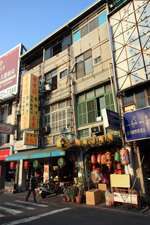 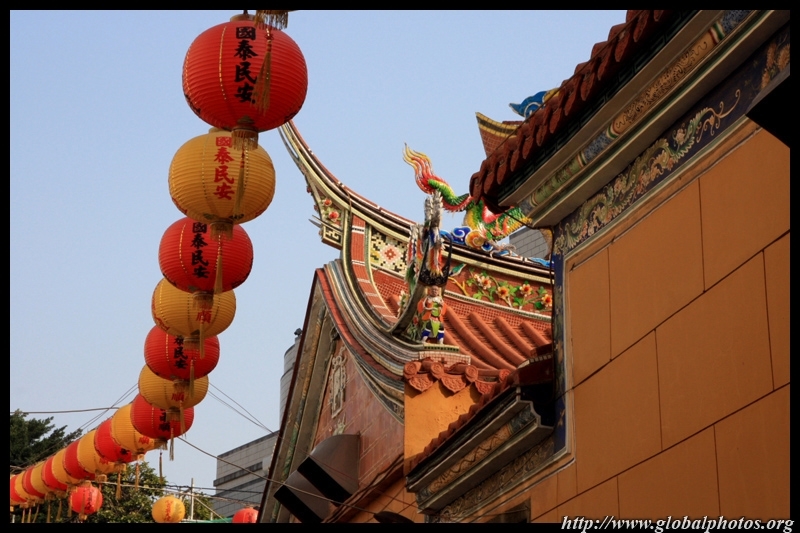 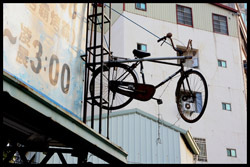 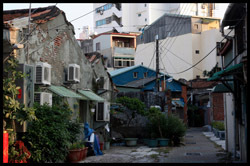 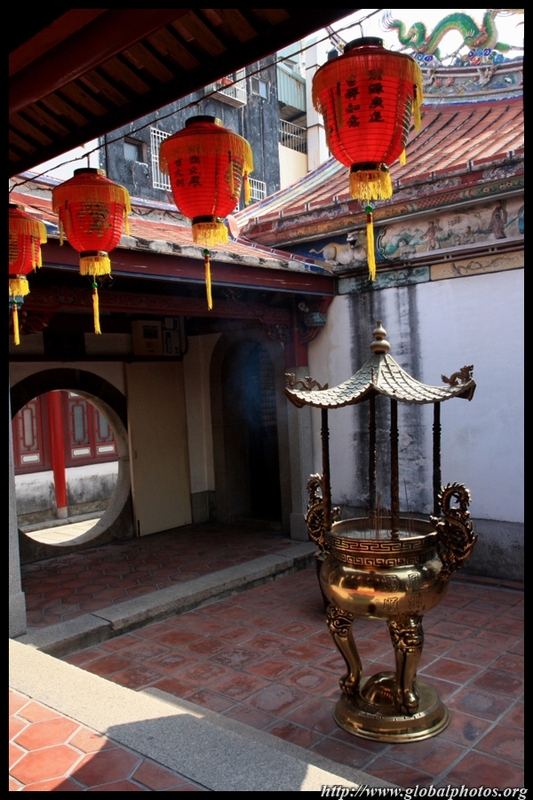 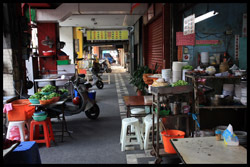 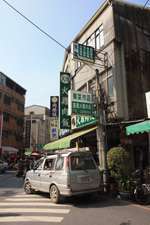 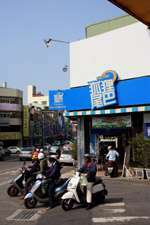 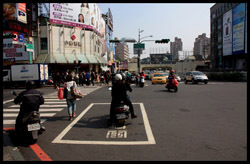 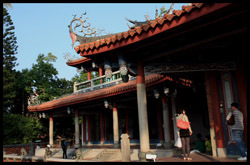 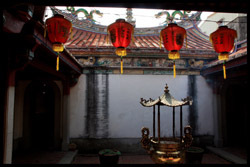 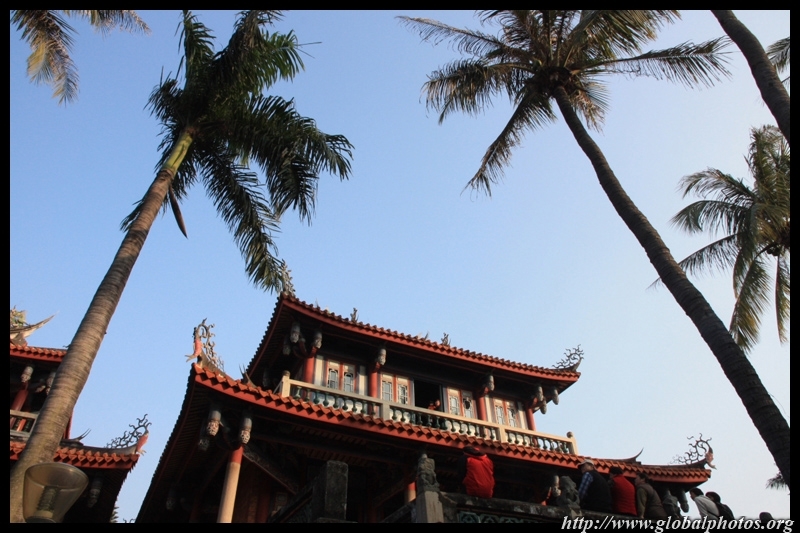 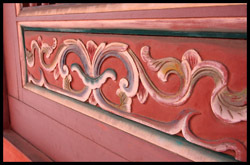 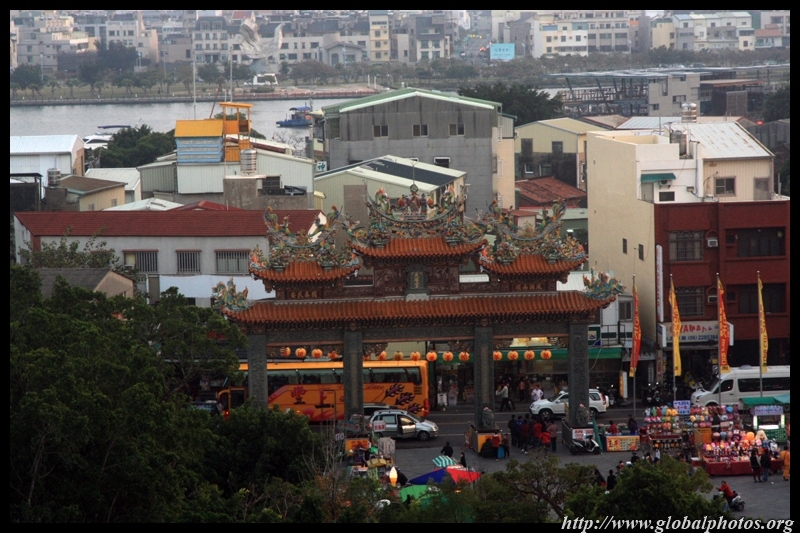 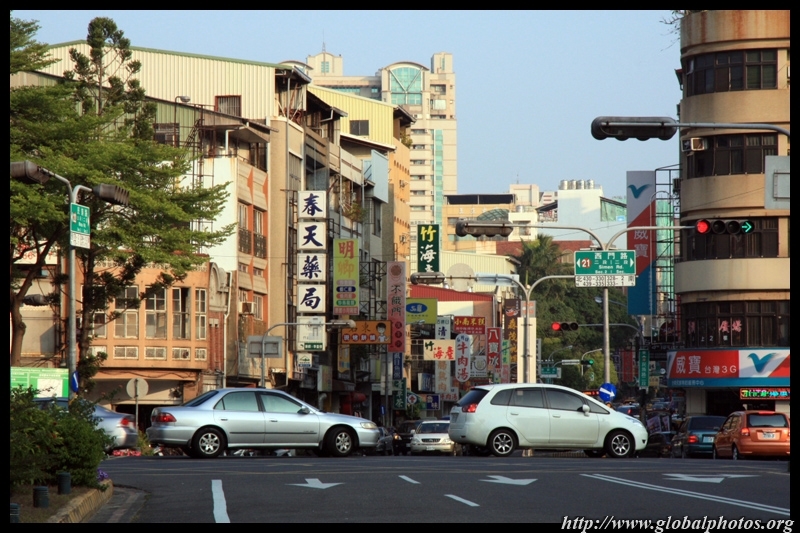 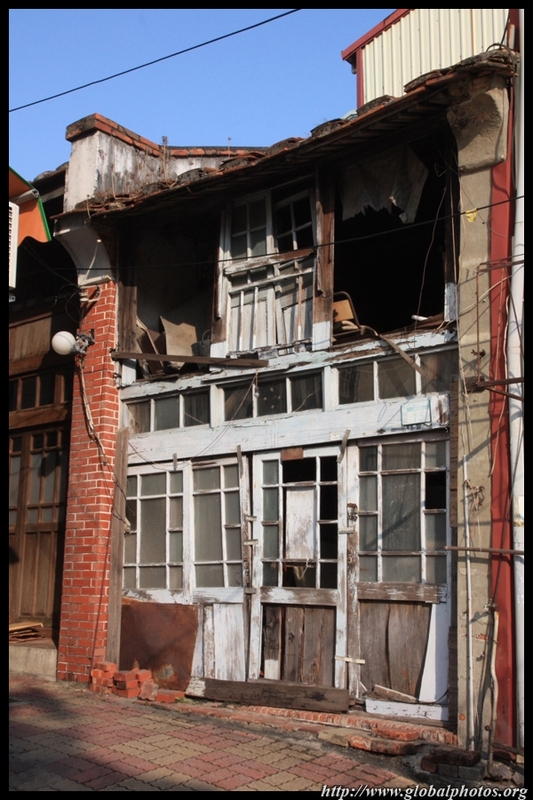 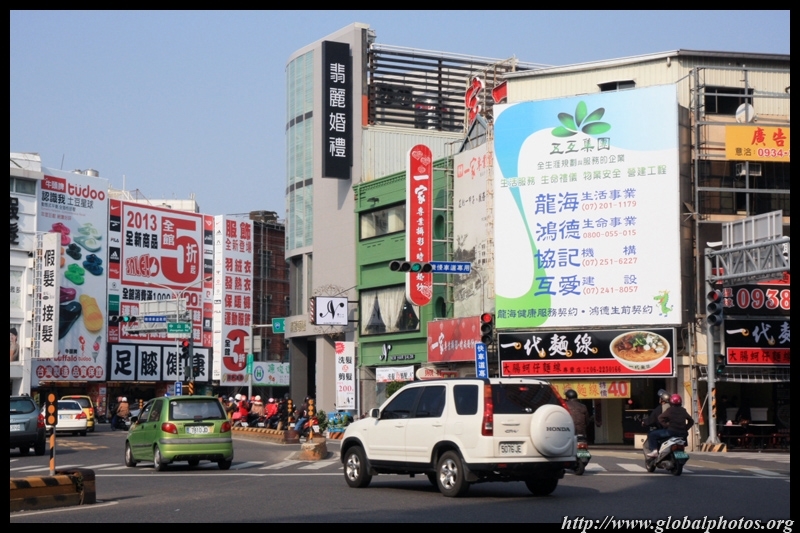 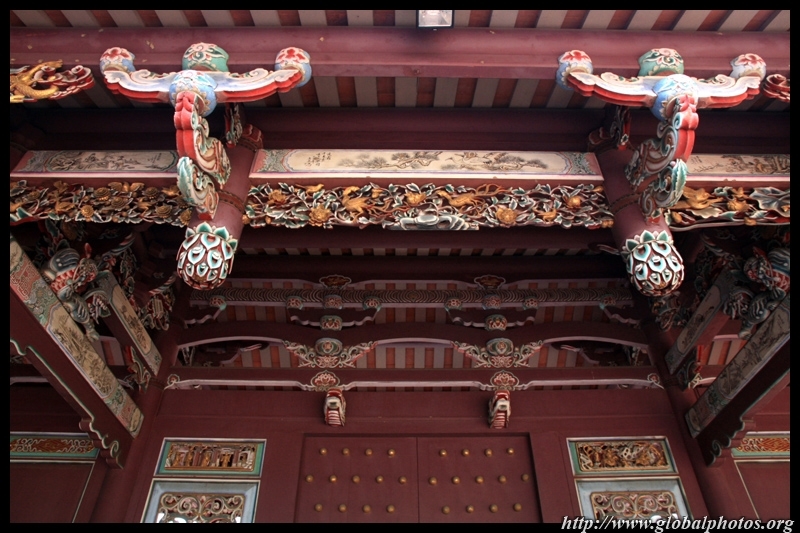 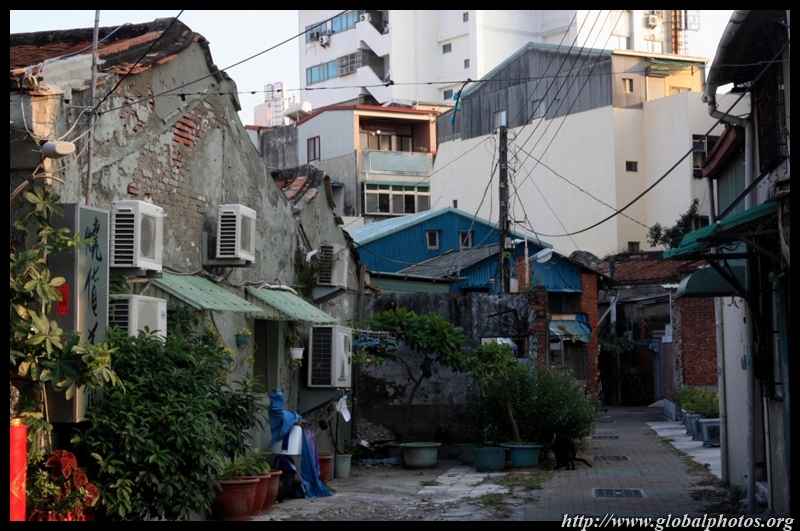 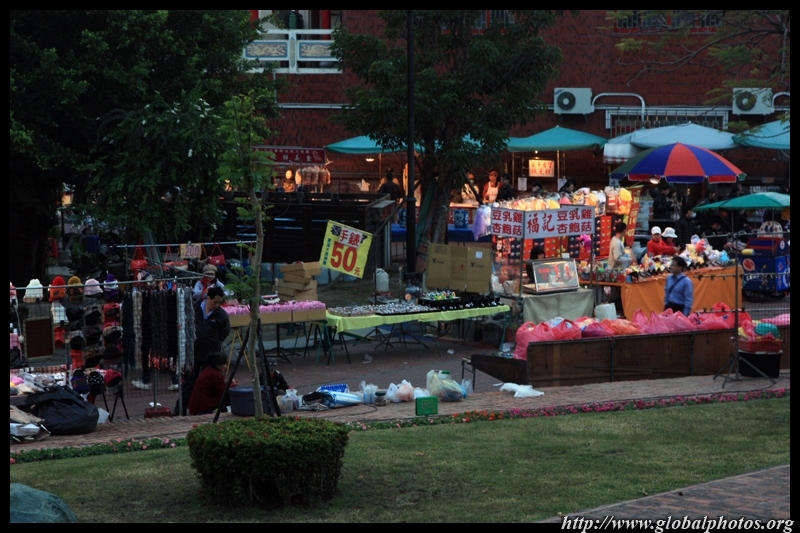 Tainan is the oldest city in Taiwan, and was the island's political and economic centre until the late 19th century. 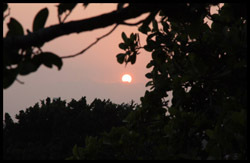 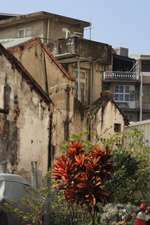 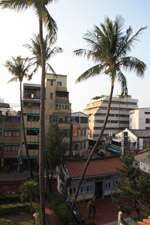 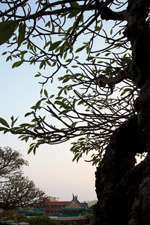 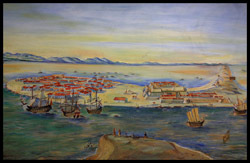 The city's development began with Dutch colonization in 1624. 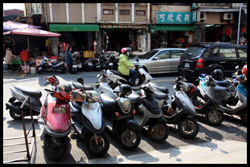 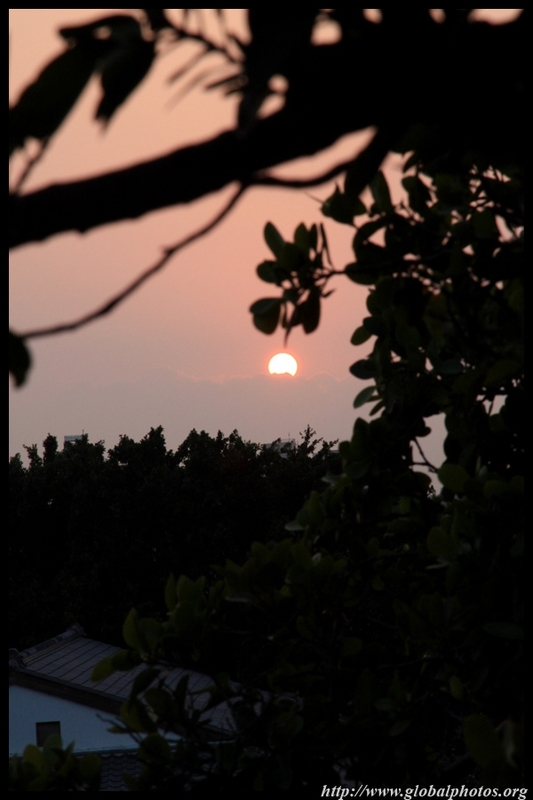 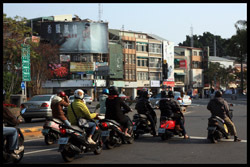 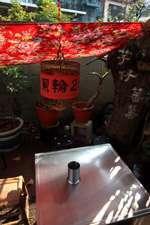 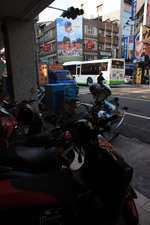 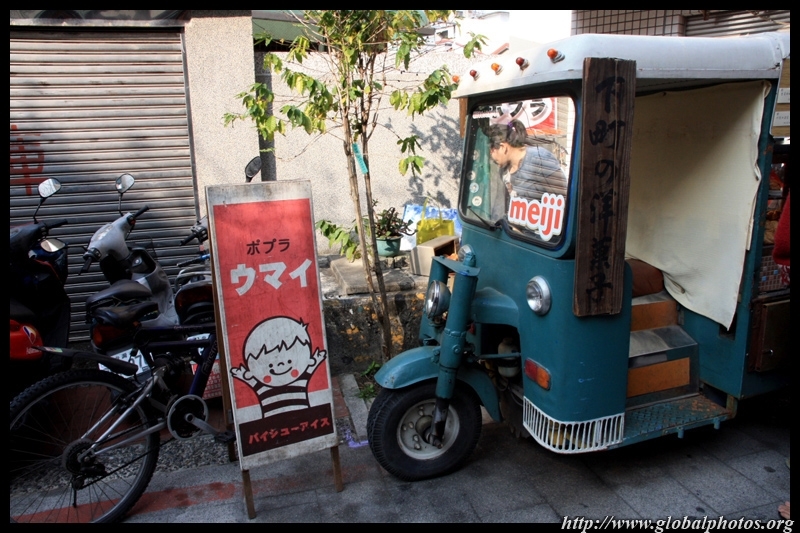 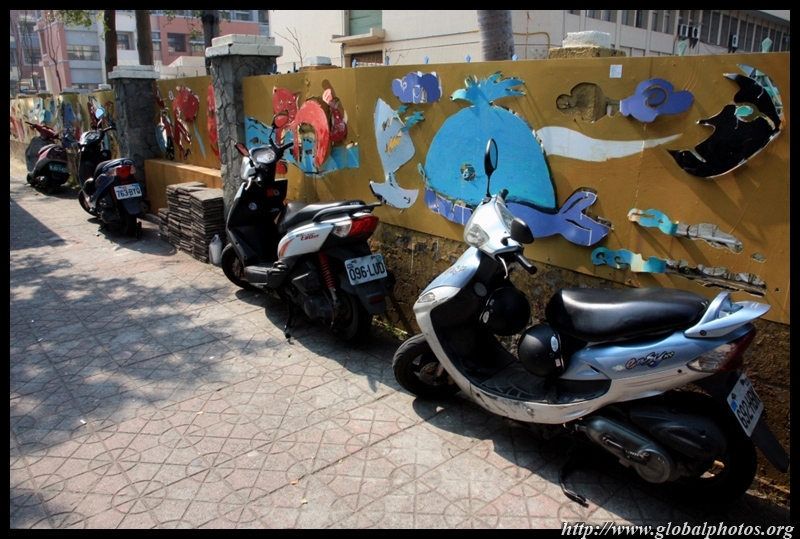 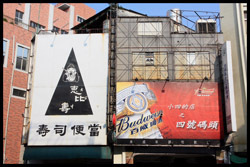 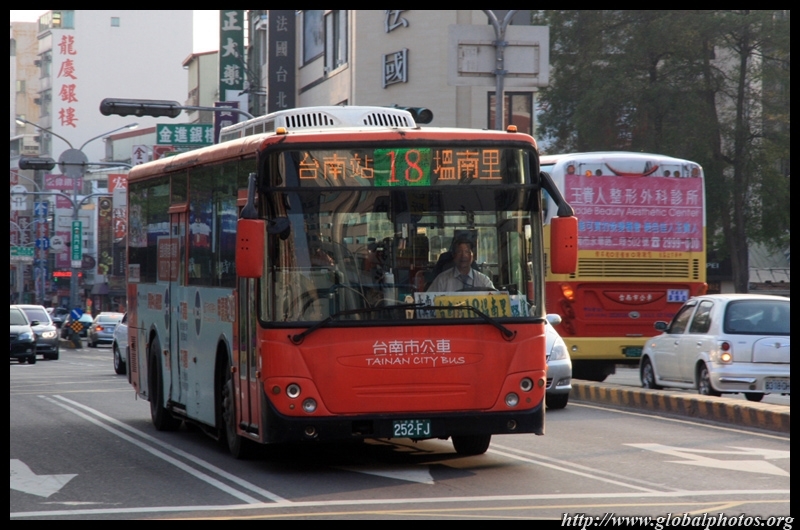 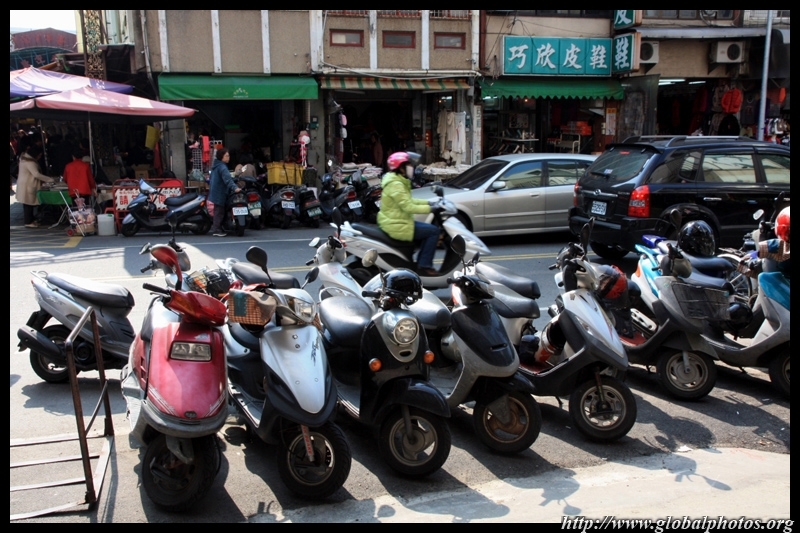 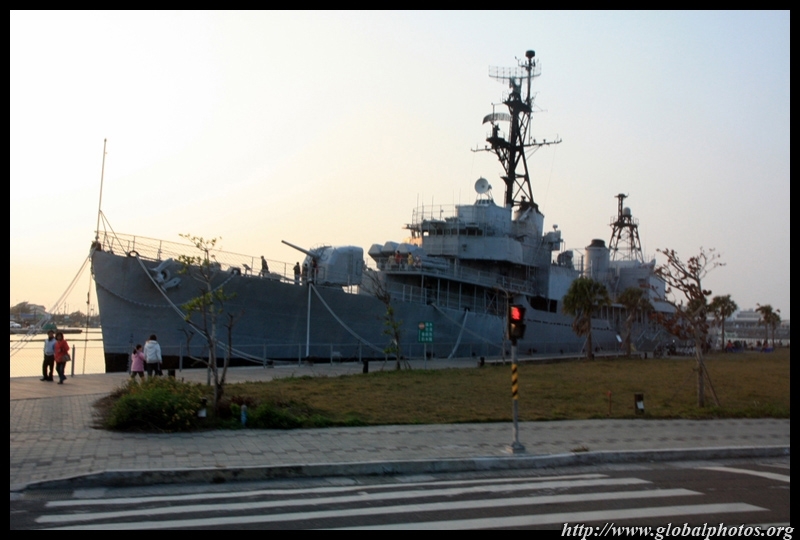 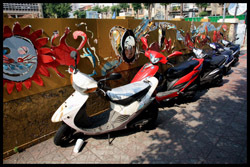 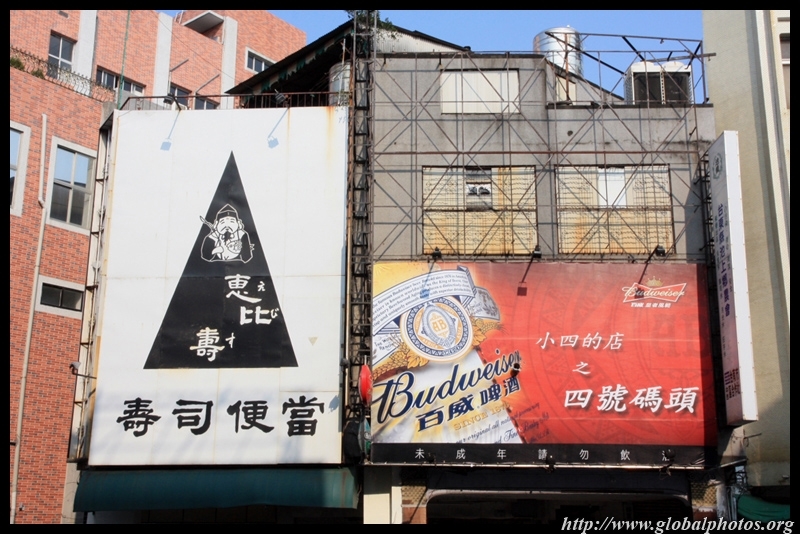 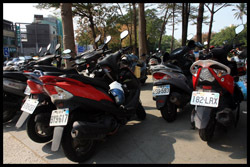 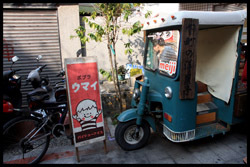 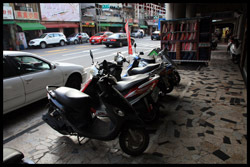 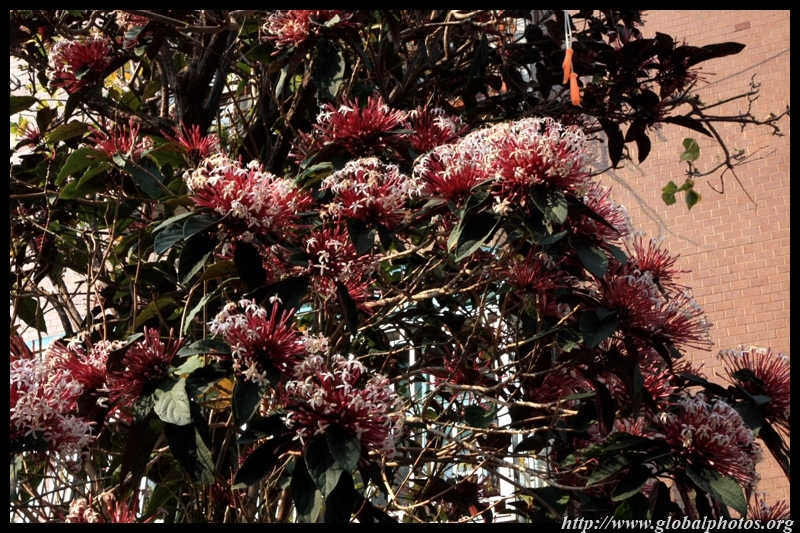 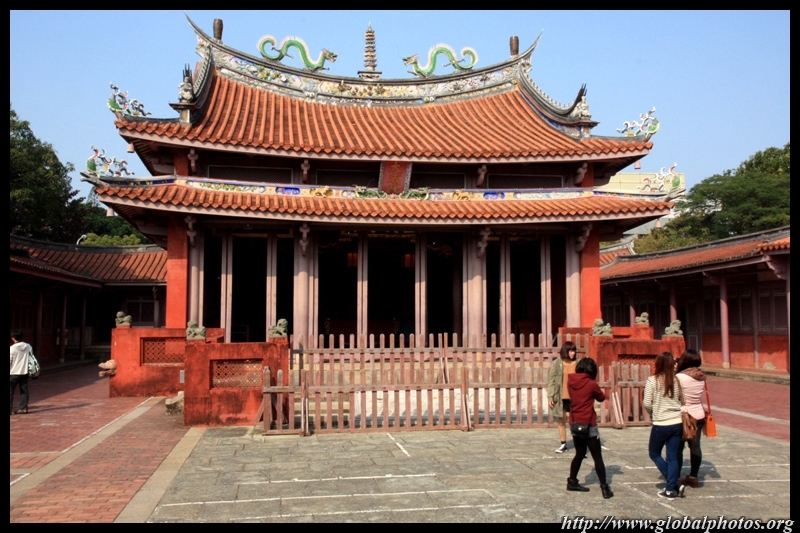 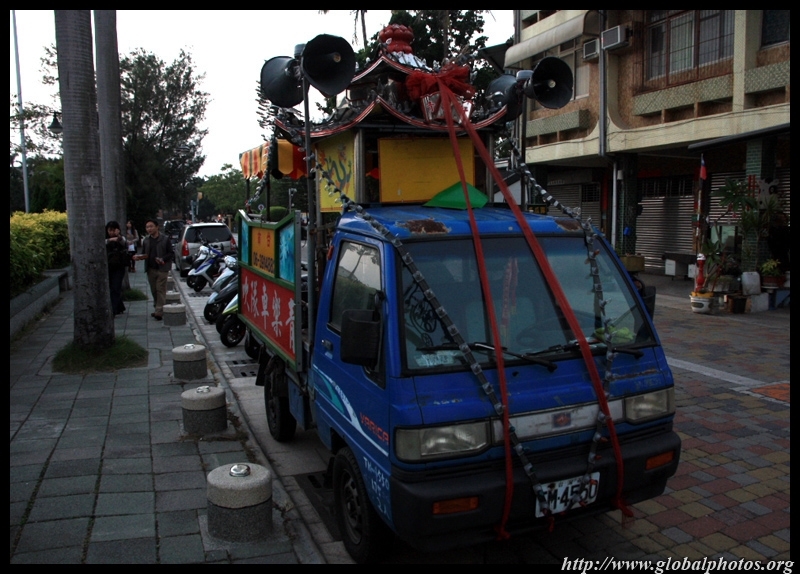 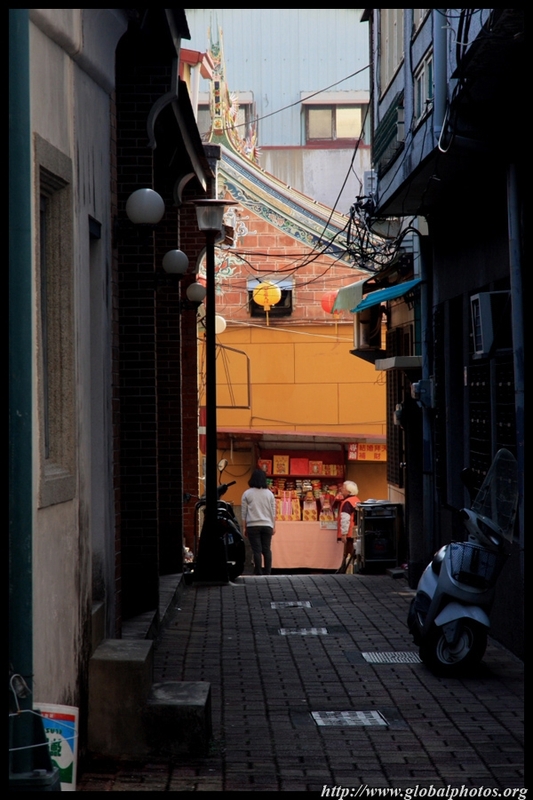 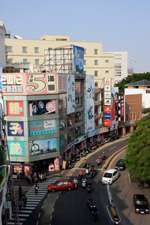 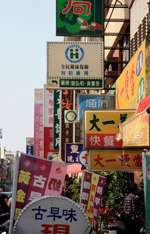 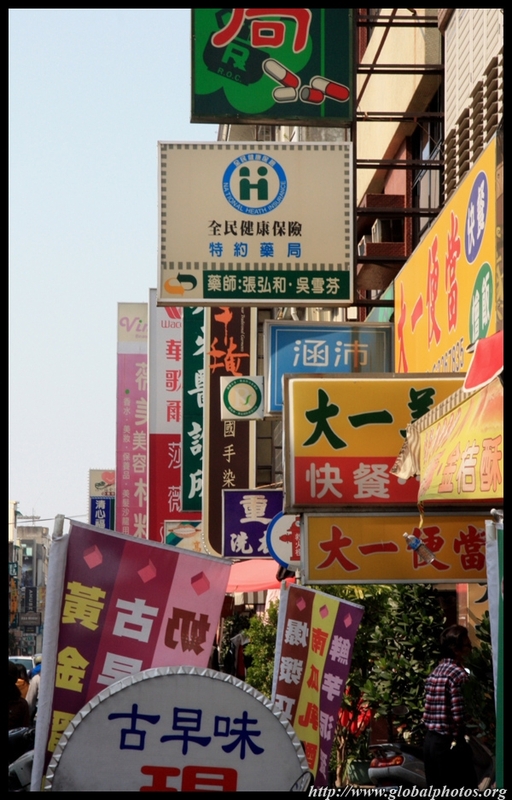 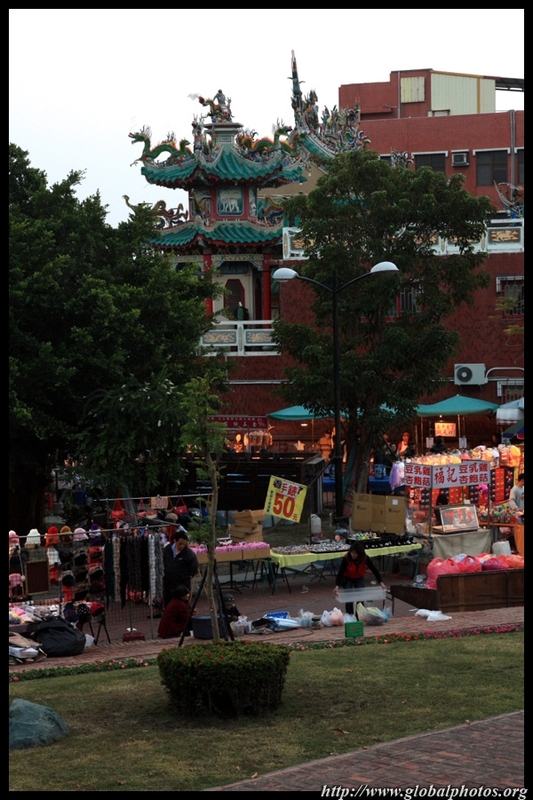 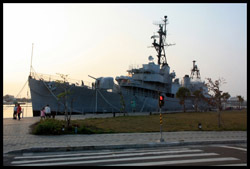 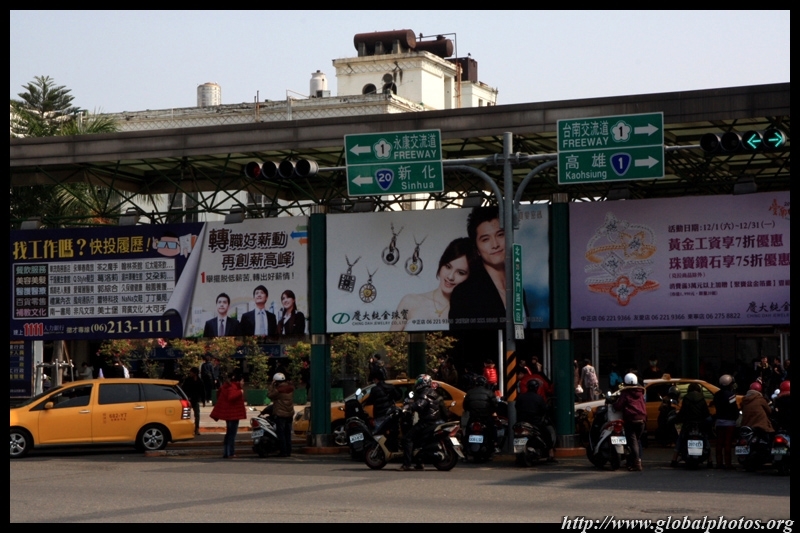 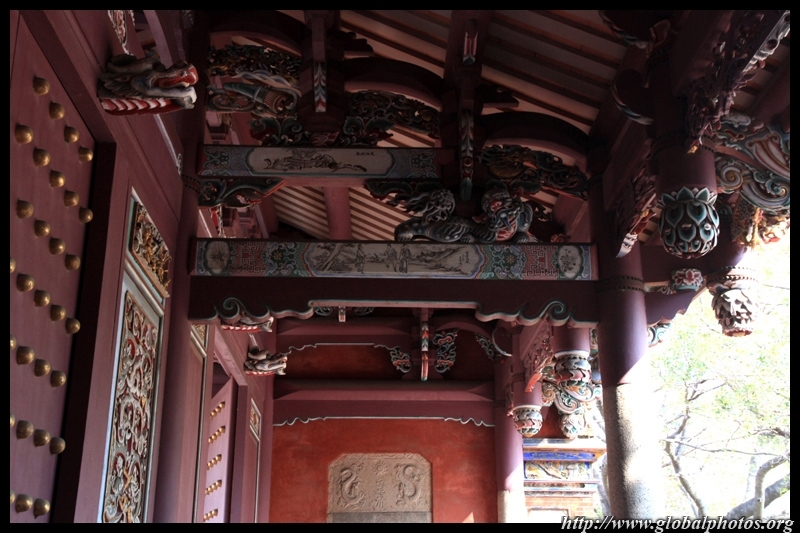 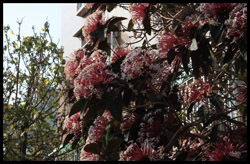 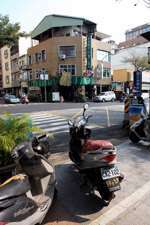 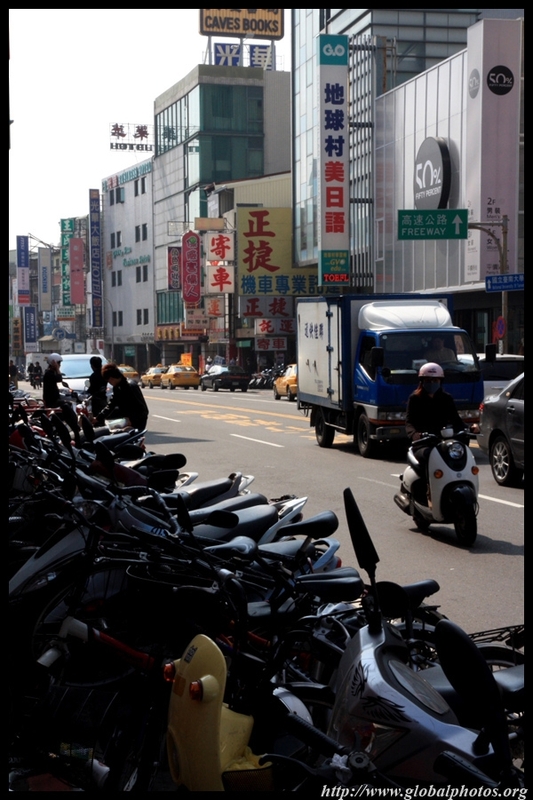 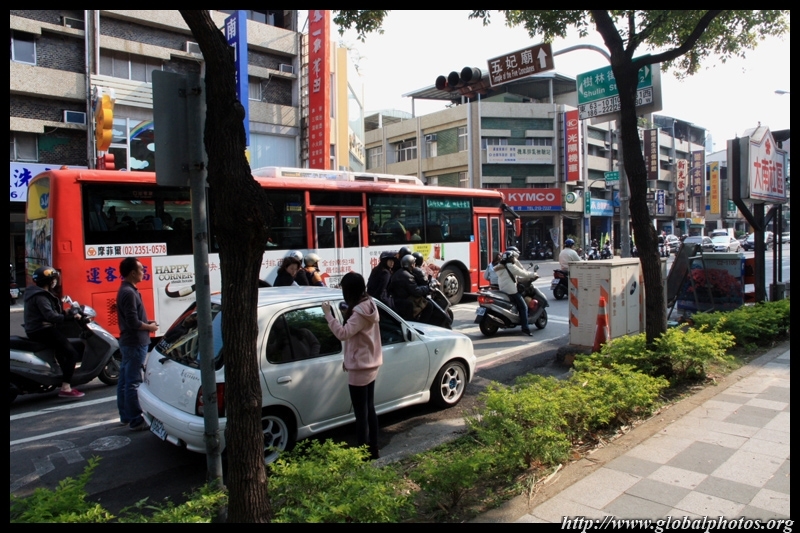 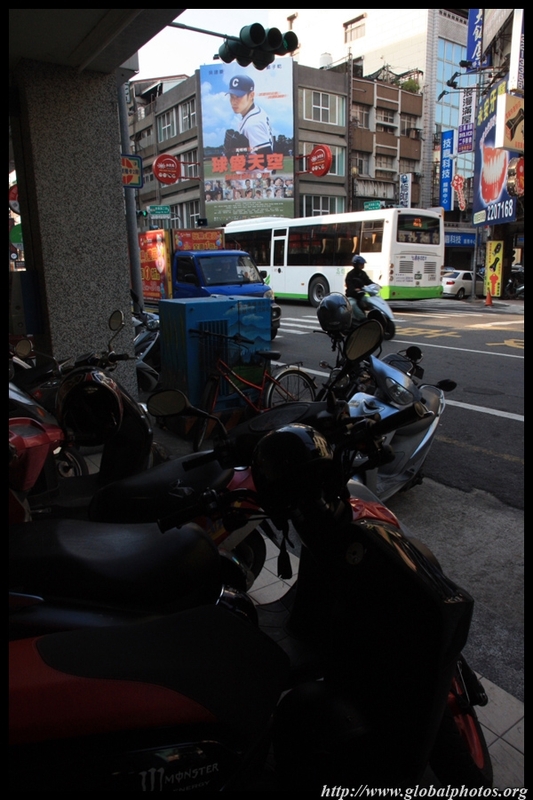 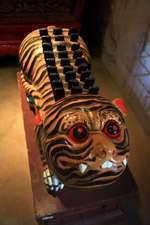 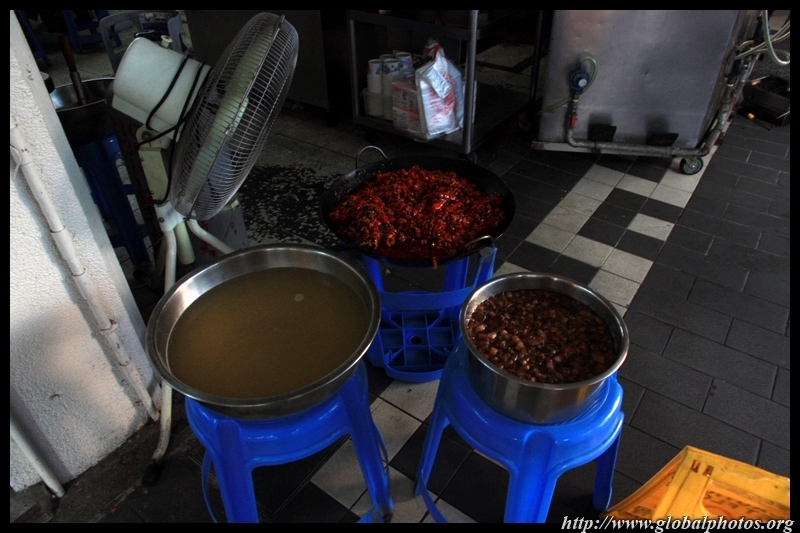 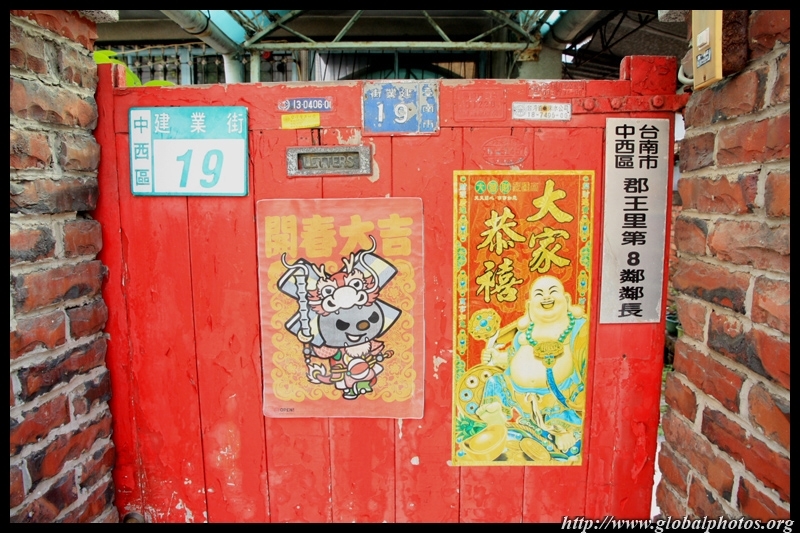 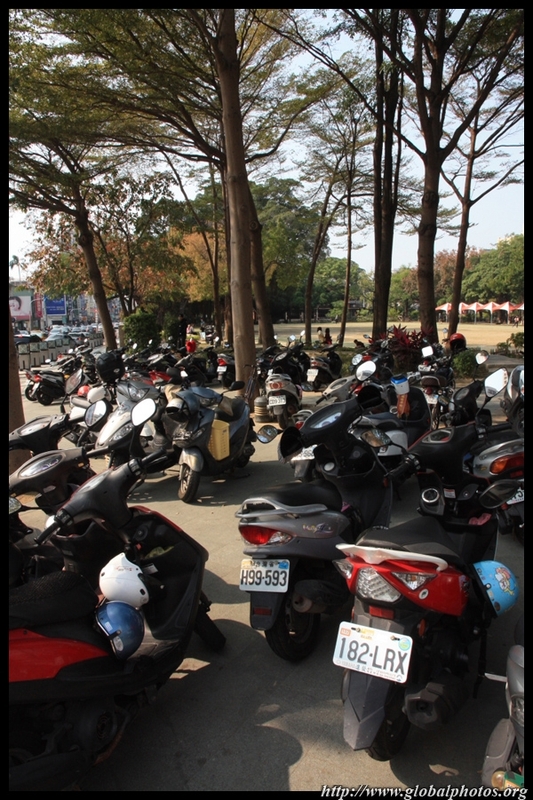 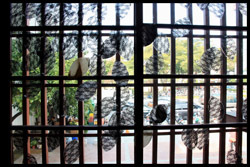 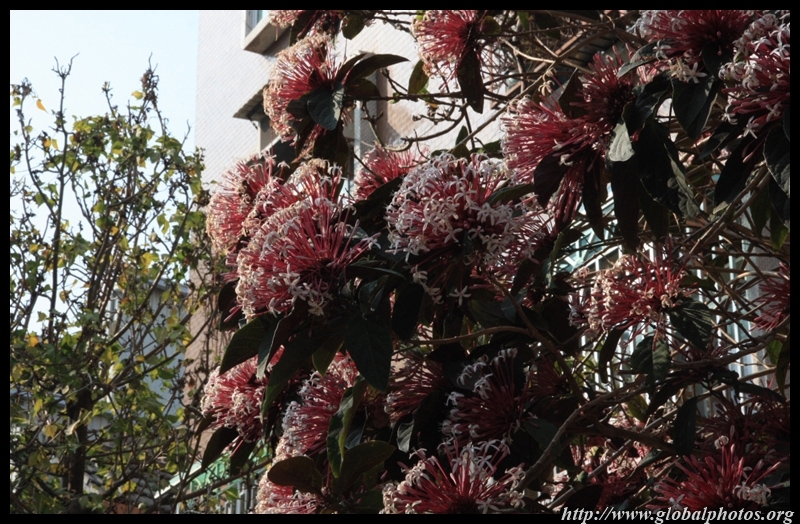 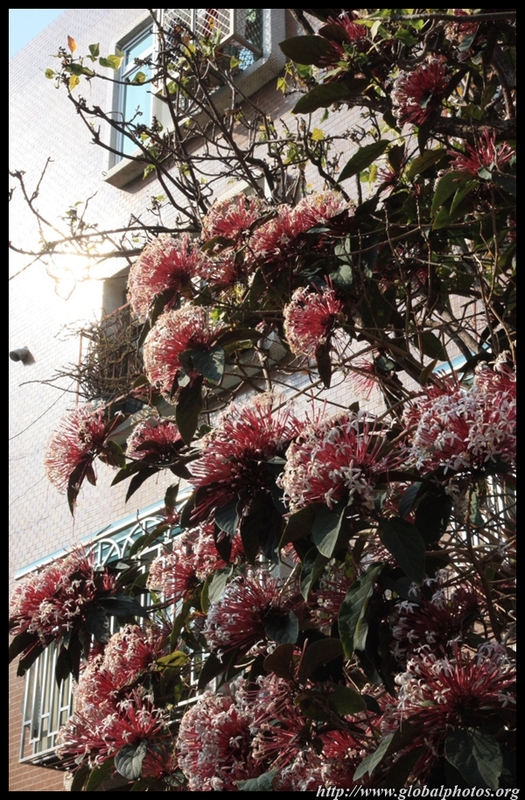 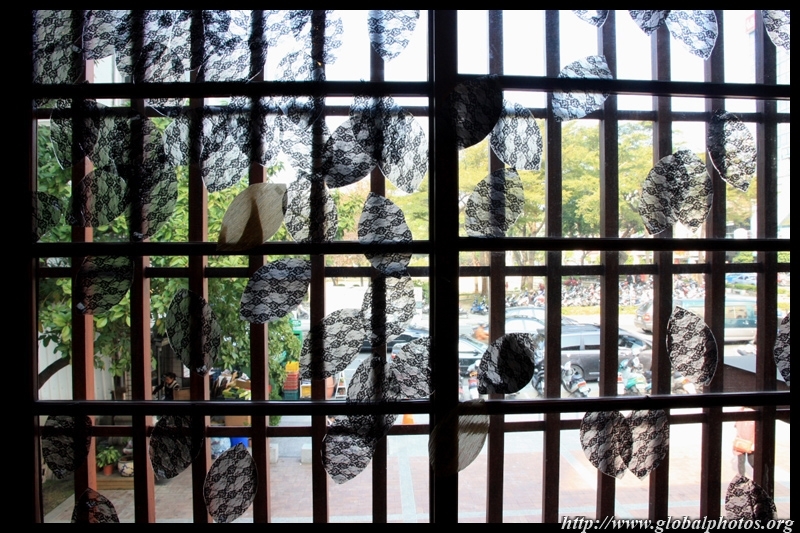 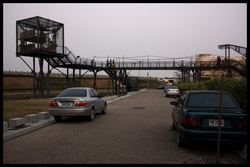 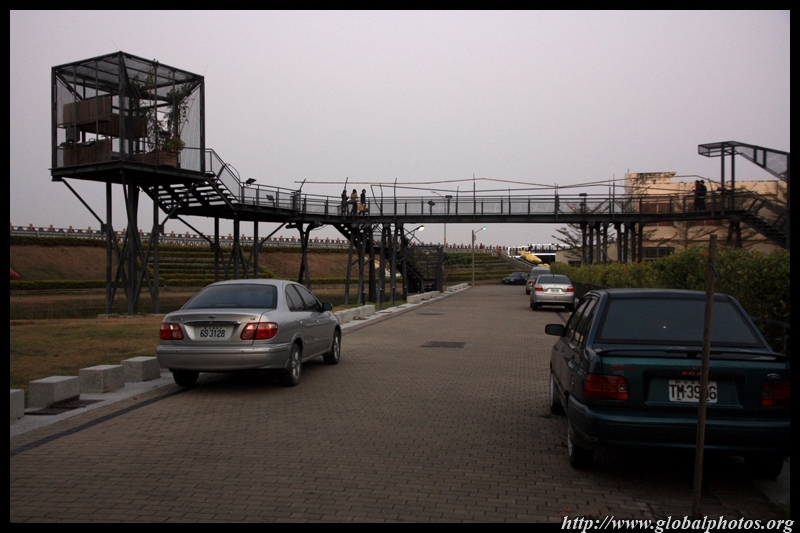 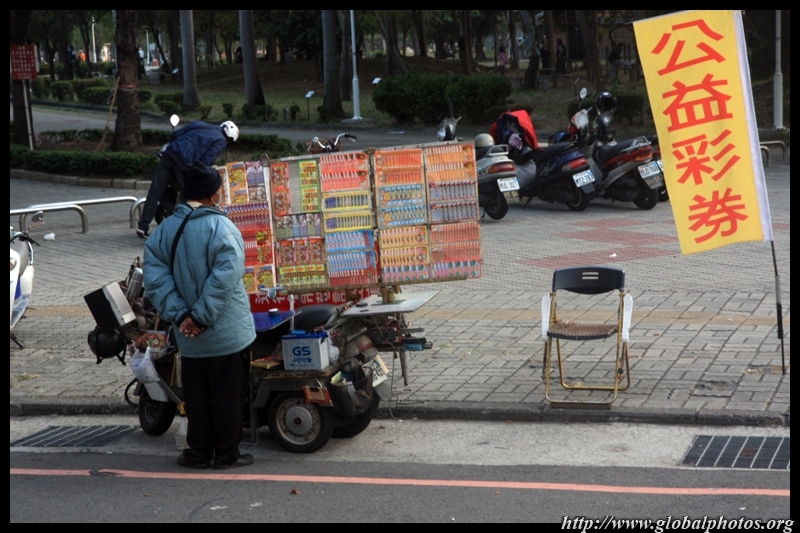 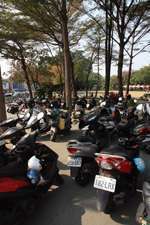 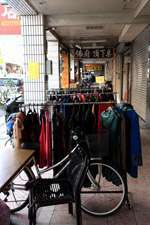 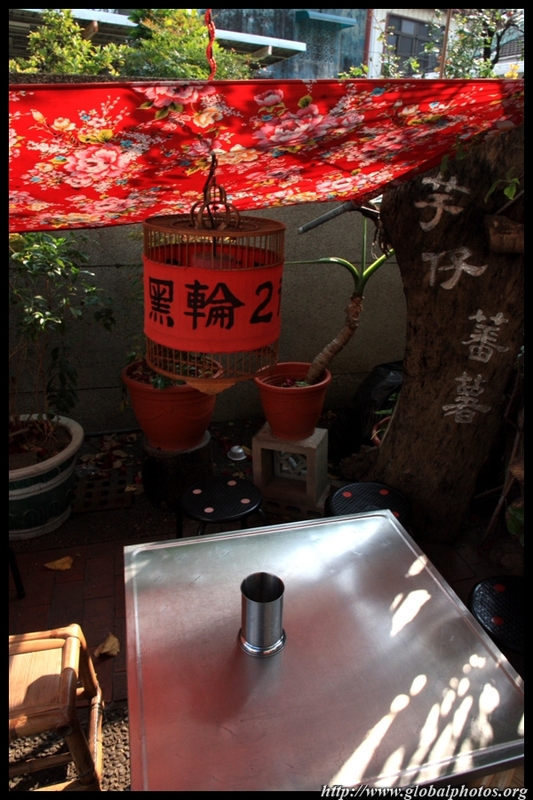 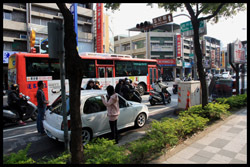 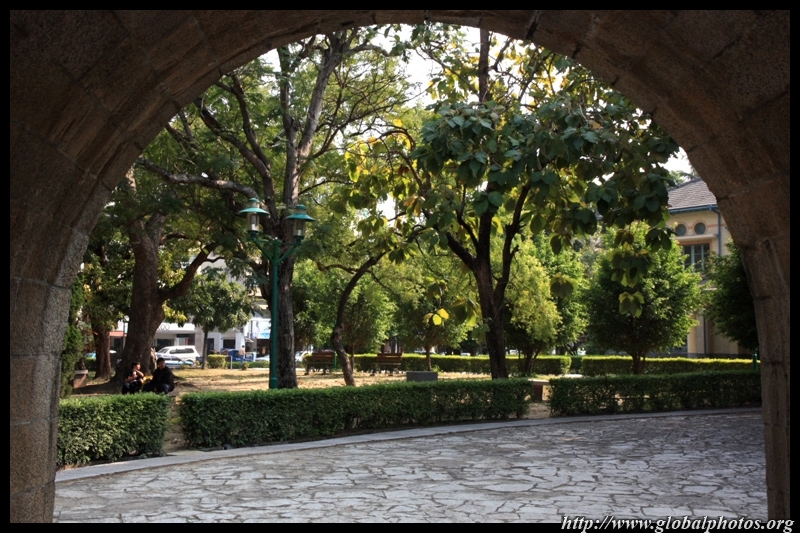 Today's Tainan has a sizeable amount of tourist sights. 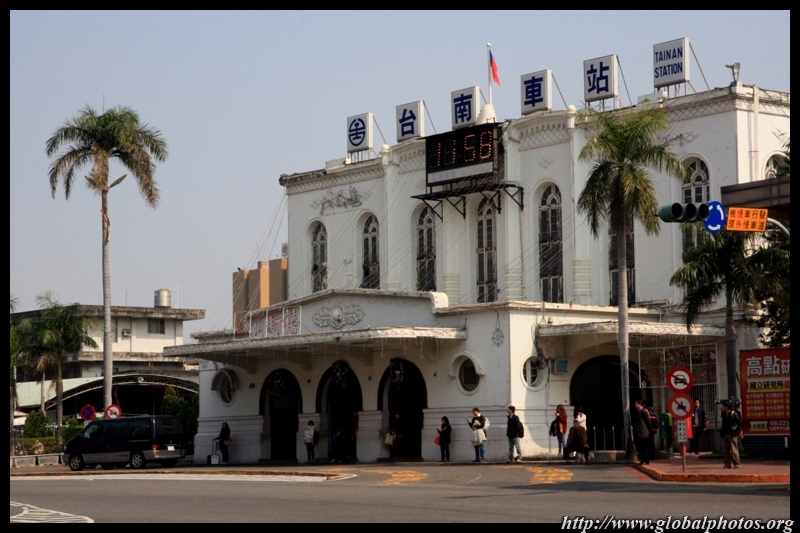 Thanks to the high-speed railway, it is now possible to visit for a day trip from either Taipei or Kaohsiung. 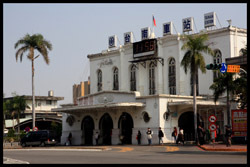 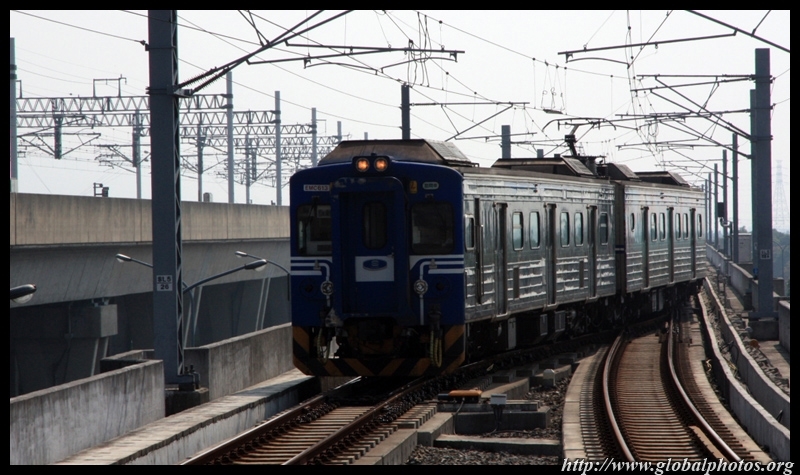 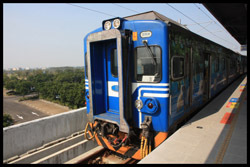 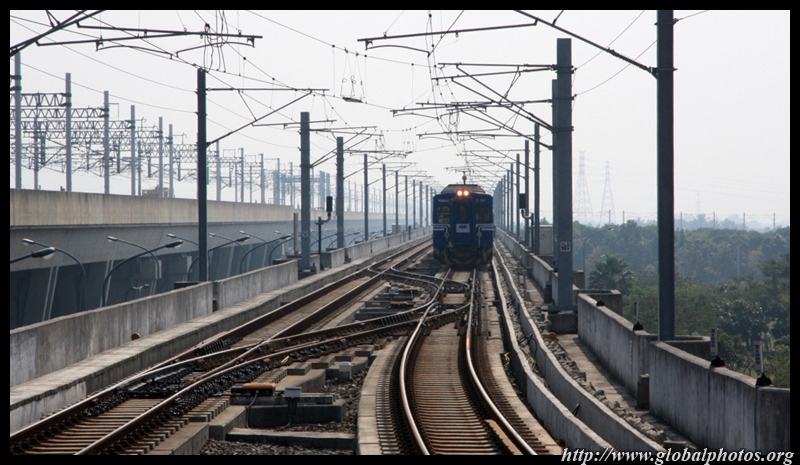 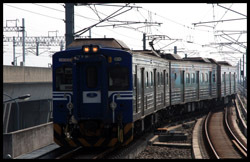 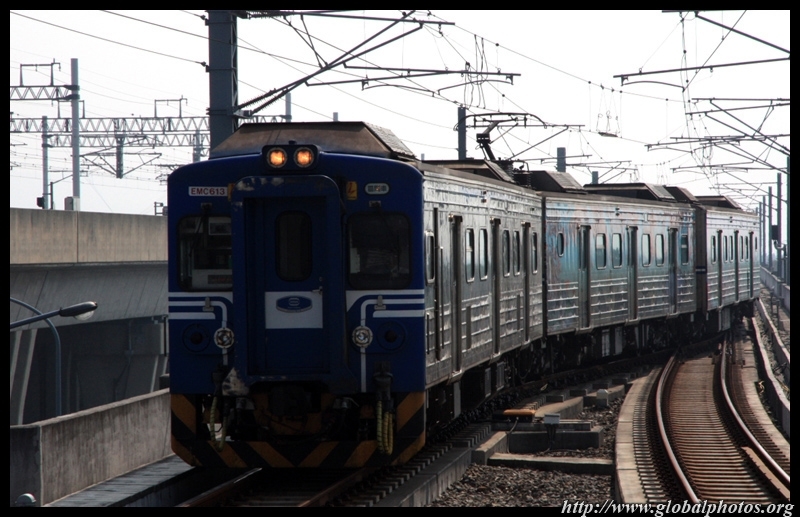 Tainan's high-speed train station is far from the city centre. 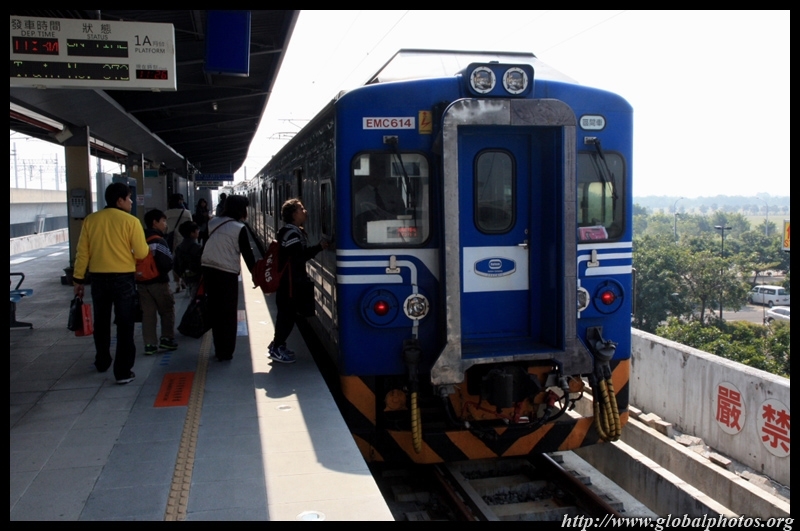 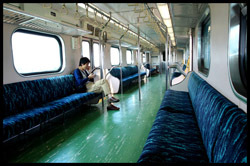 I opted to take the cheap local train to get into town rather than the likely-crowded free shuttle bus. 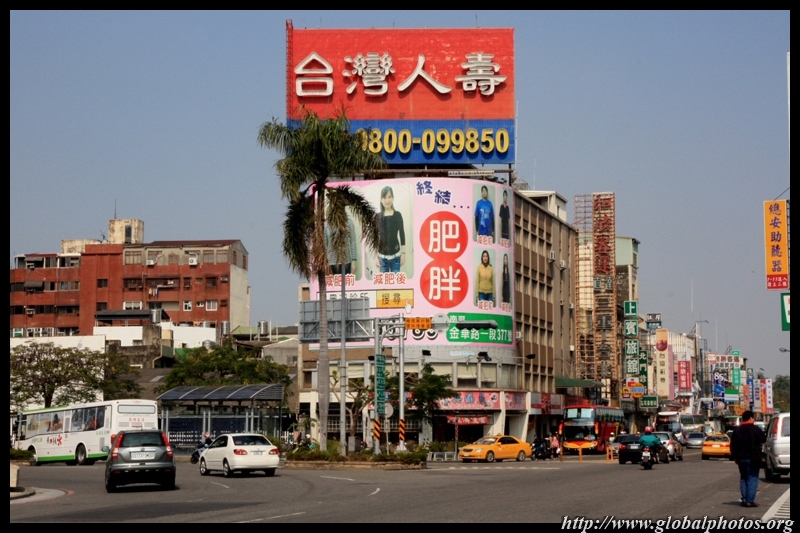 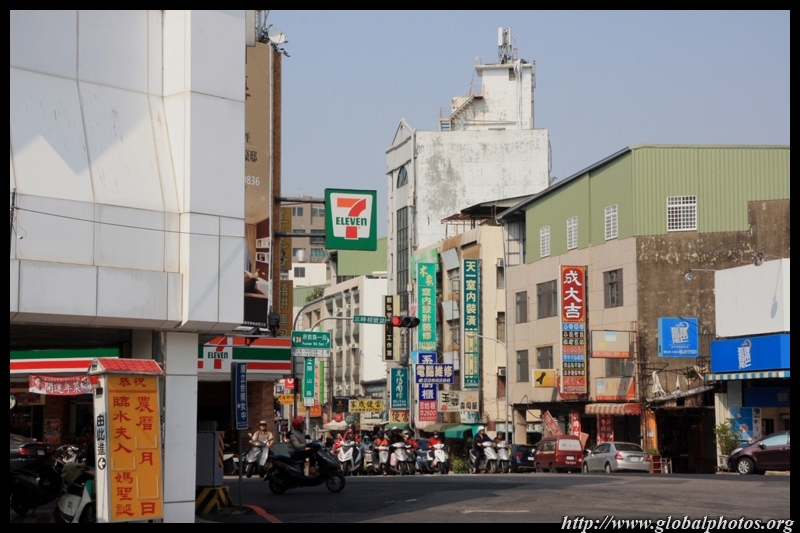 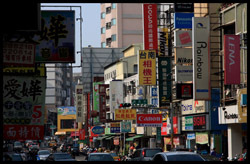 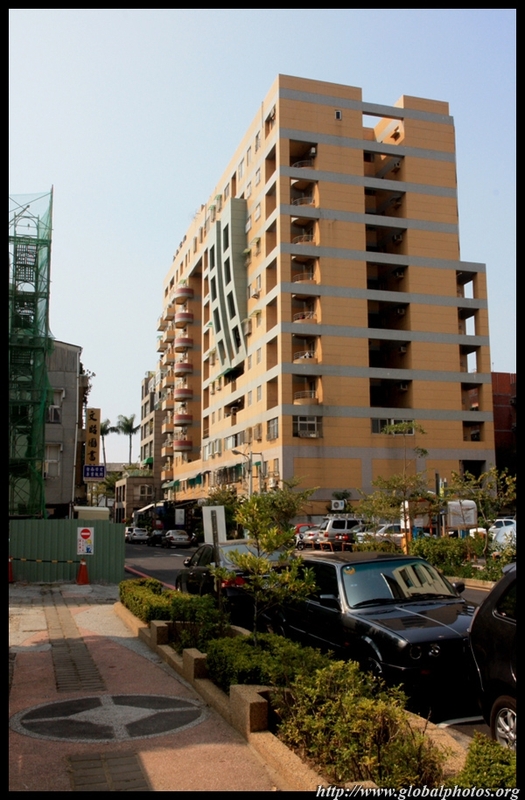 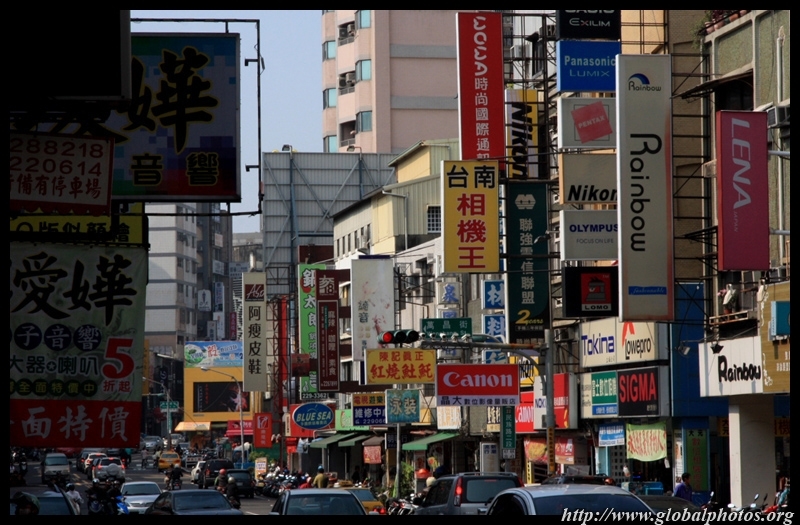 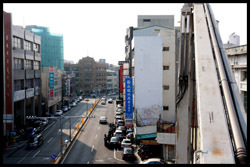 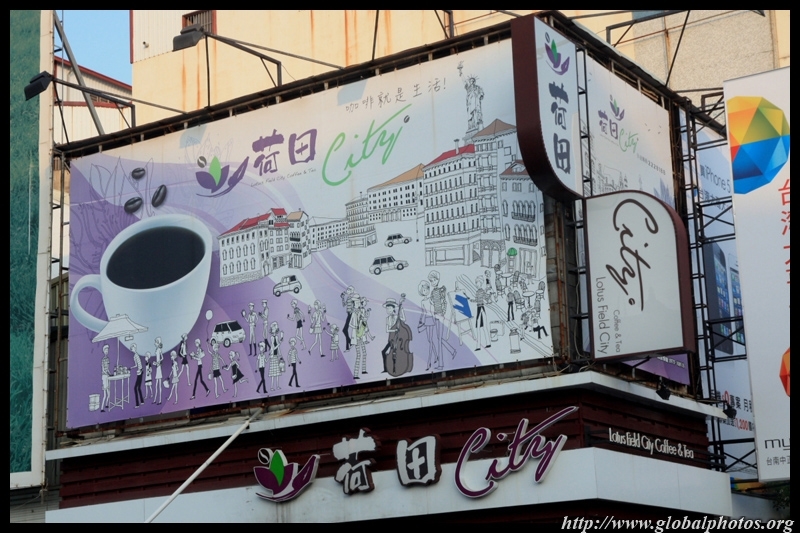 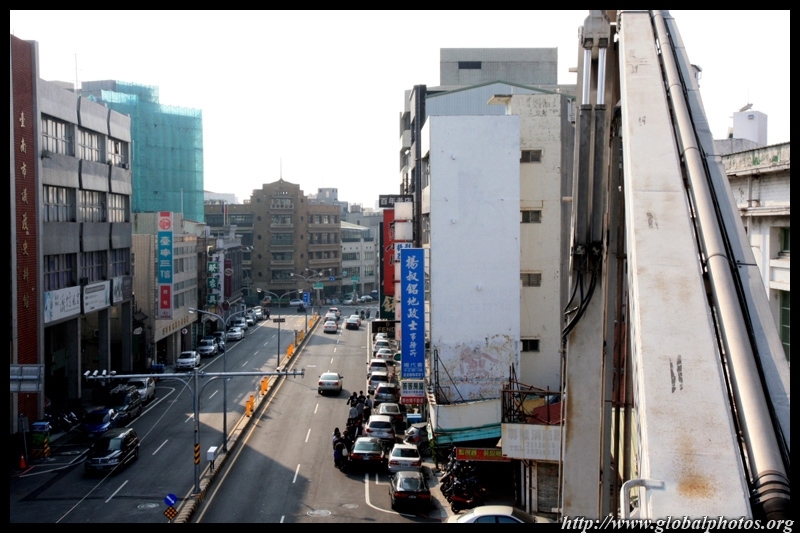 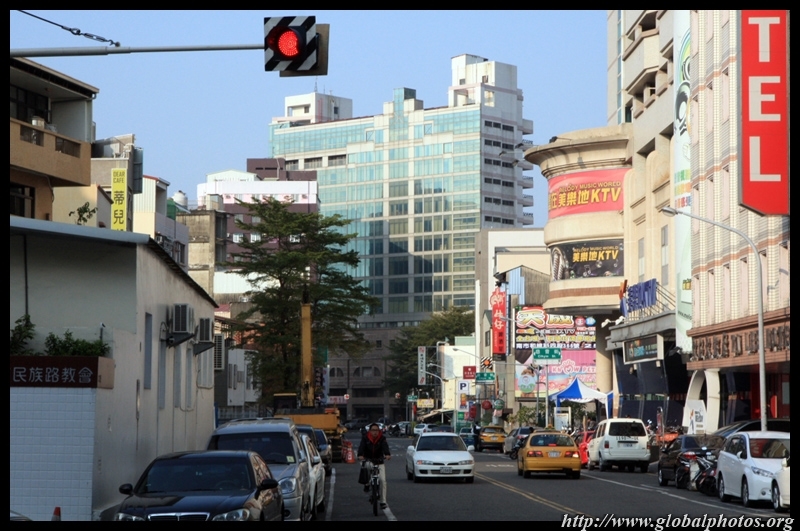 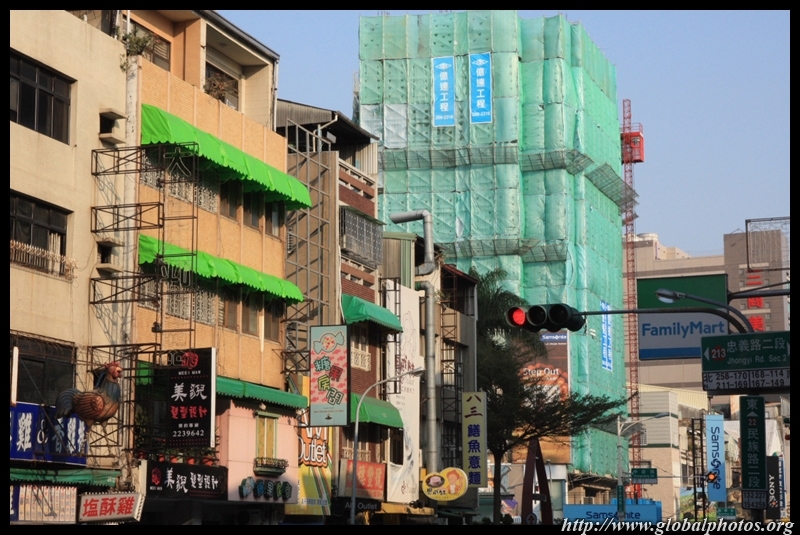 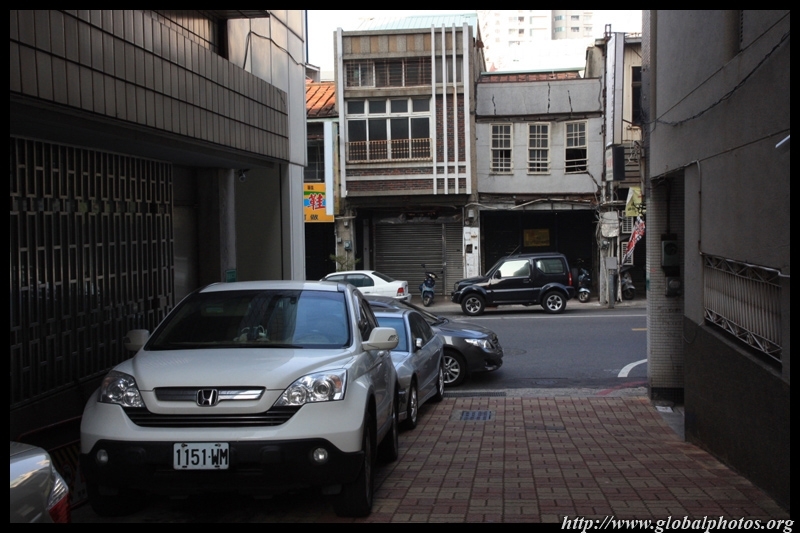 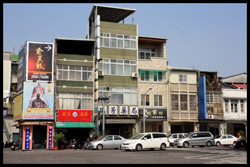 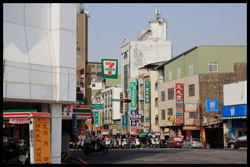 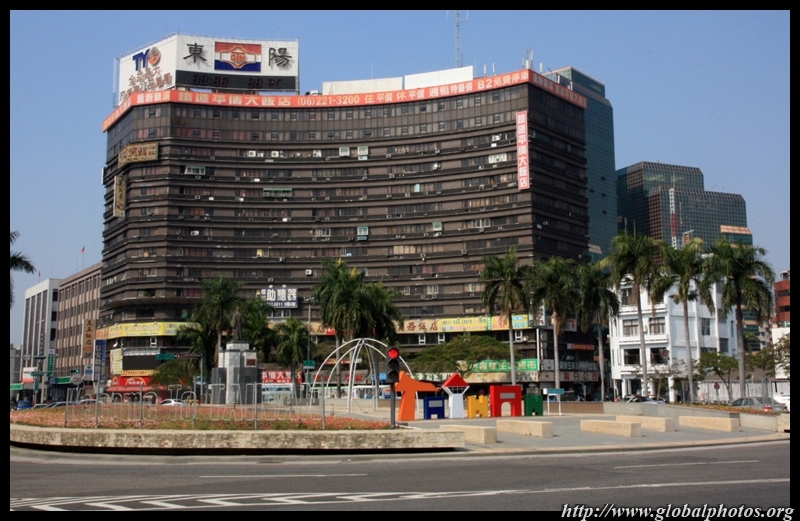 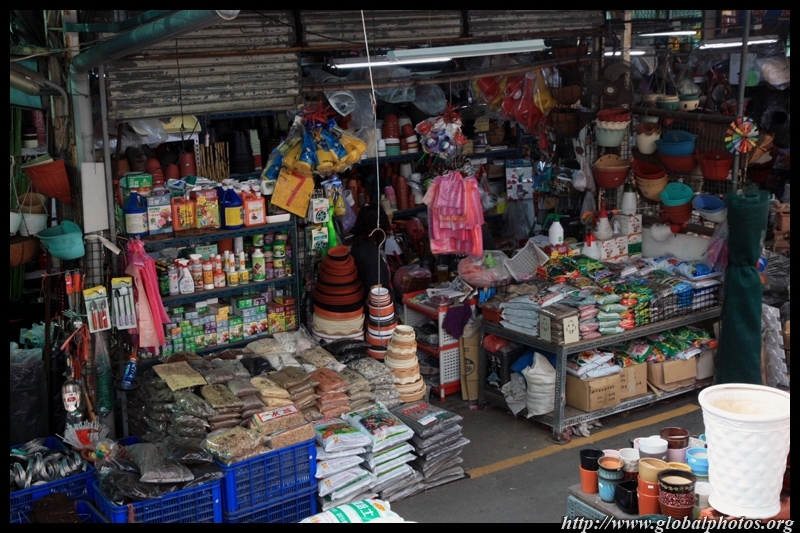 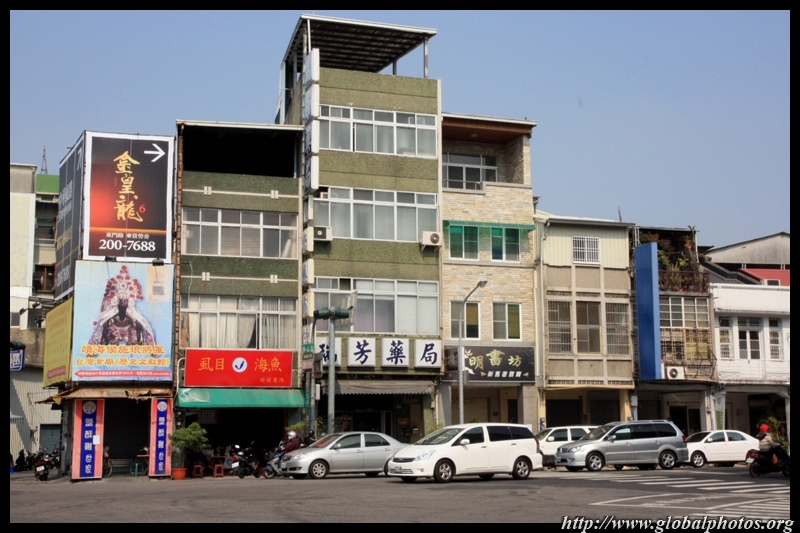 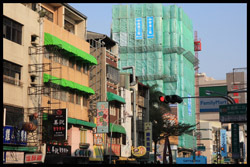 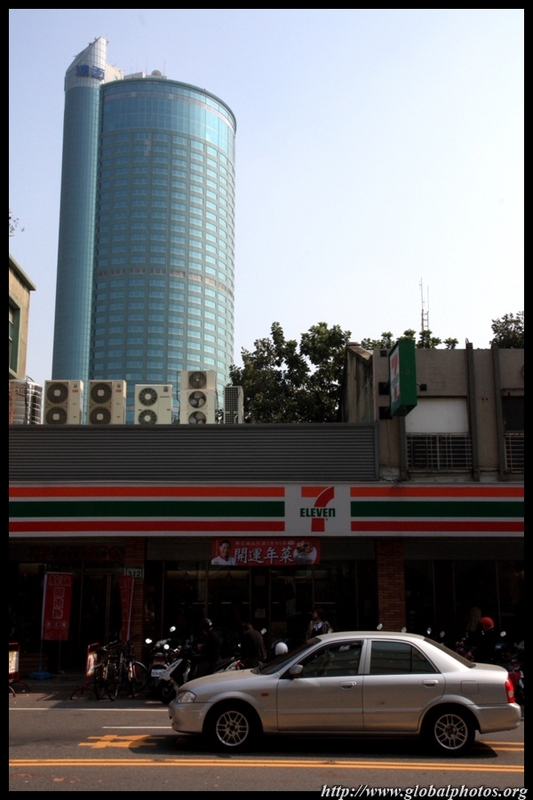 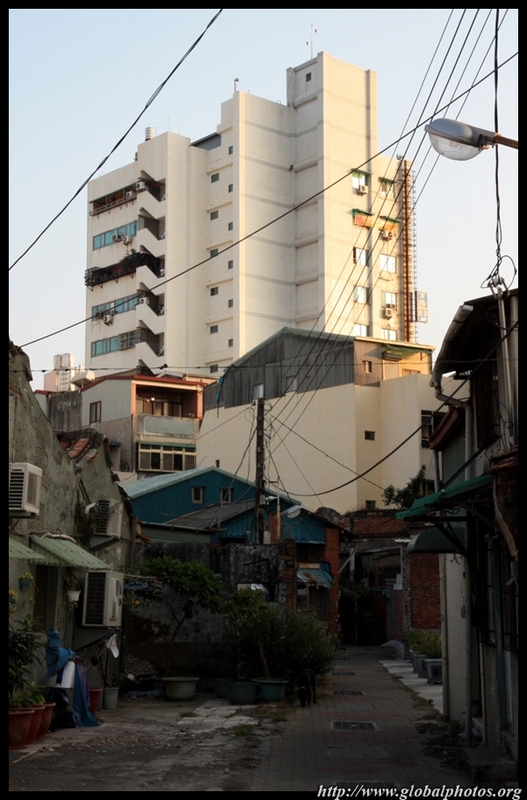 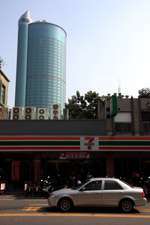 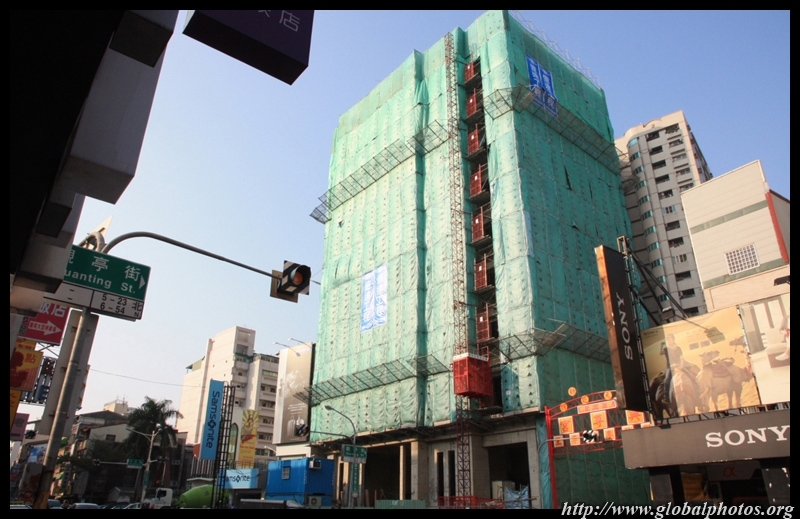 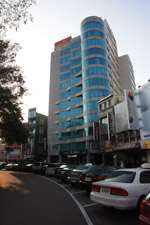 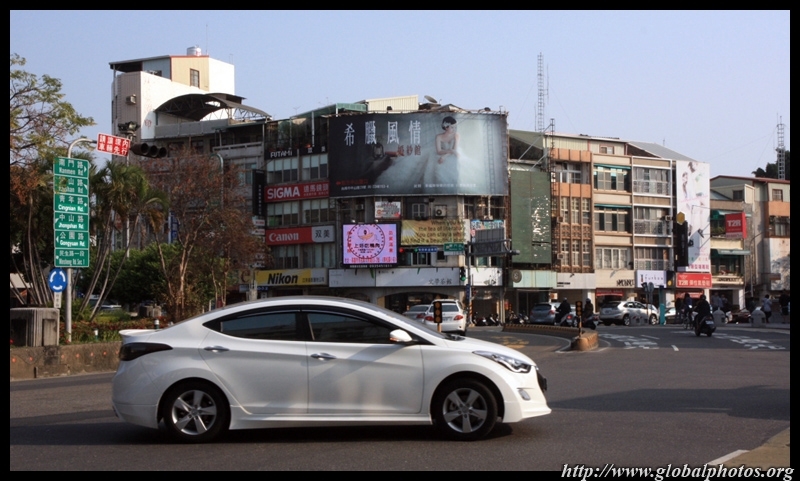 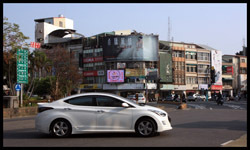 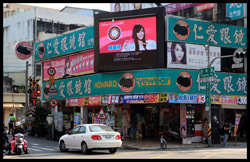 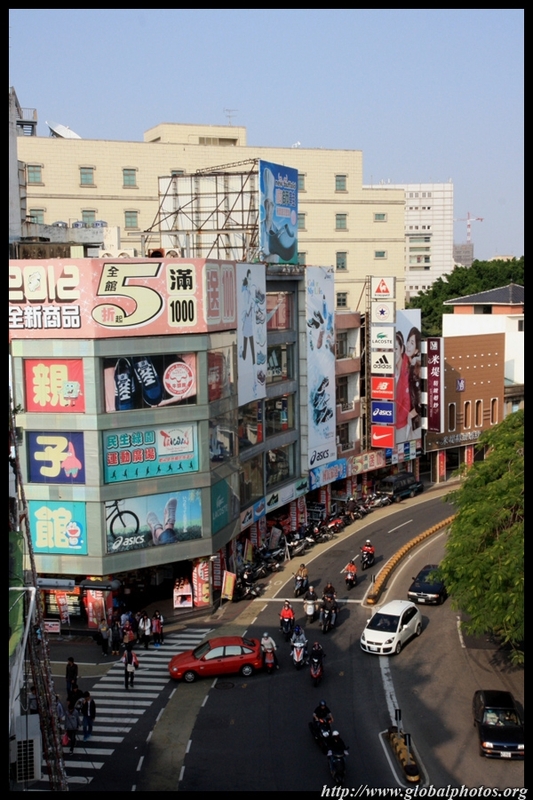 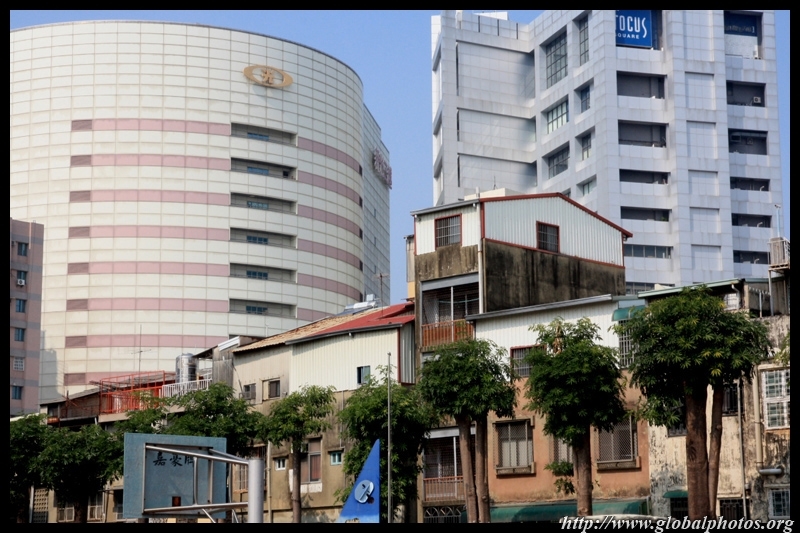 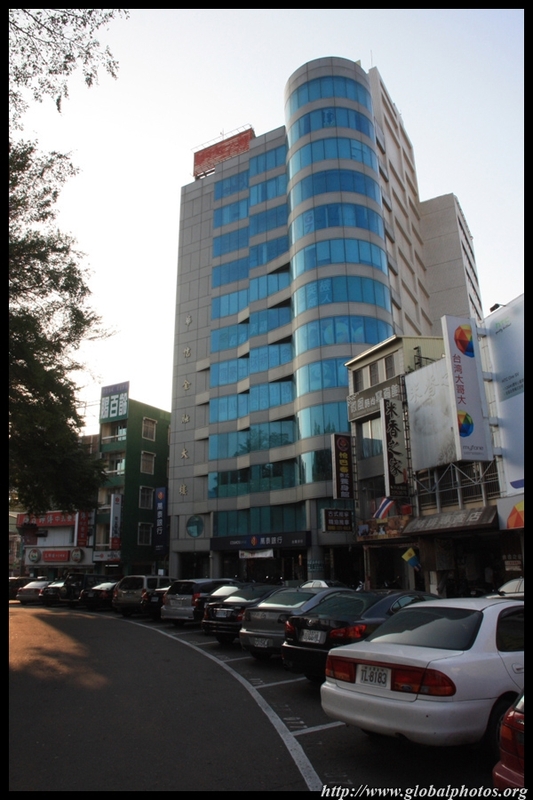 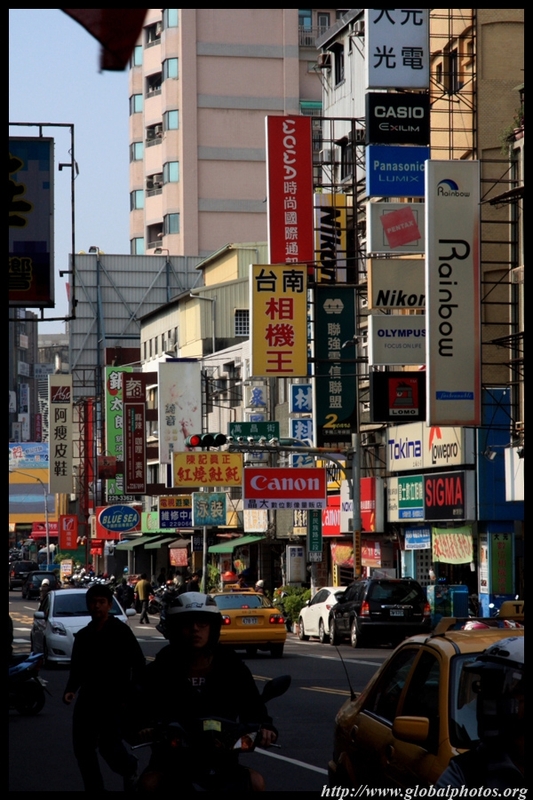 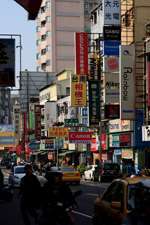 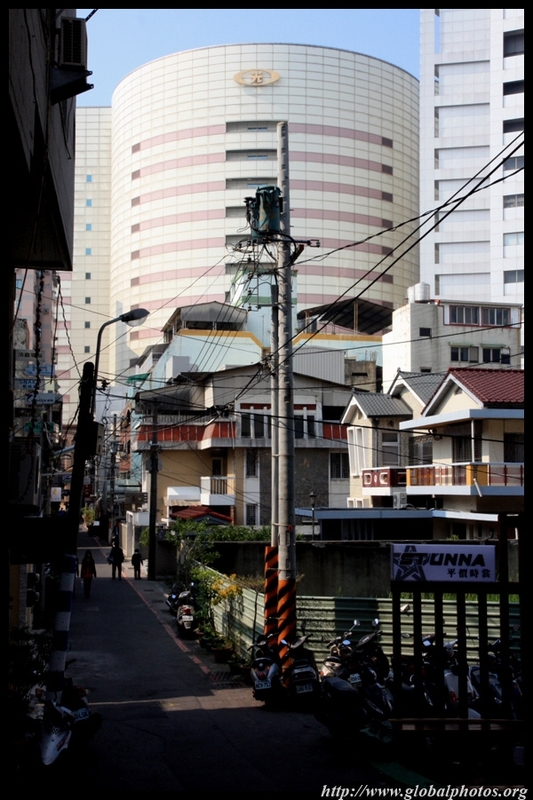 Tainan's city centre does not have many tall buildings, but lots of street-level retail. 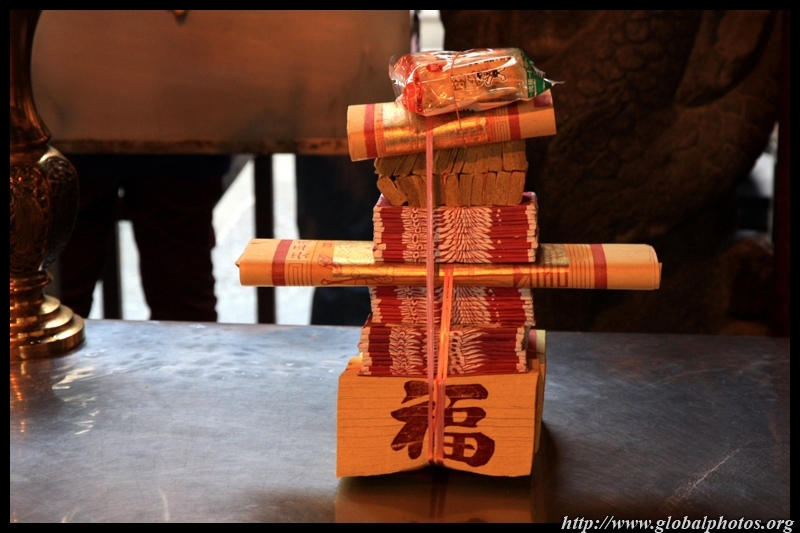 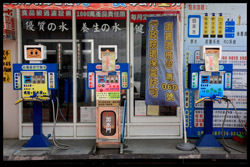 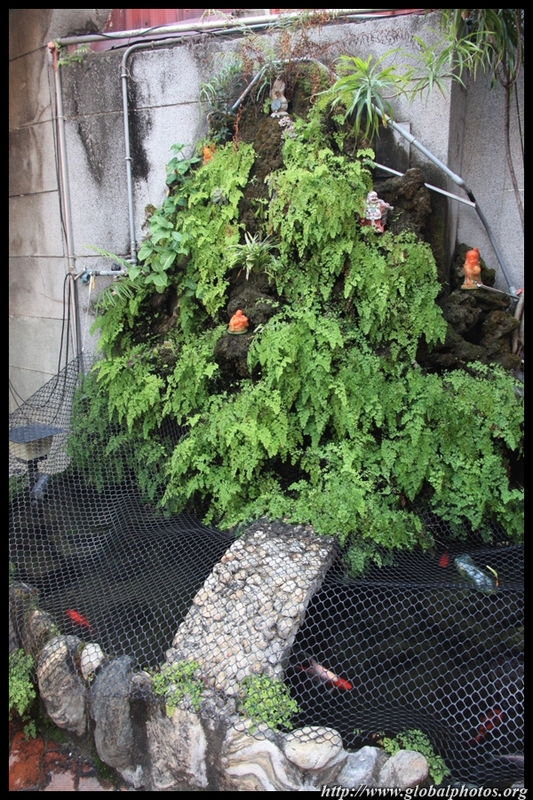 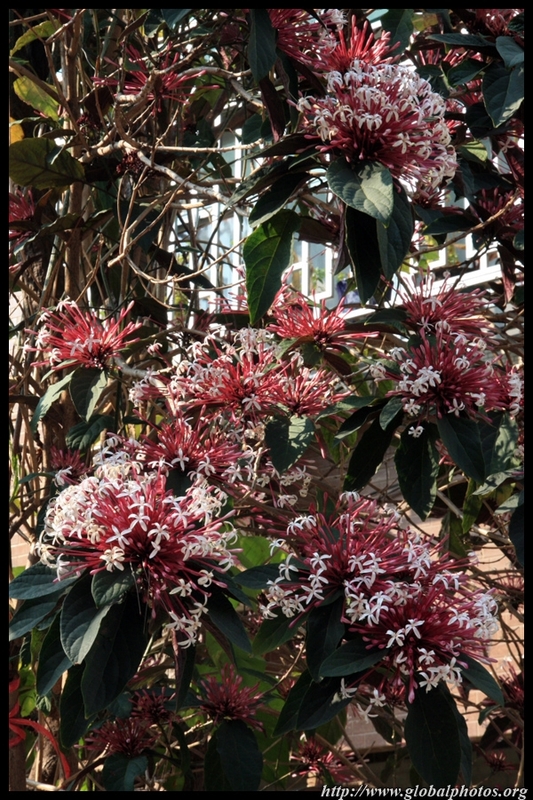 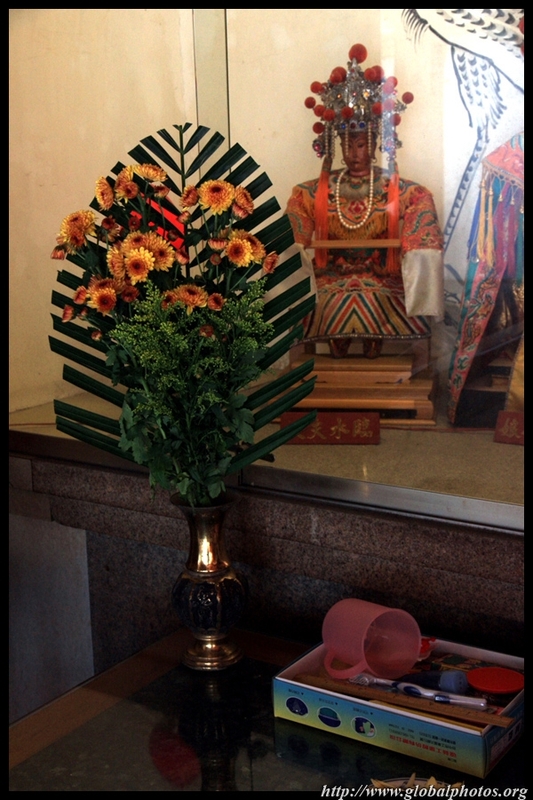 People worship at the Prefectural City God Temple to win good favours as they will be judged upon death. 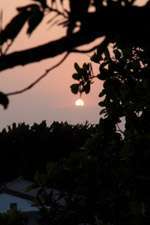 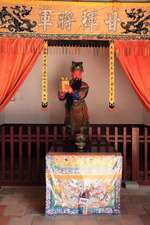 Those who have done evil deeds will be punished in the after-life. 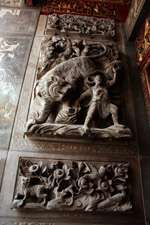 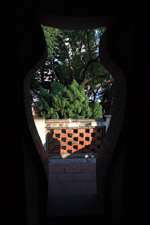 As the temple relates to life in the after-life, it is best not to visit at night! 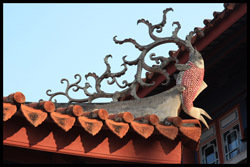 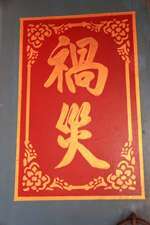 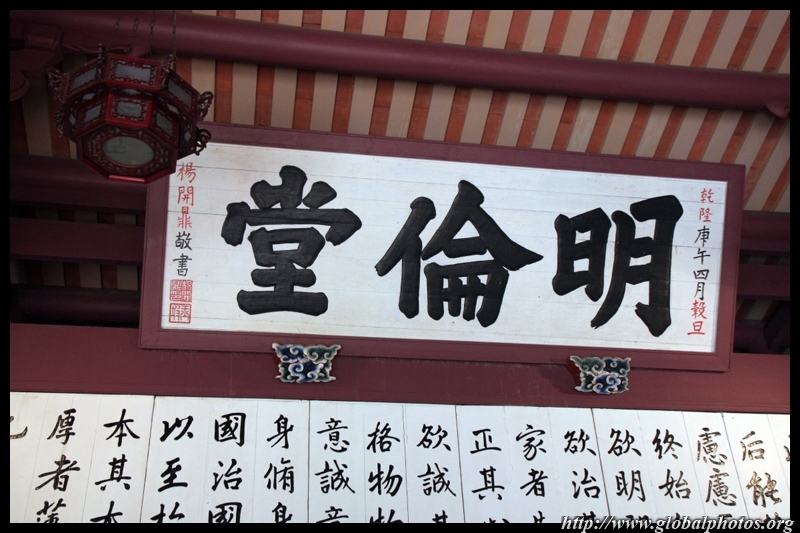 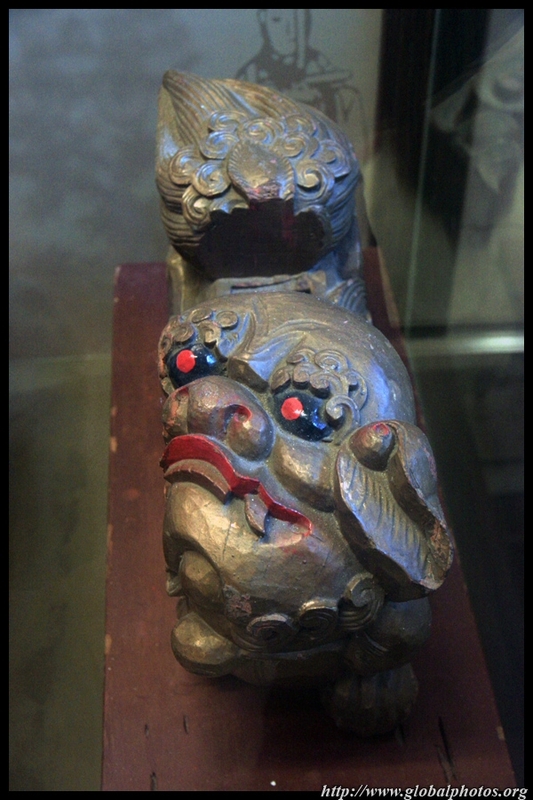 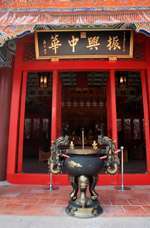 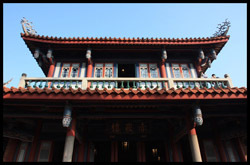 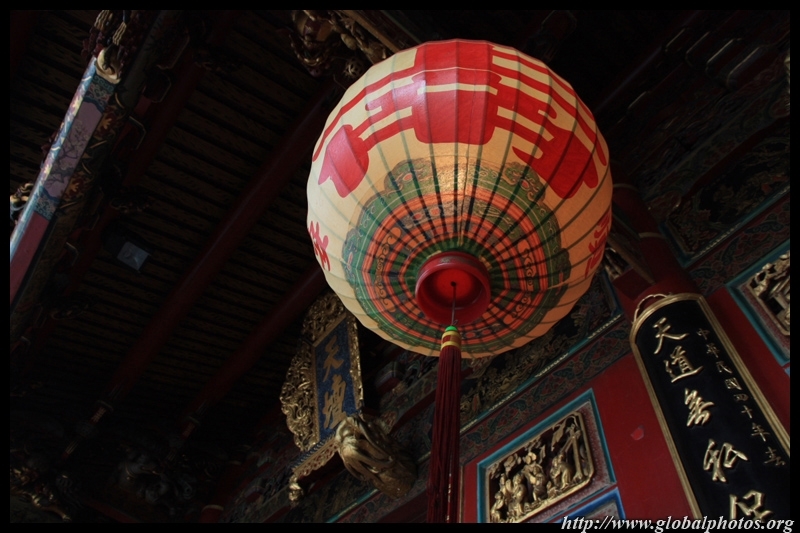 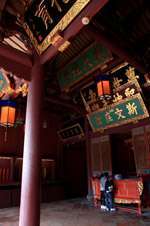 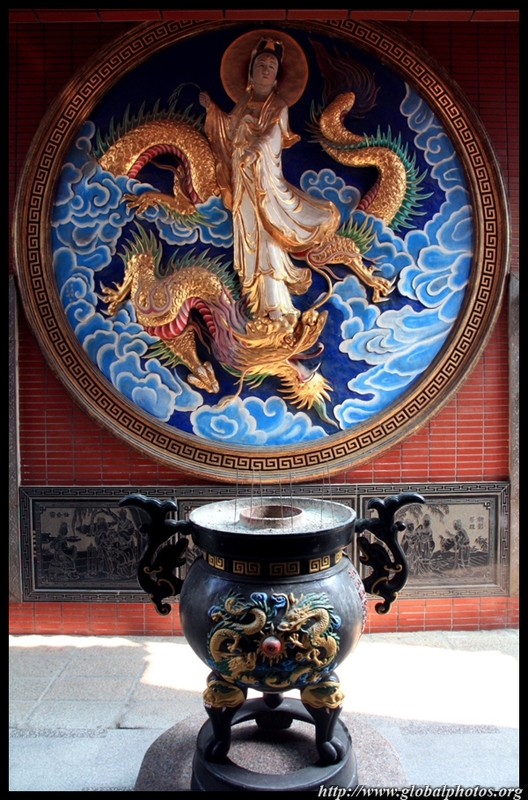 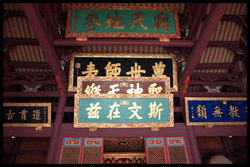 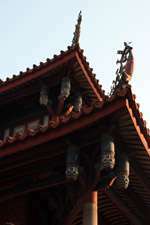 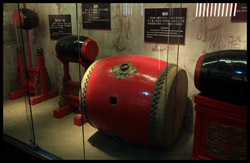 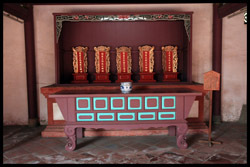 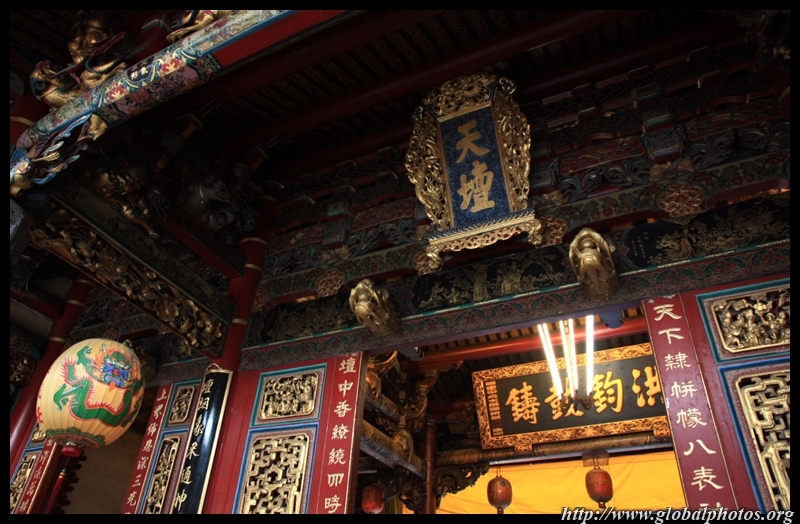 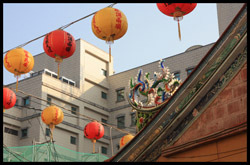 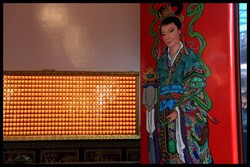 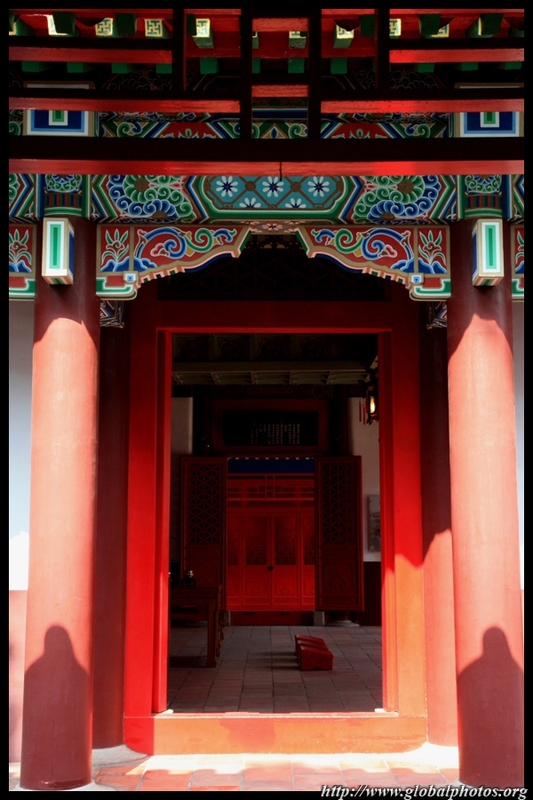 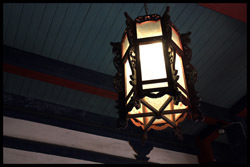 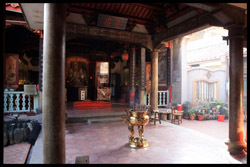 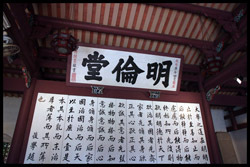 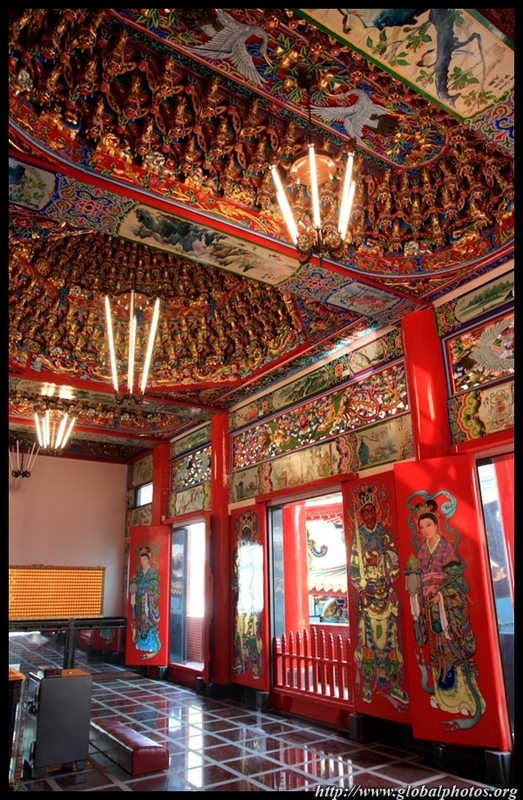 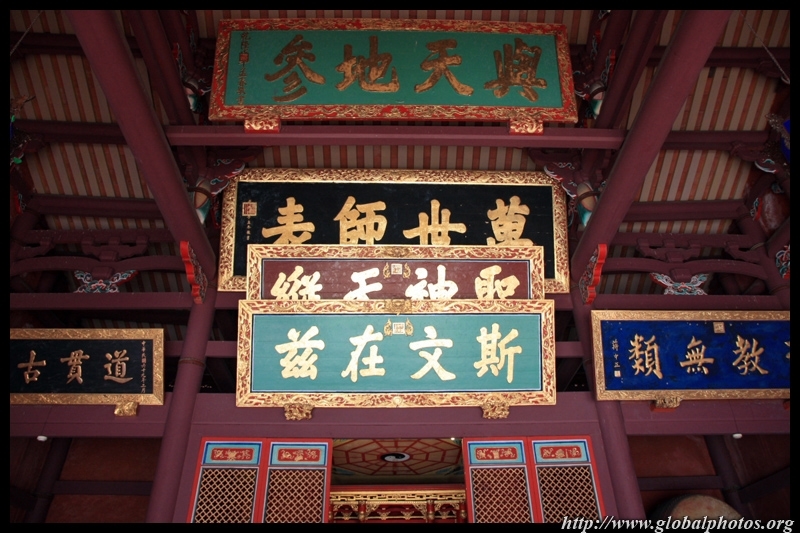 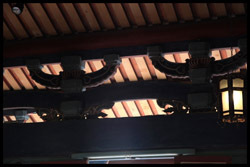 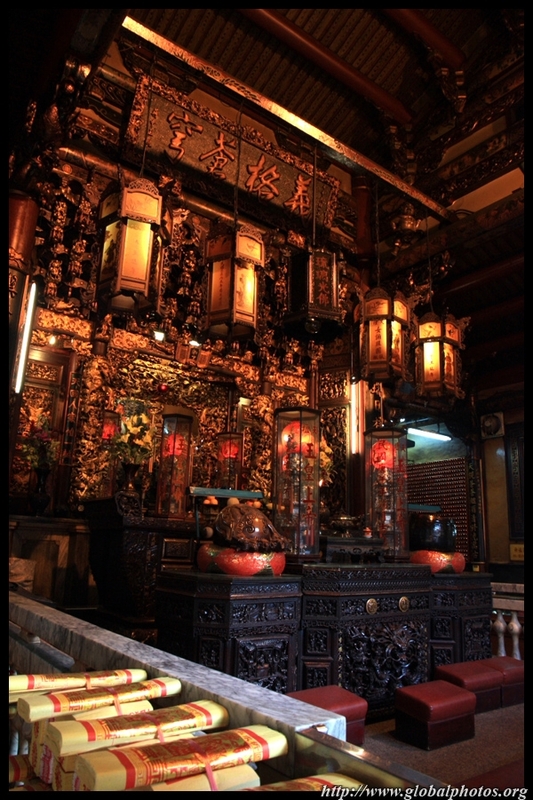 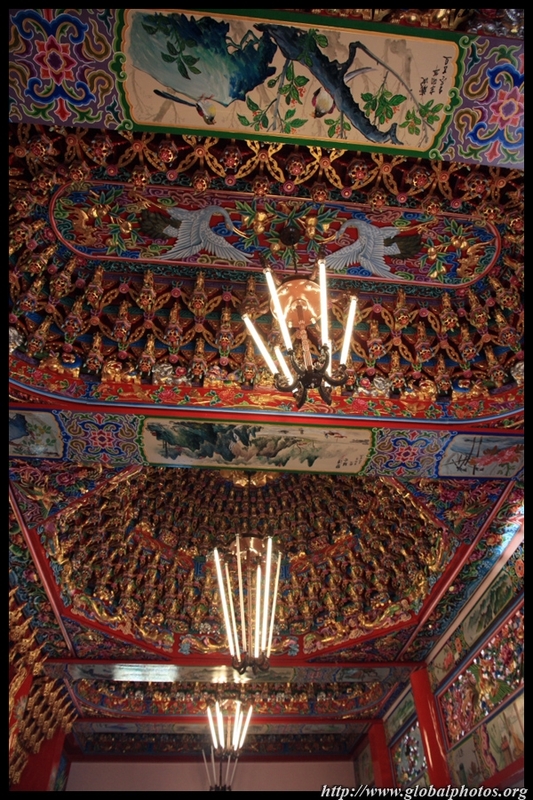 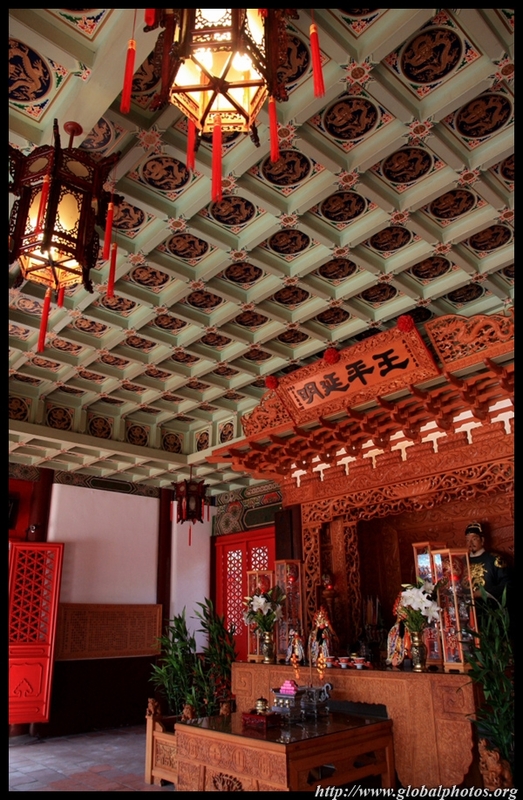 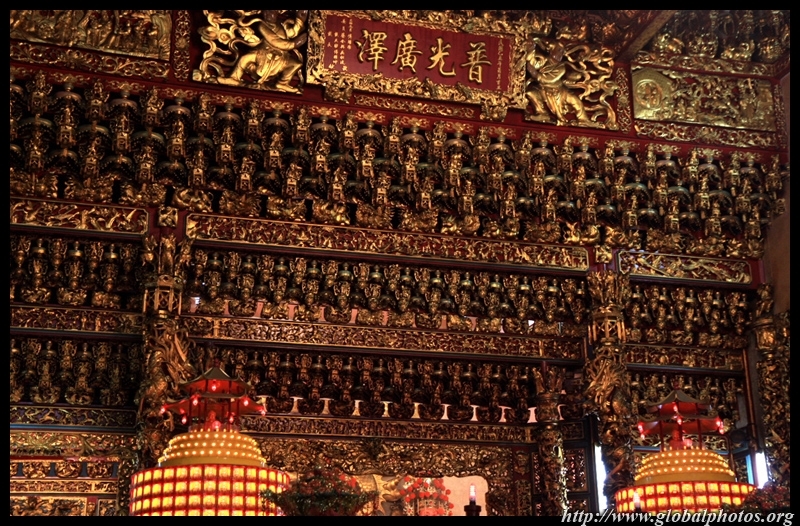 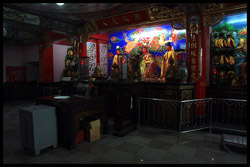 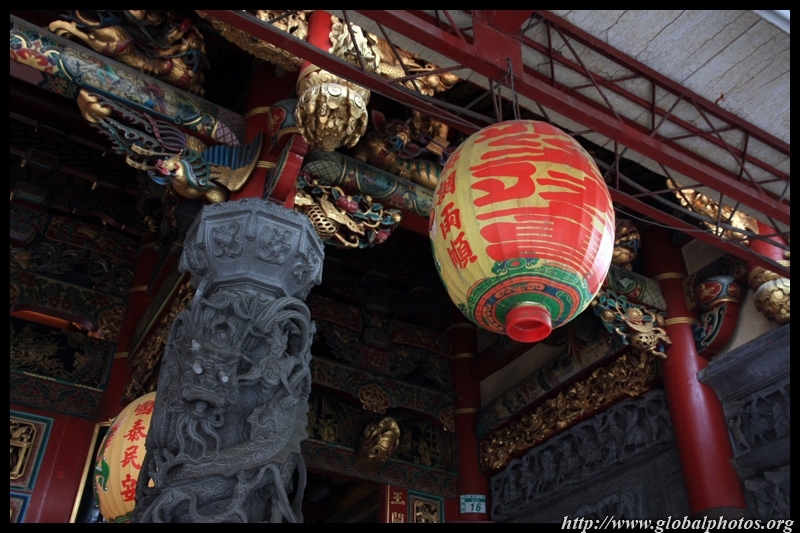 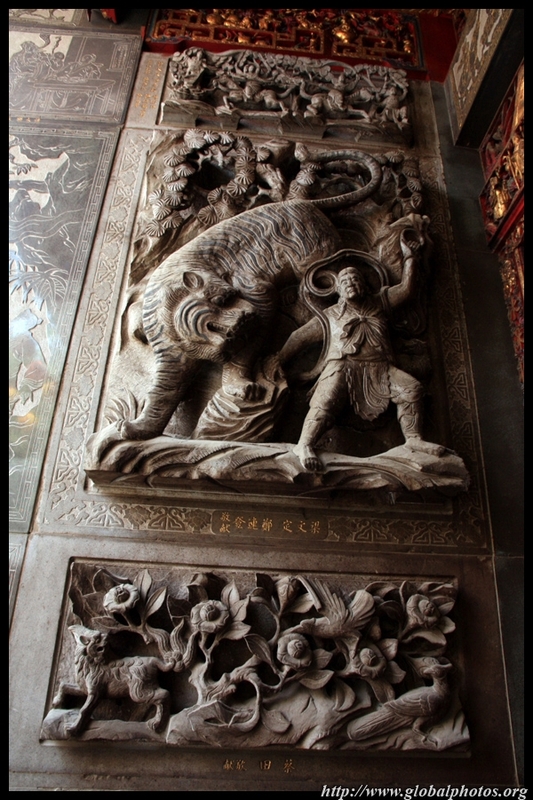 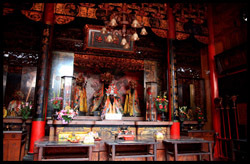 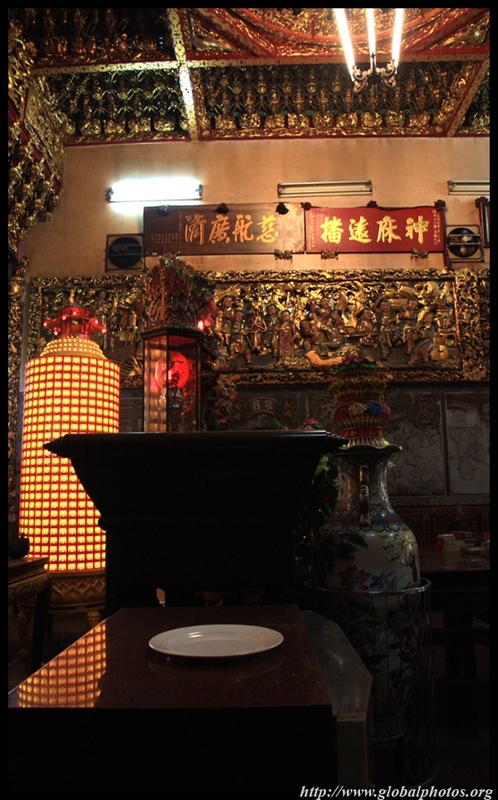 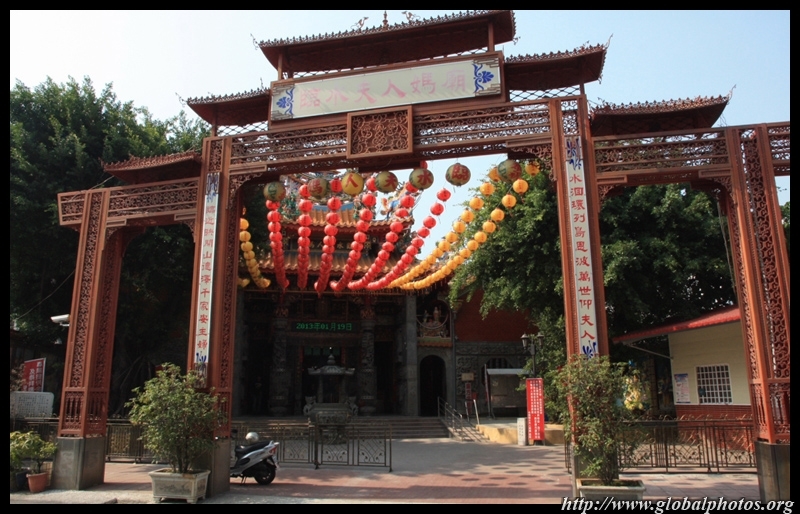 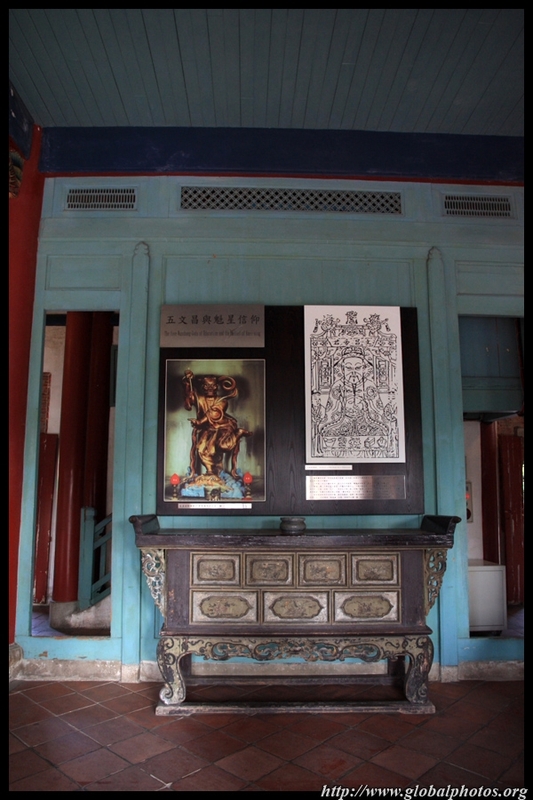 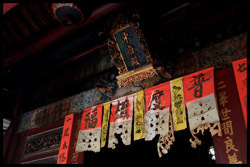 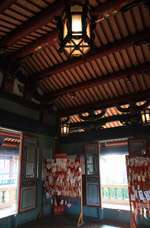 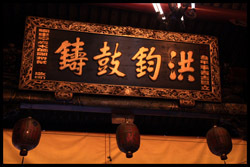 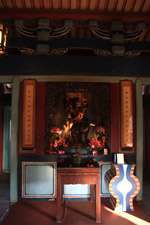 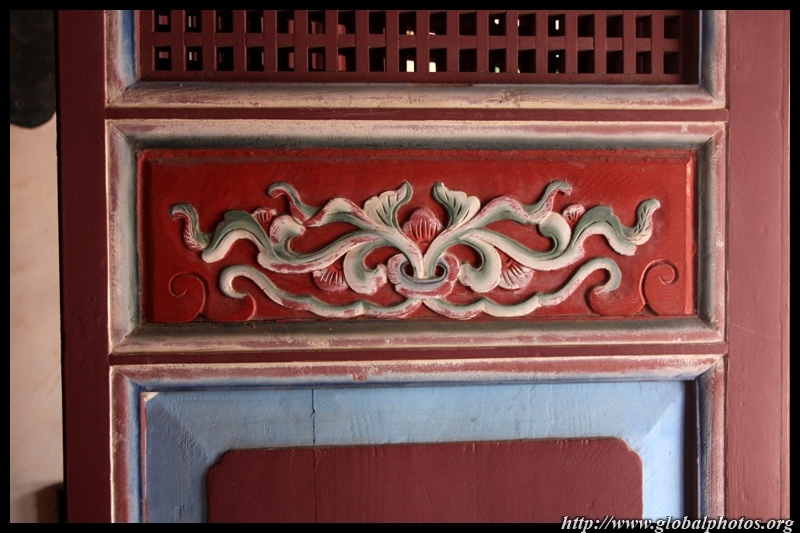 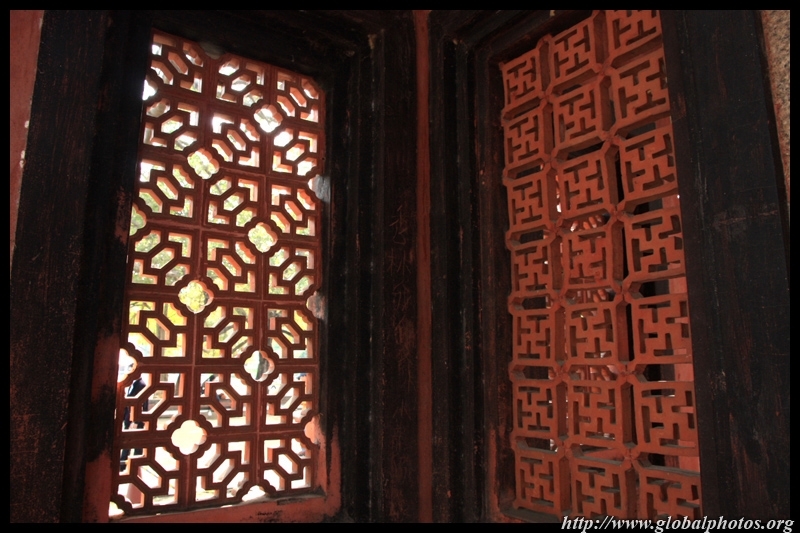 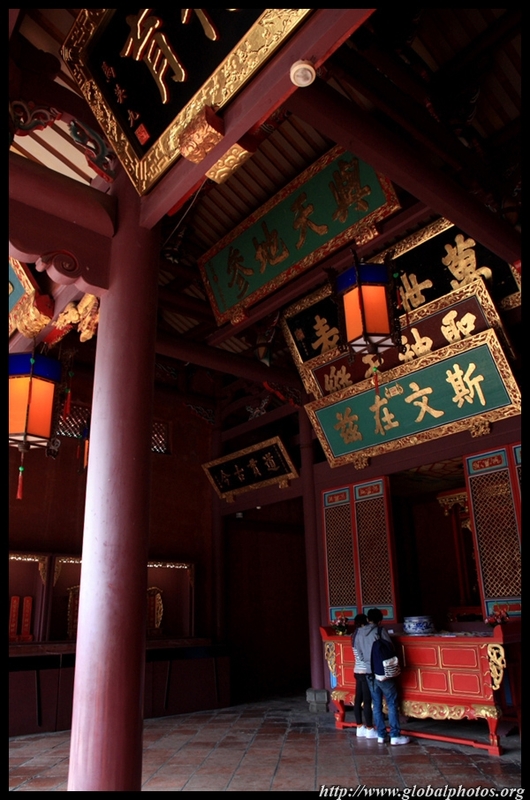 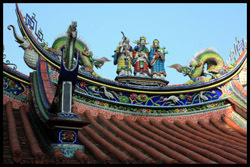 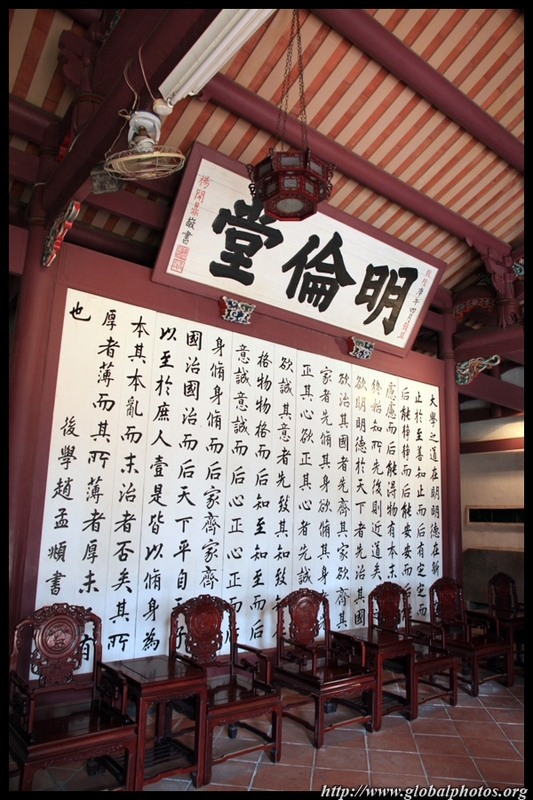 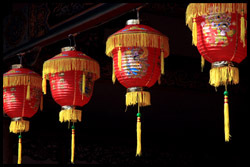 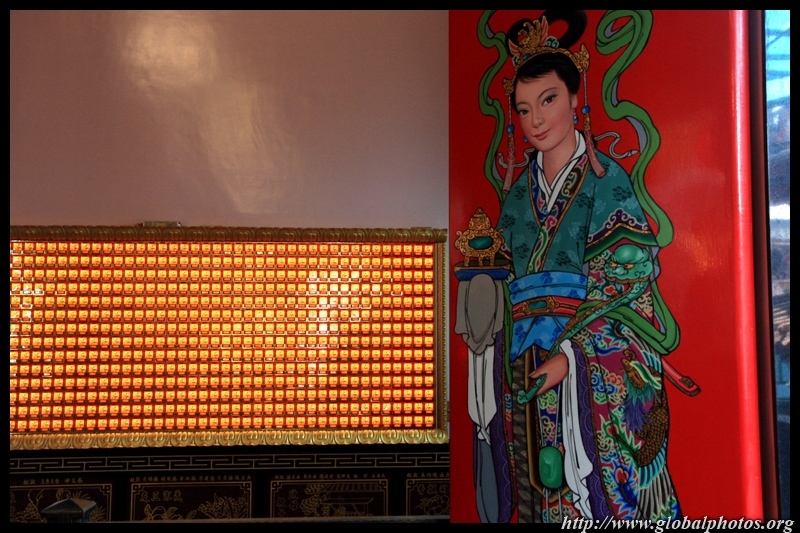 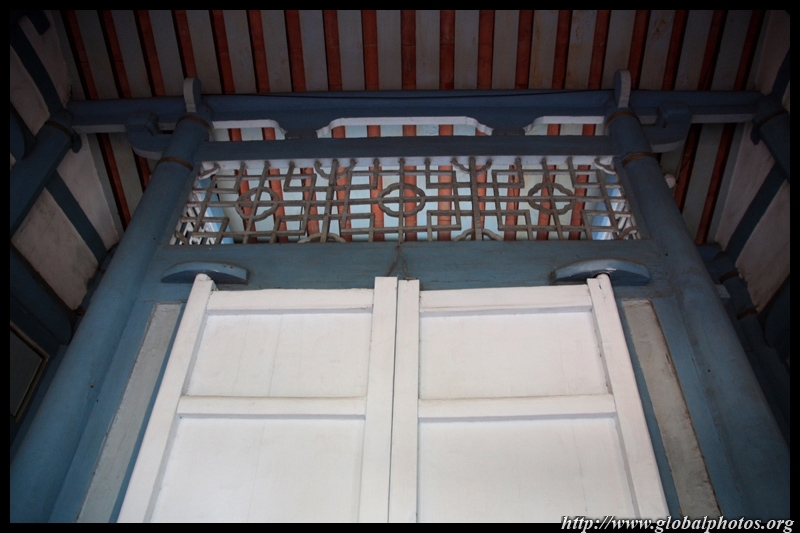 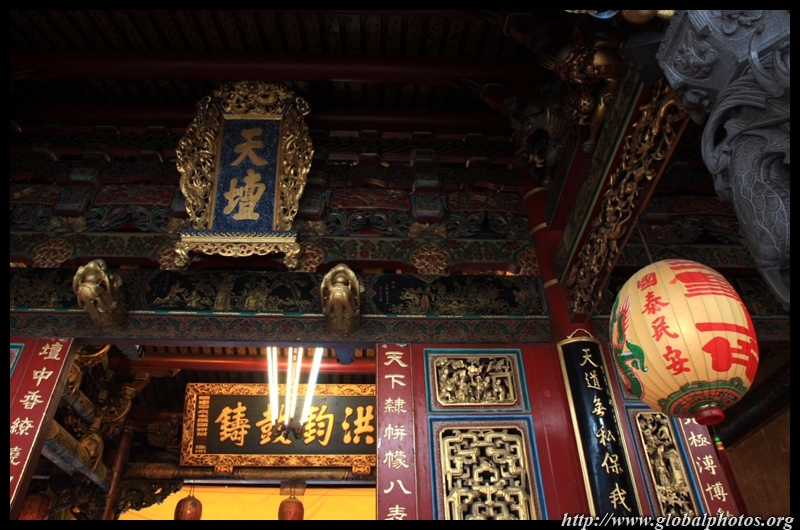 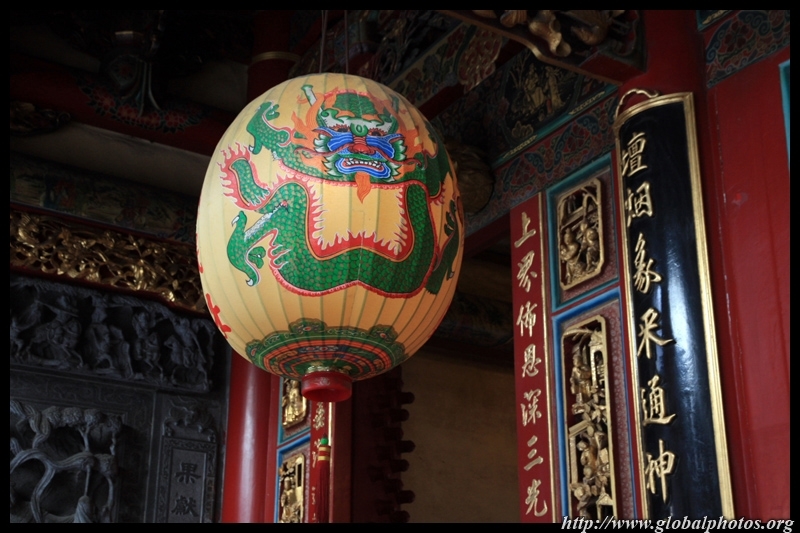 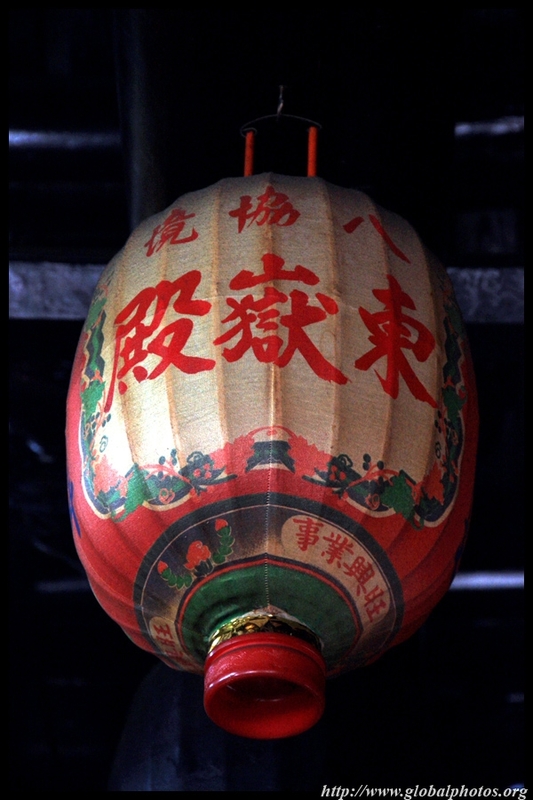 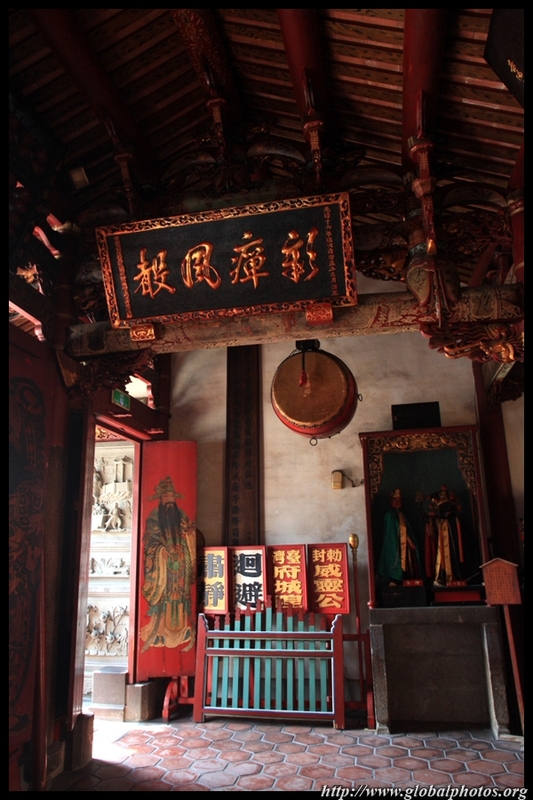 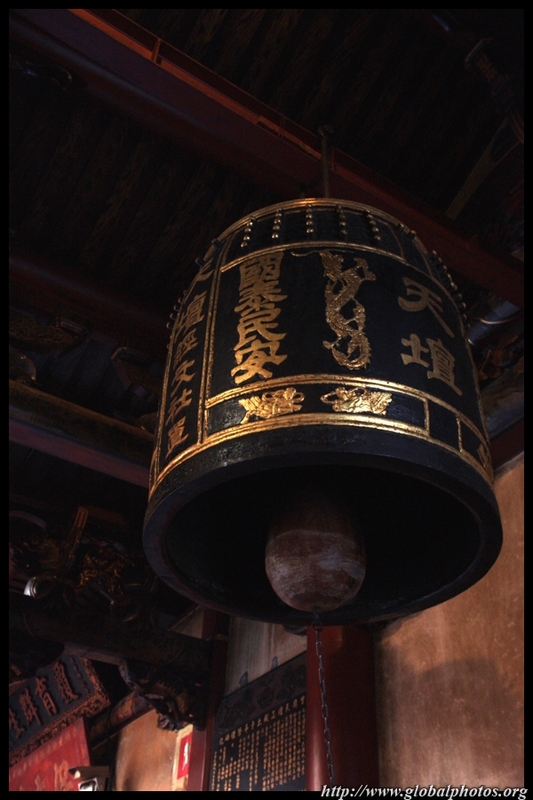 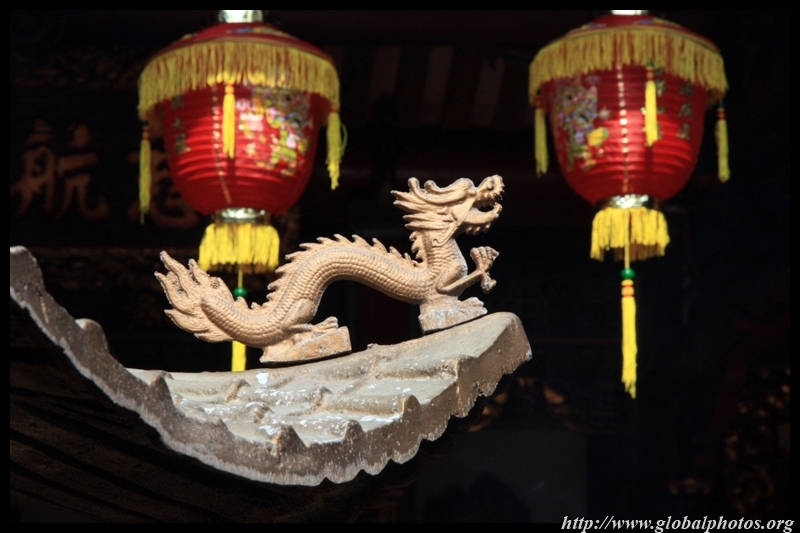 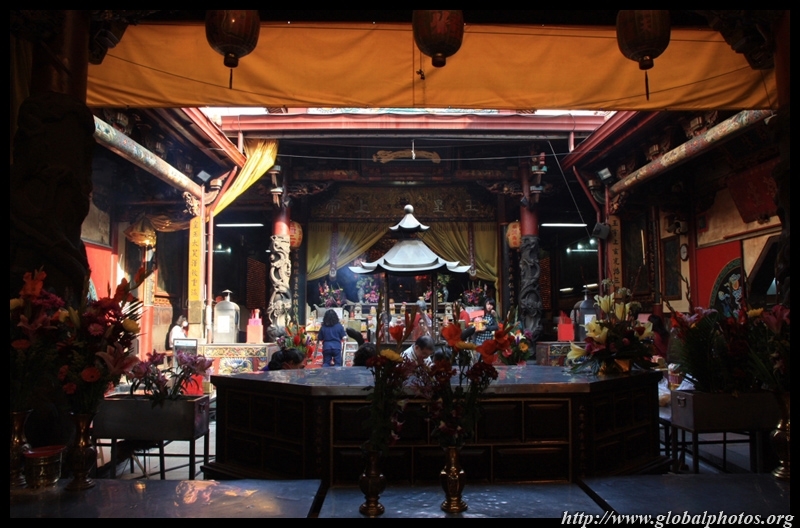 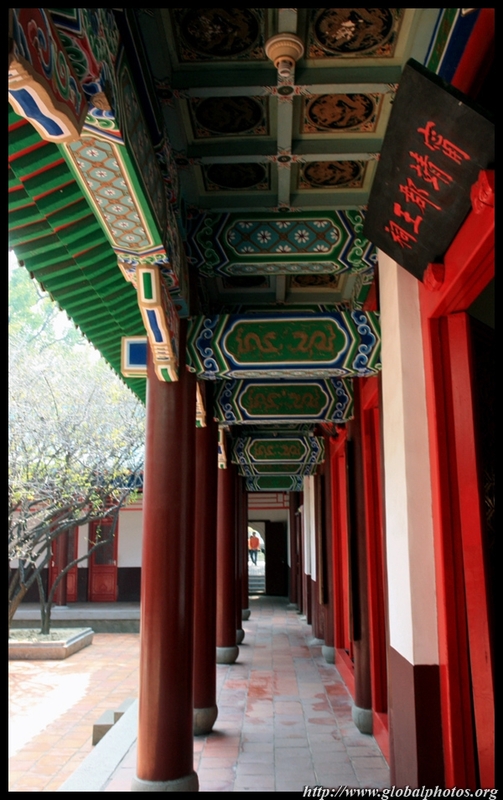 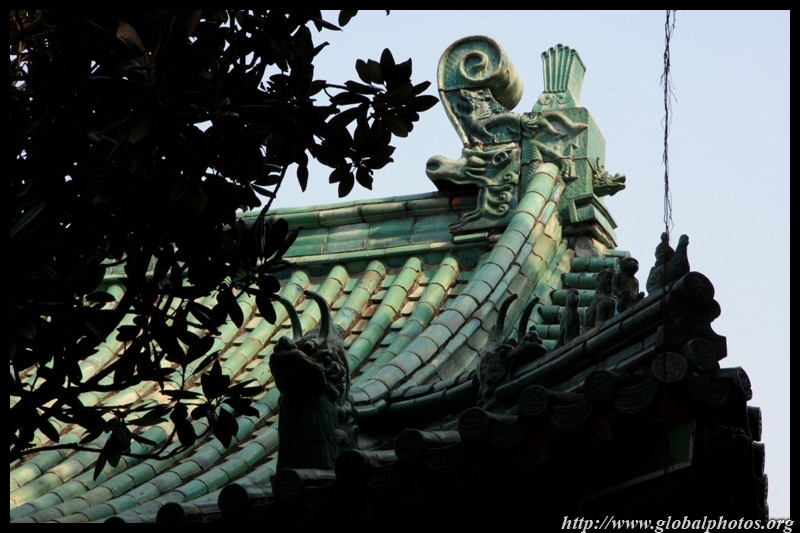 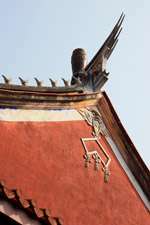 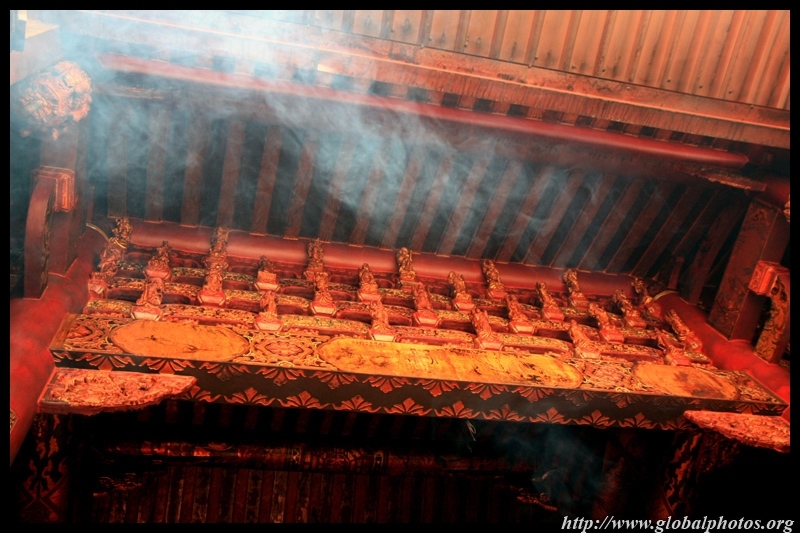 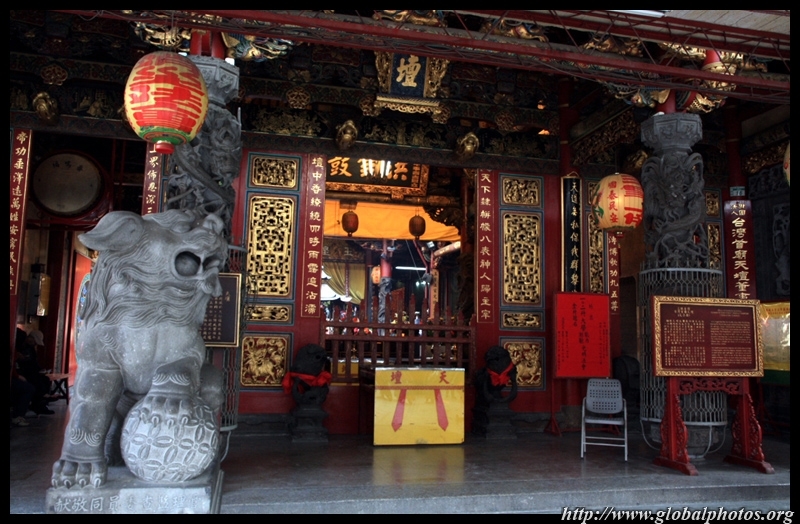 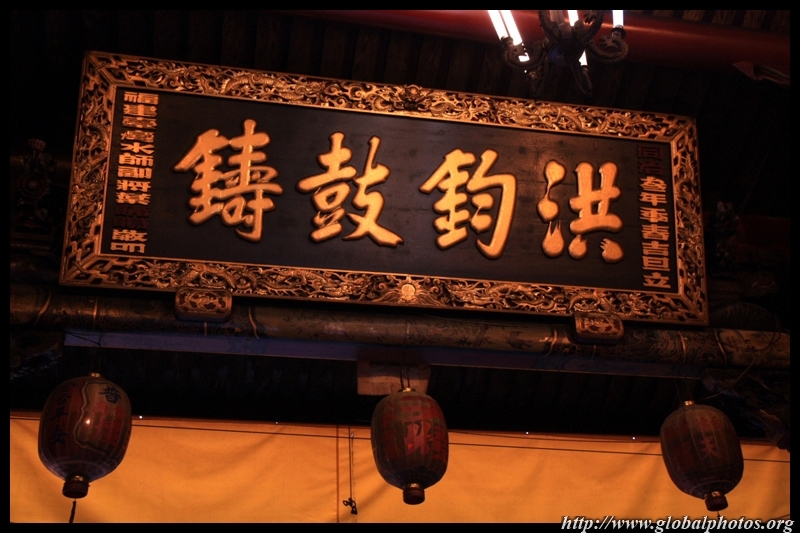 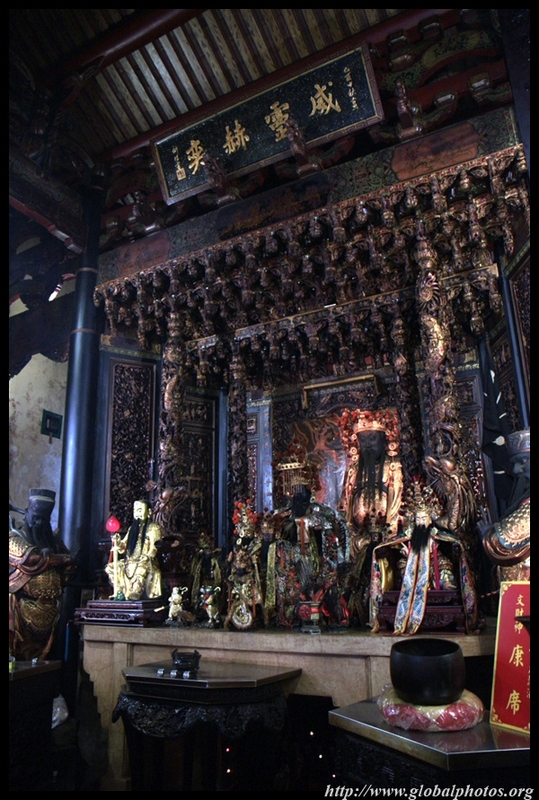 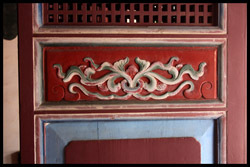 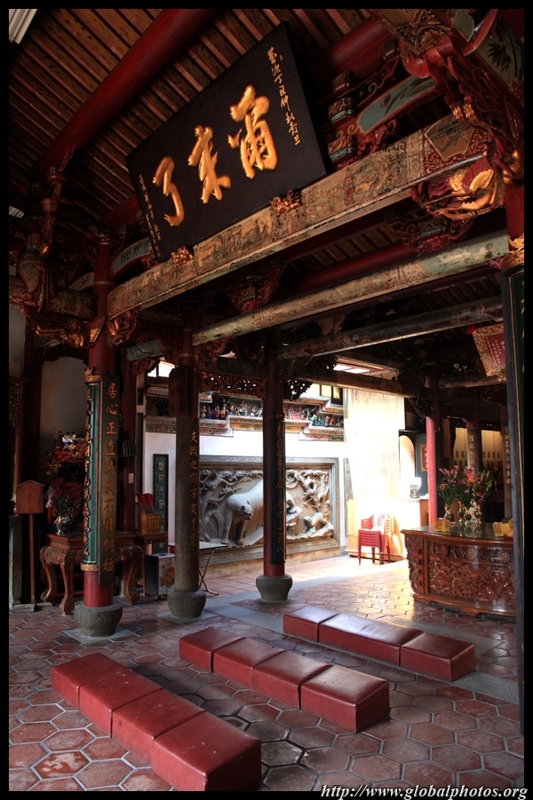 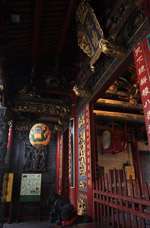 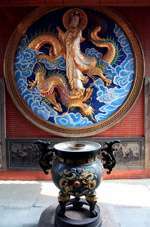 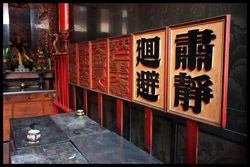 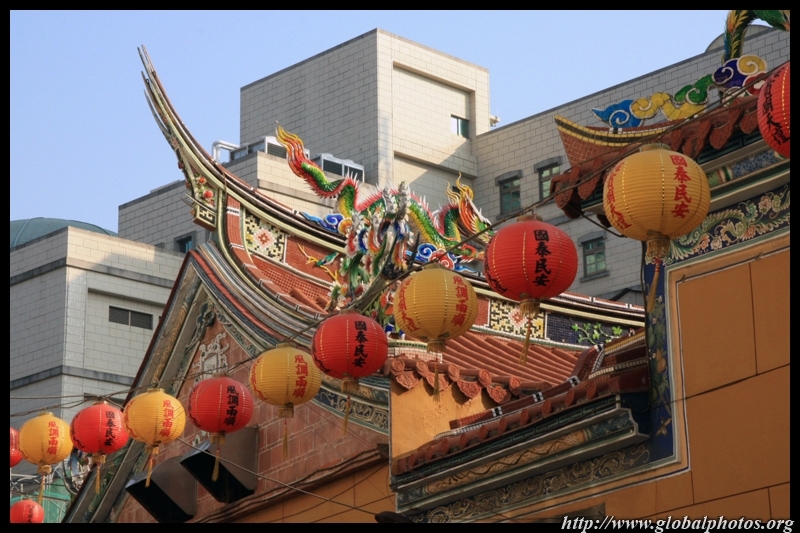 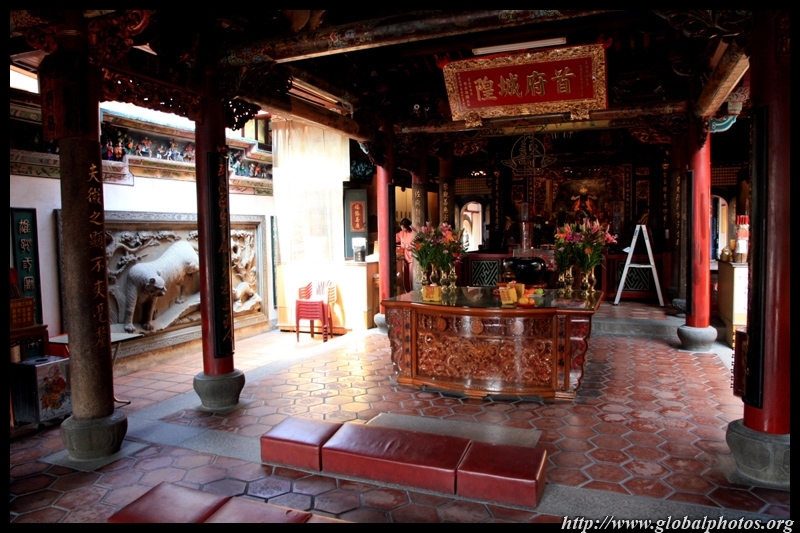 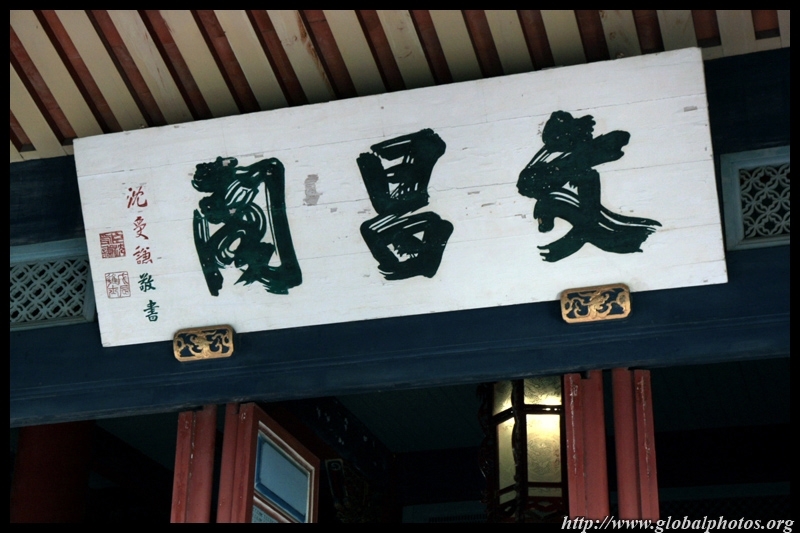 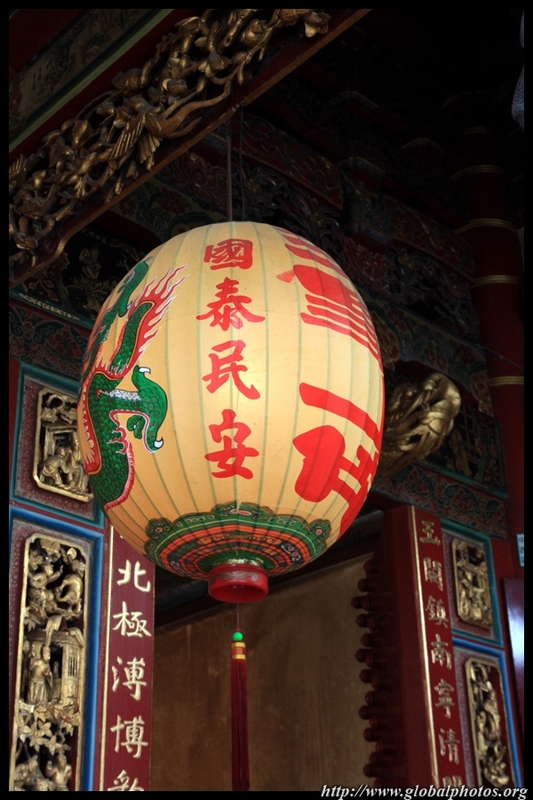 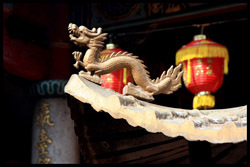 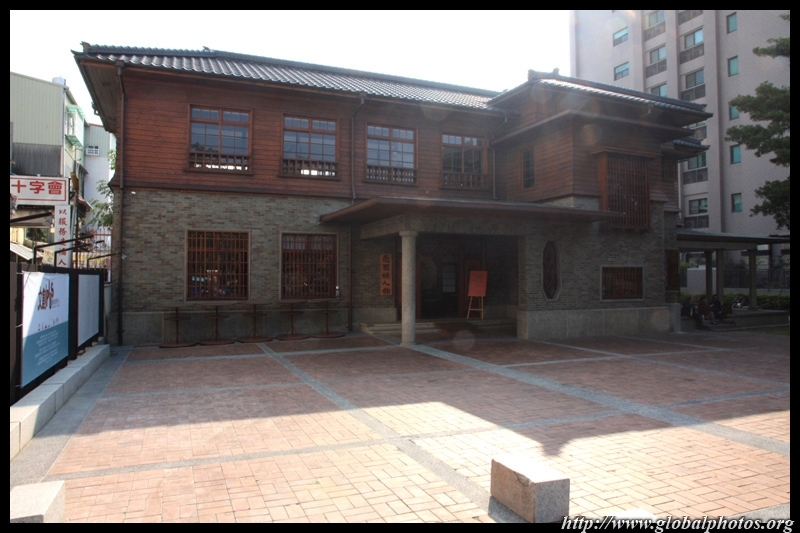 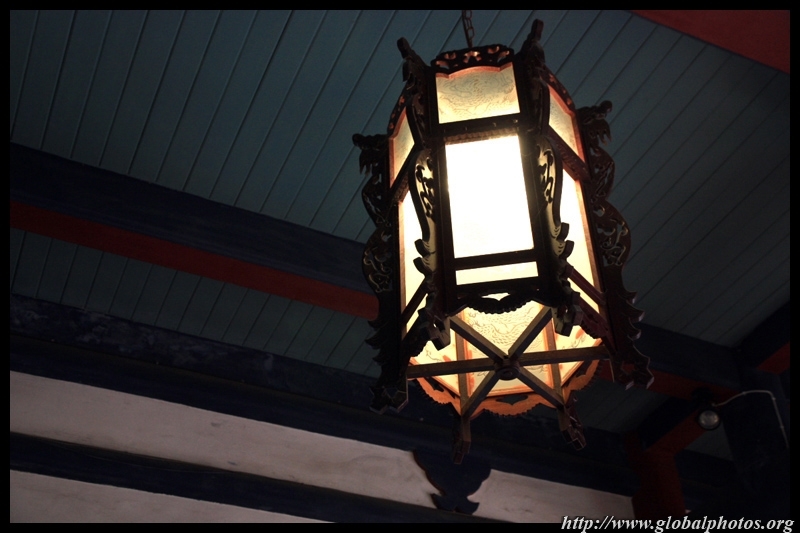 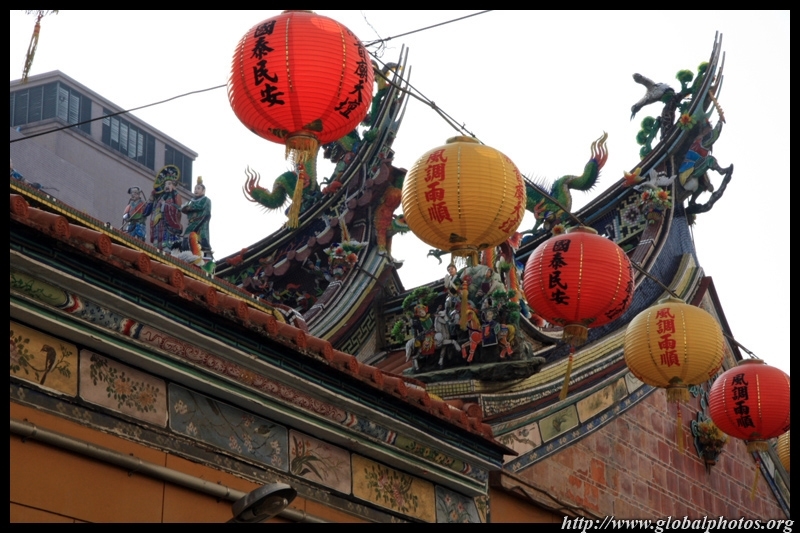 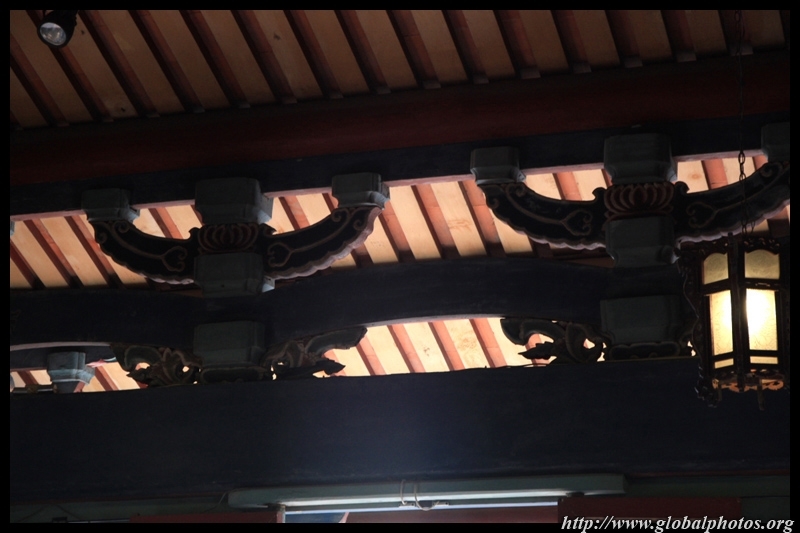 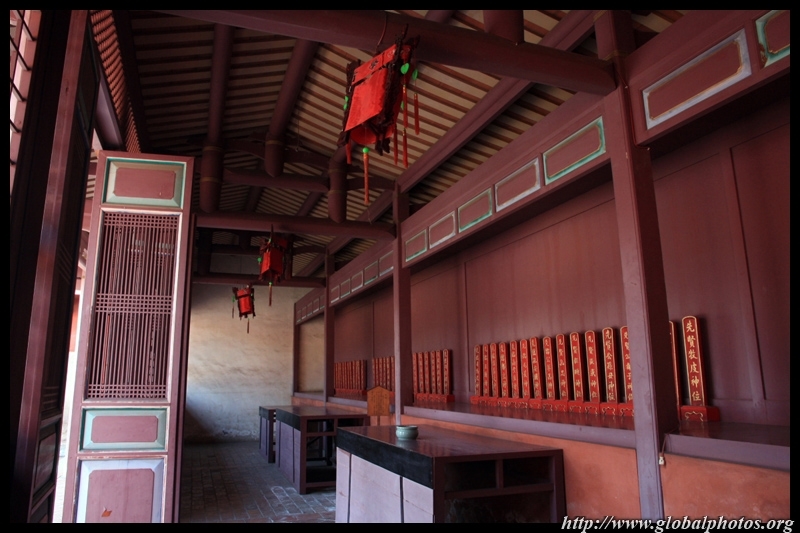 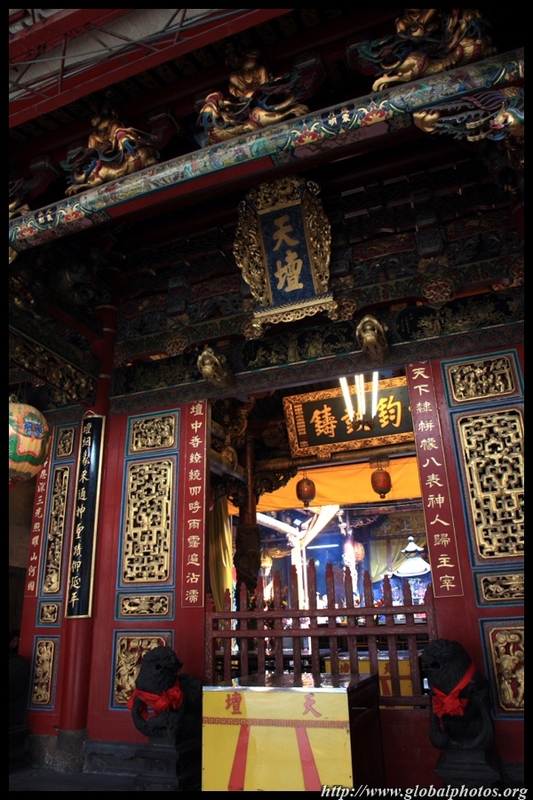 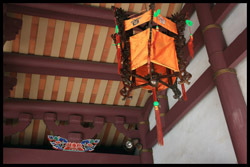 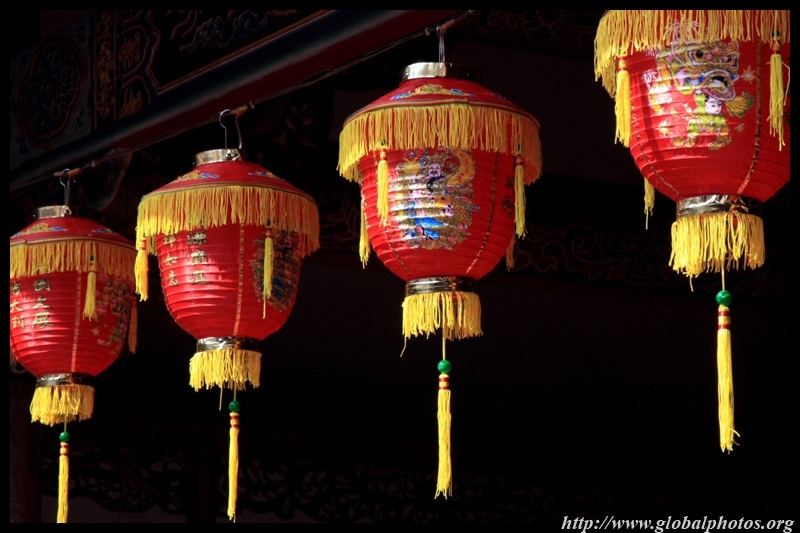 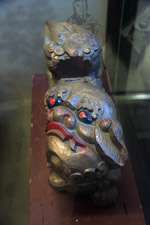 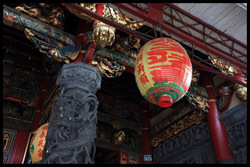 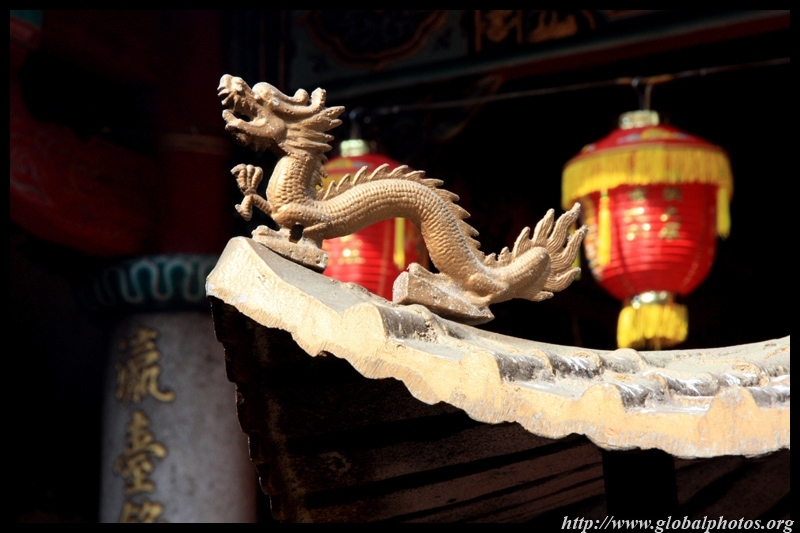 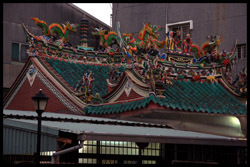 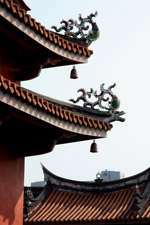 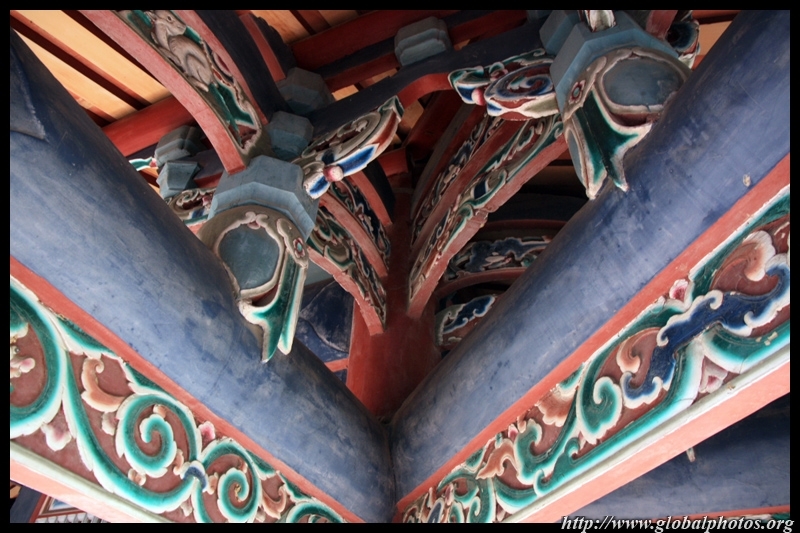 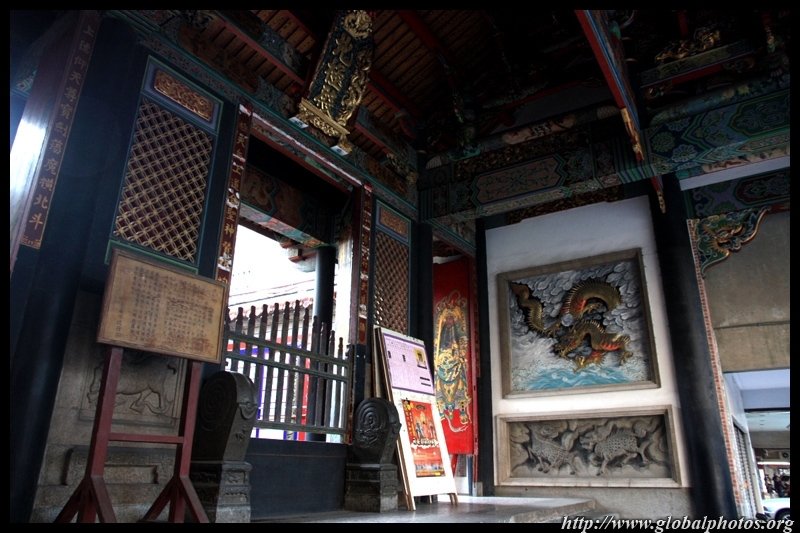 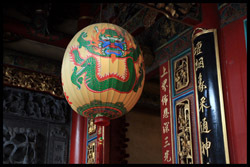 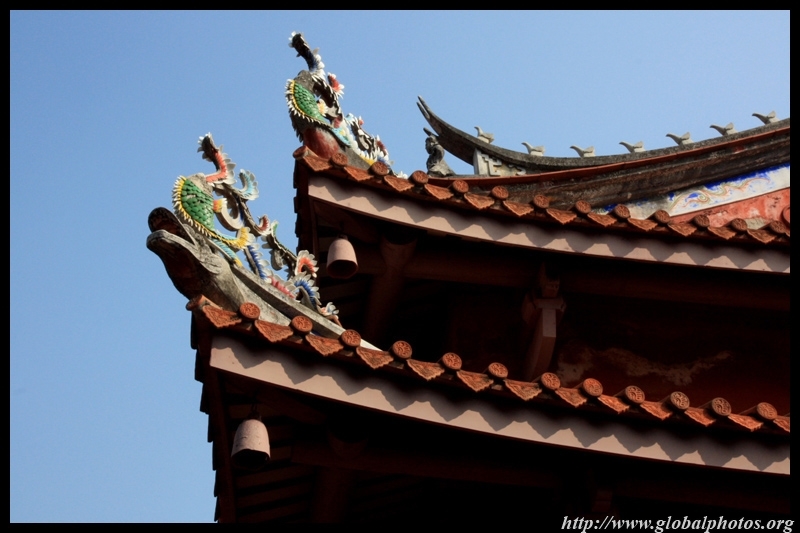 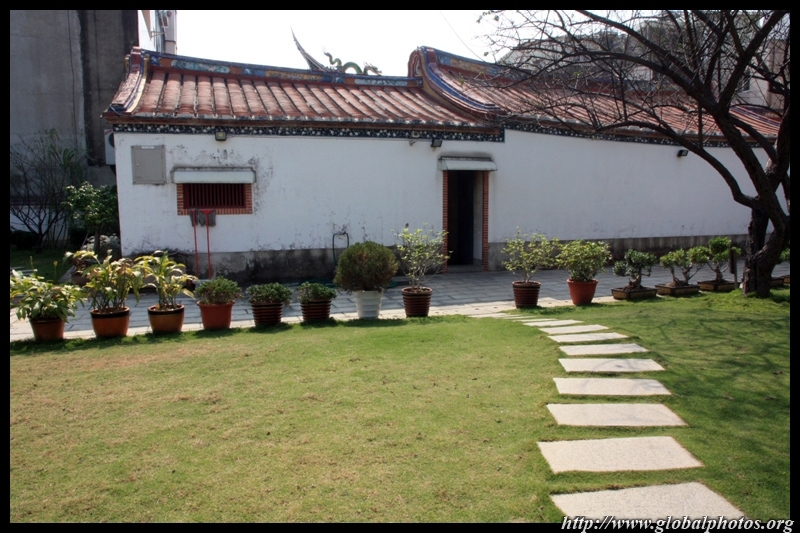 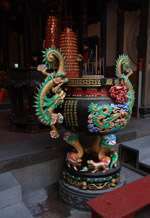 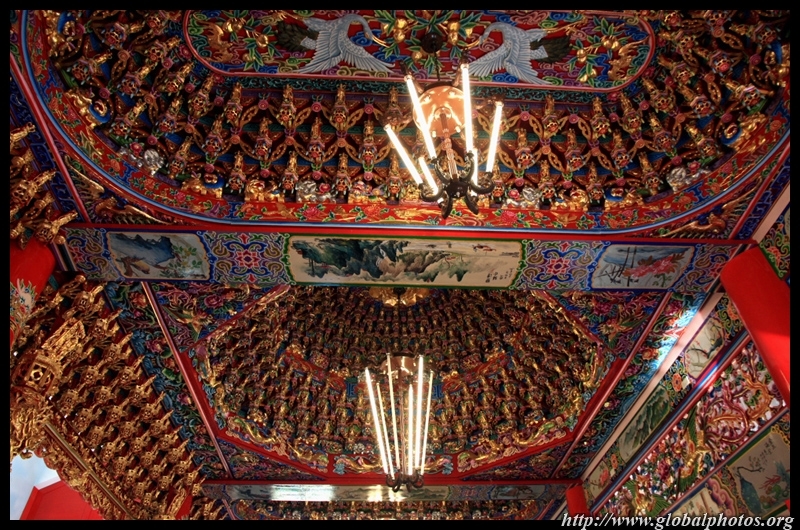 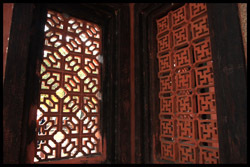 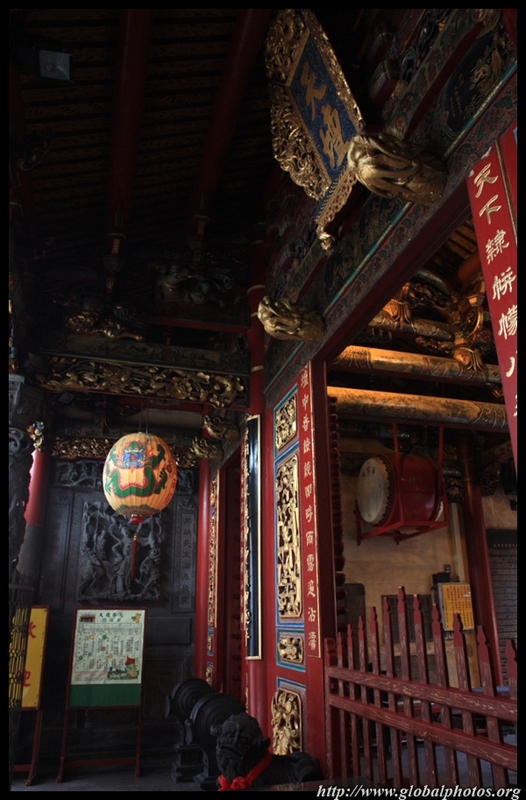 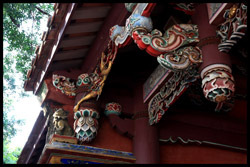 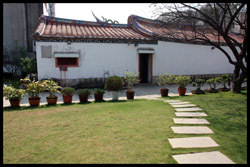 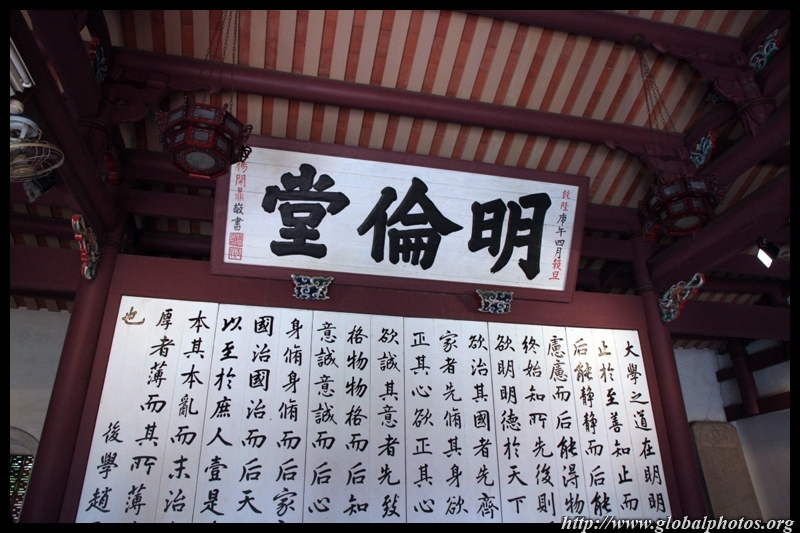 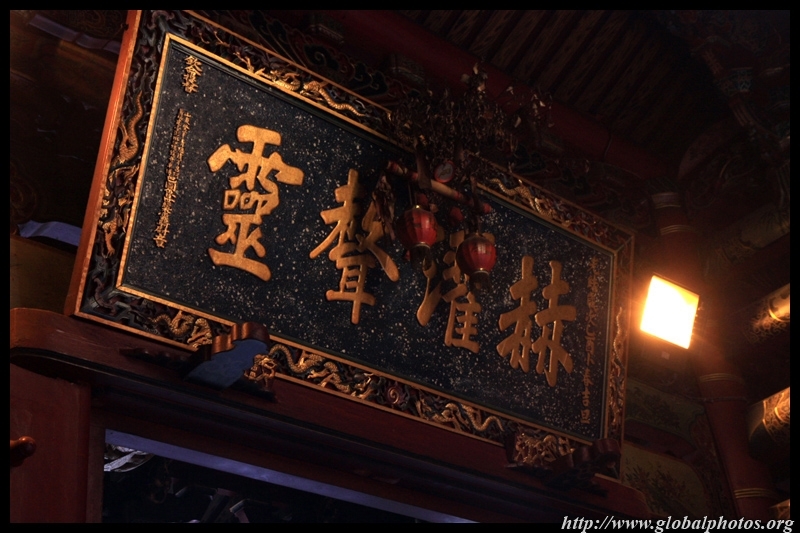 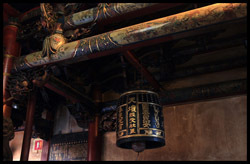 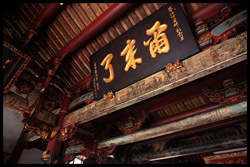 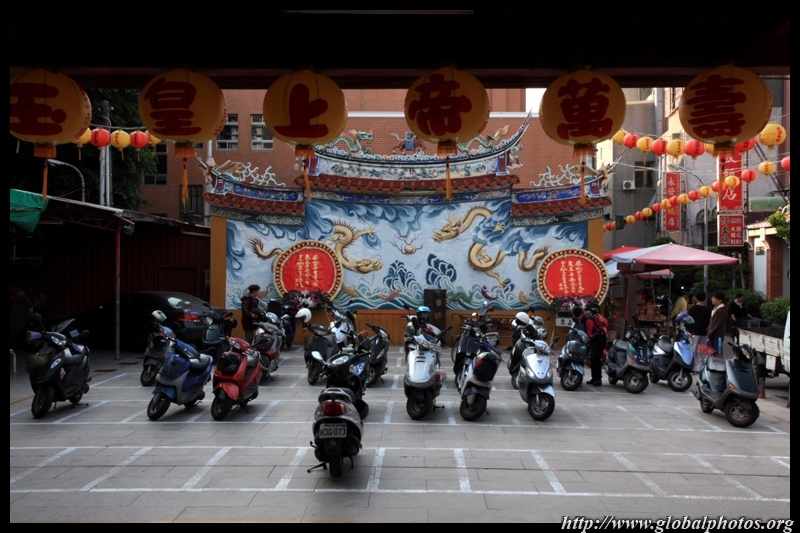 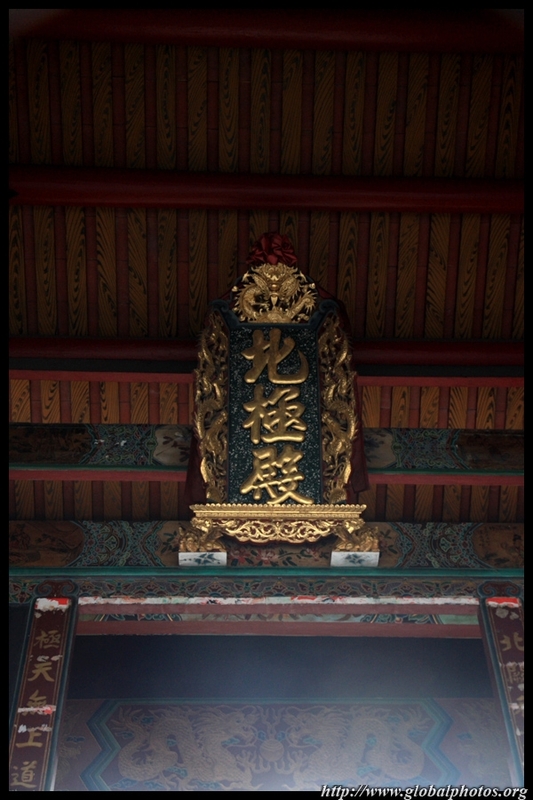 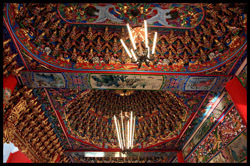 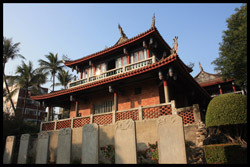 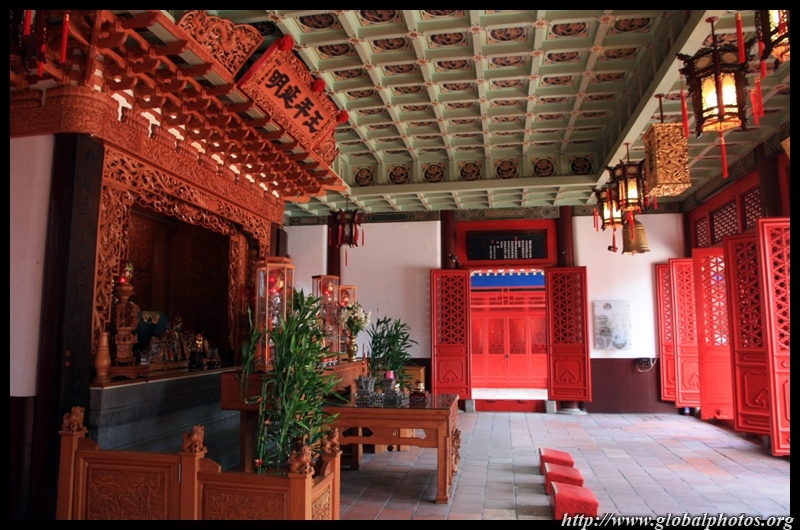 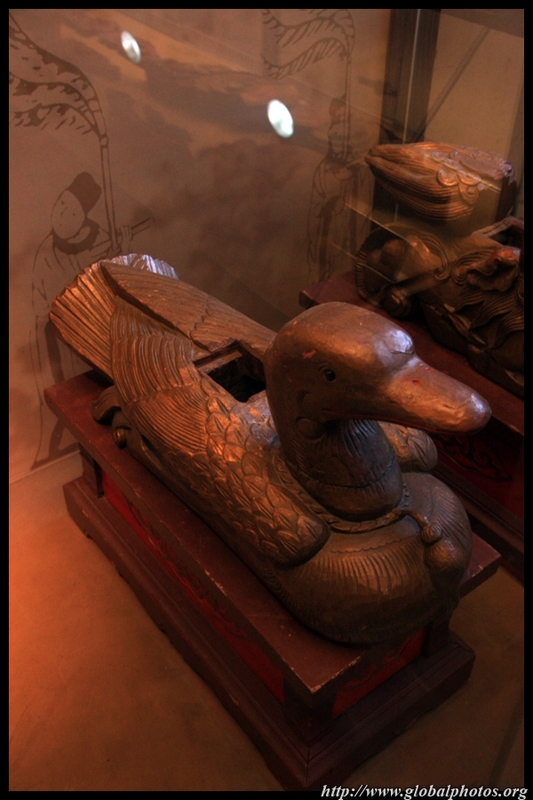 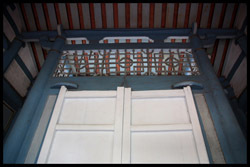 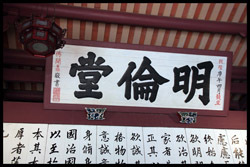 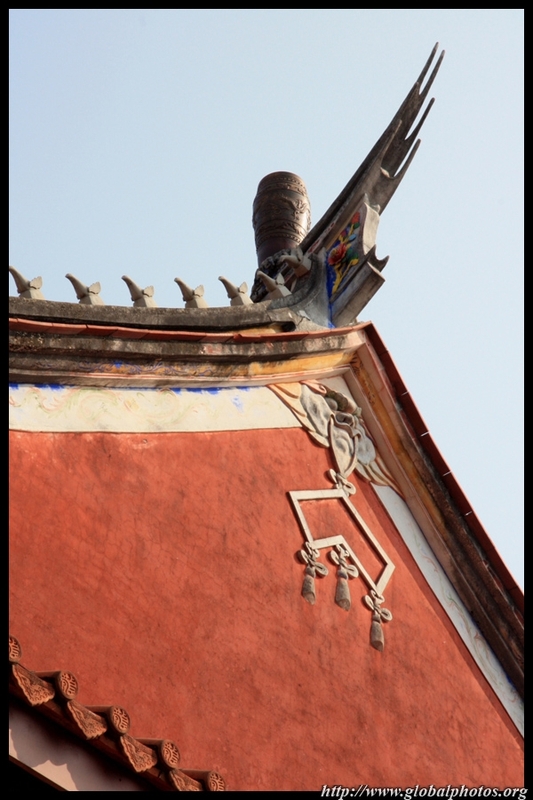 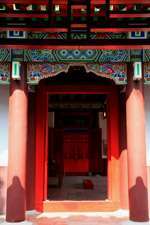 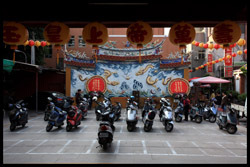 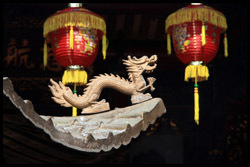 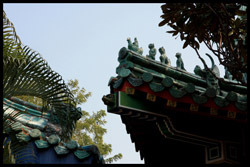 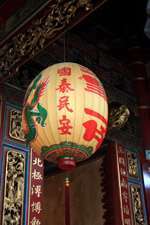 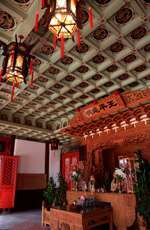 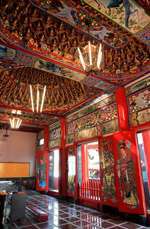 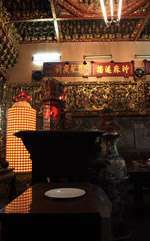 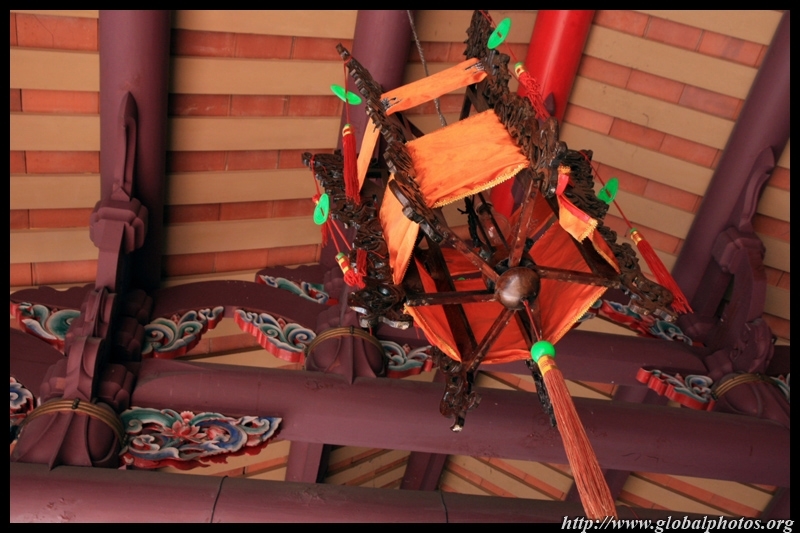 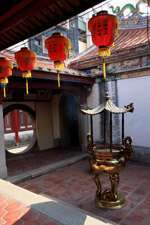 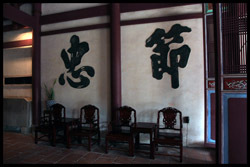 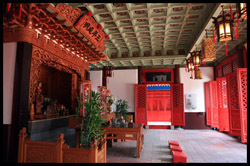 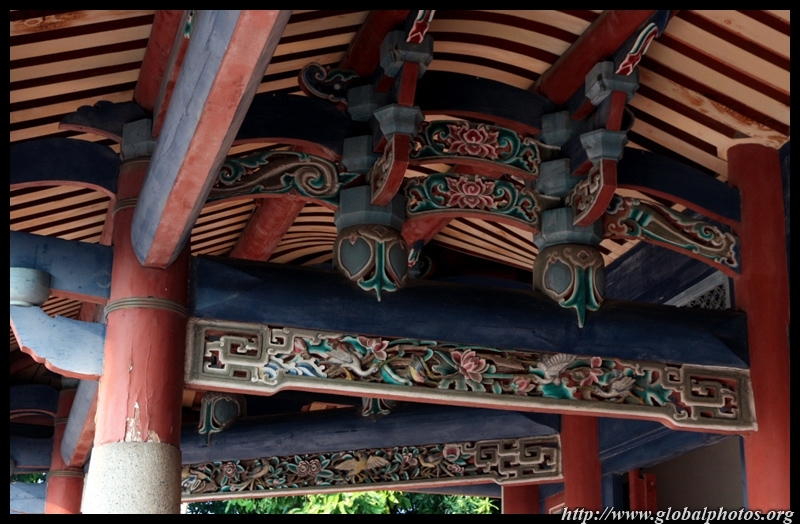 Dongyue Hall was built in 1673 and celebrates the local city god. 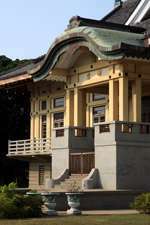 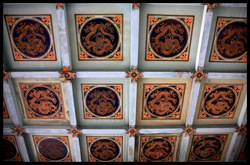 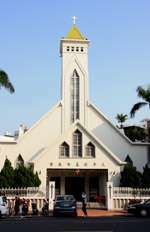 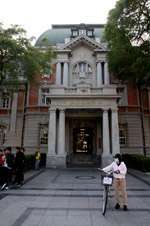 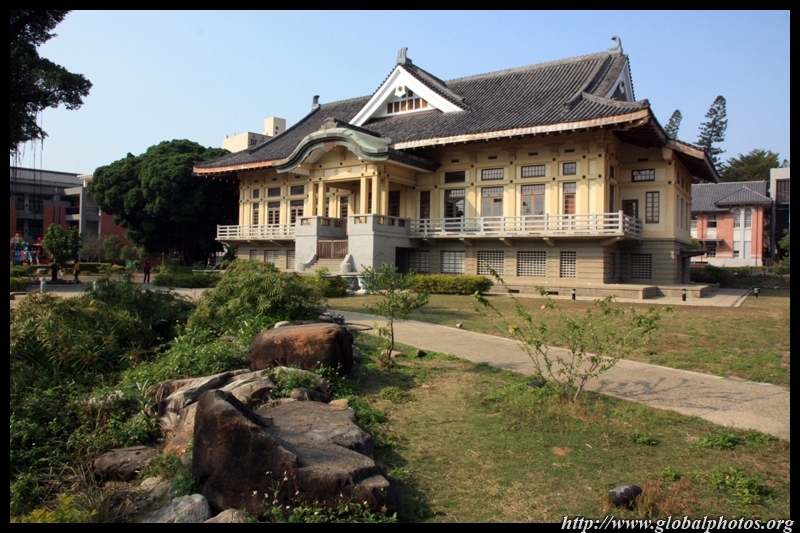 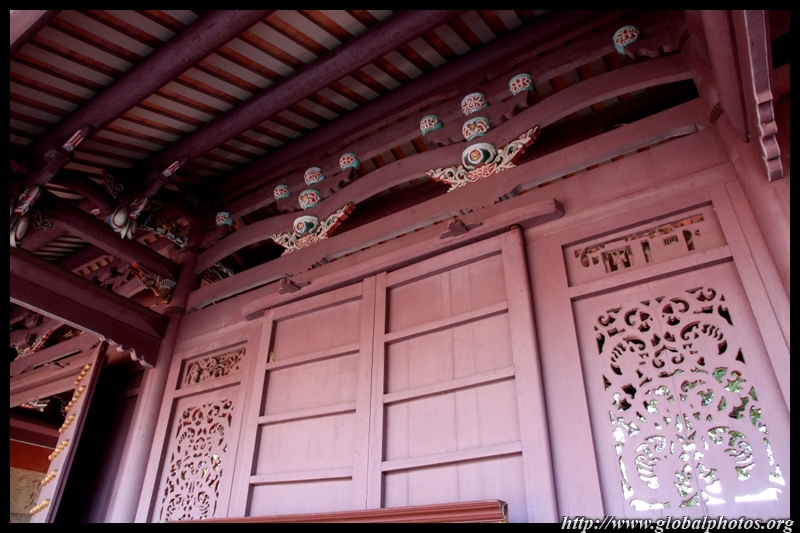 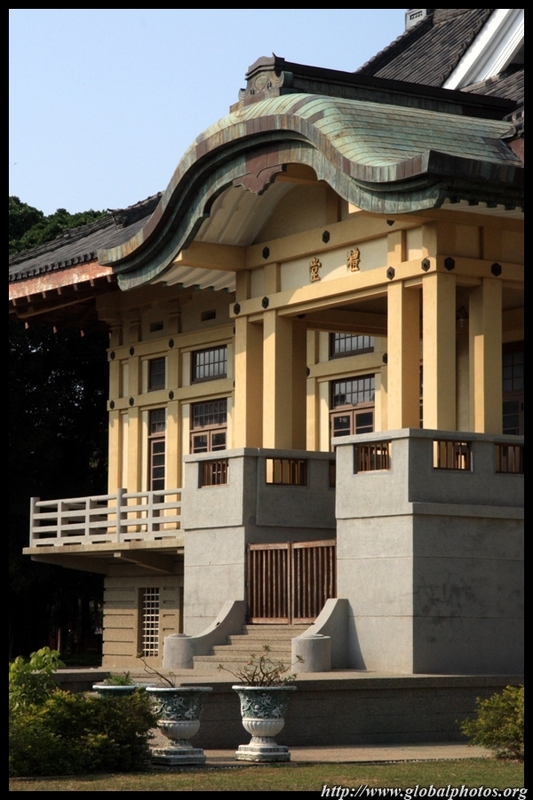 It was partially demolished during the Japanese colonial era and in 1979, but was restored in 1994. 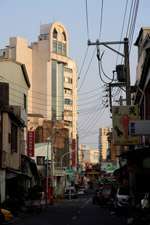 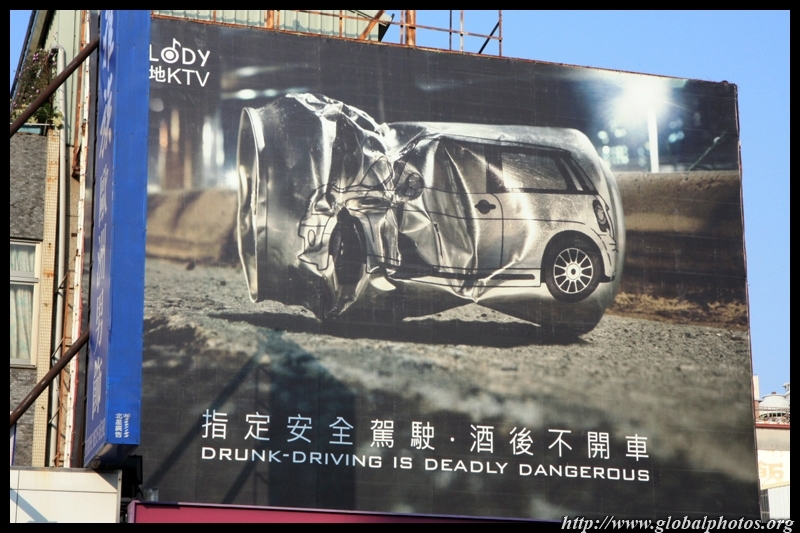 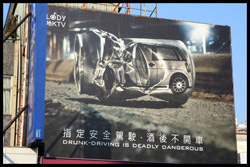 The neighbouring streets are quiet, with not too many pedestrians. 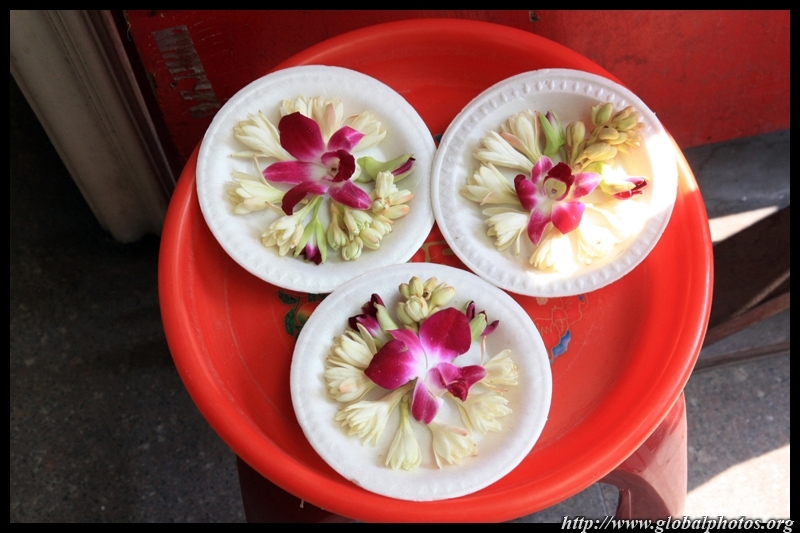 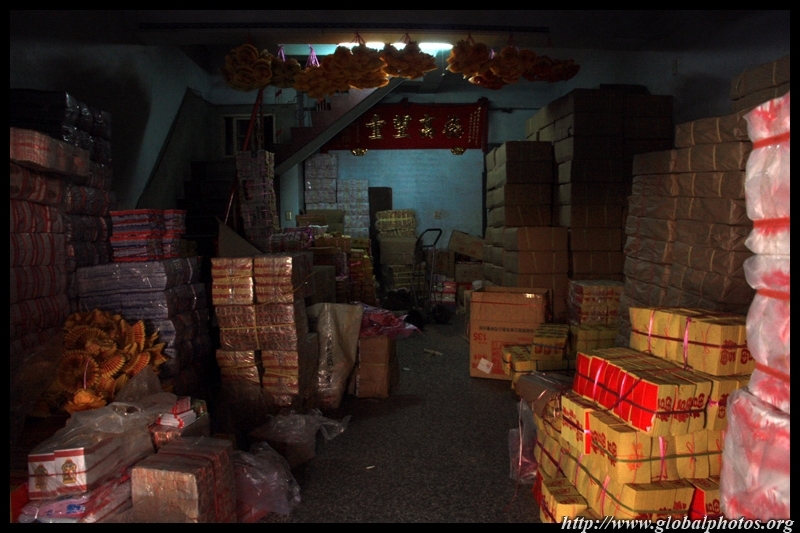 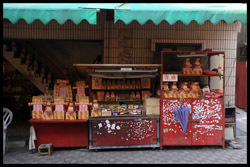 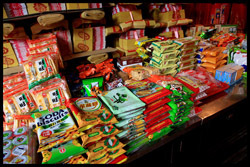 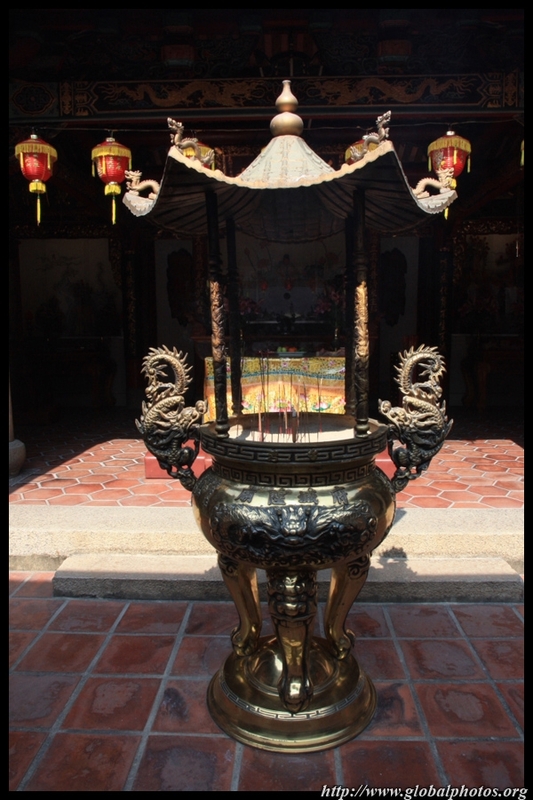 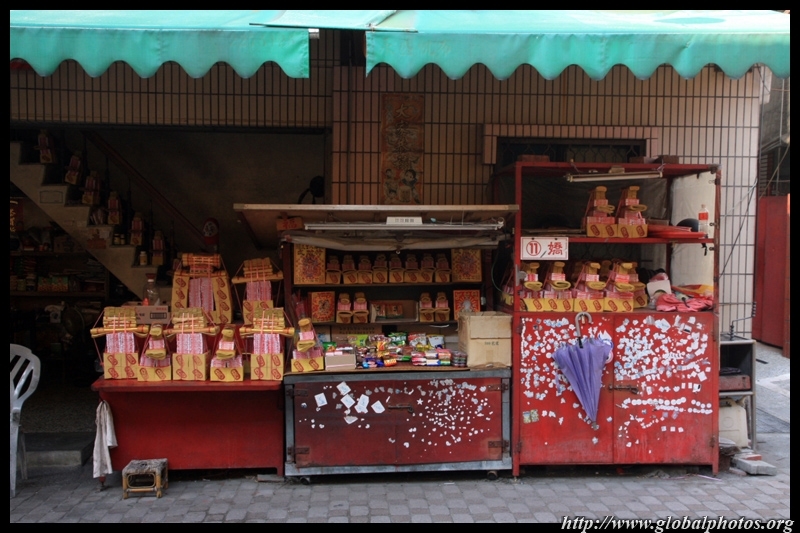 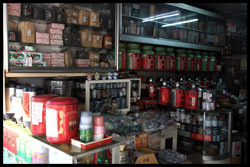 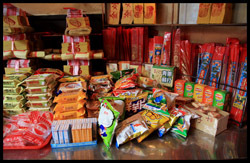 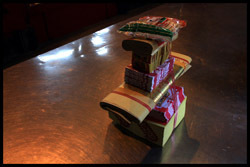 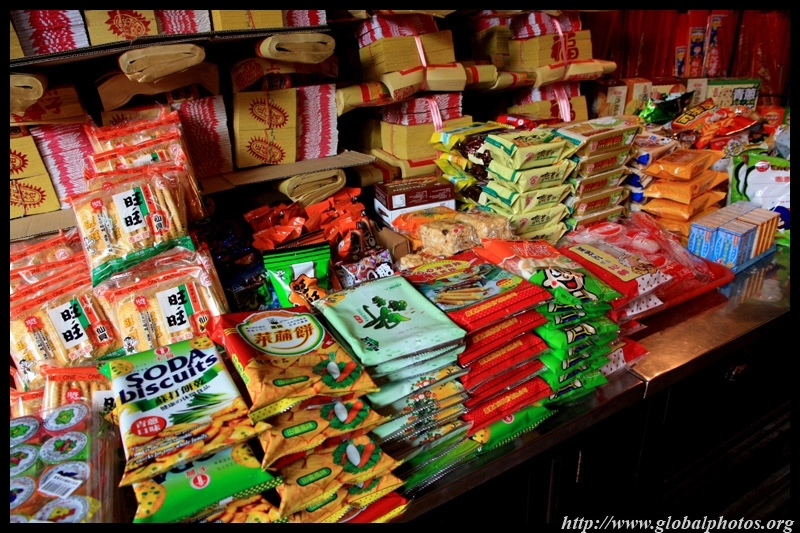 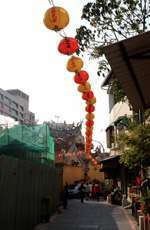 Several shops were selling temple wares for arriving worshippers. 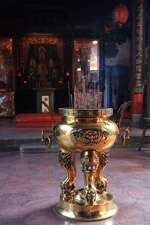 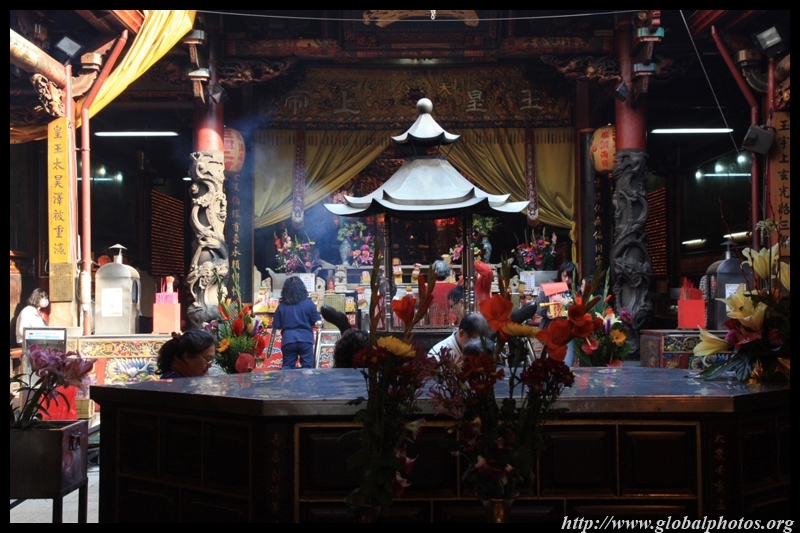 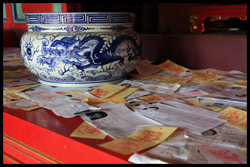 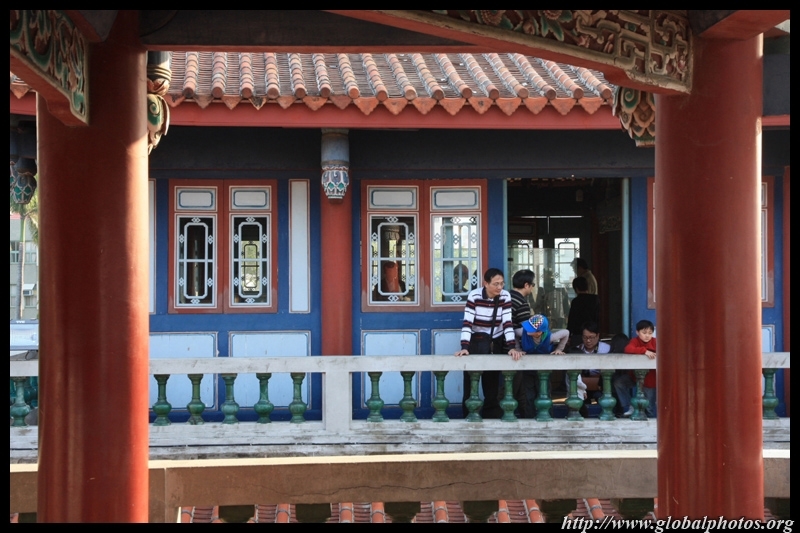 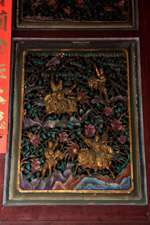 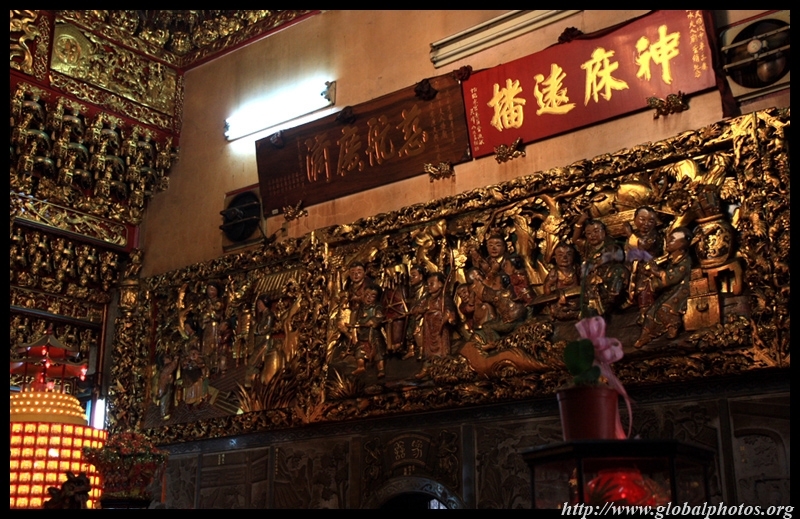 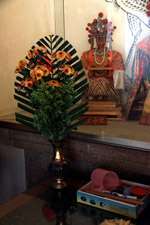 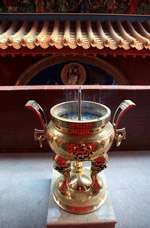 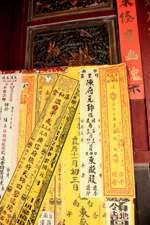 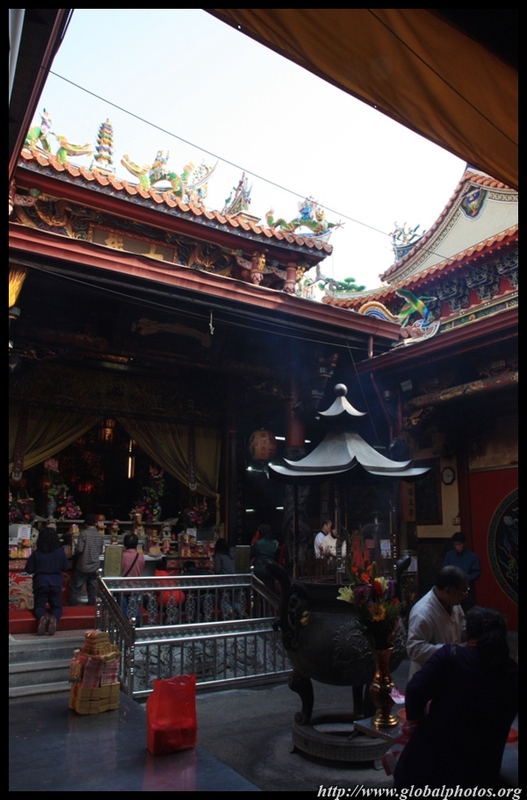 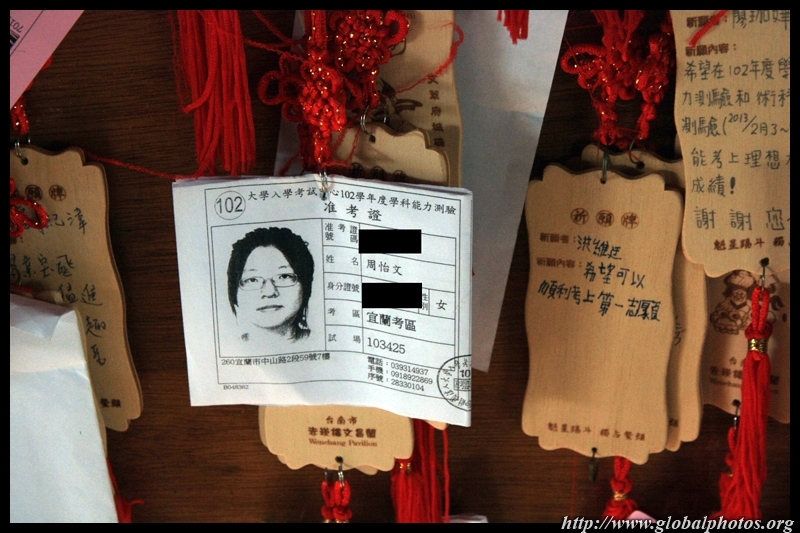 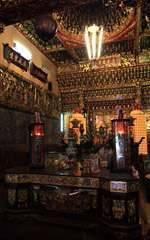 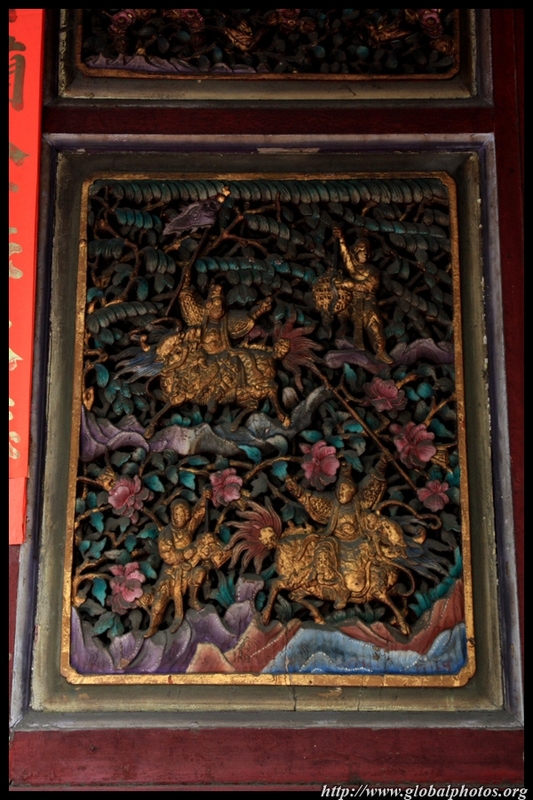 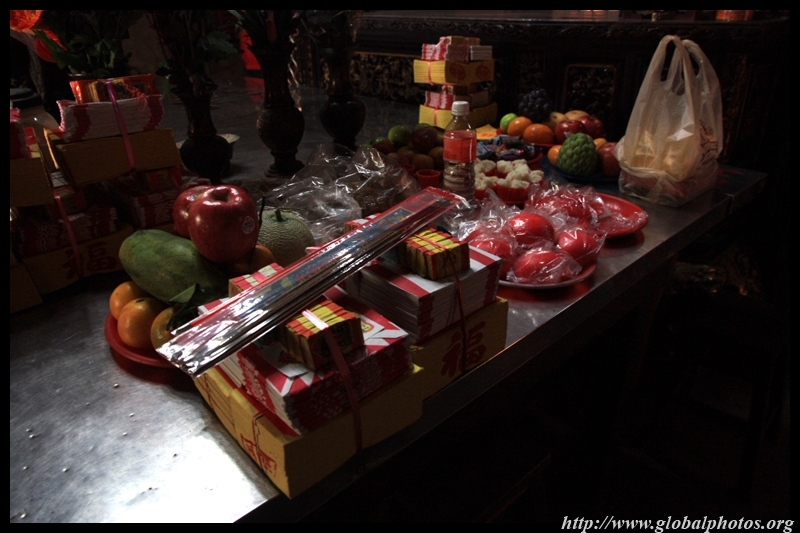 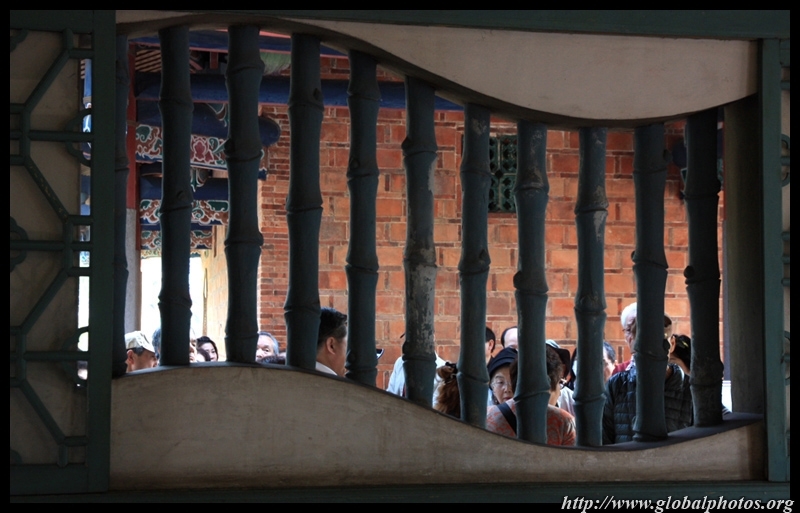 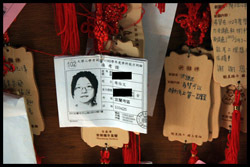 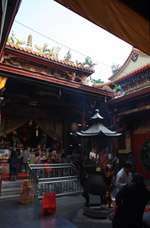 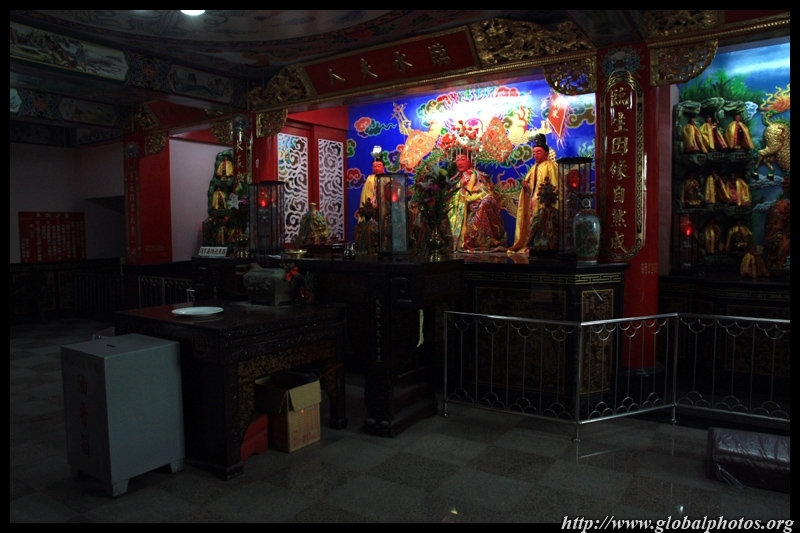 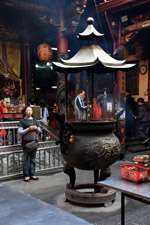 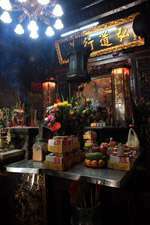 Women came to Lady Linshui Temple to request for protectio nof their children. 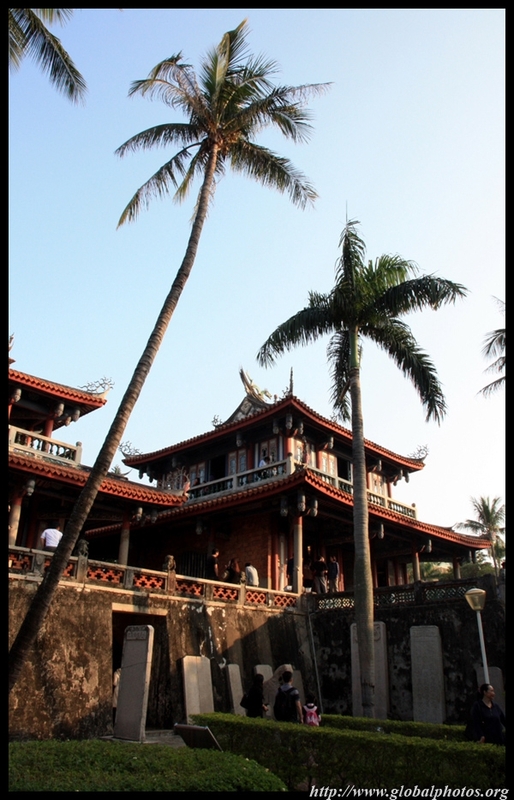 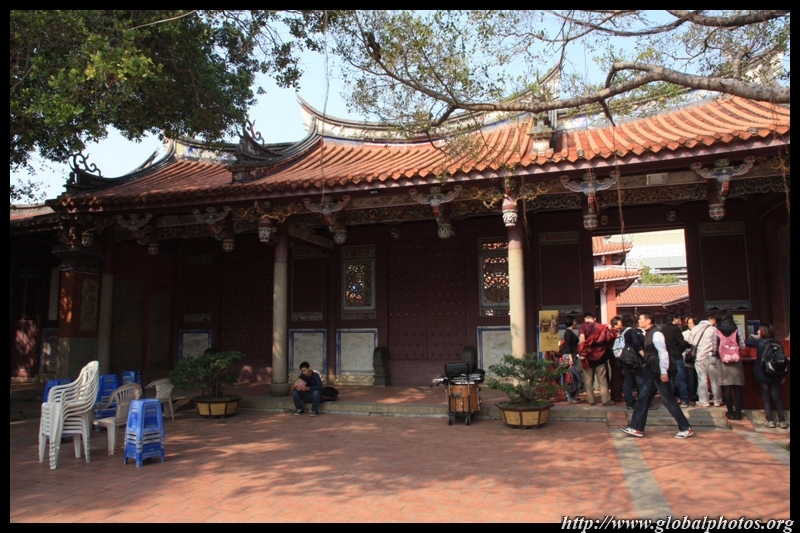 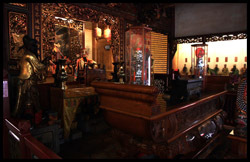 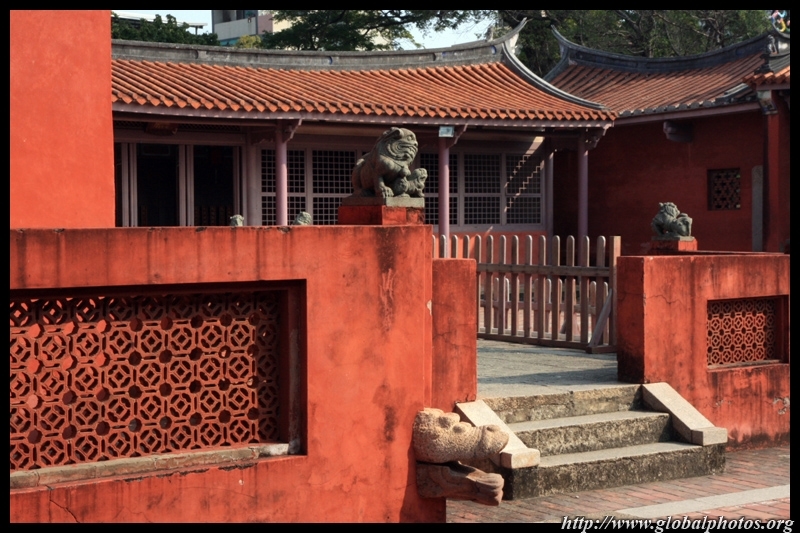 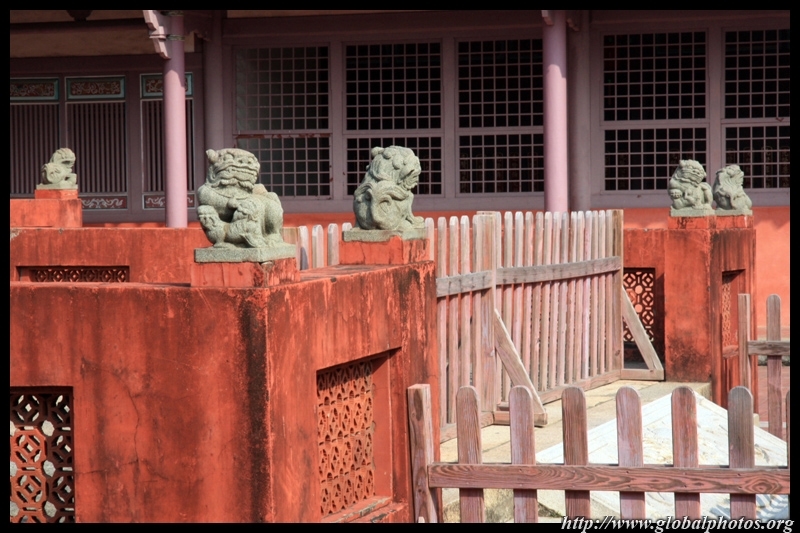 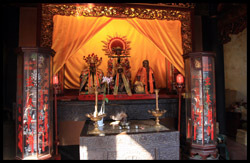 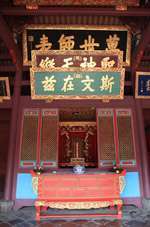 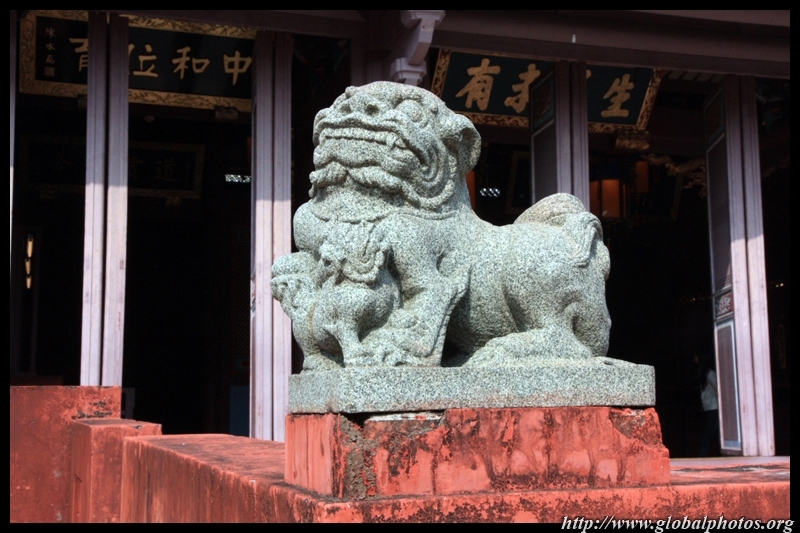 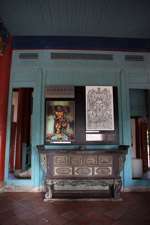 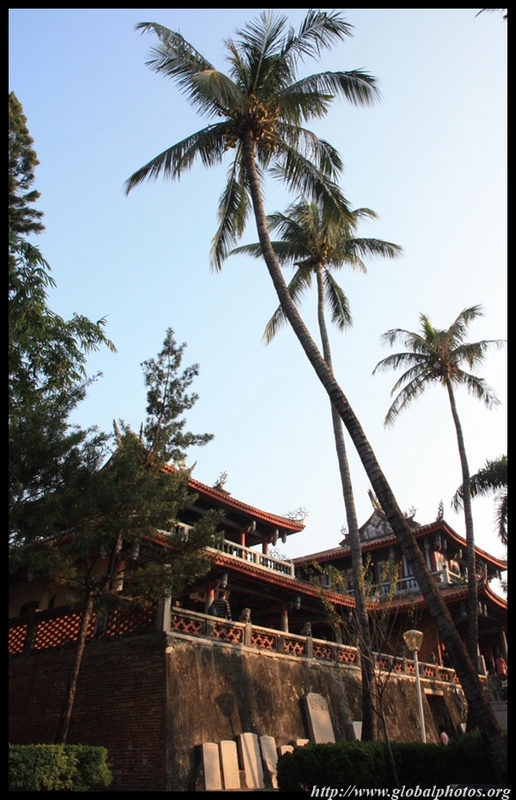 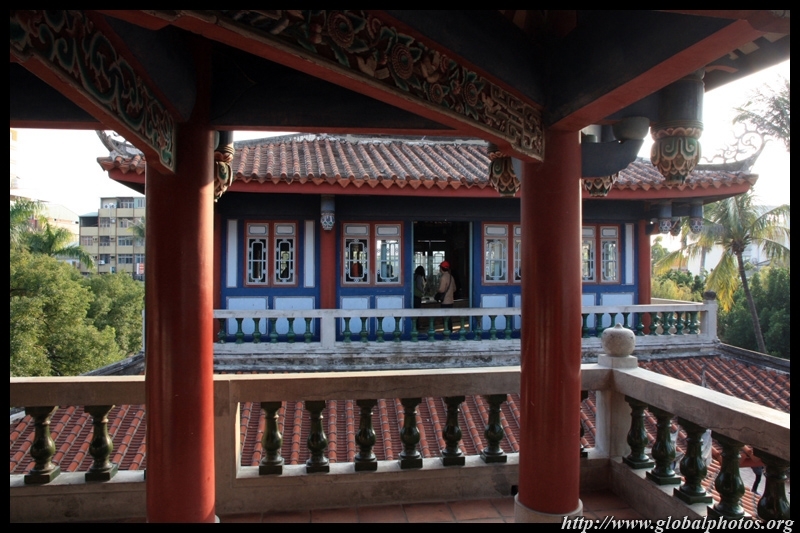 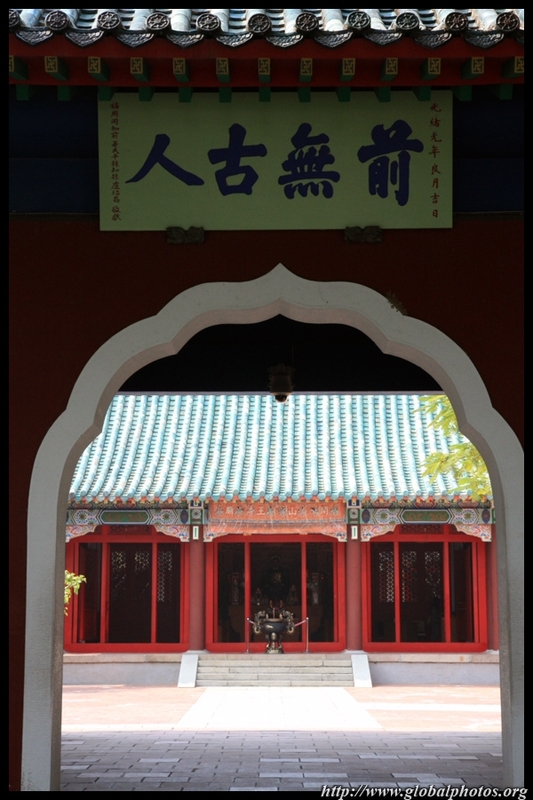 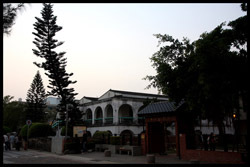 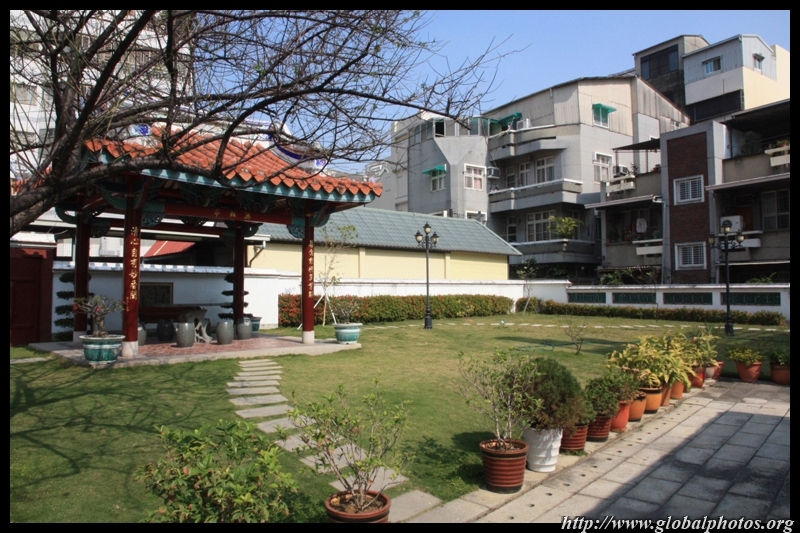 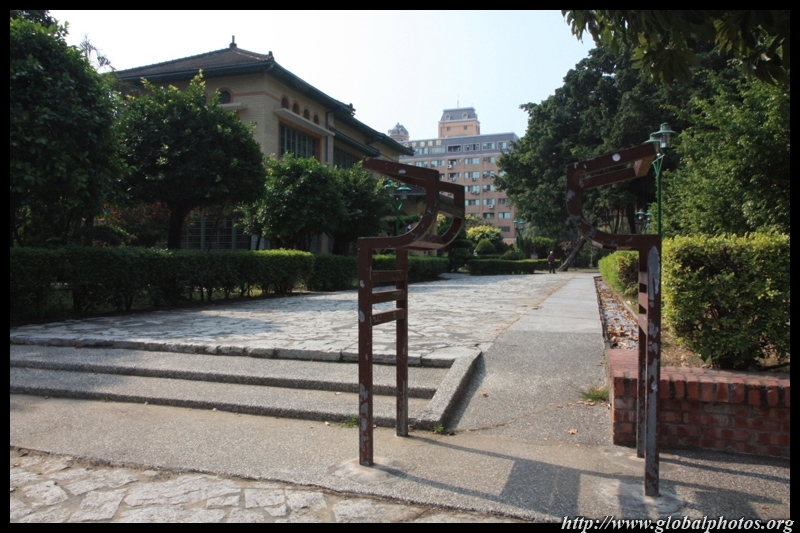 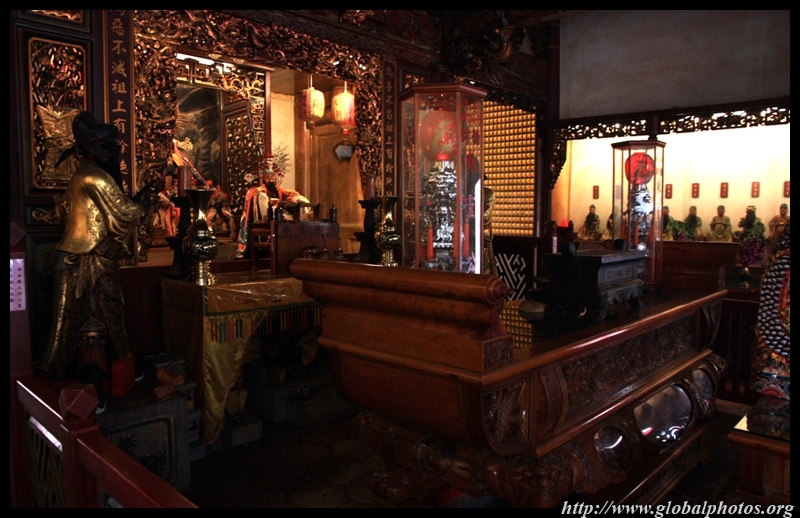 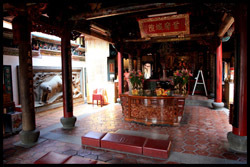 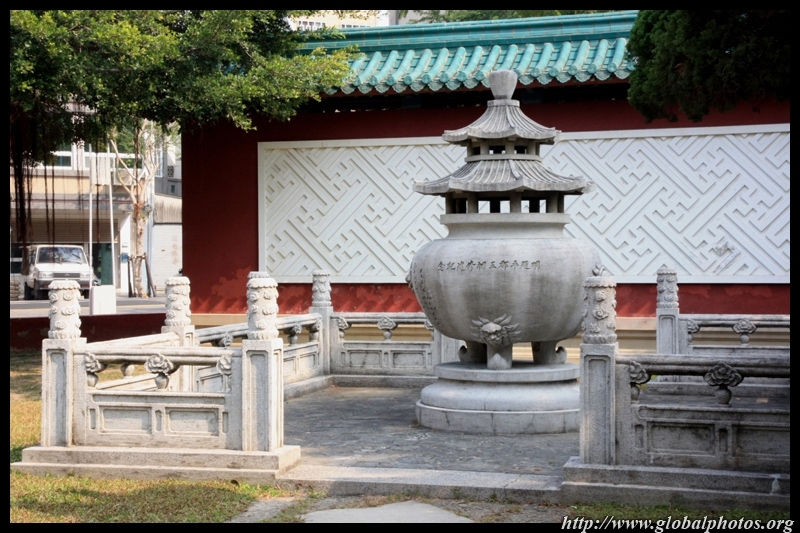 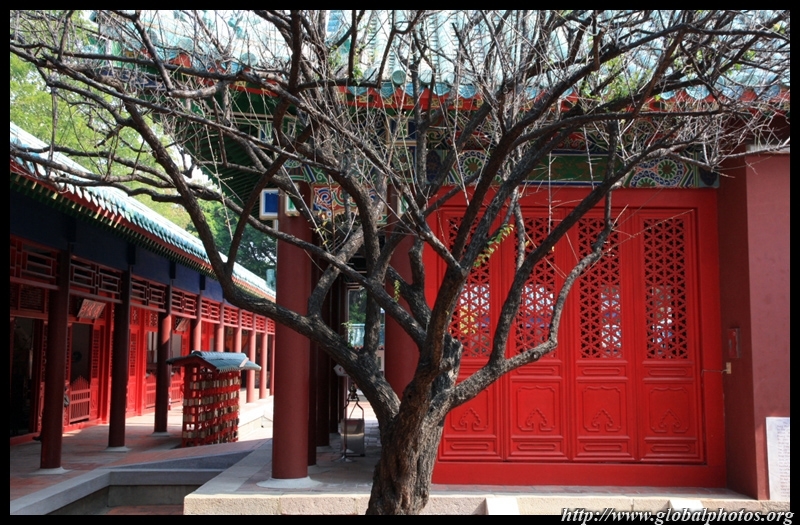 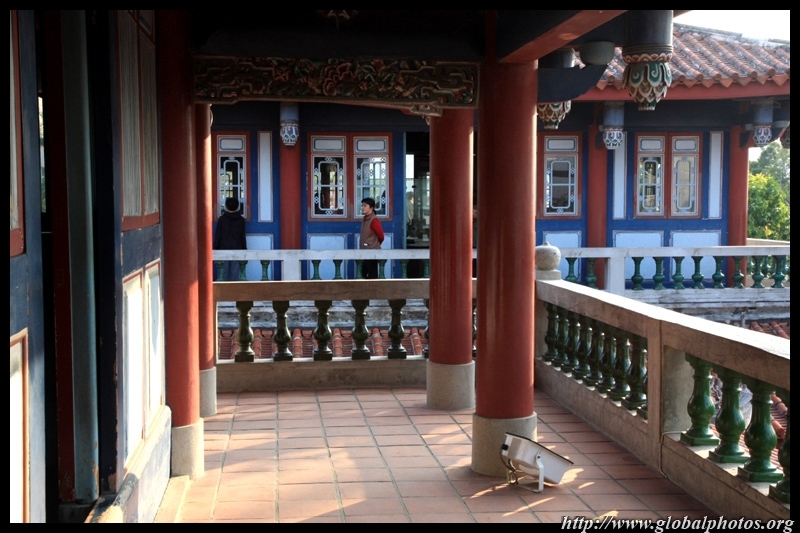 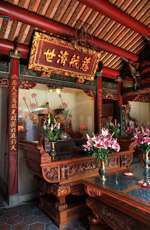 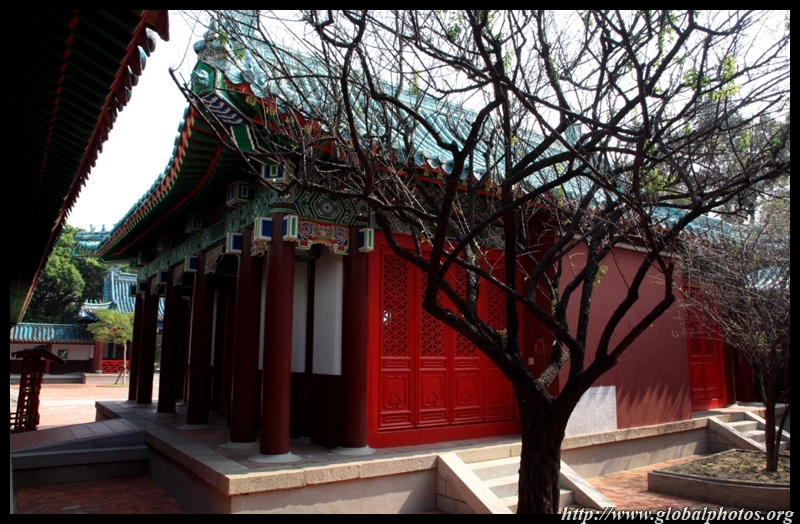 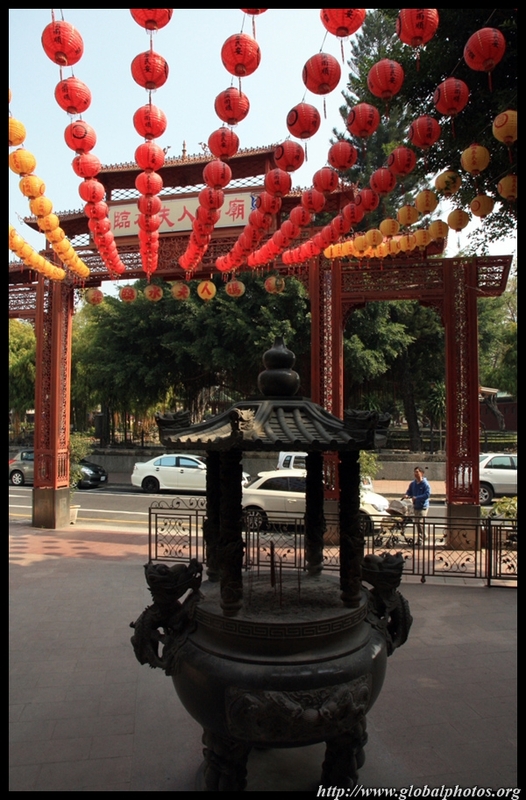 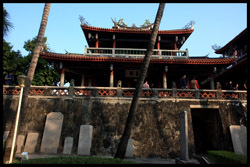 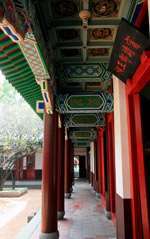 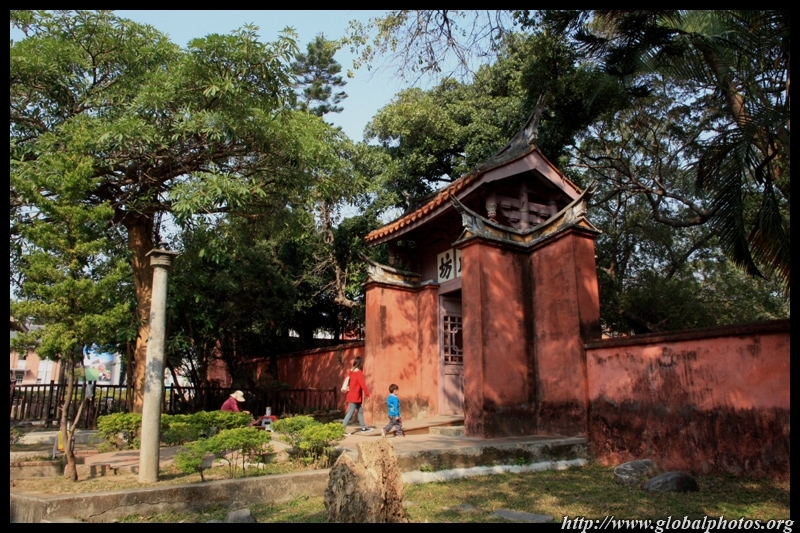 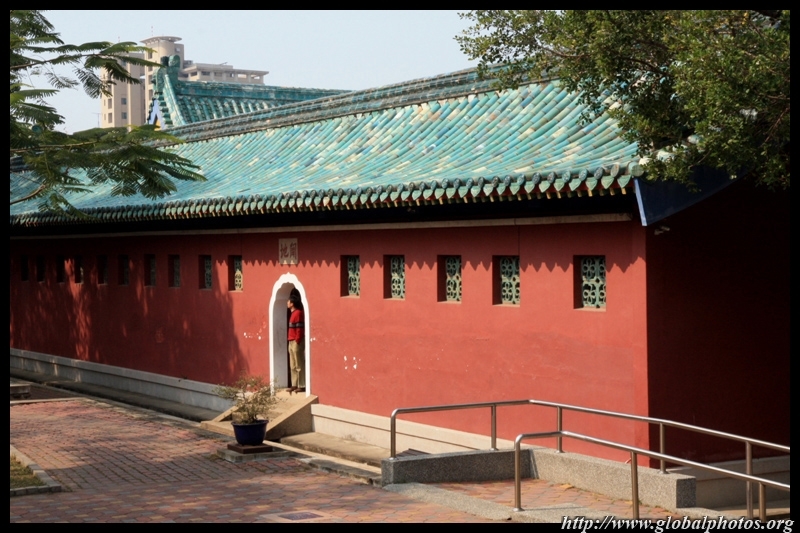 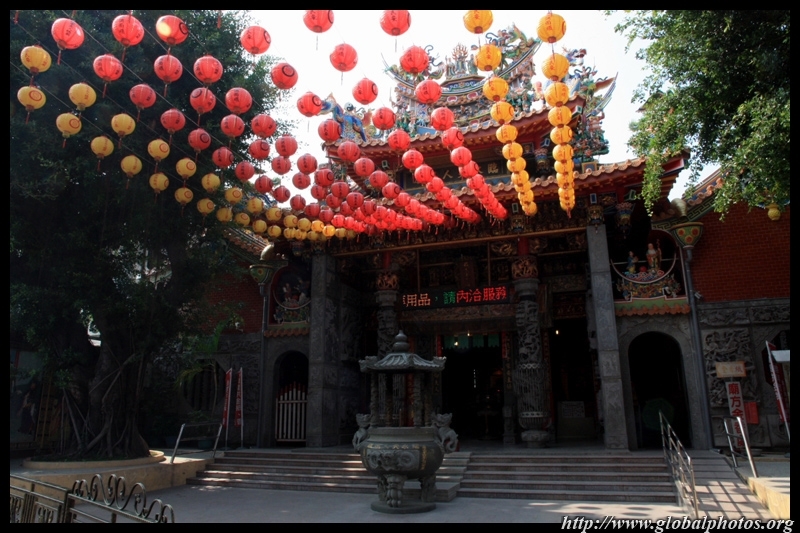 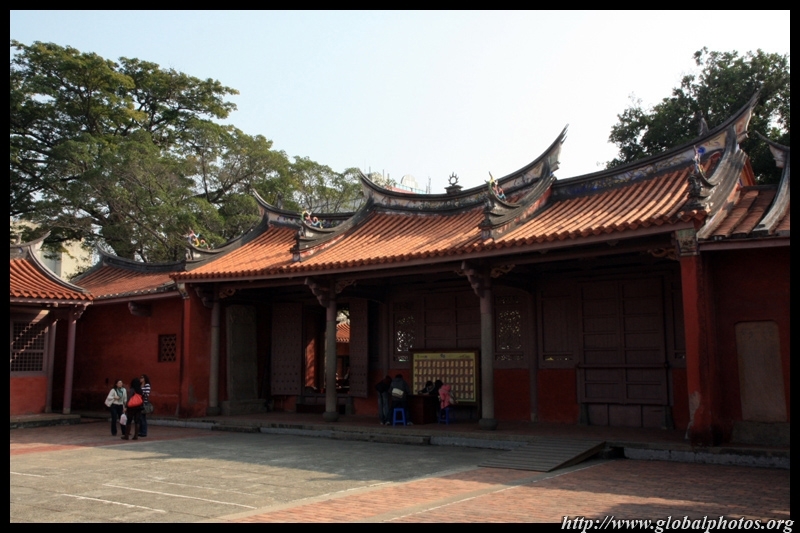 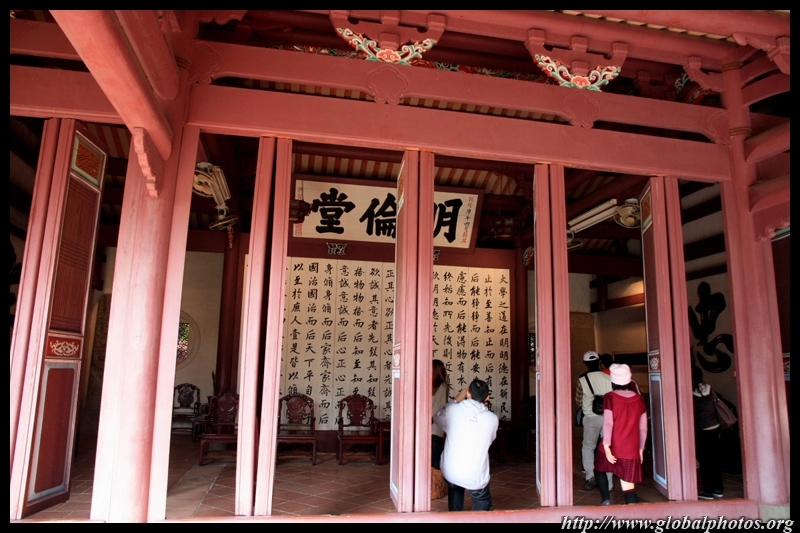 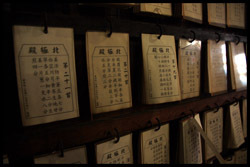 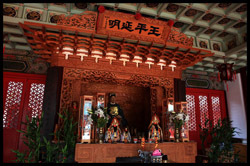 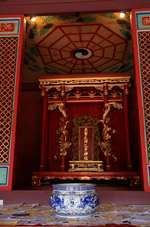 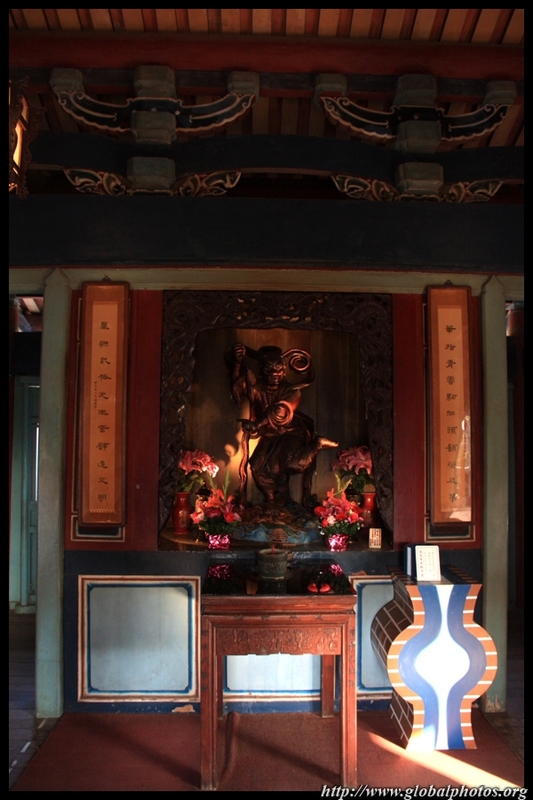 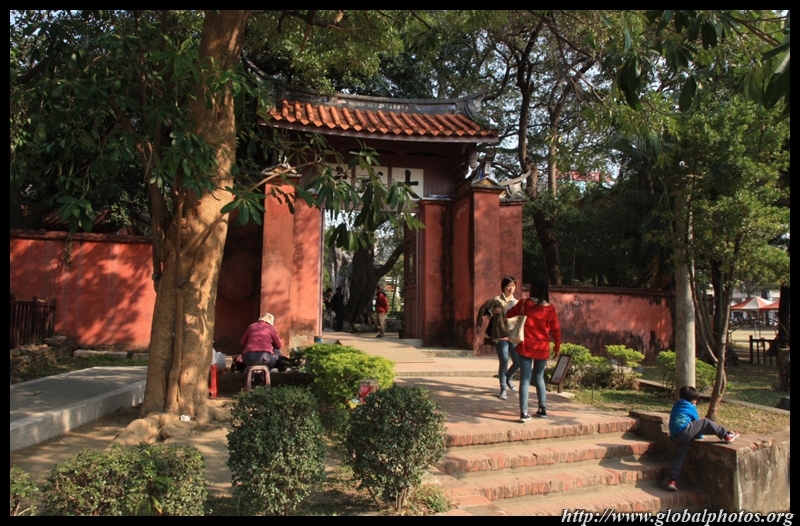 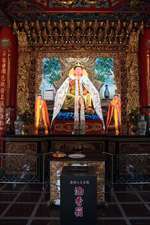 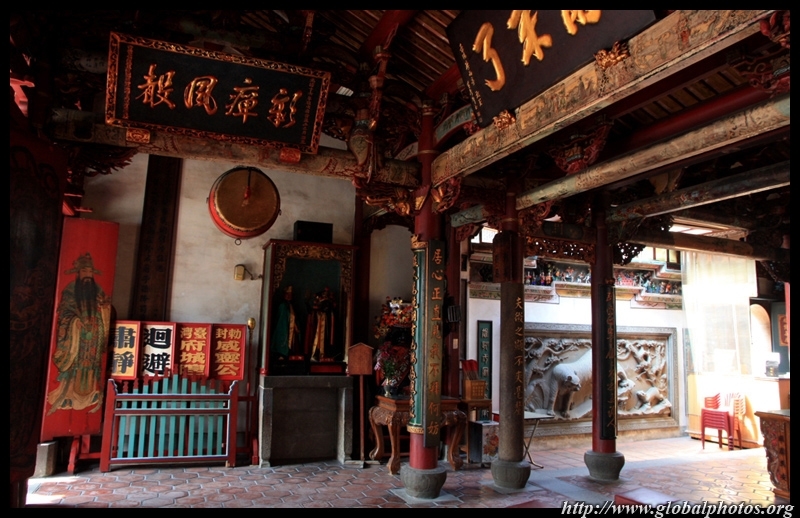 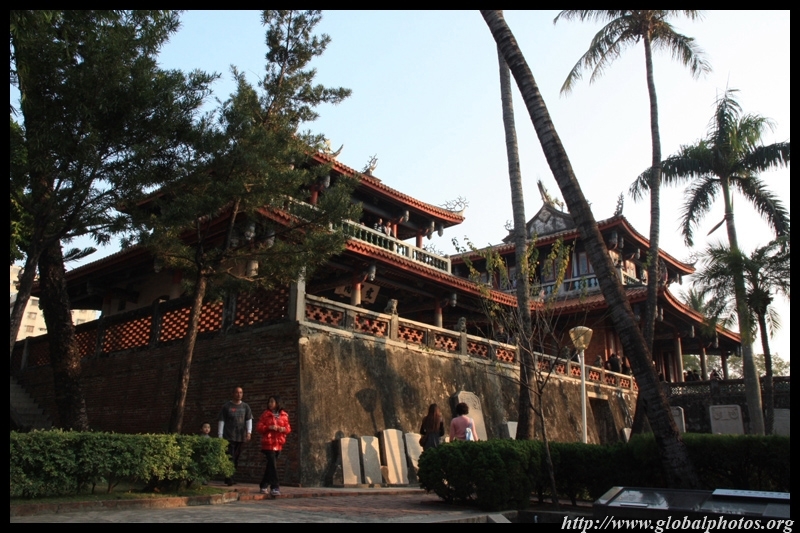 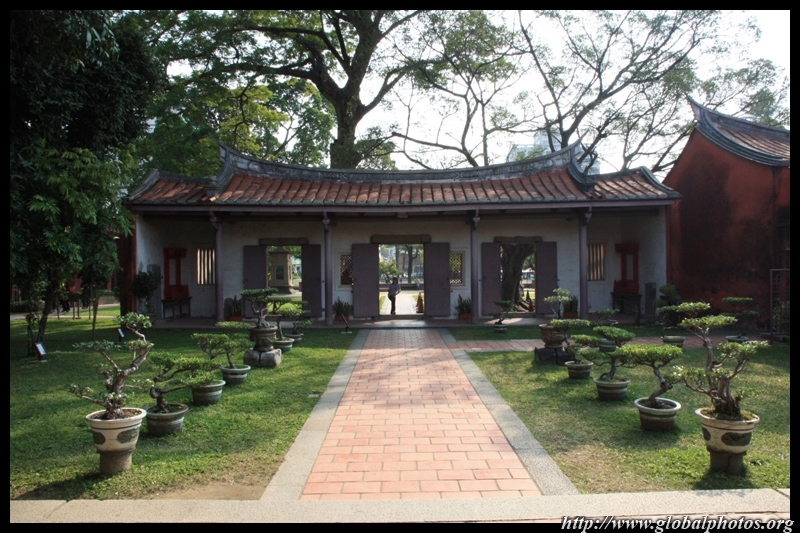 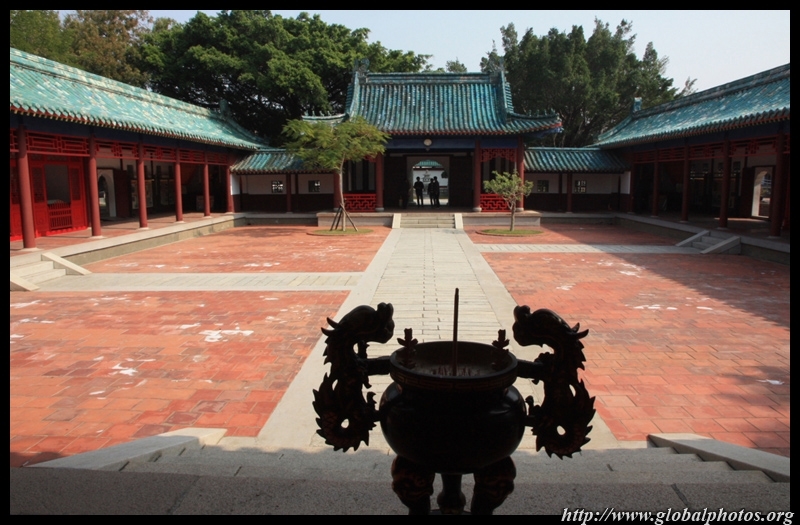 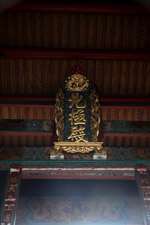 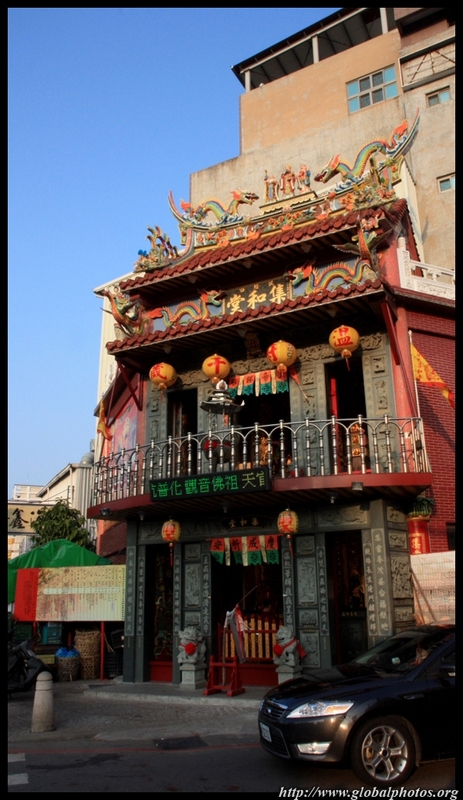 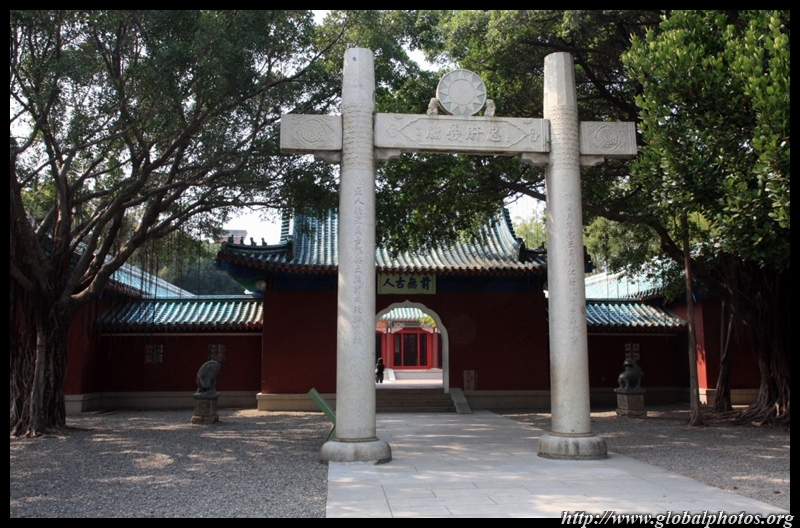 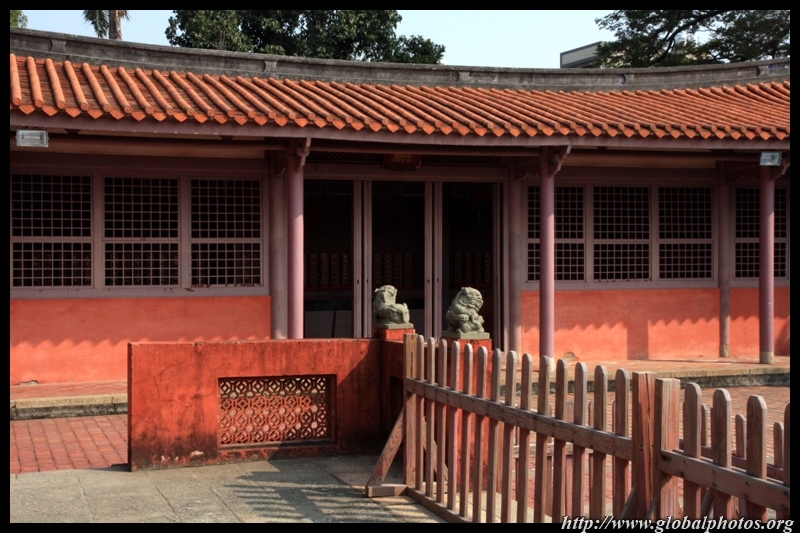 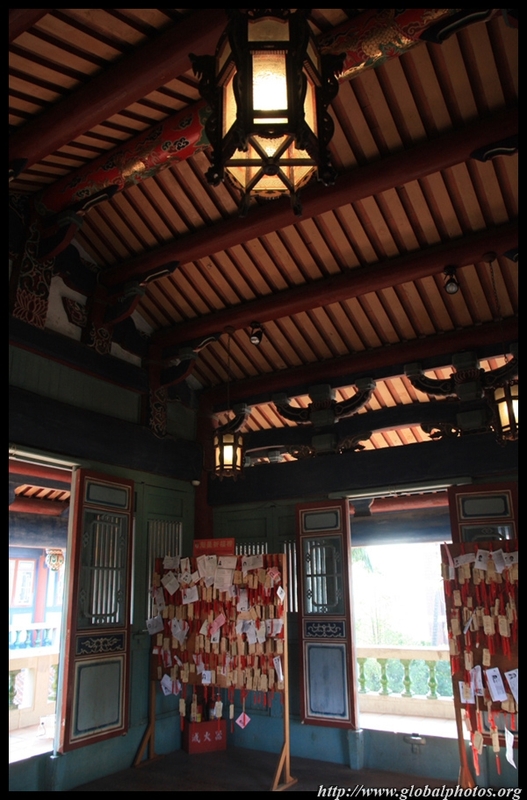 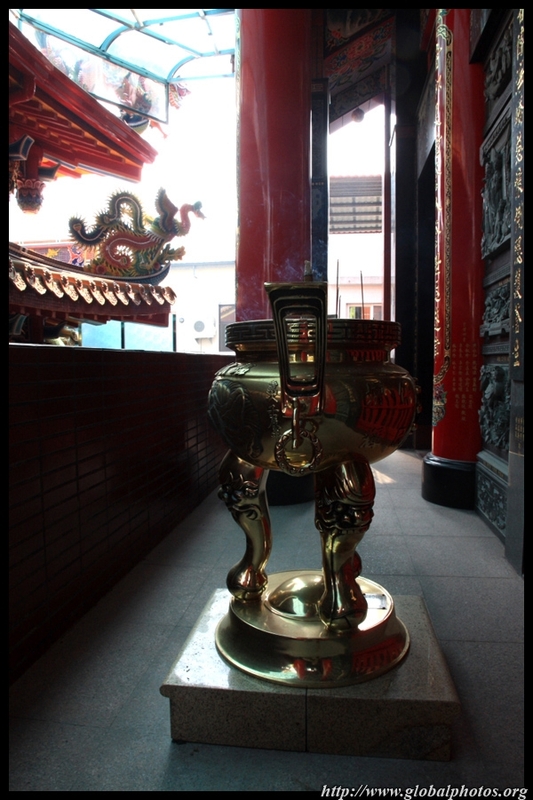 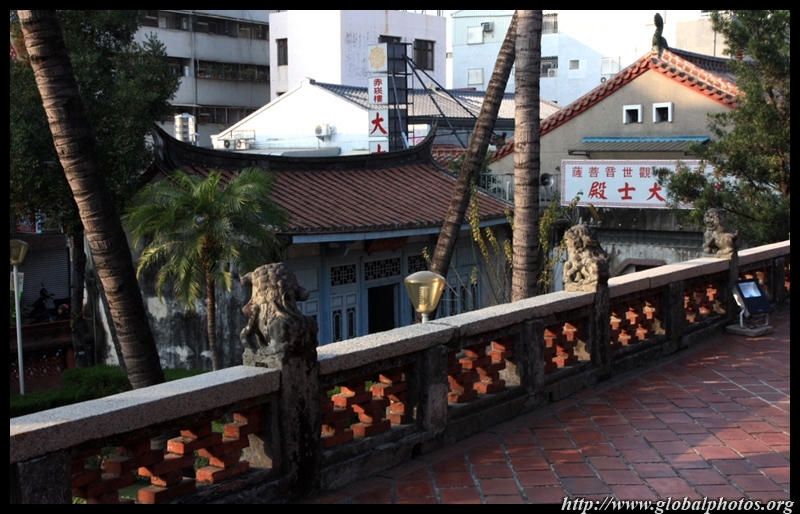 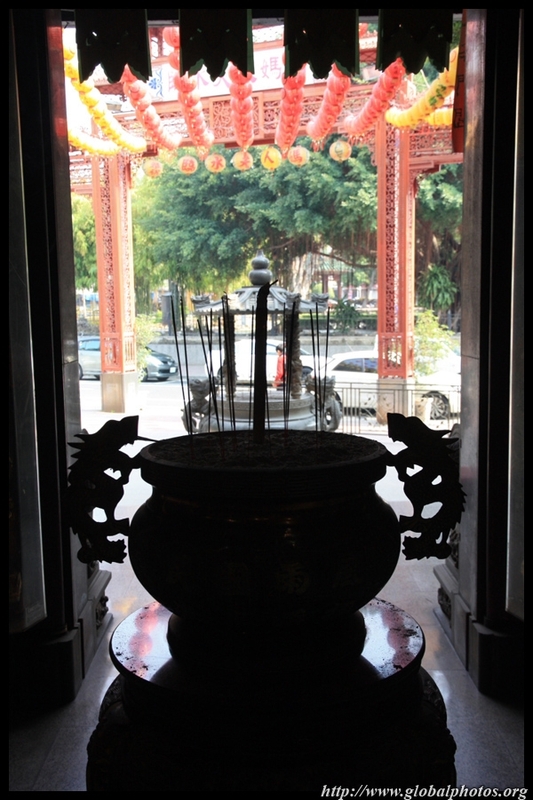 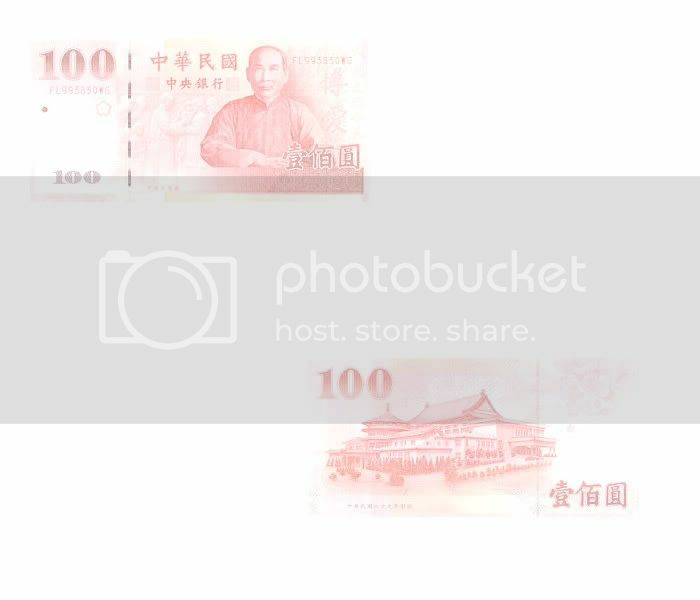 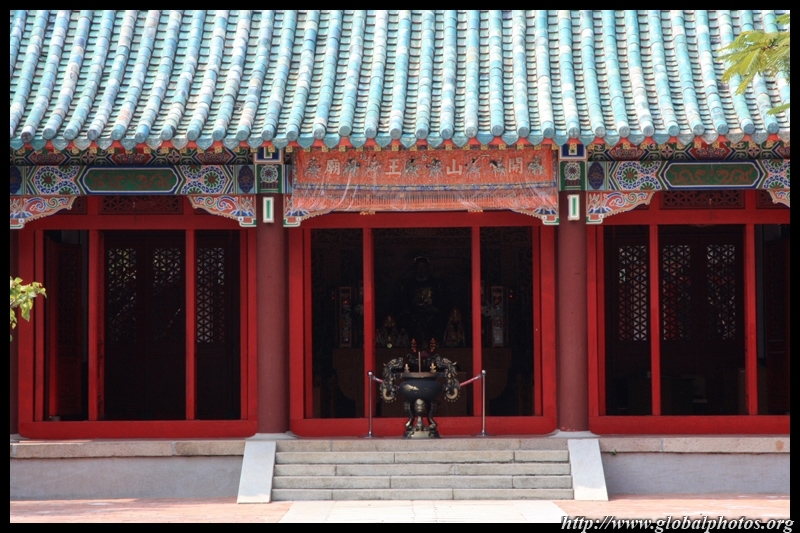 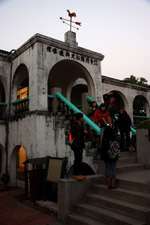 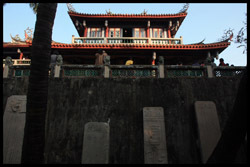 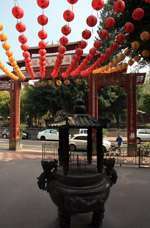 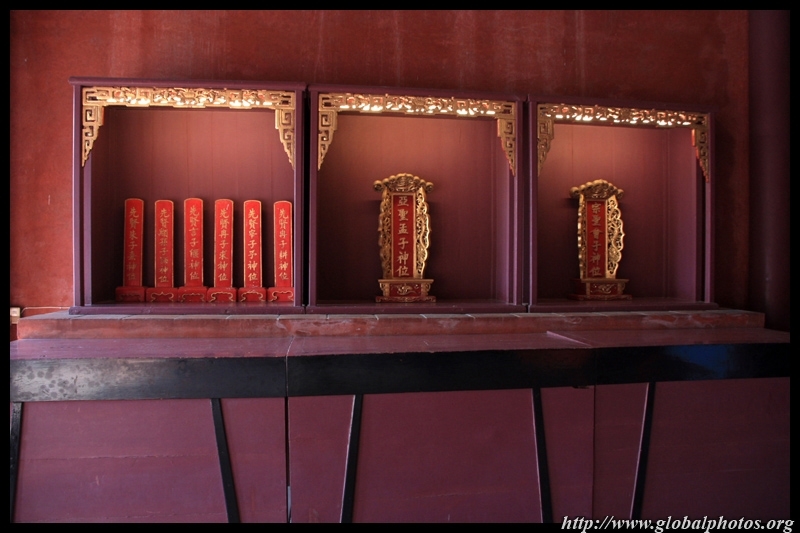 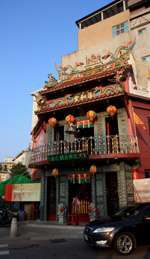 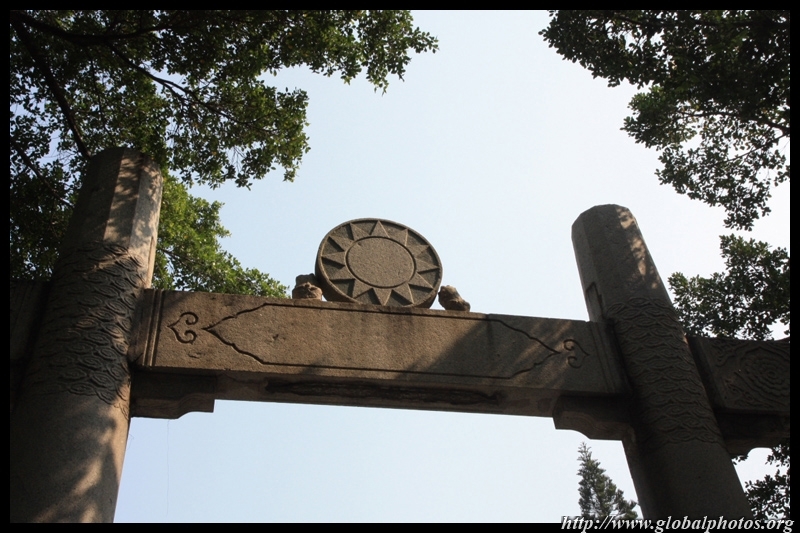 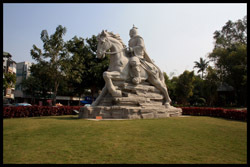 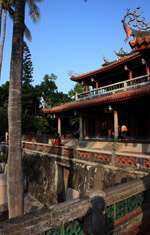 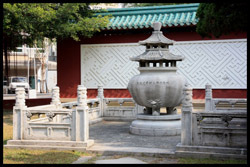 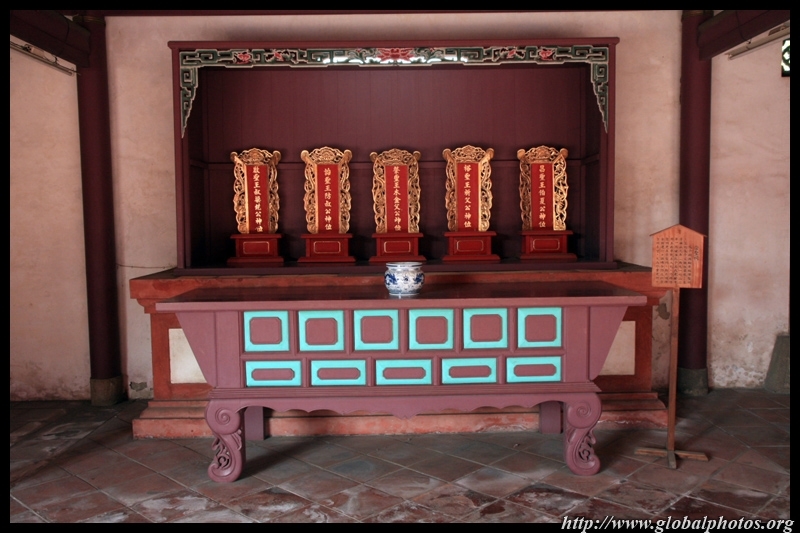 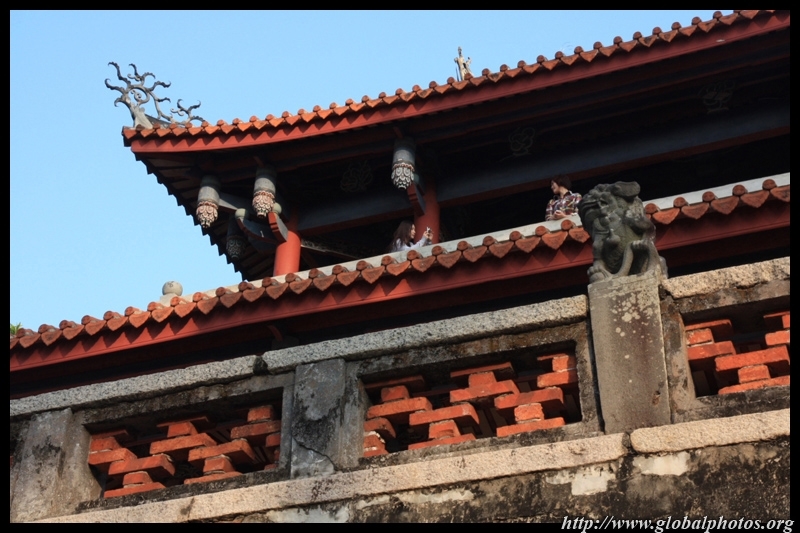 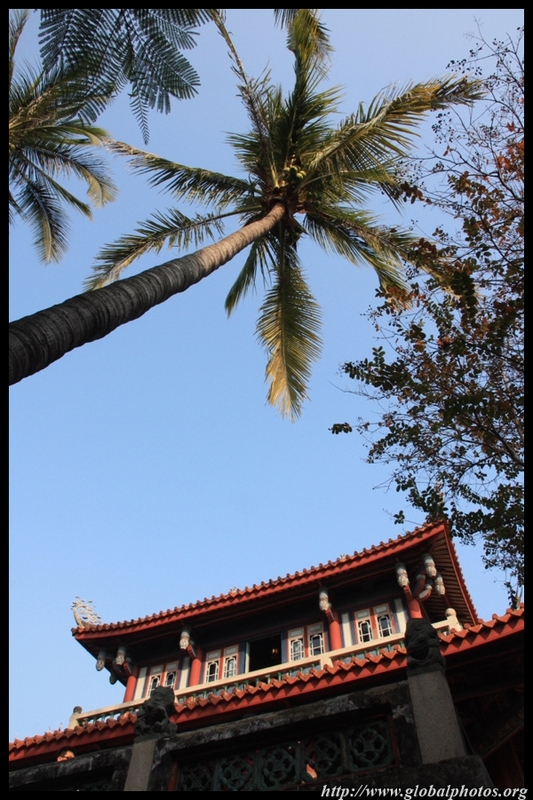 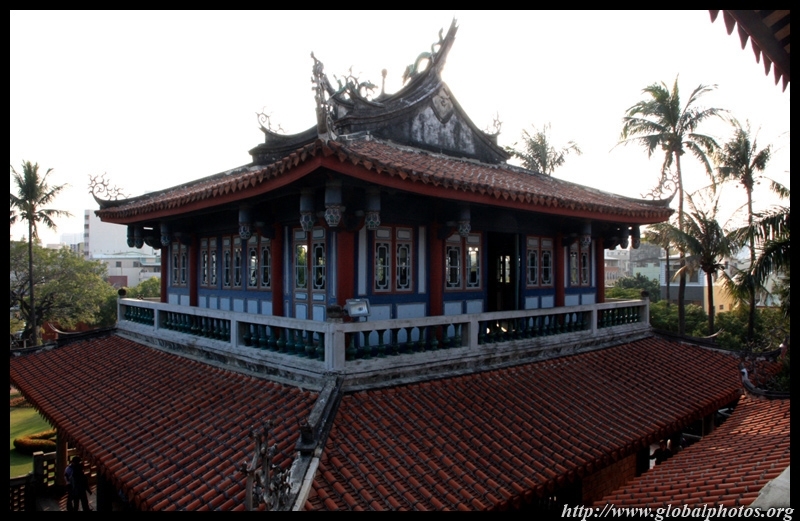 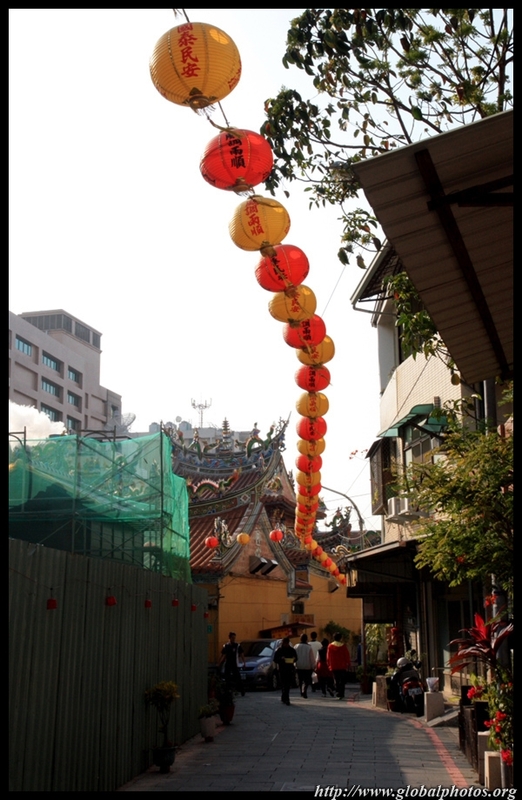 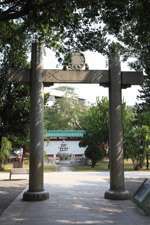 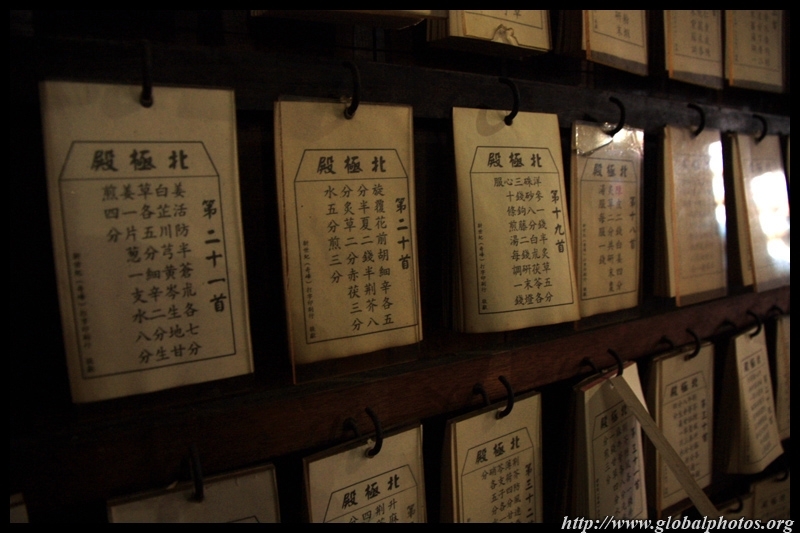 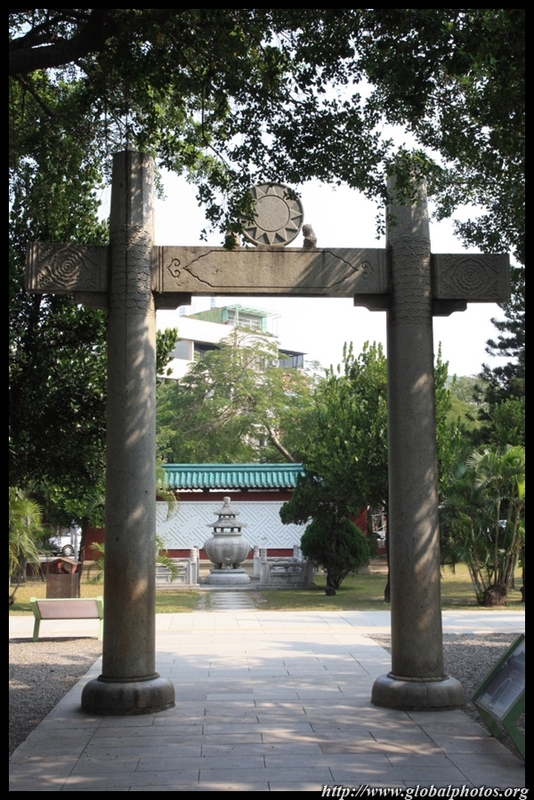 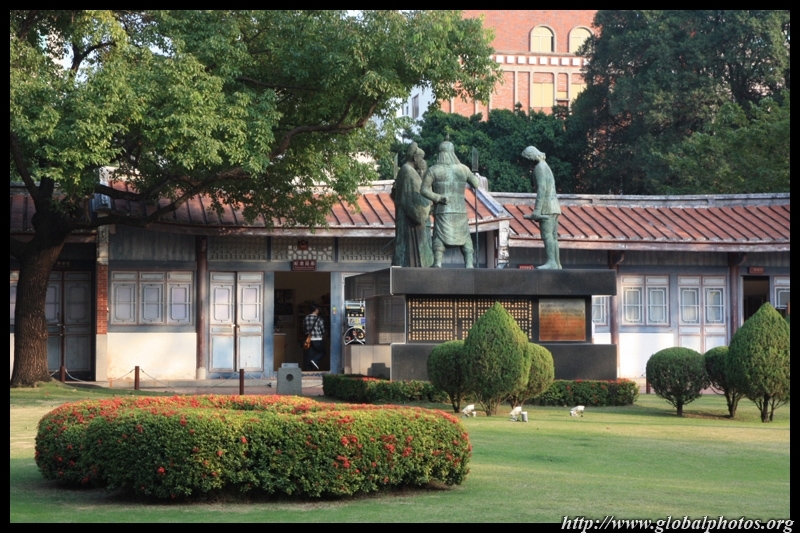 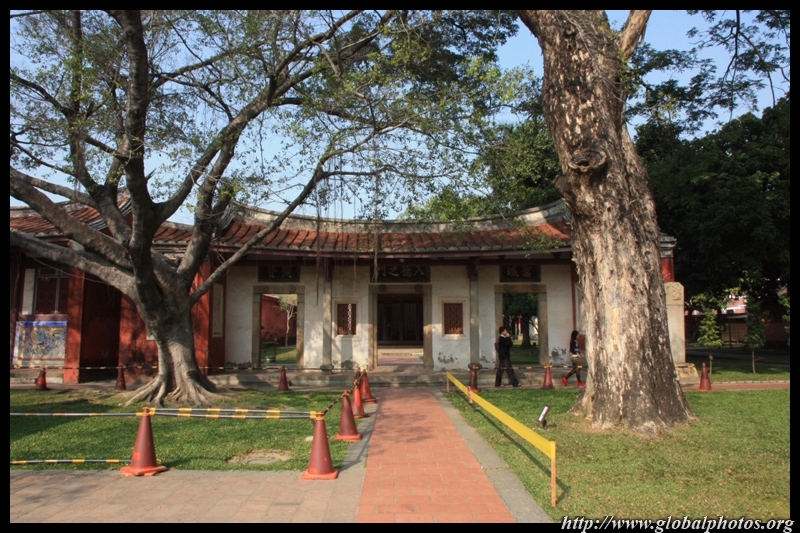 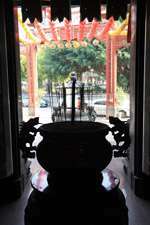 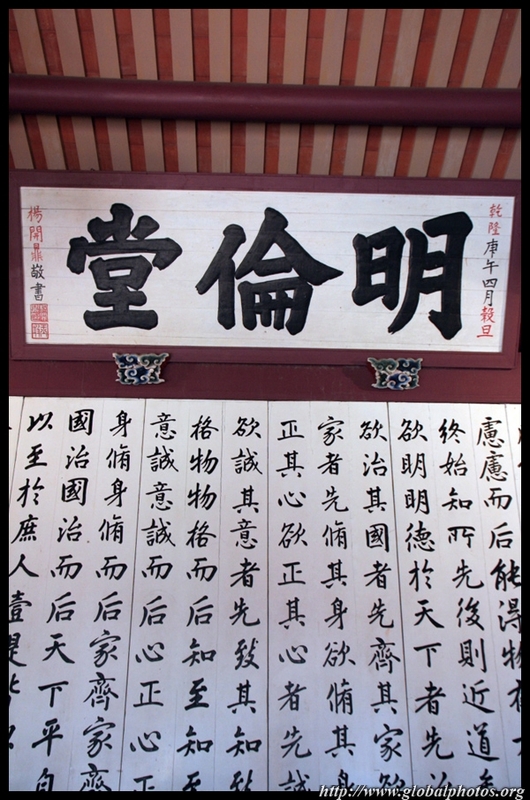 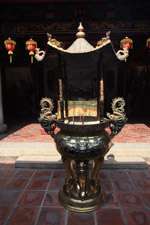 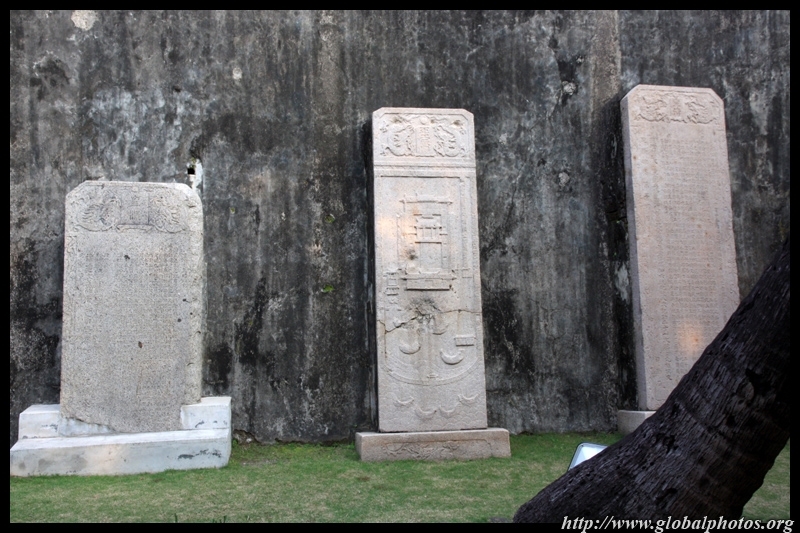 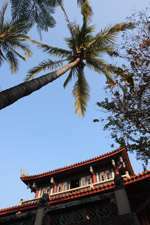 Koxinga Shrine was built in memory of Cheng Cheng Kung, who was a merchant and pirate. He is famous for expelling the Dutch from Taiwan in 1661. 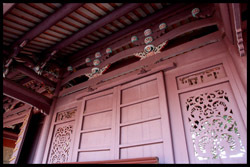 I came across this interesting piece of architecture on the way out of the shrine. 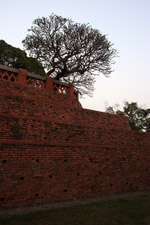 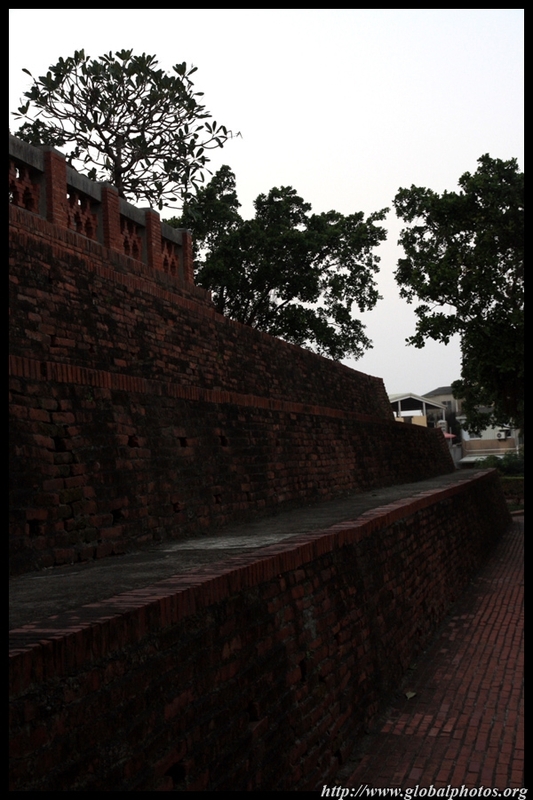 Remnants of the old city wall remain. 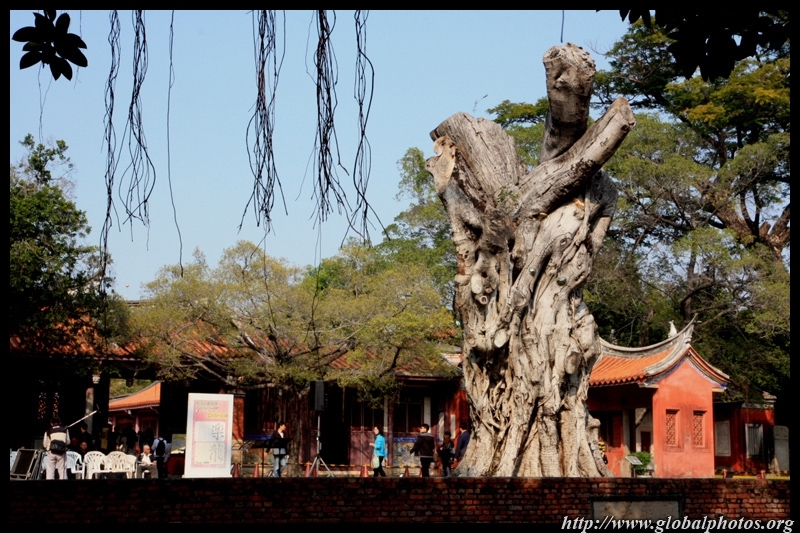 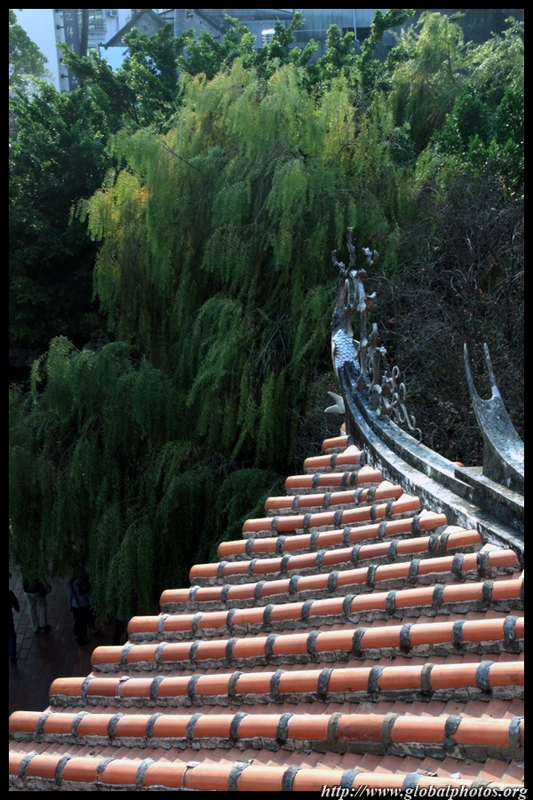 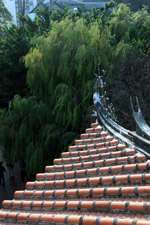 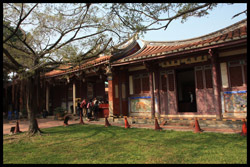 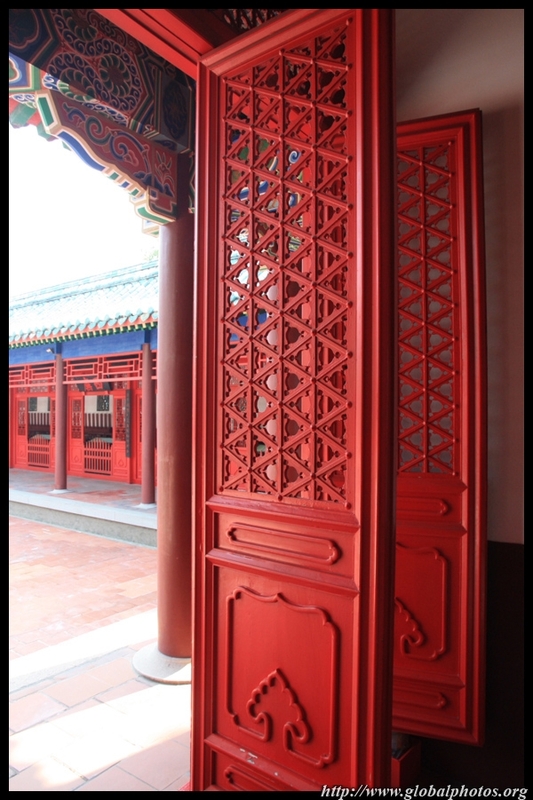 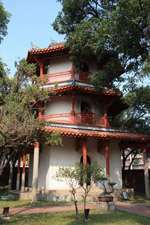 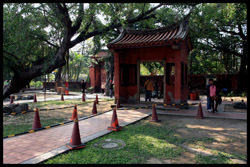 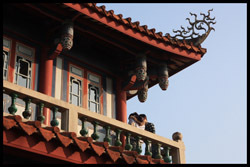 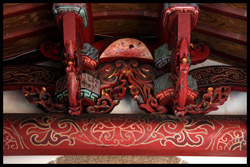 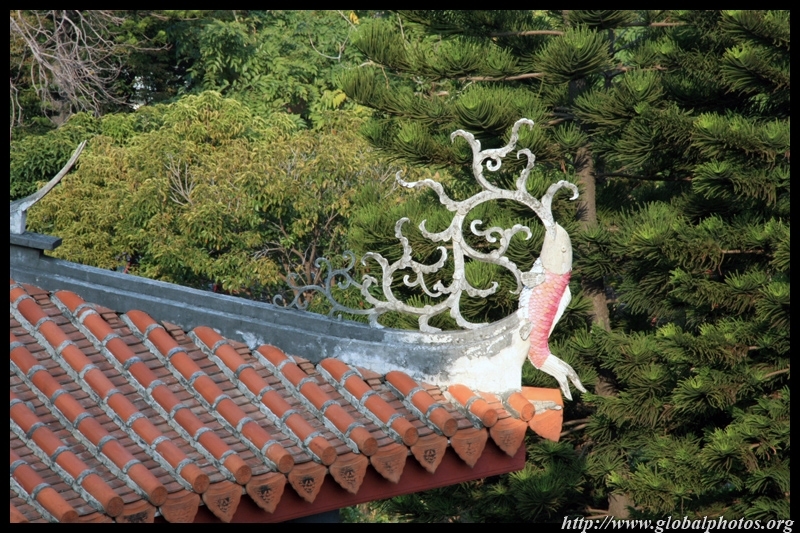 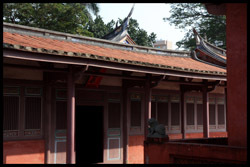 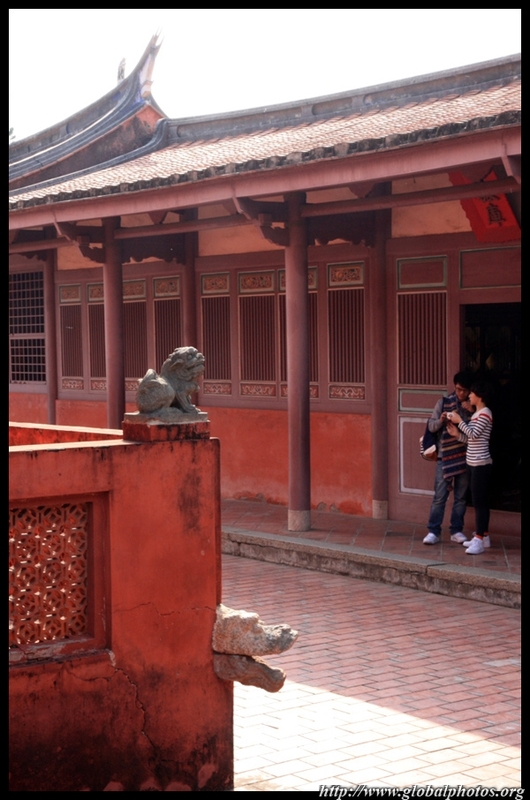 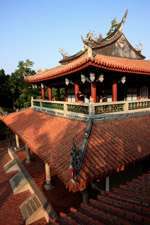 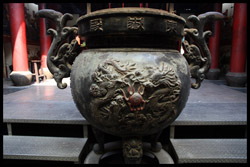 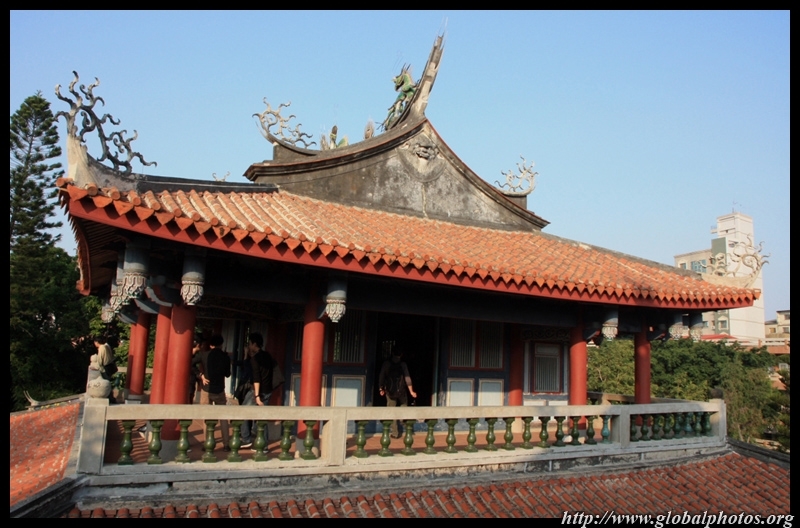 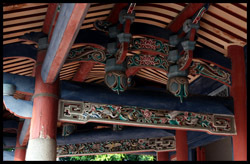 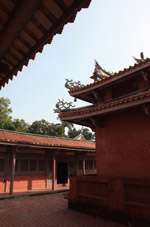 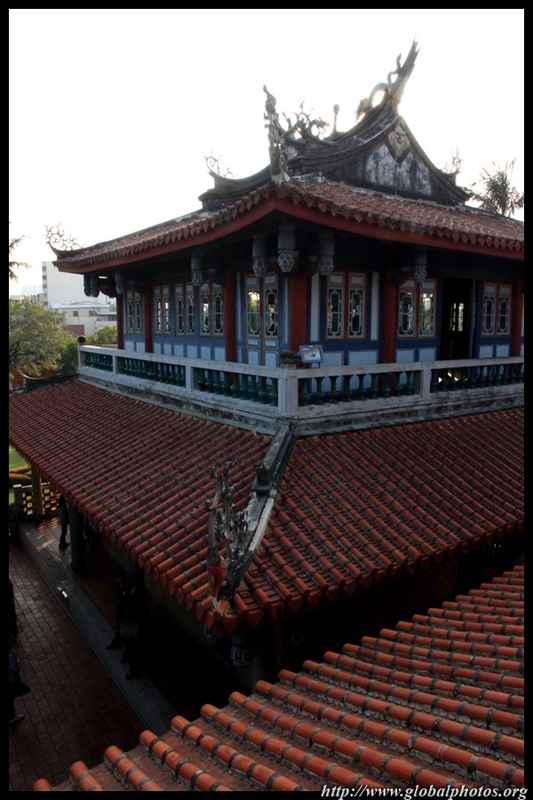 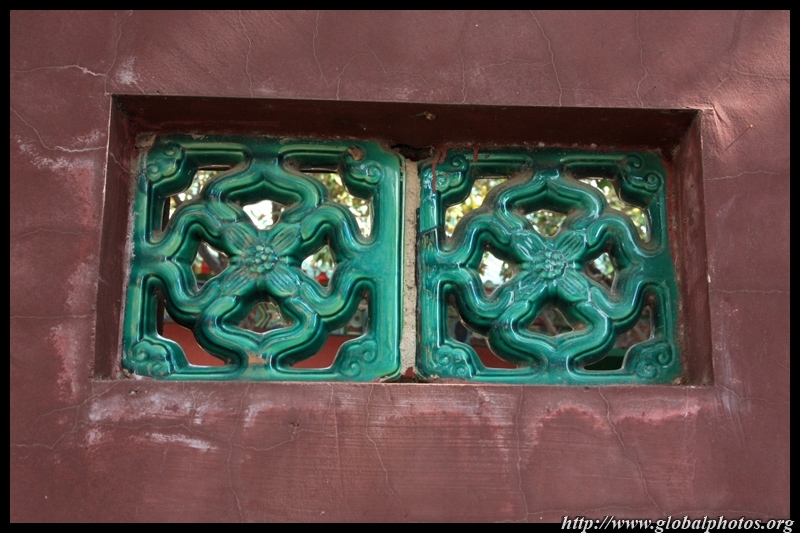 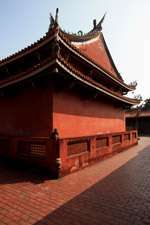 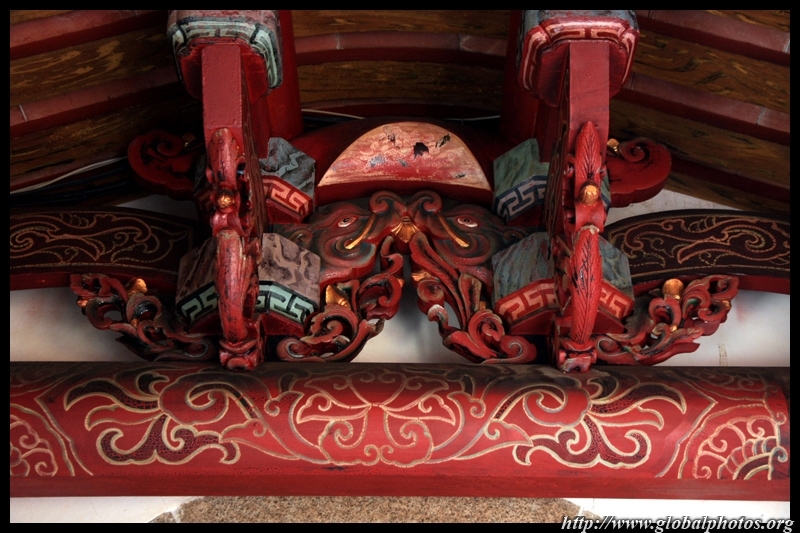 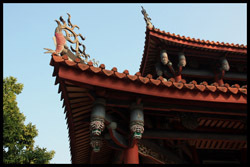 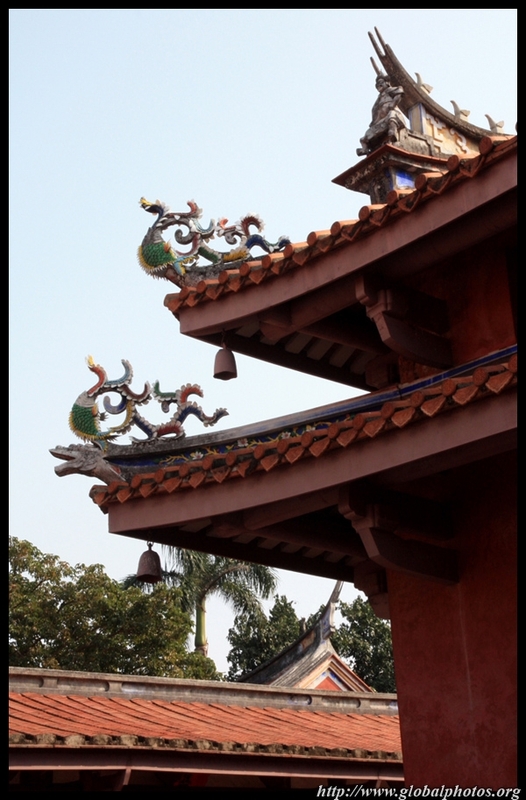 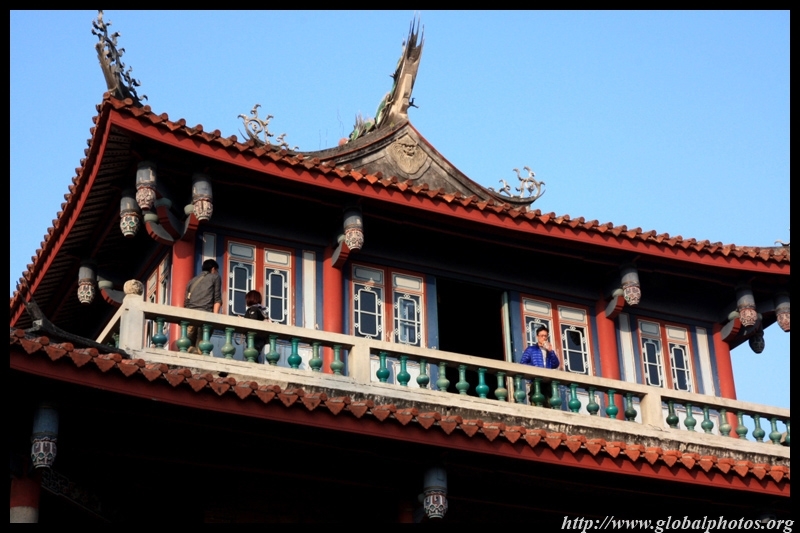 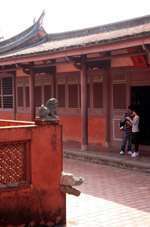 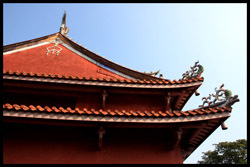 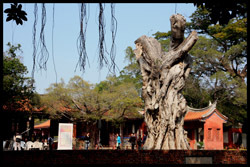 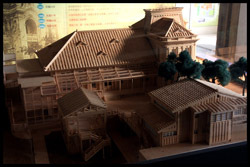 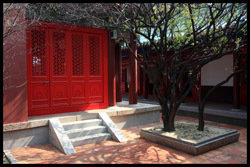 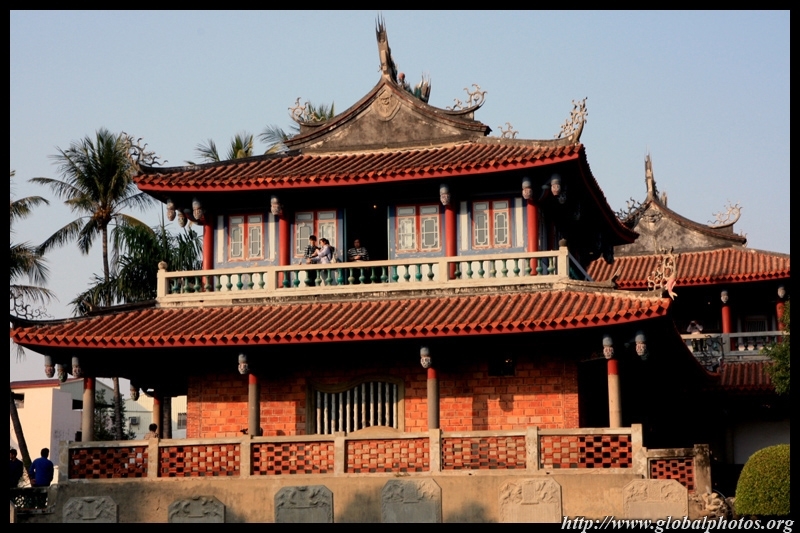 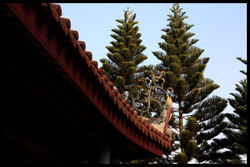 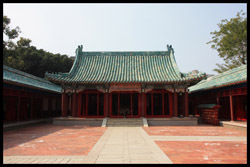 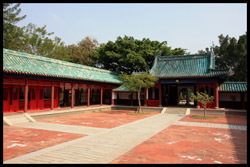 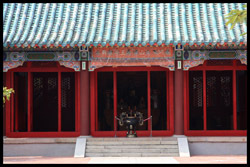 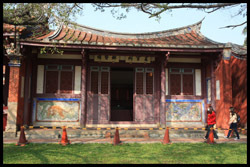 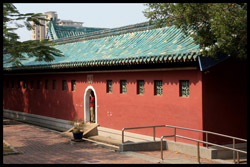 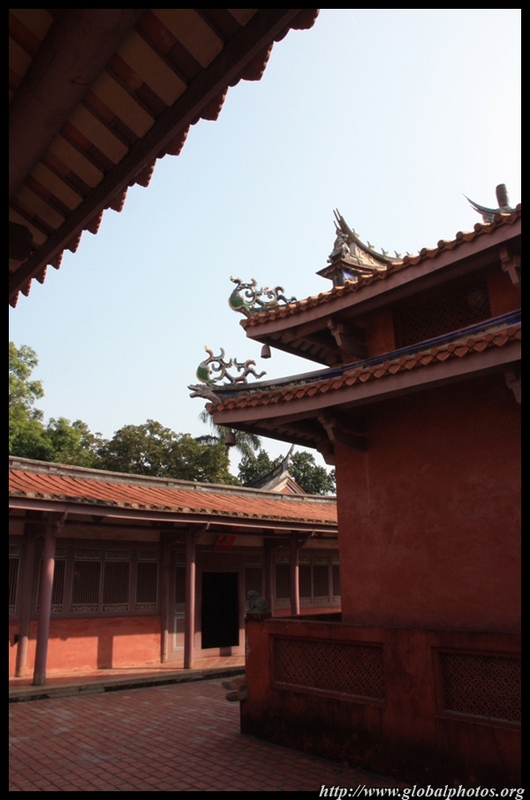 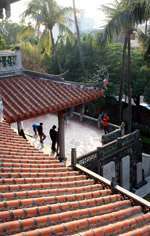 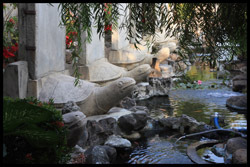 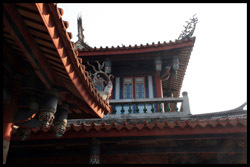 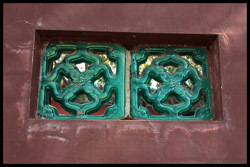 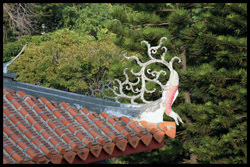 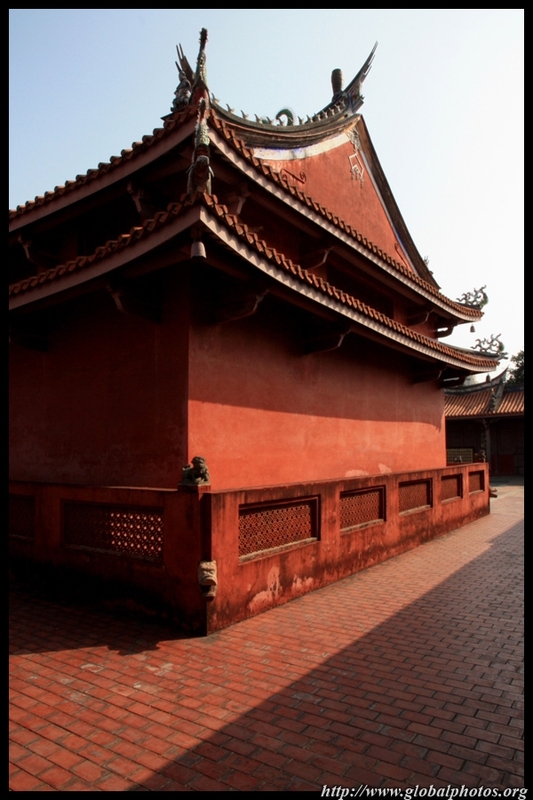 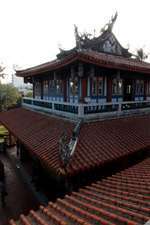 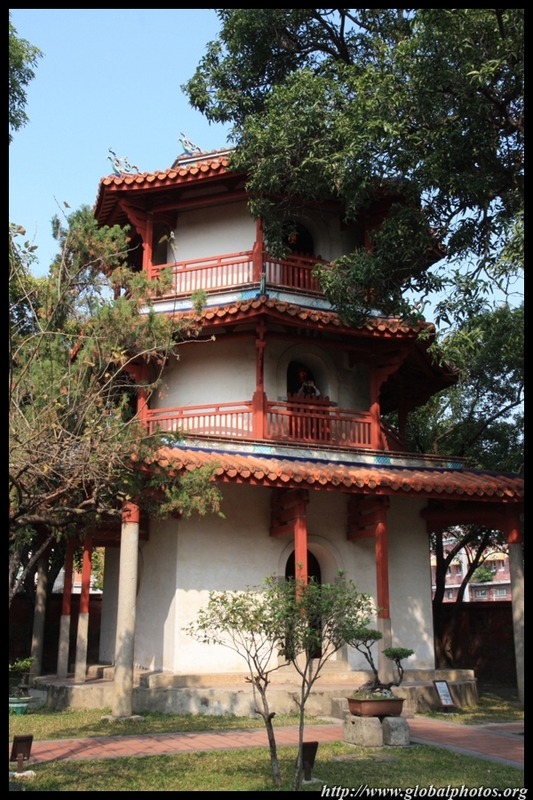 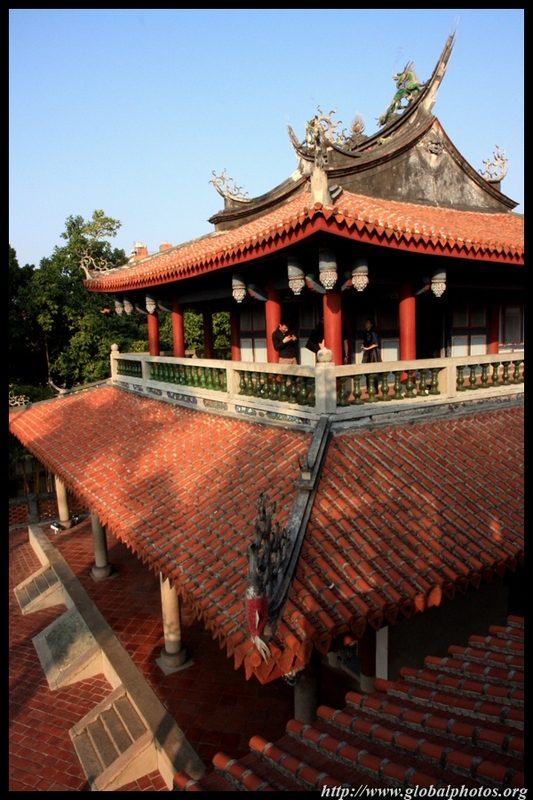 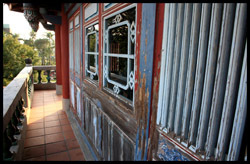 The Confucius Temple was built in 1666, although today's structure reflects multiple reconstructions. 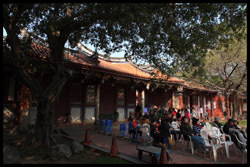 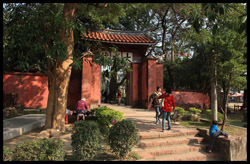 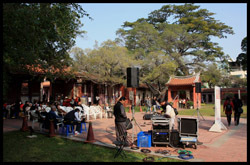 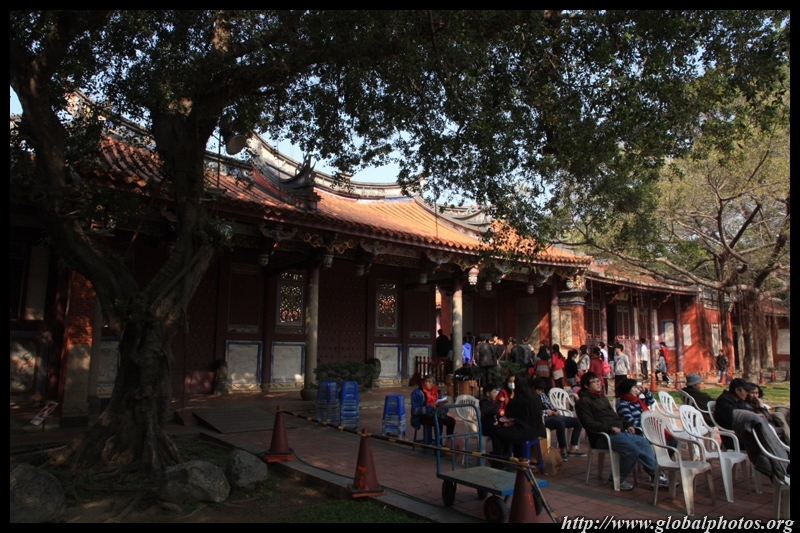 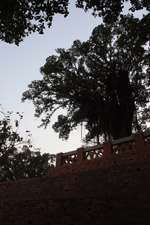 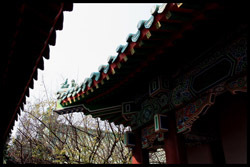 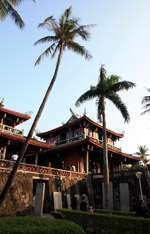 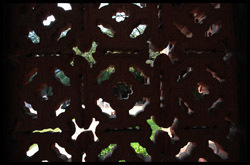 Surrounded by shade and a park, the temple is a popular place to relax and people-watch on weekends. 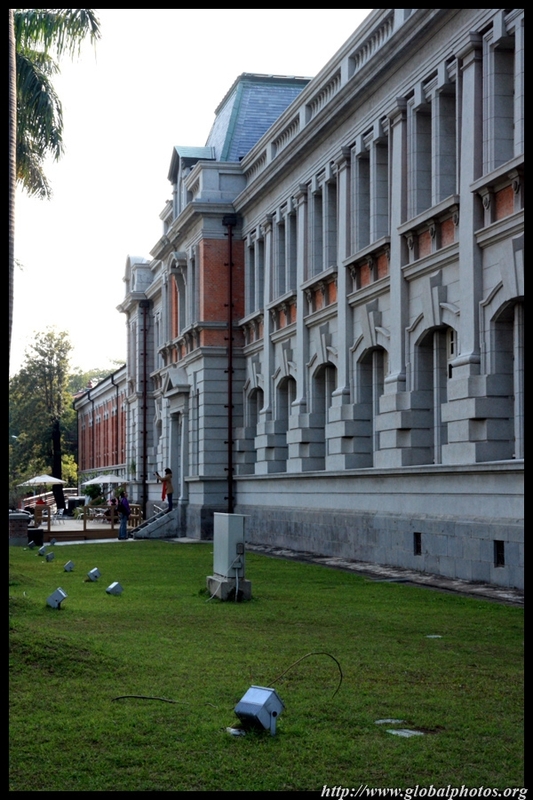 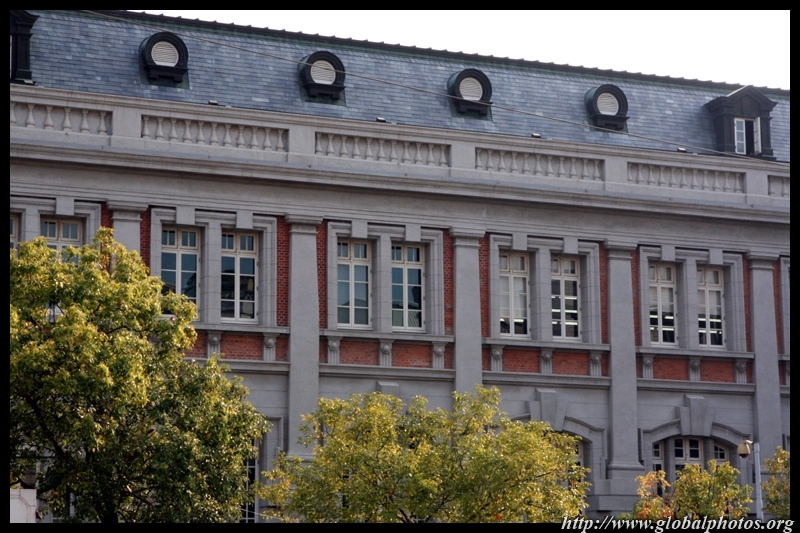 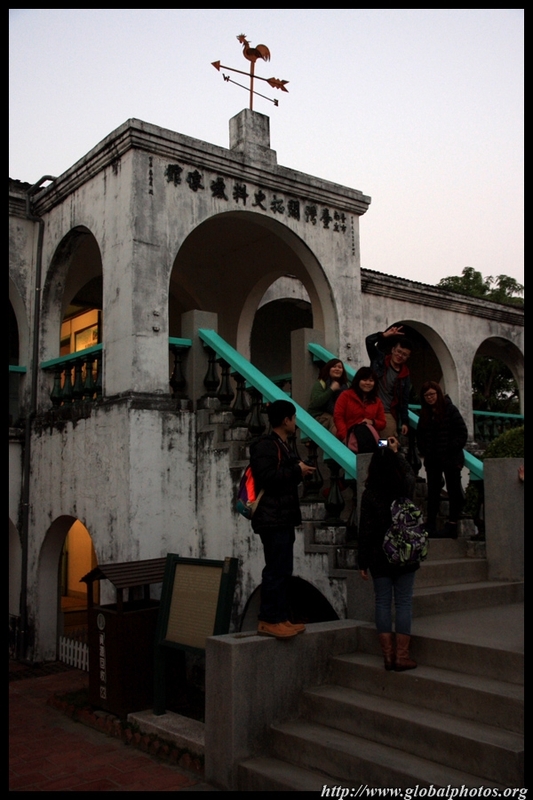 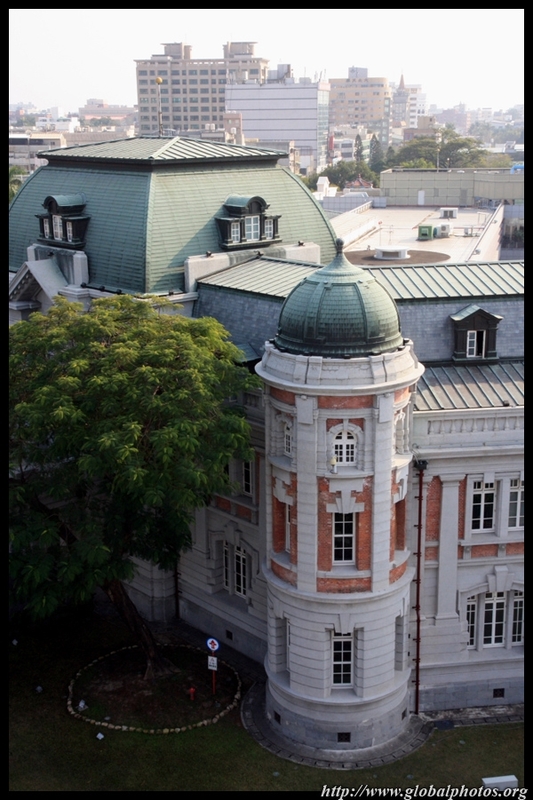 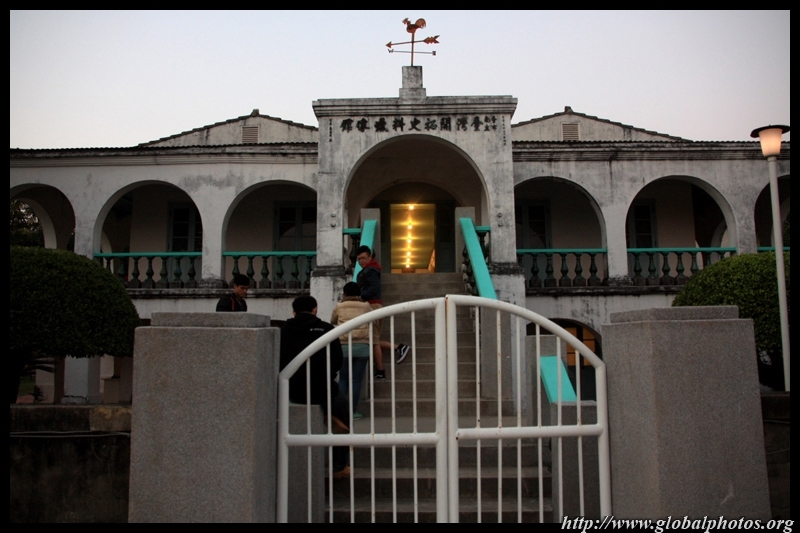 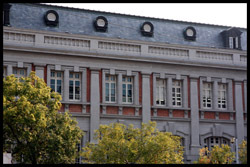 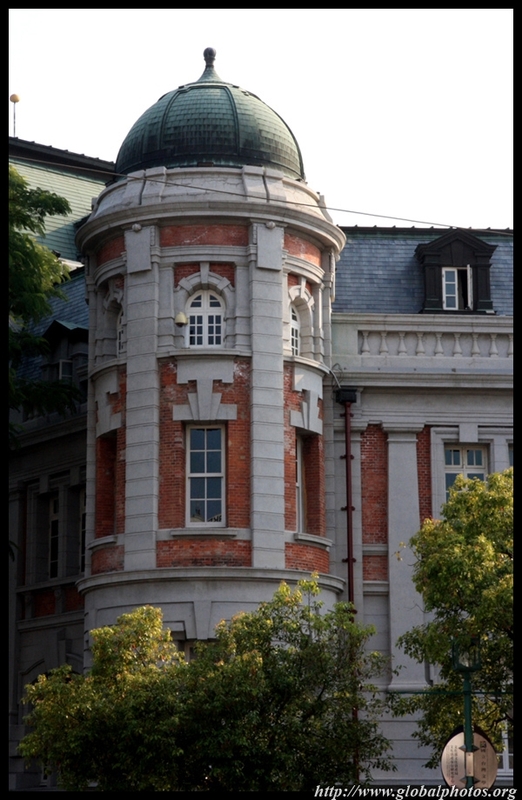 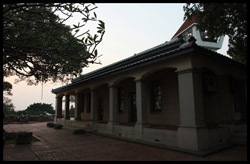 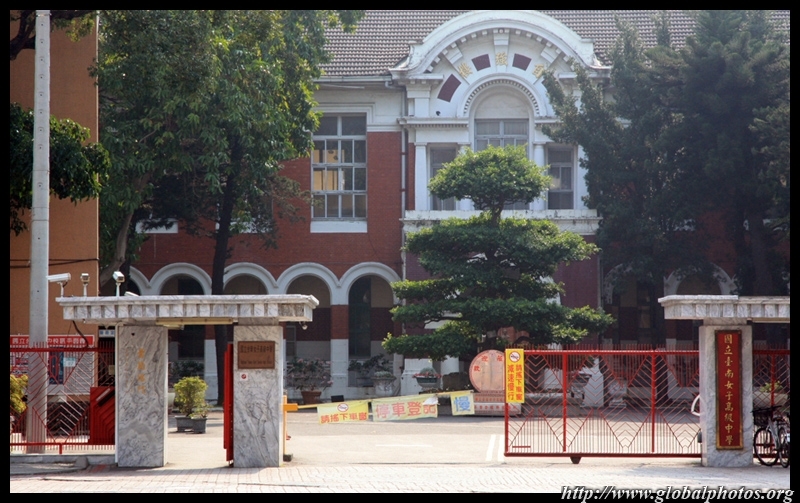 Next to the temple, this high school was built in the Japanese colonial style. 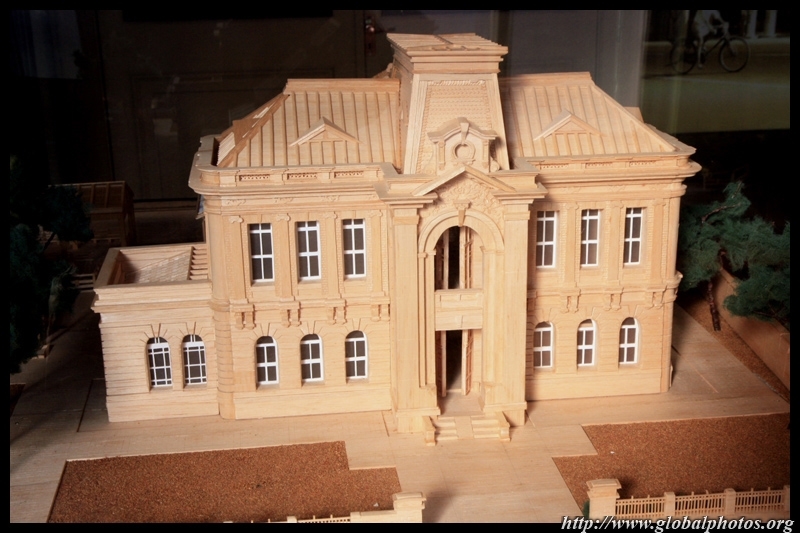 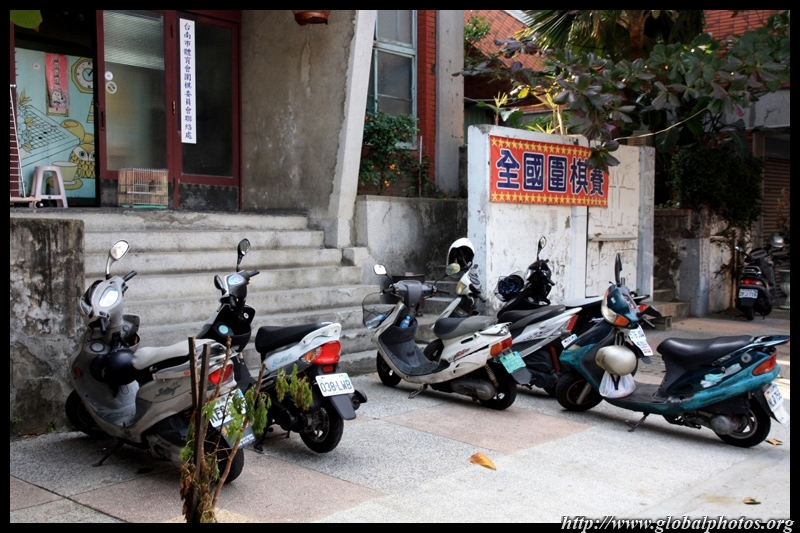 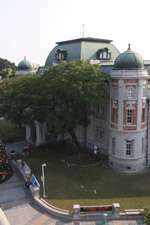 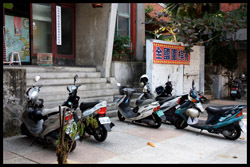 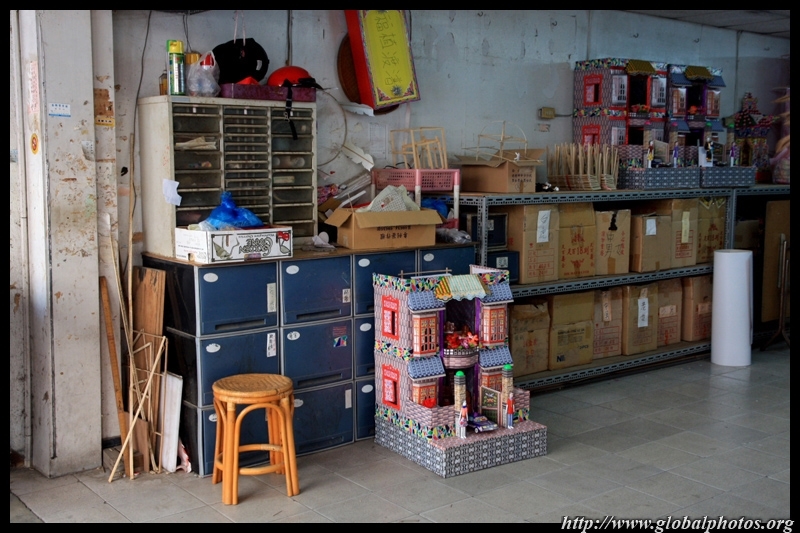 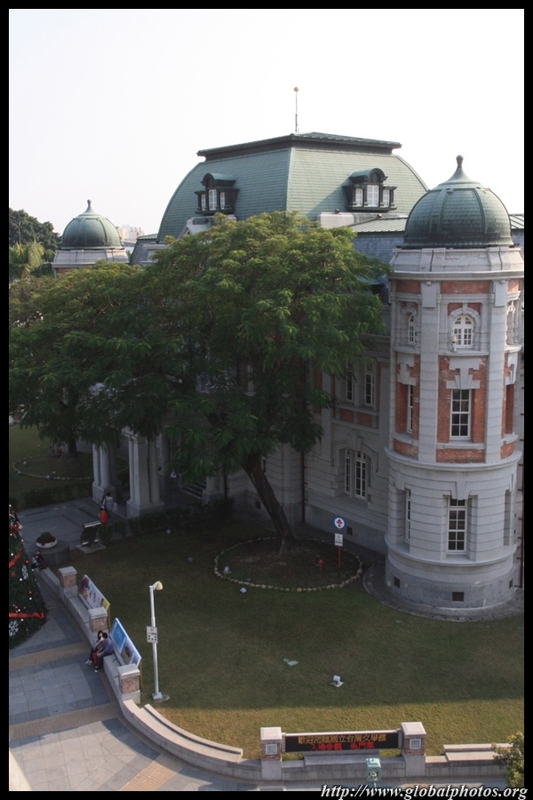 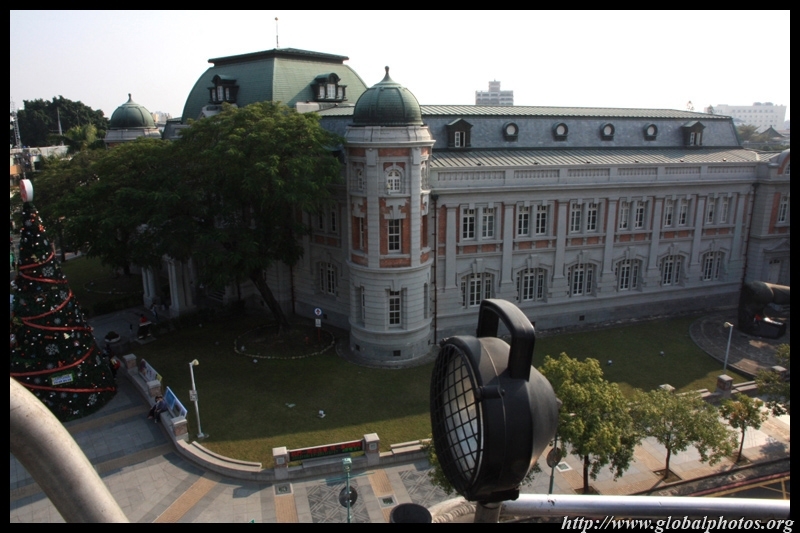 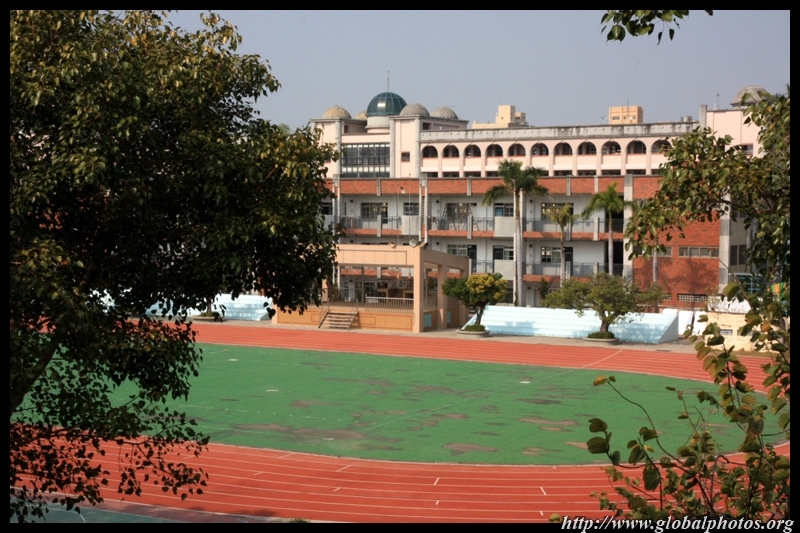 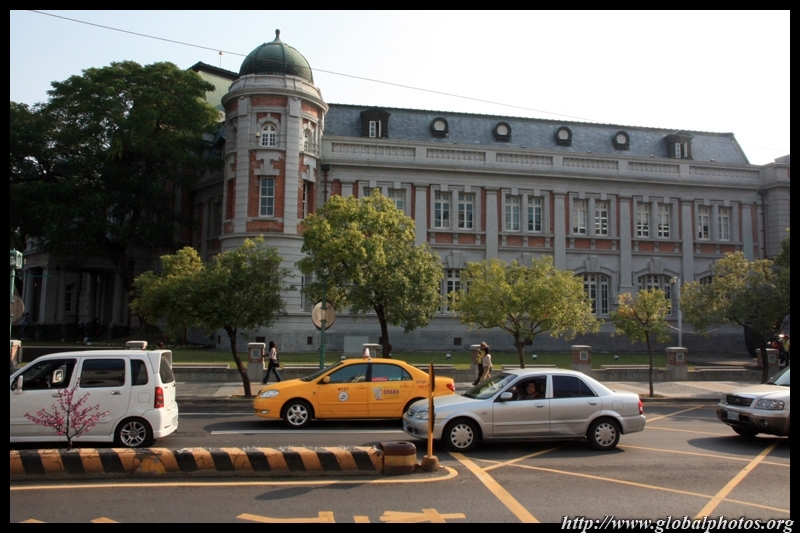 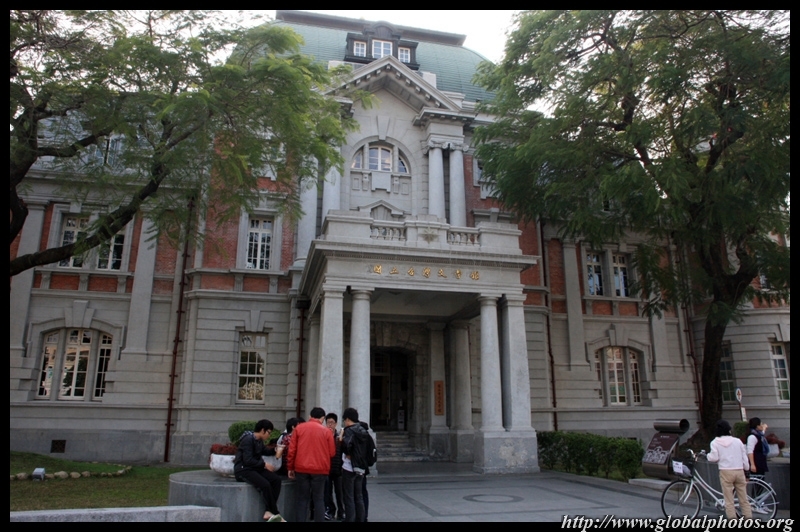 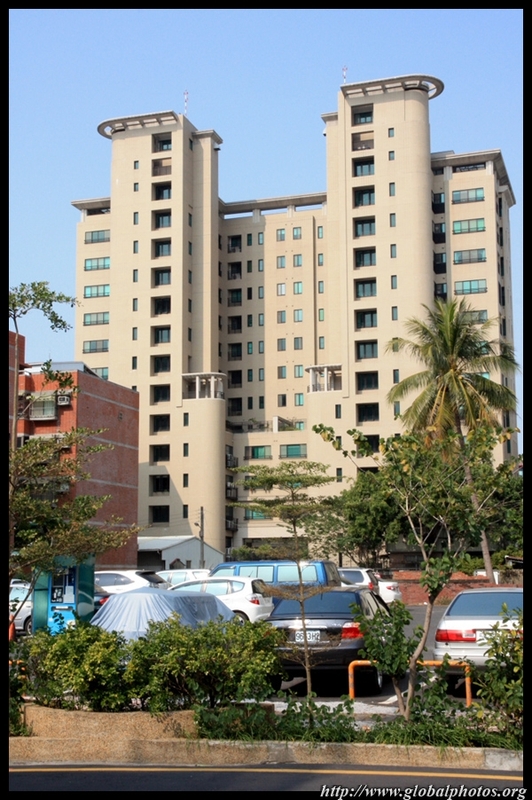 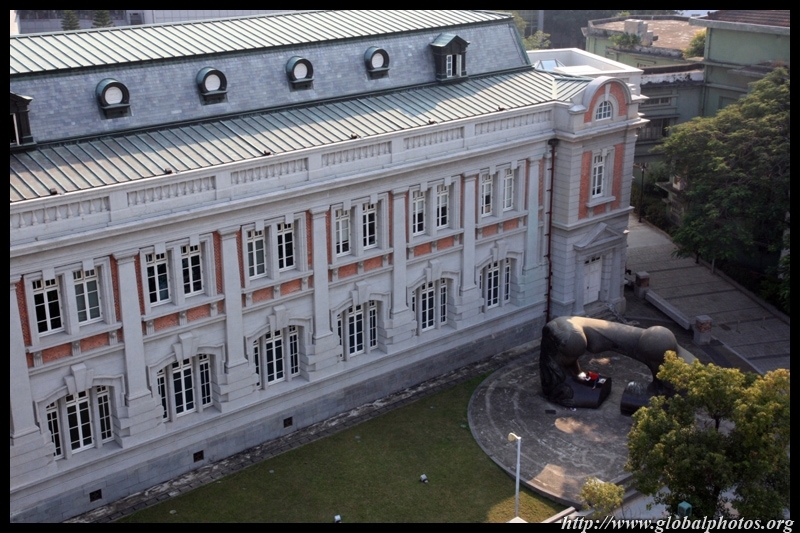 This is Taiwan's first institute of learning. 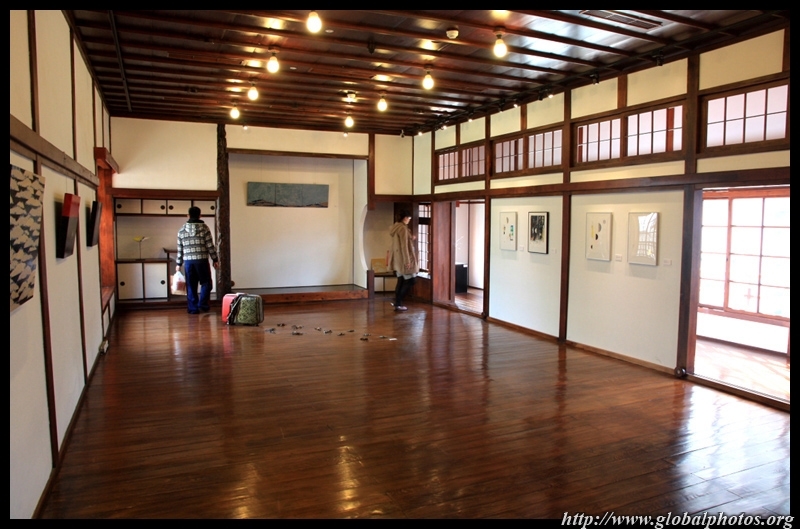 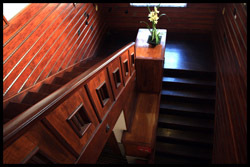 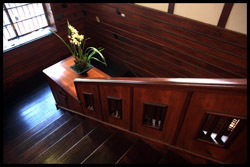 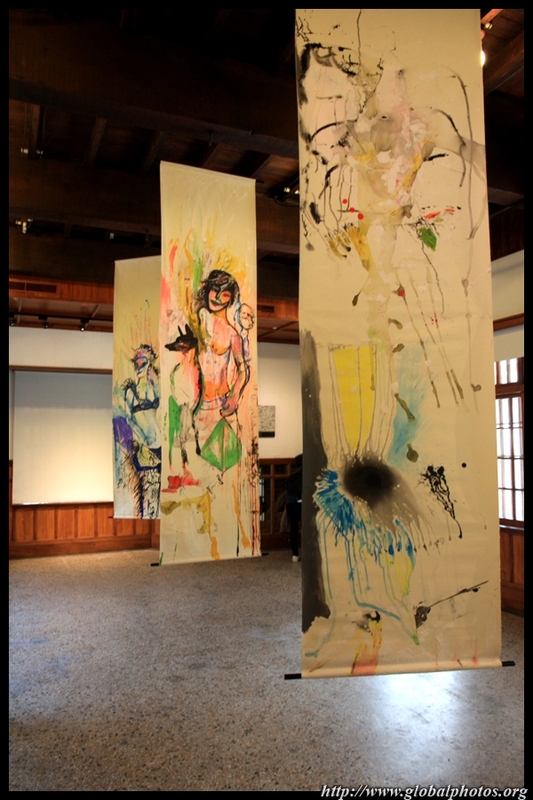 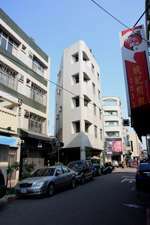 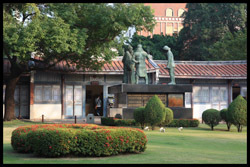 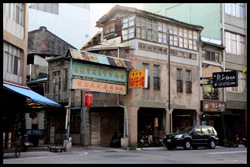 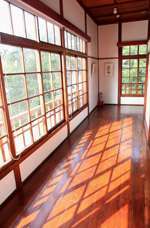 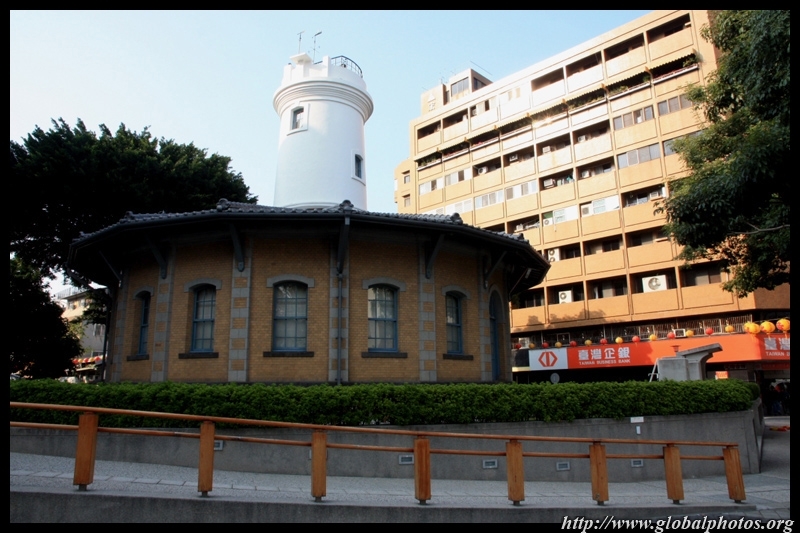 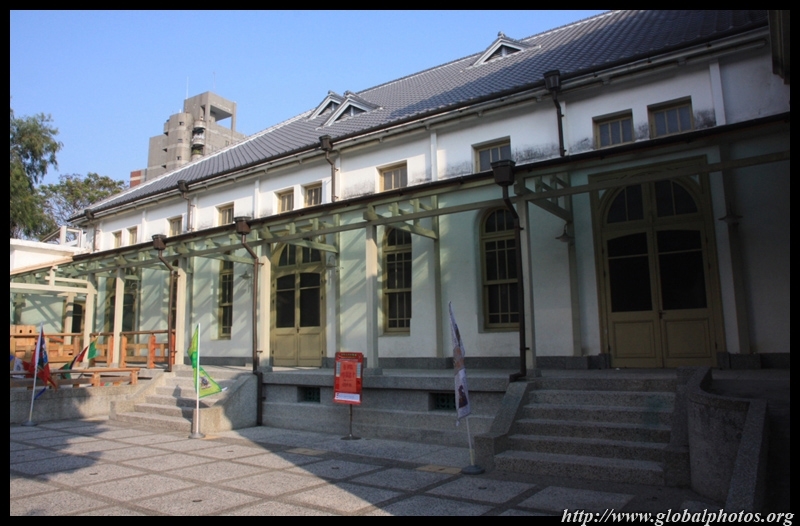 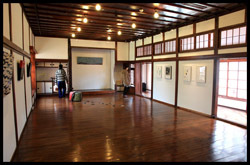 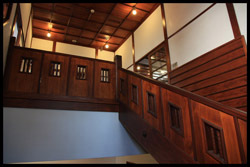 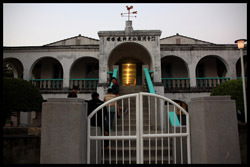 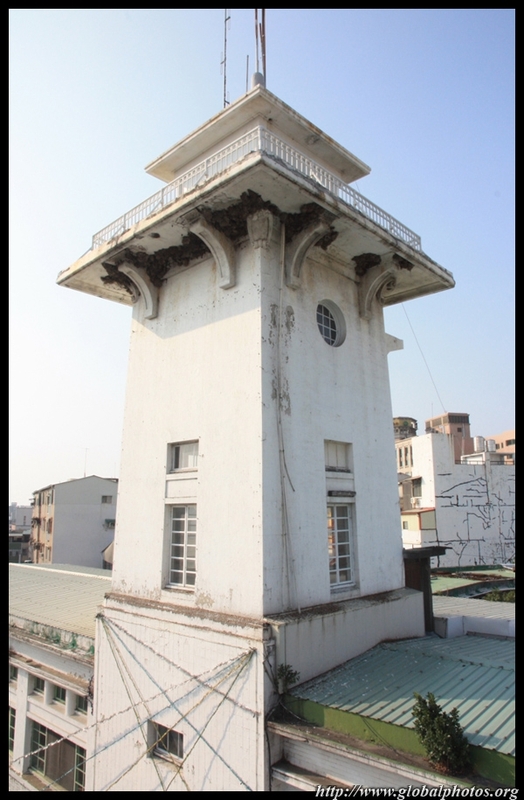 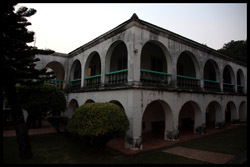 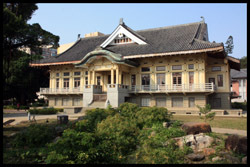 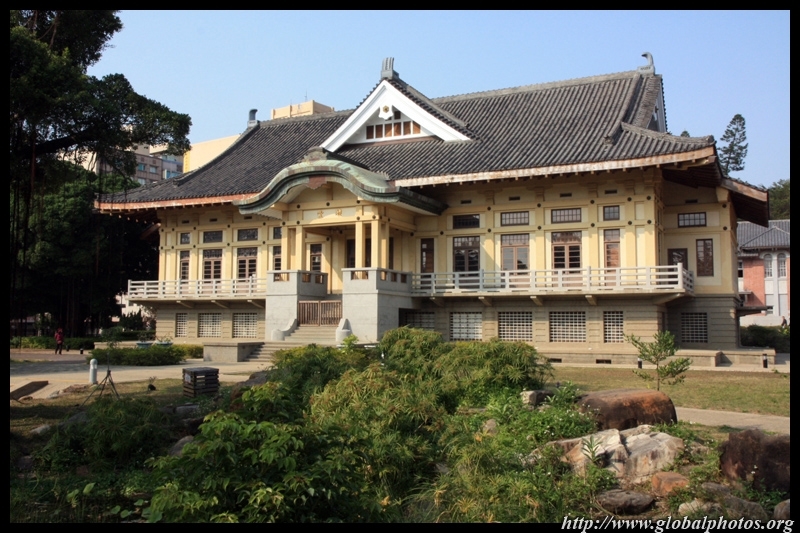 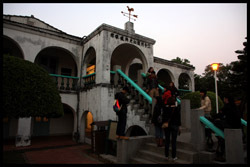 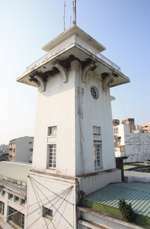 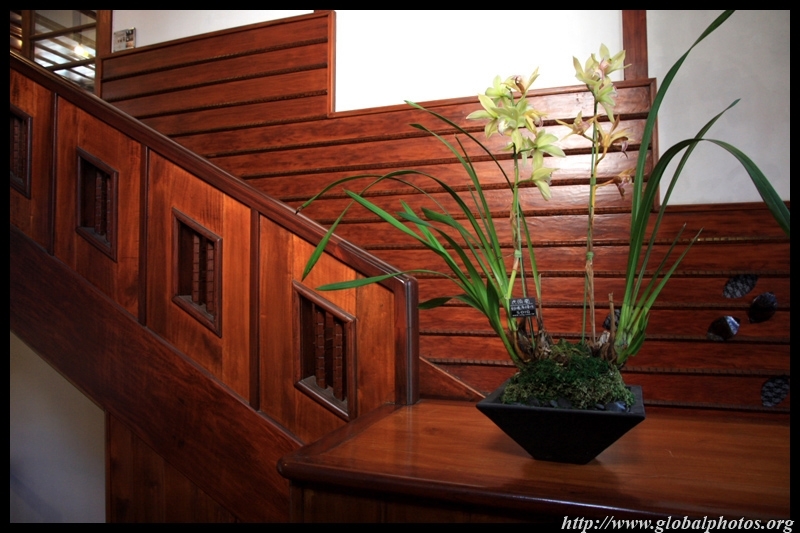 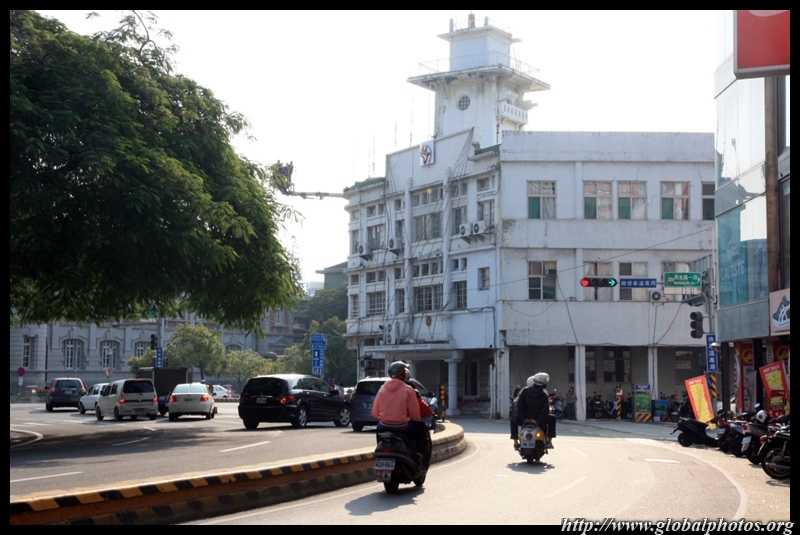 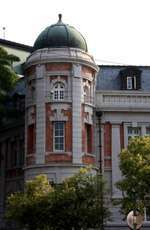 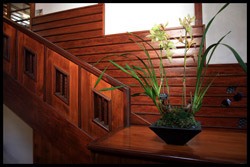 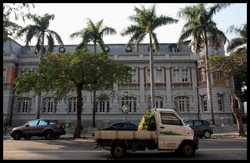 The Old Japanese Patriotic Women's Association building dates from colonial era in the 1920's. 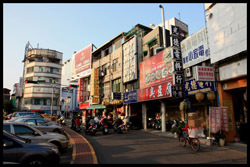 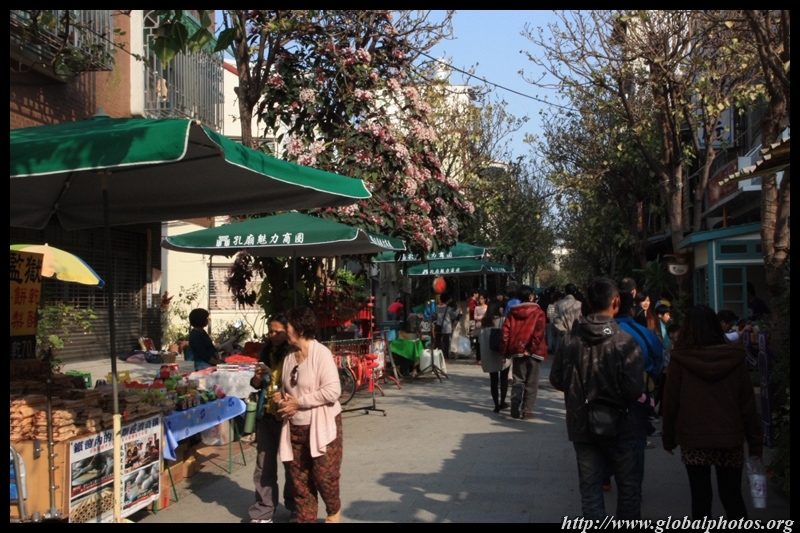 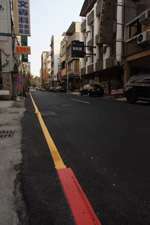 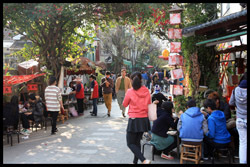 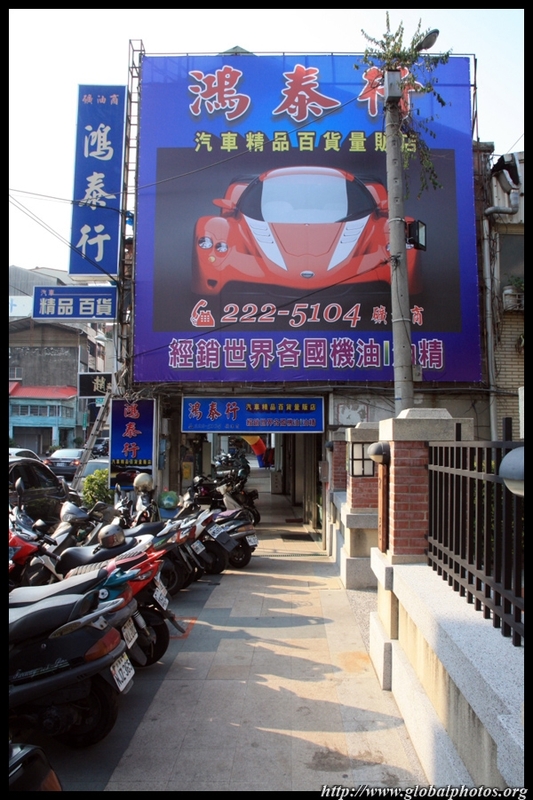 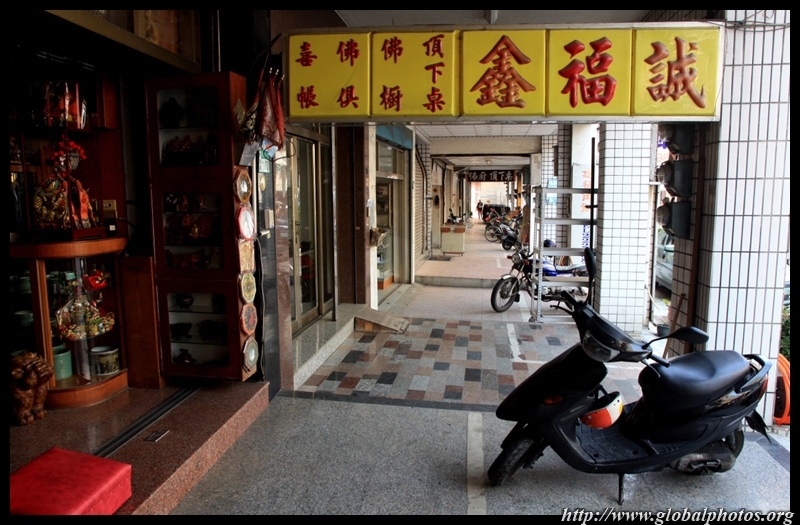 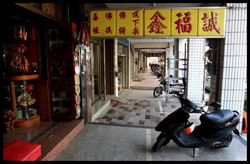 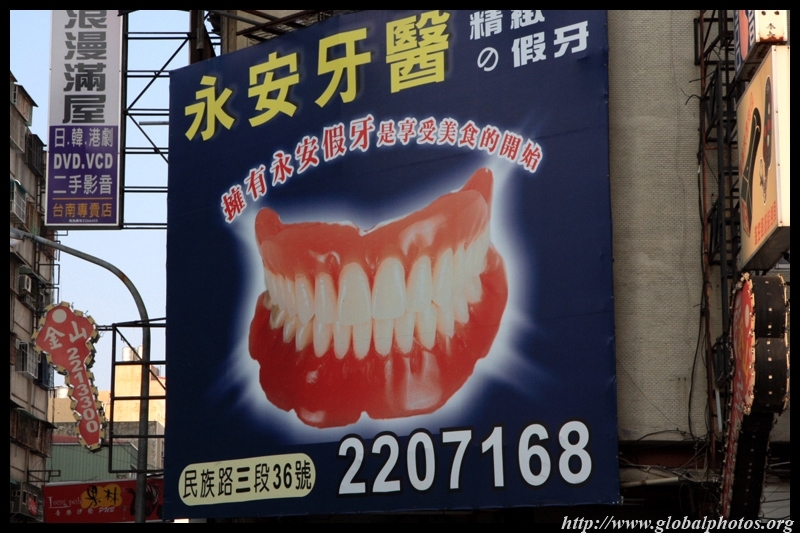 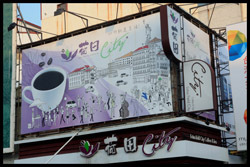 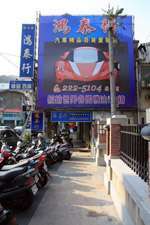 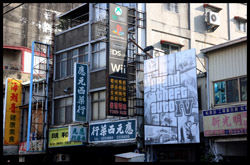 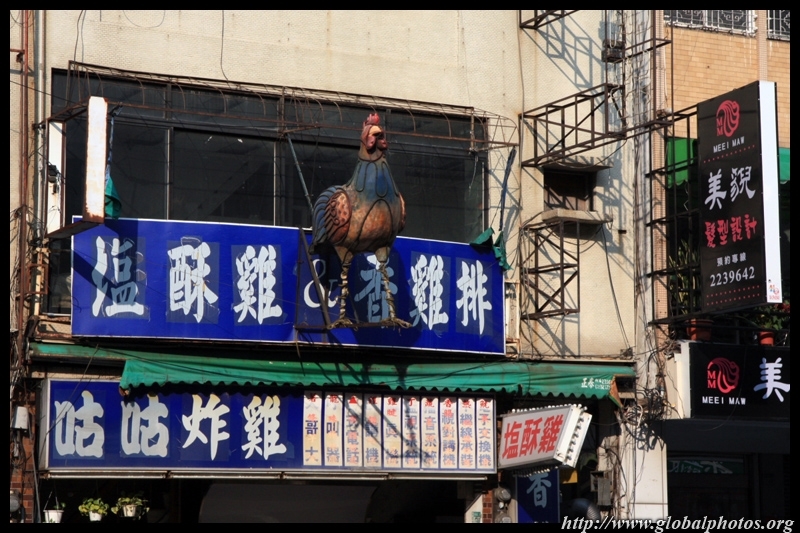 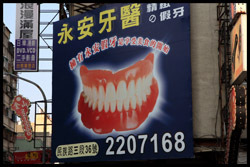 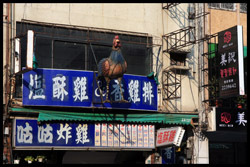 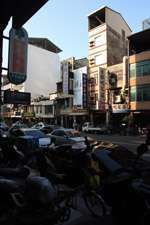 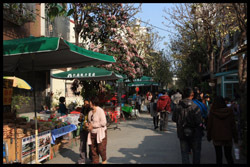 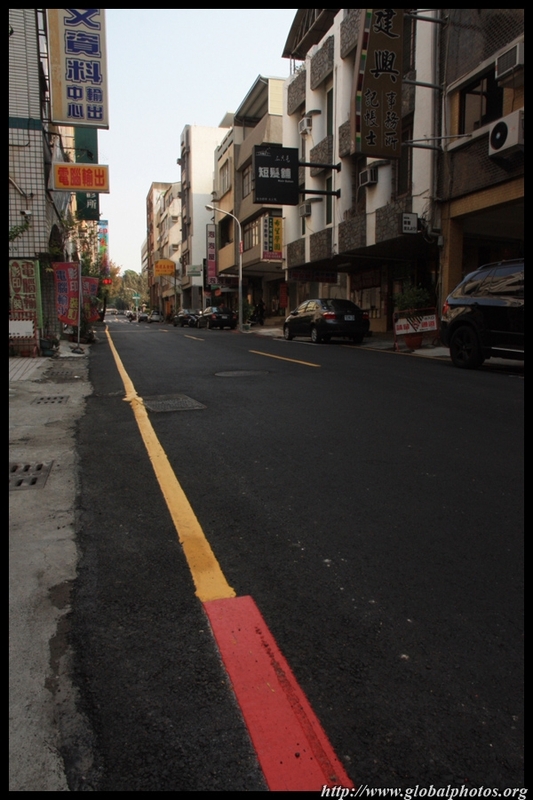 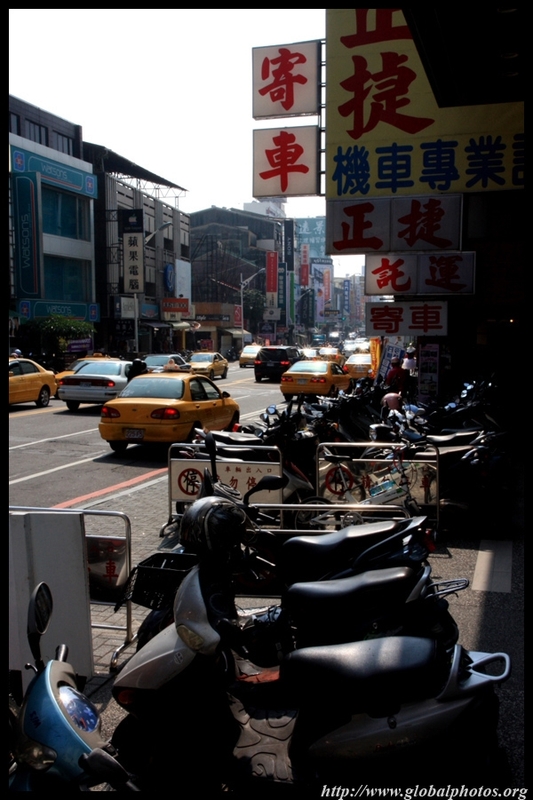 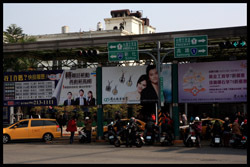 Fuzhong Street nearby is pedestrianlized with lots of shops and eateries. 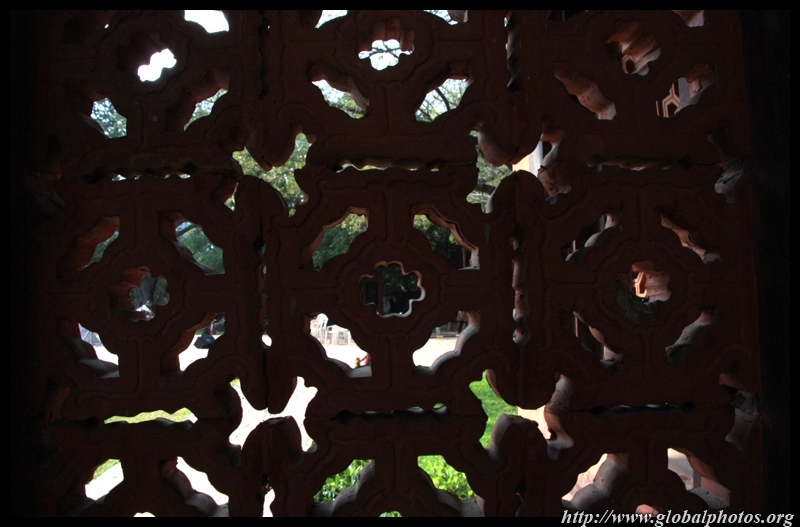 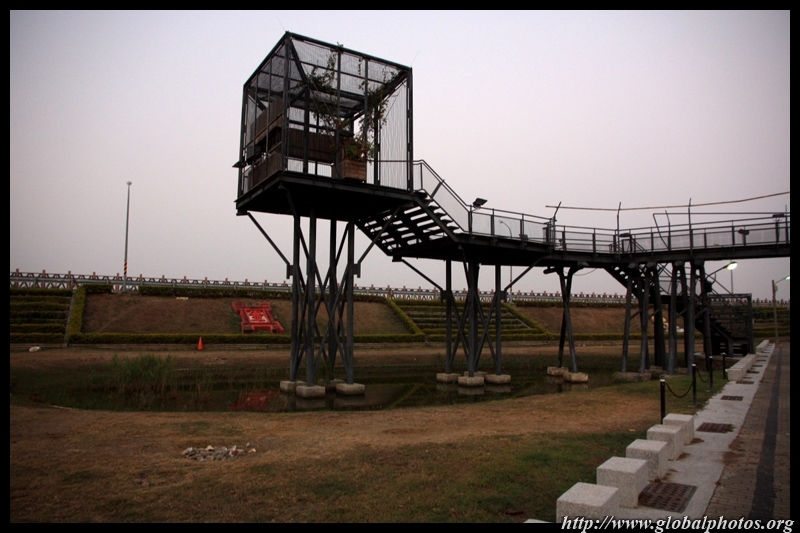 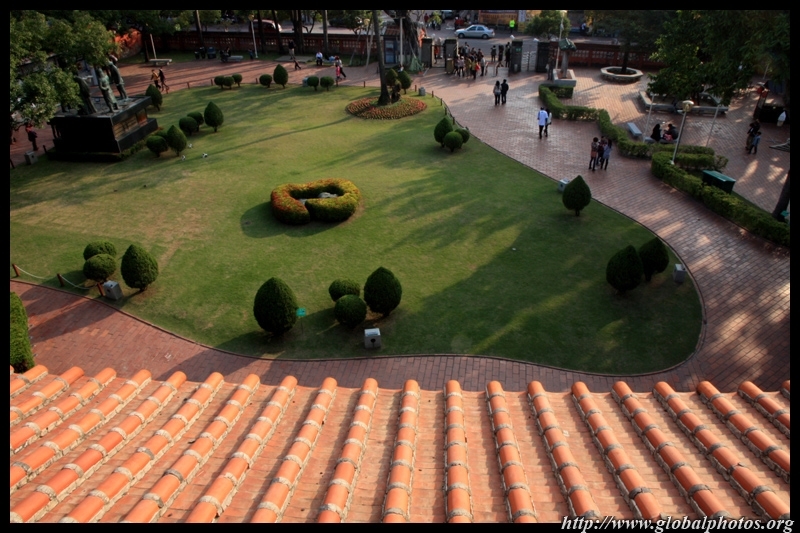 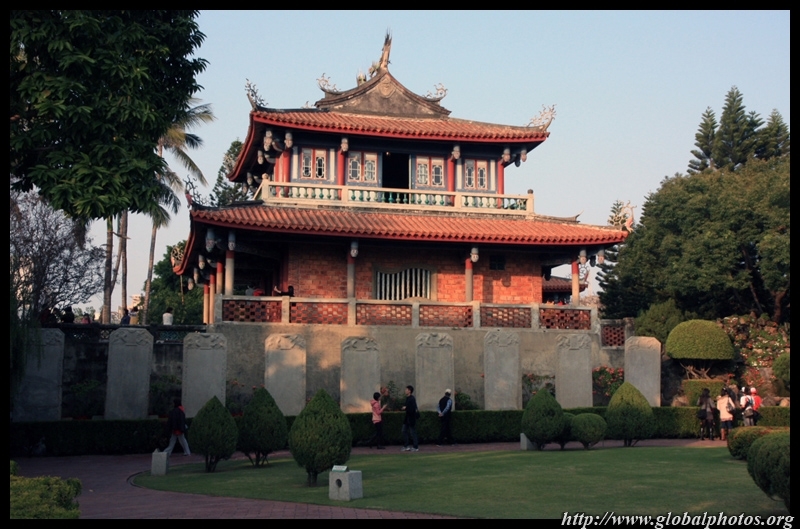 Tangdejhang Commemoration Park is a huge traffic circle that is bounded by some interesting architecture. 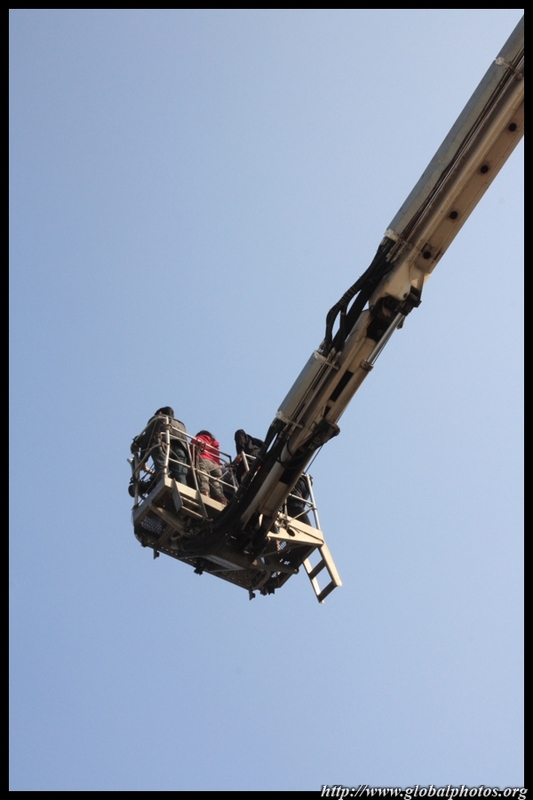 The fire department was hosting an open house as it was January 19, which represents the emergency phone number. Visitors could ride the ladder above the traffic circle. 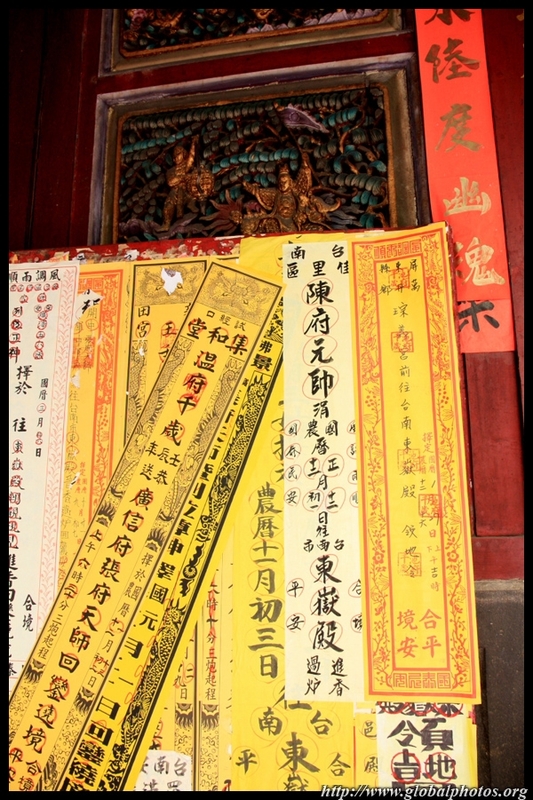 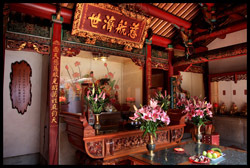 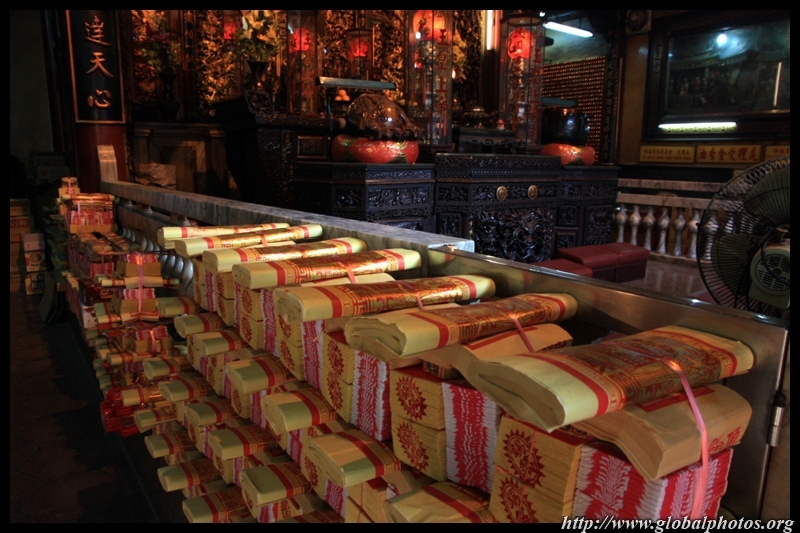 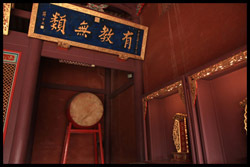 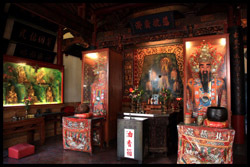 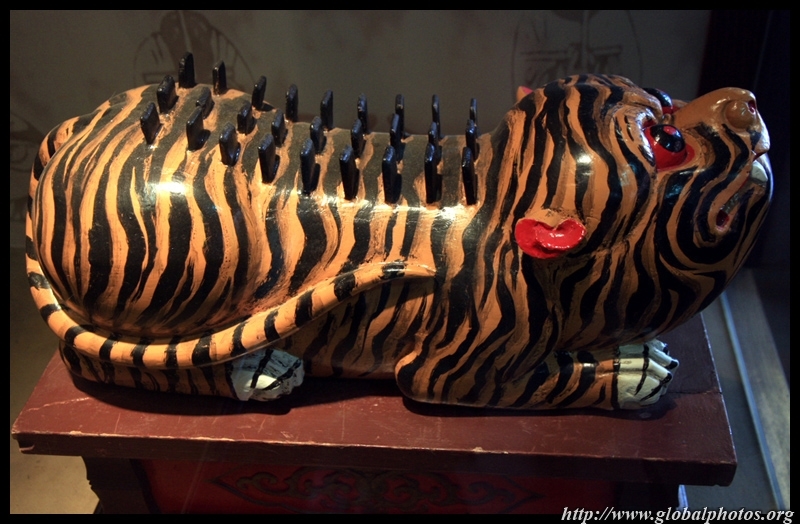 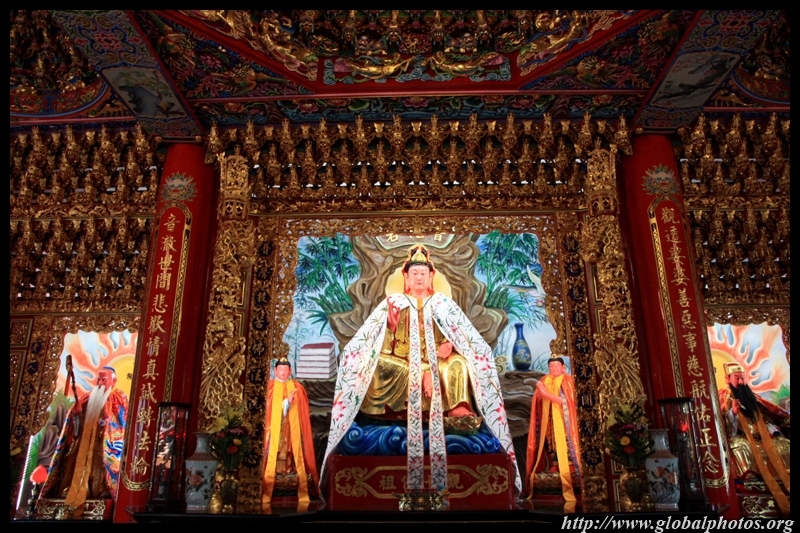 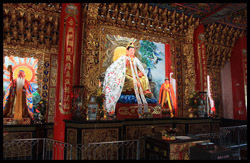 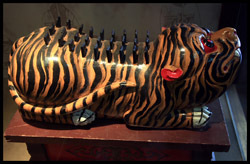 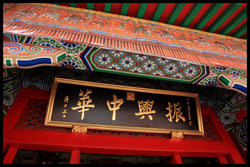 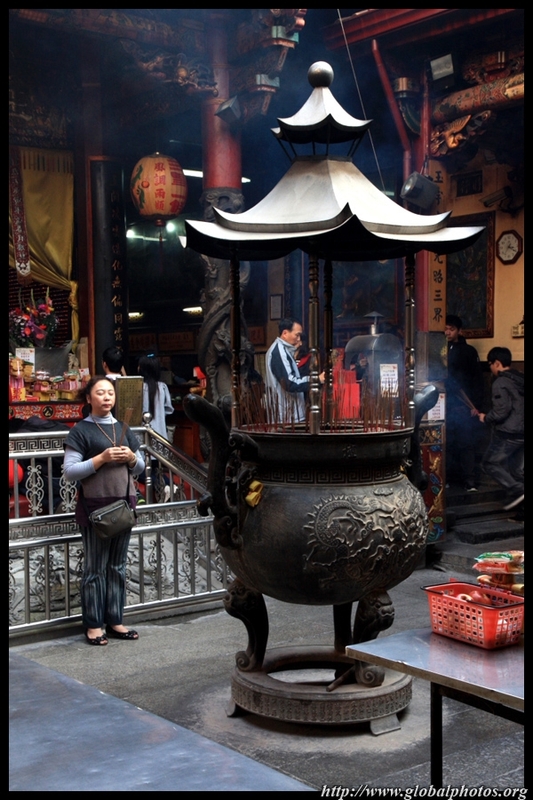 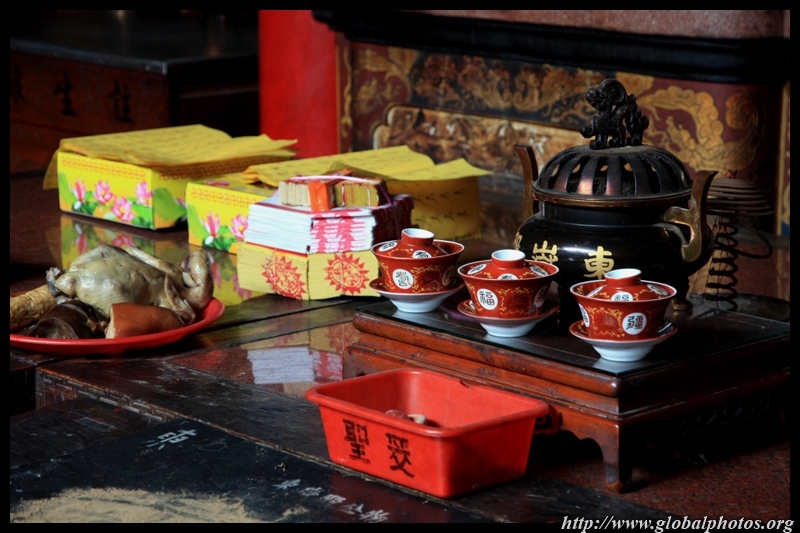 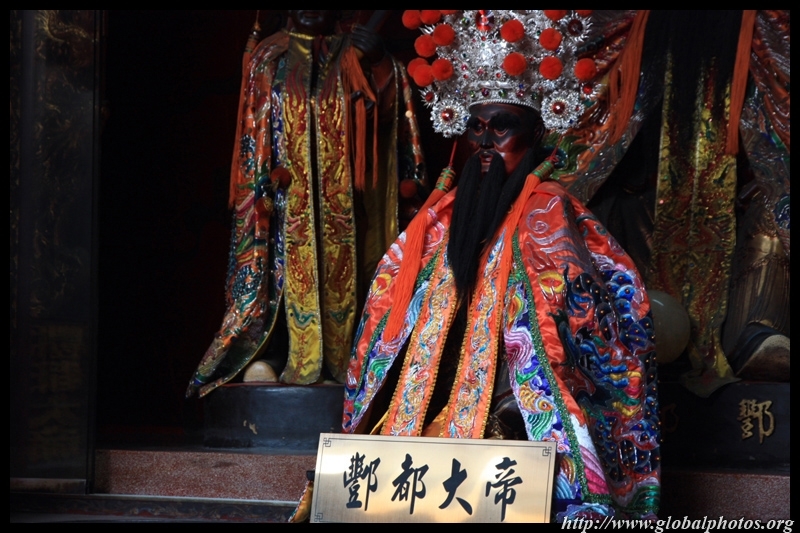 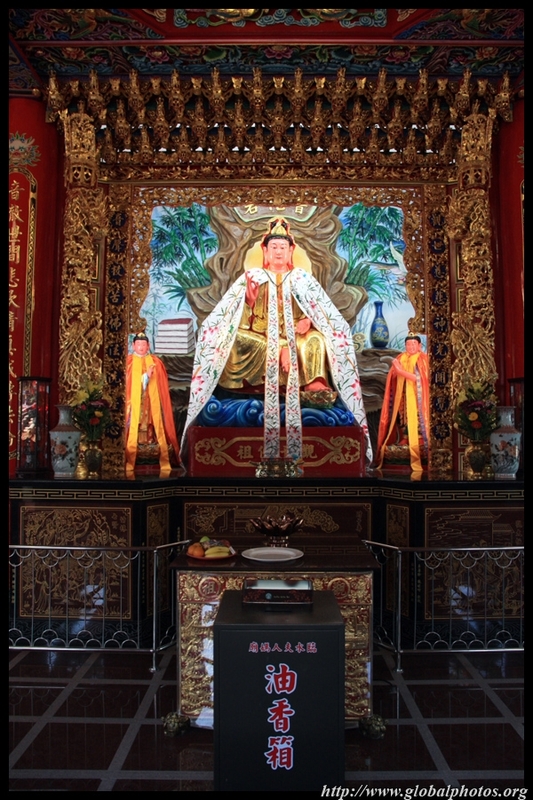 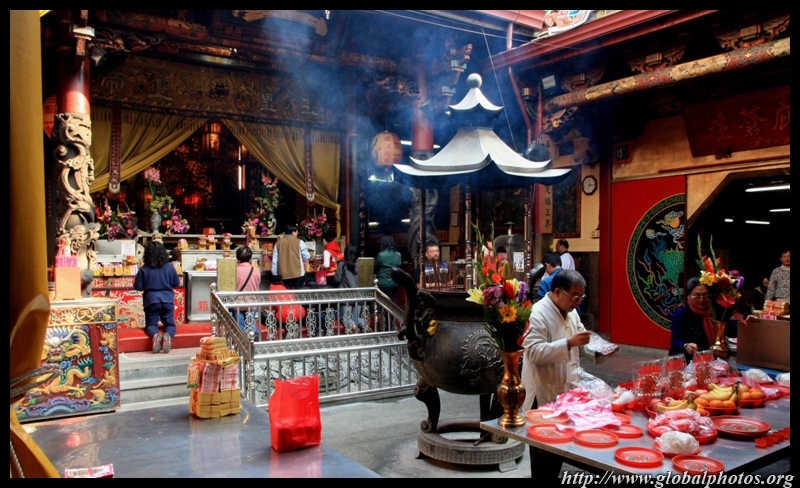 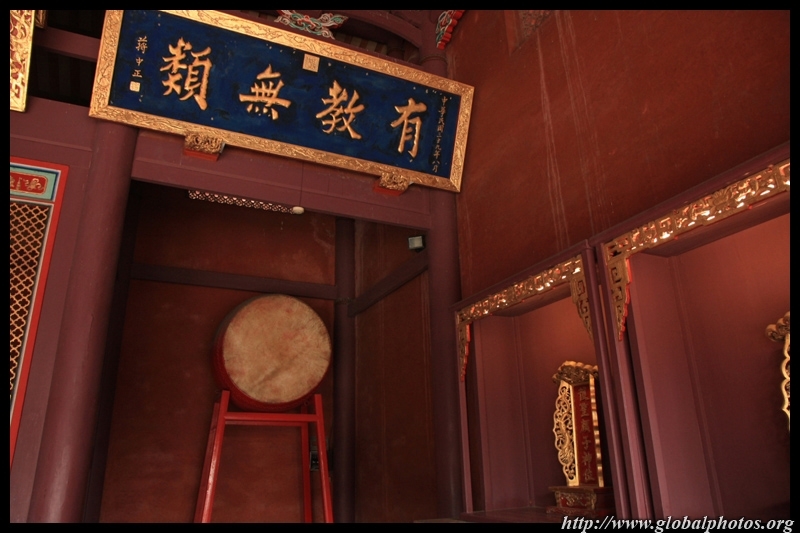 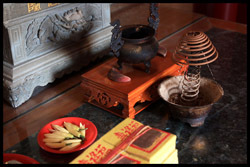 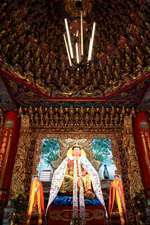 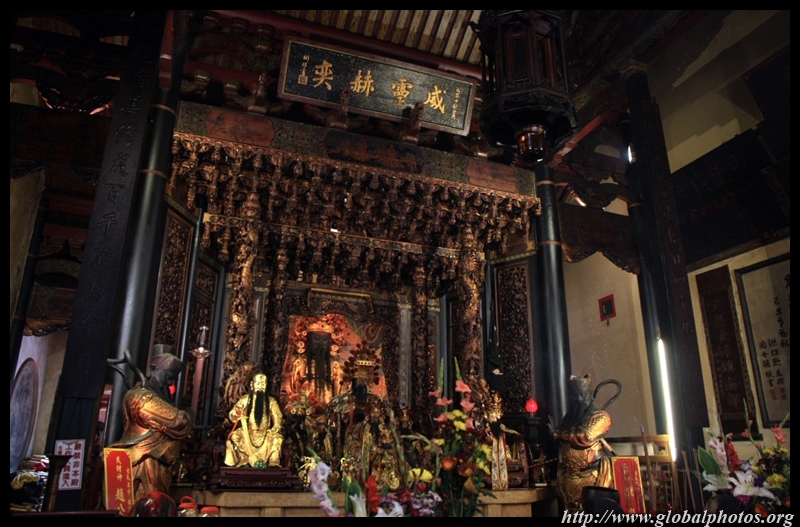 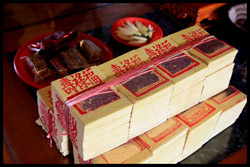 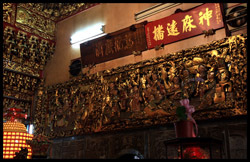 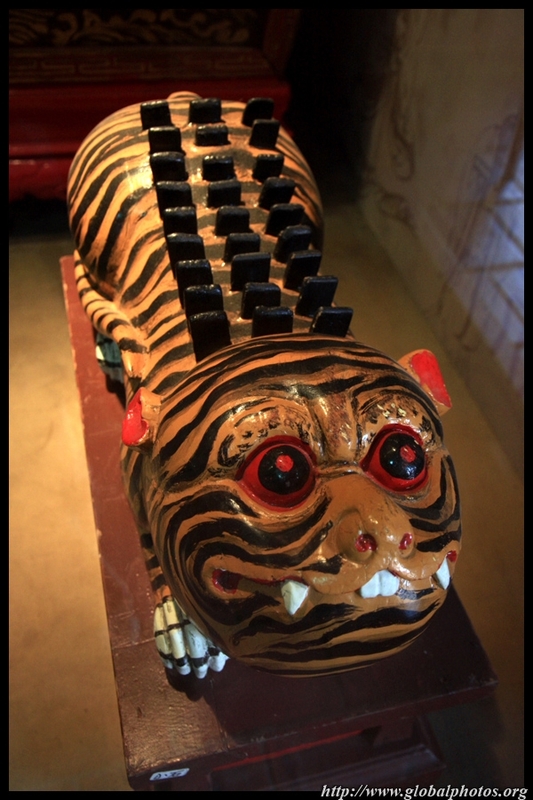 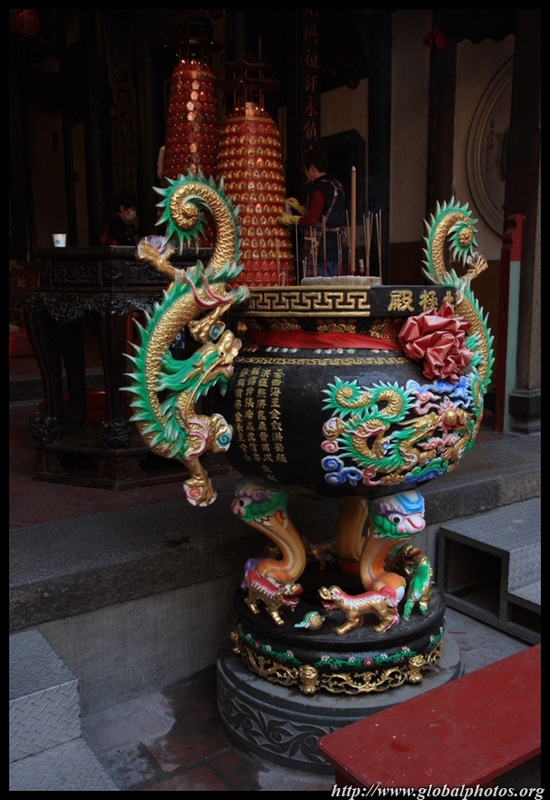 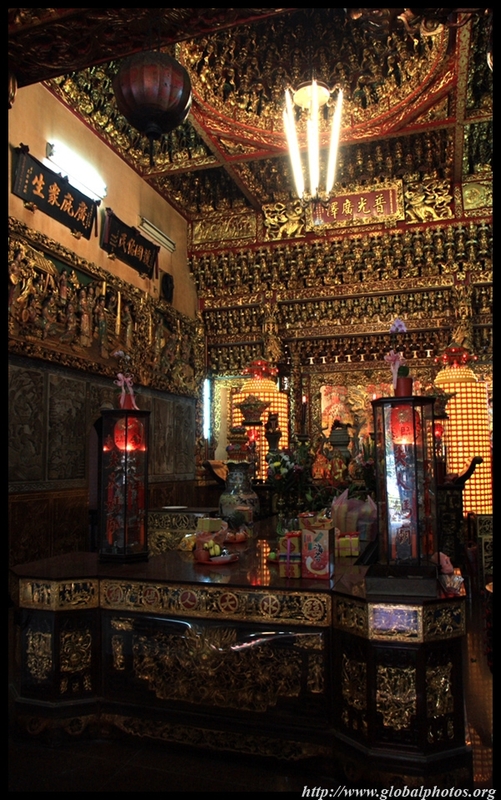 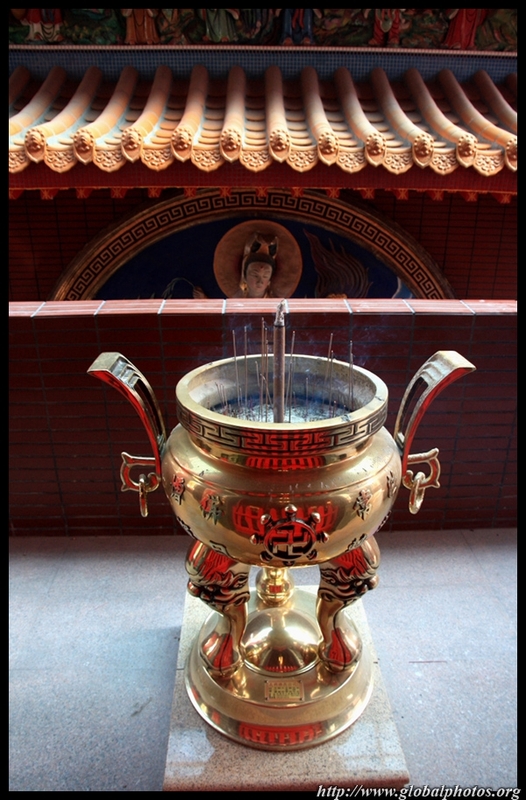 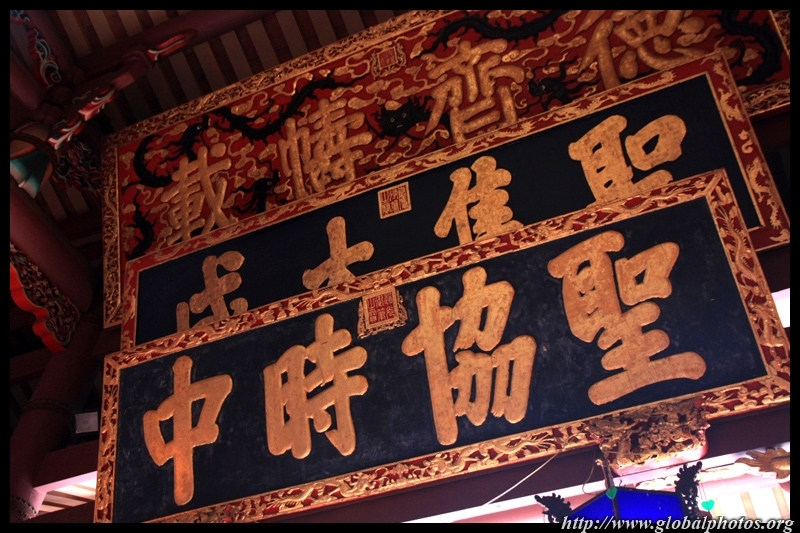 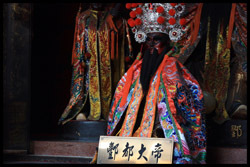 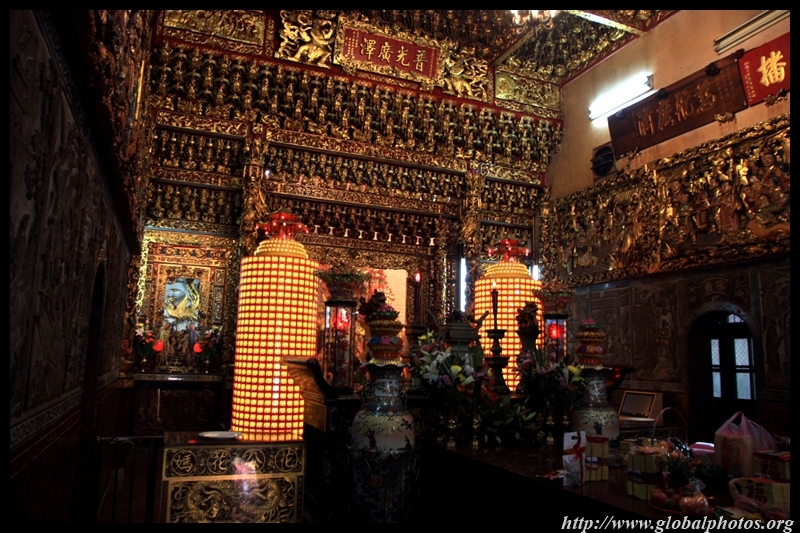 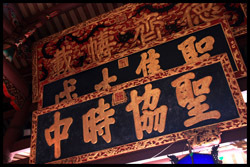 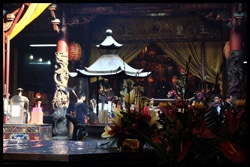 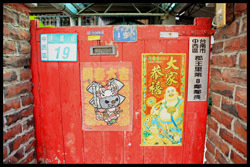 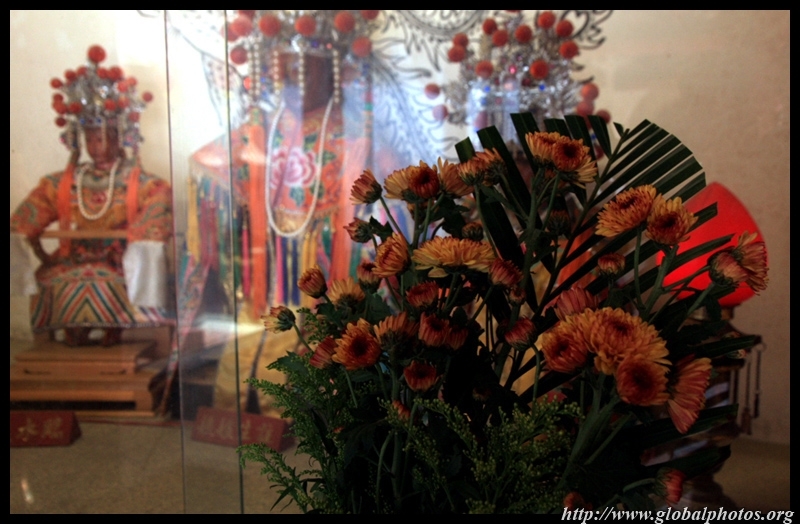 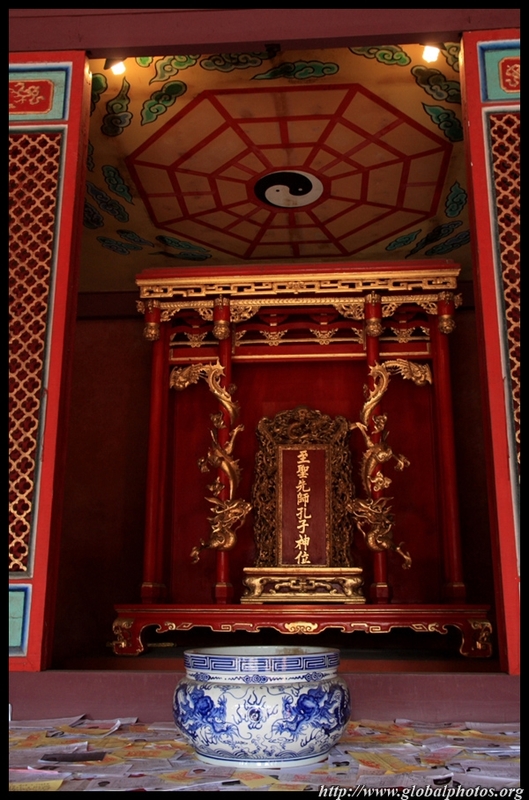 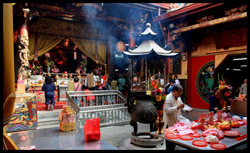 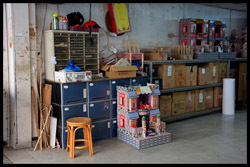 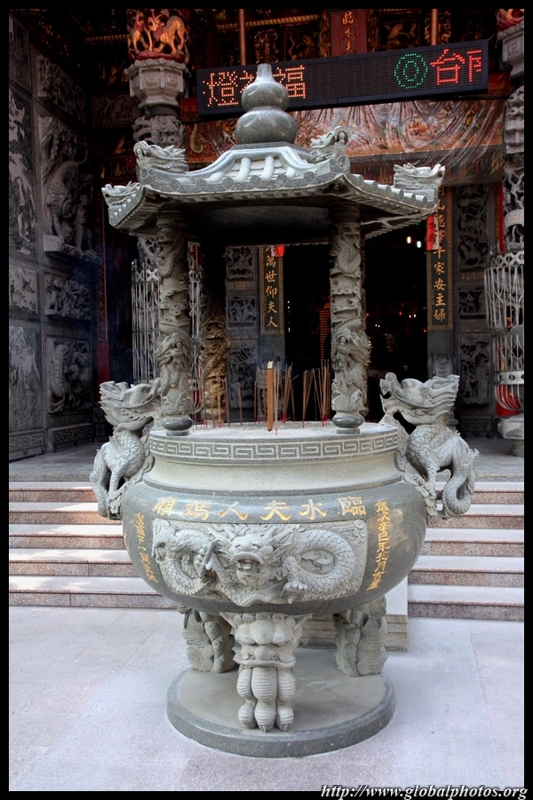 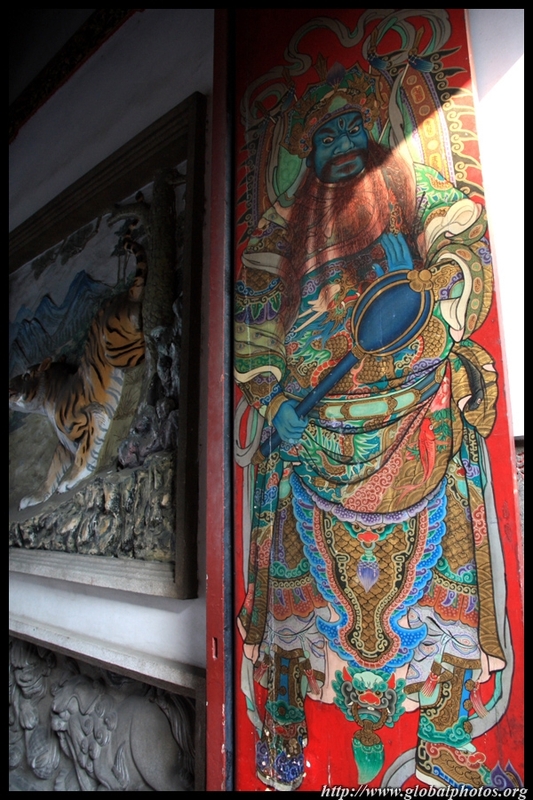 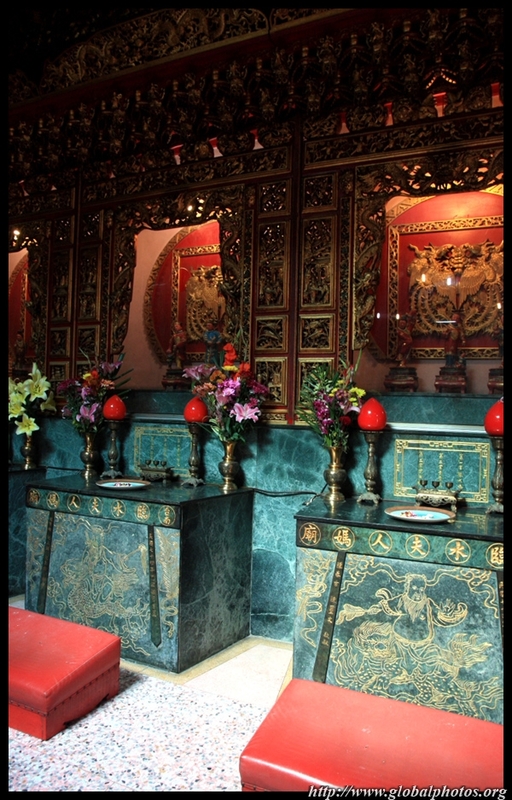 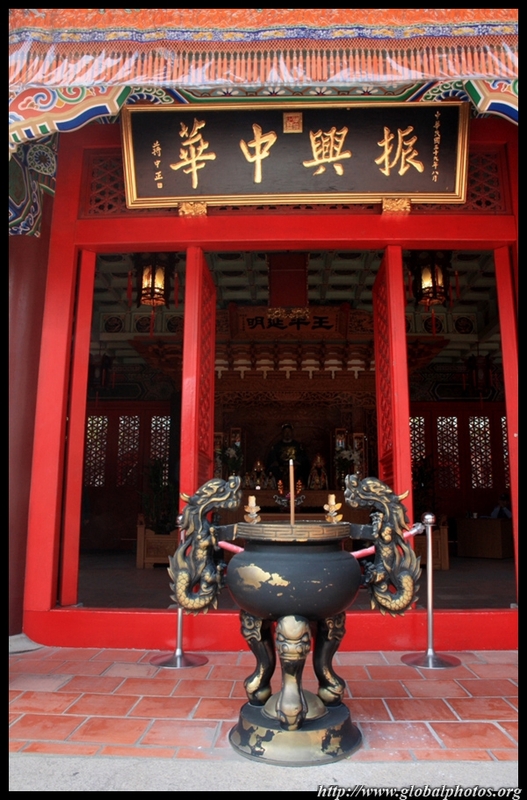 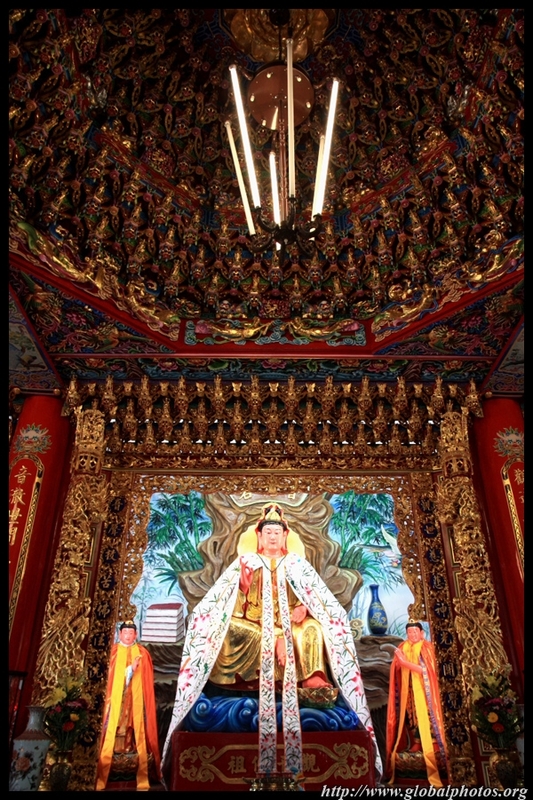 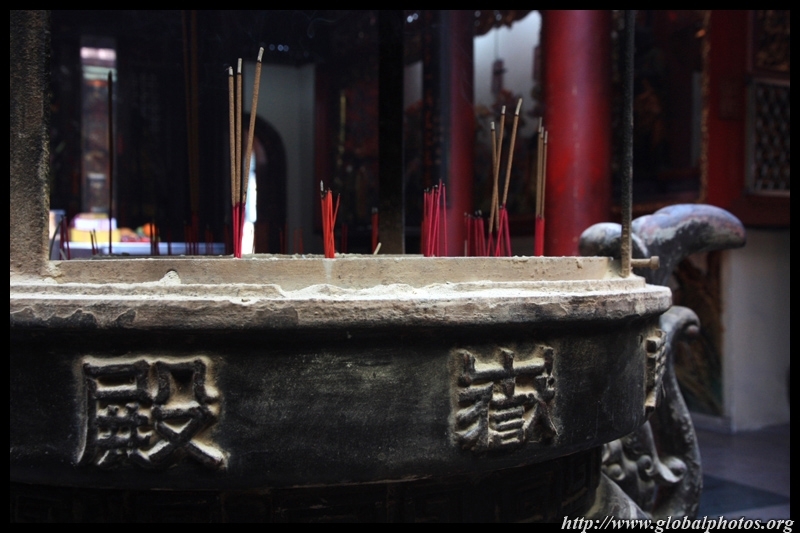 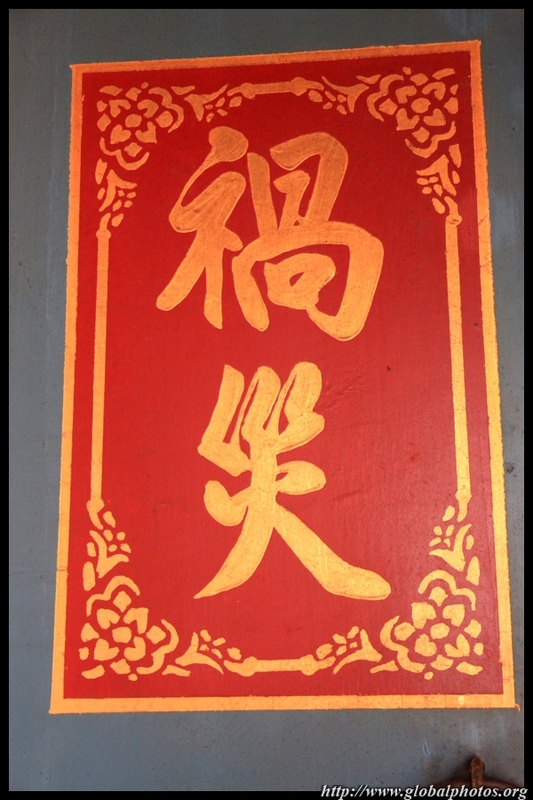 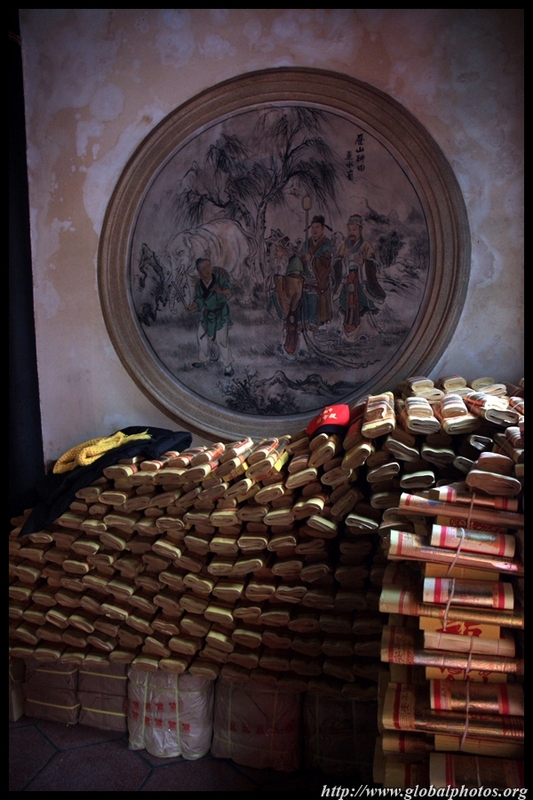 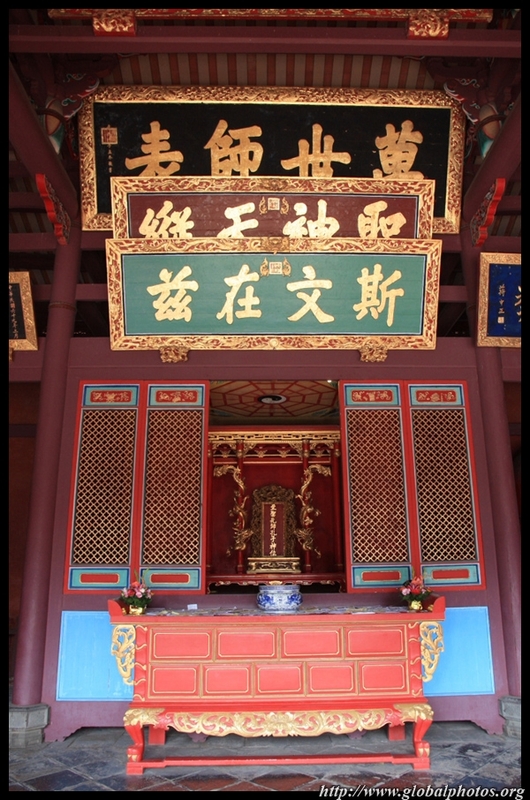 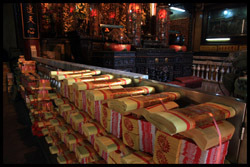 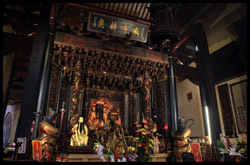 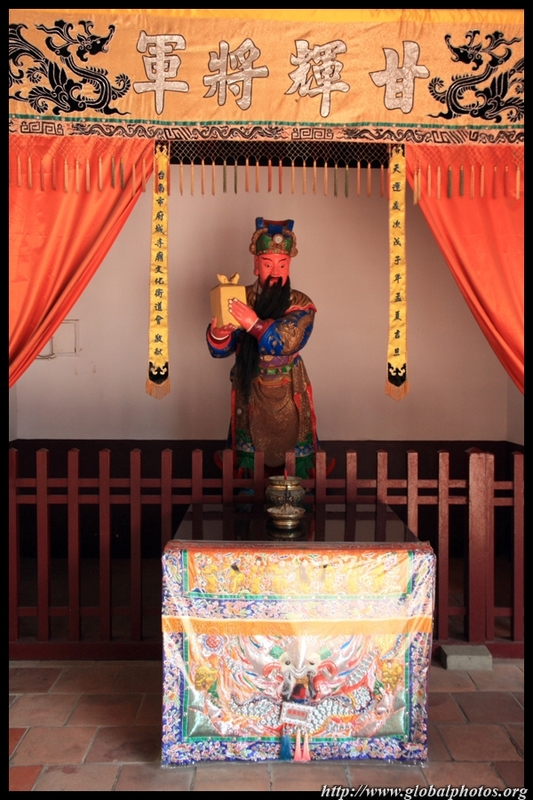 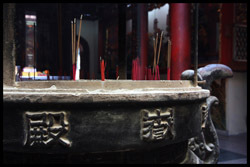 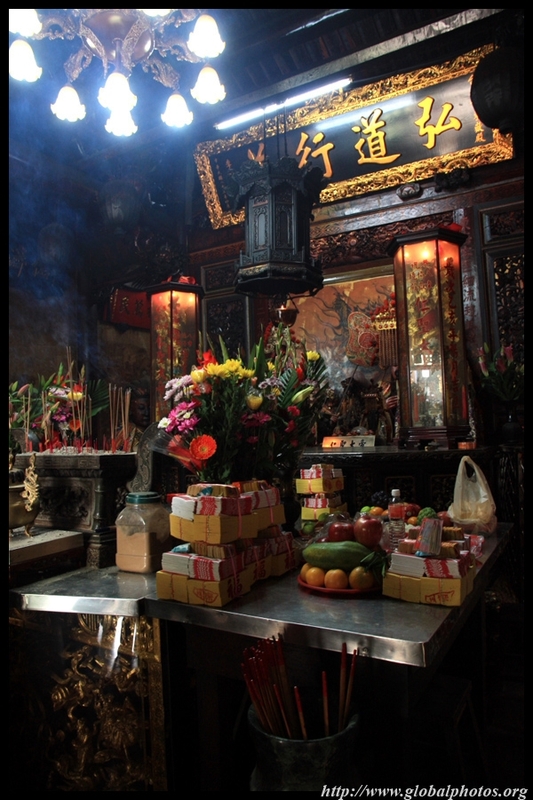 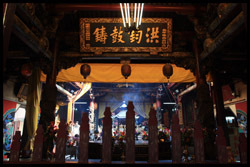 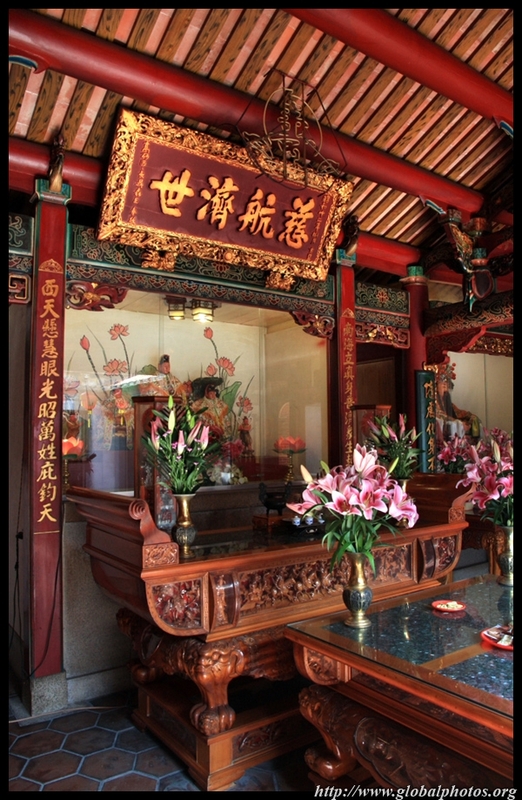 Tiantan is dedicated to the Jade Emperor in Taoism, who is believed to be able to change people's fate. 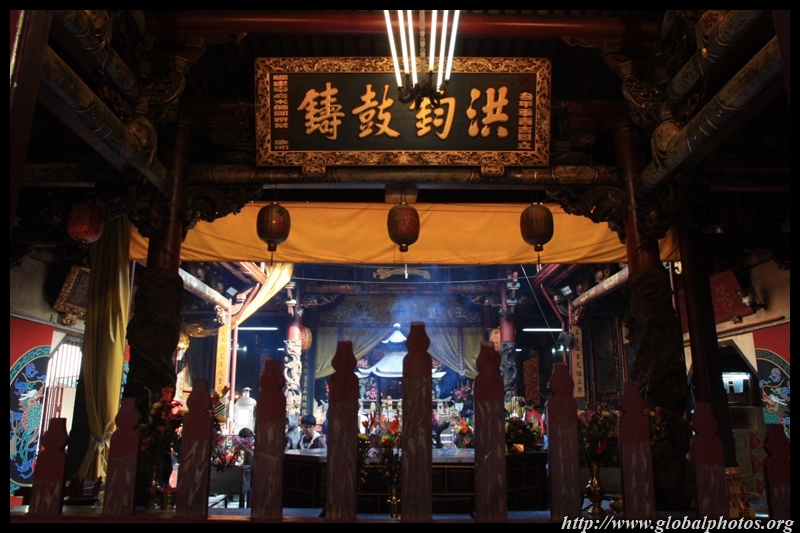 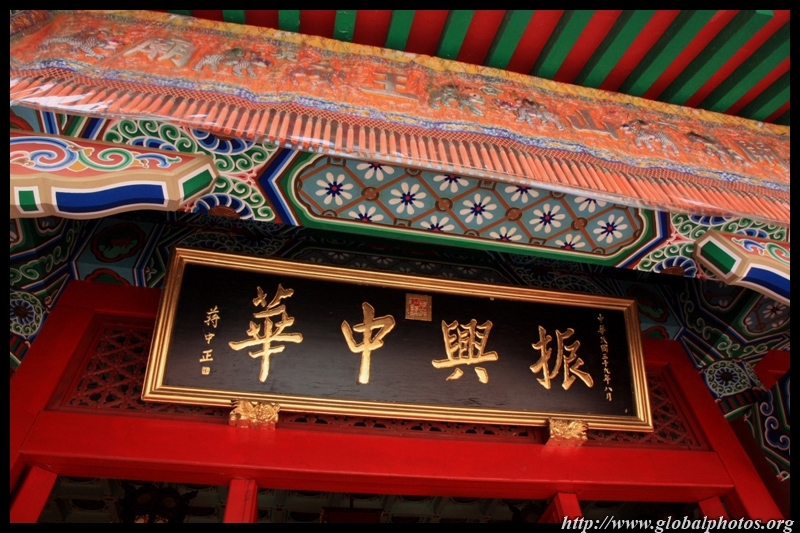 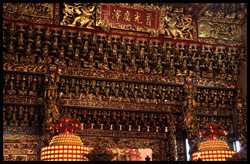 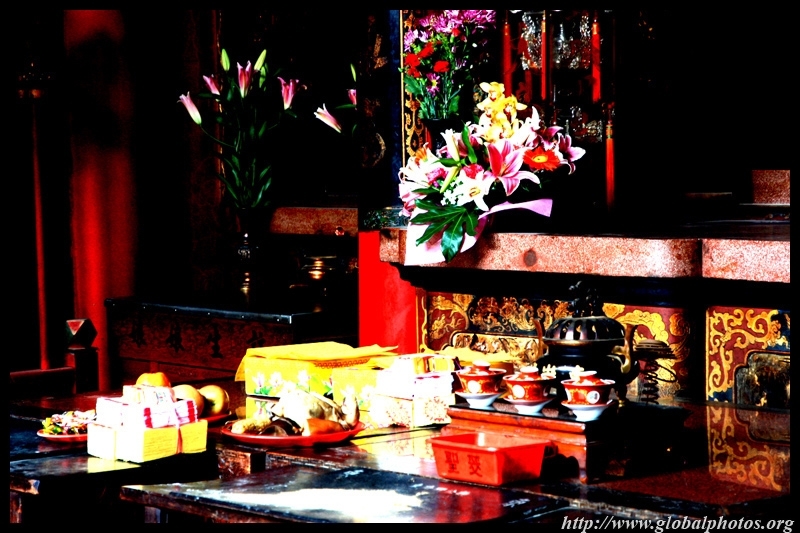 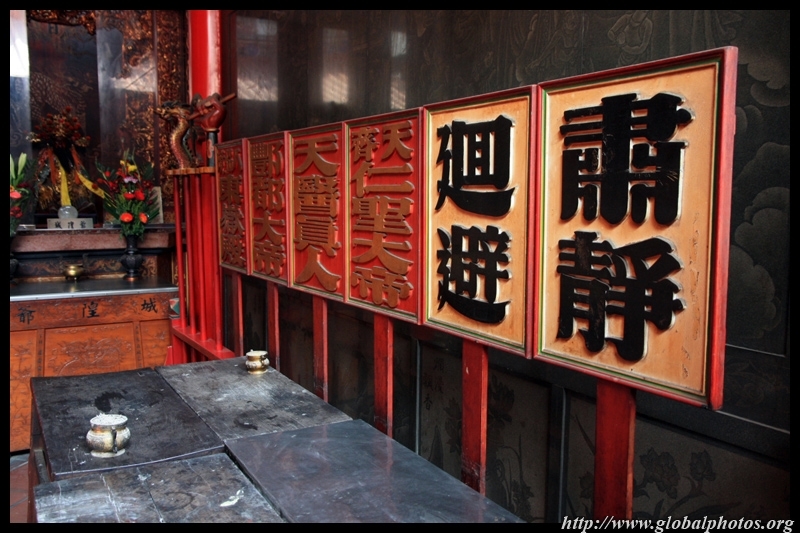 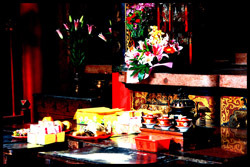 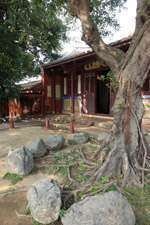 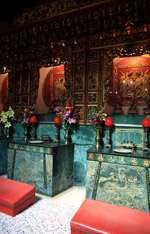 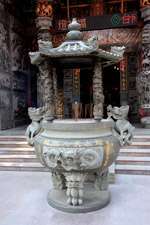 Beiji Temple is dedicated to the Emperor of Mysterious Heaven. 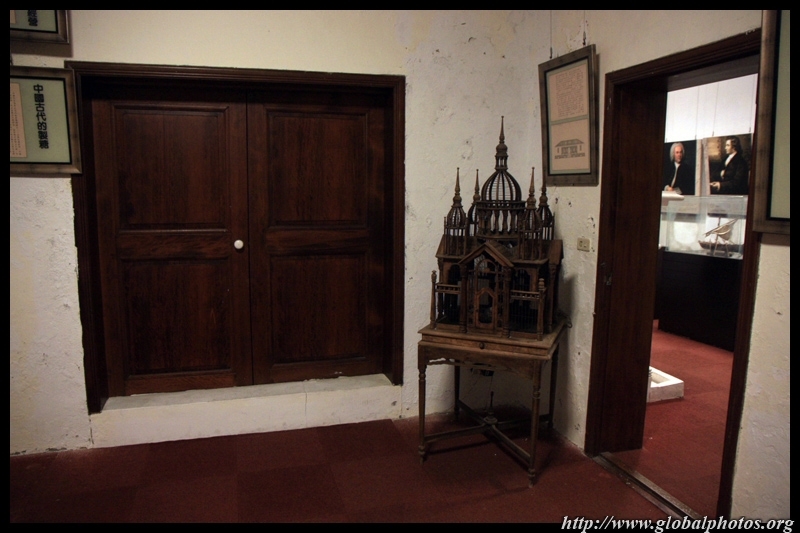 Originally a traditional medicine clinic during the Dutch period, it was made into a temple when the Dutch were expelled in the 17th century. 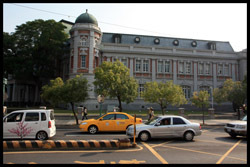 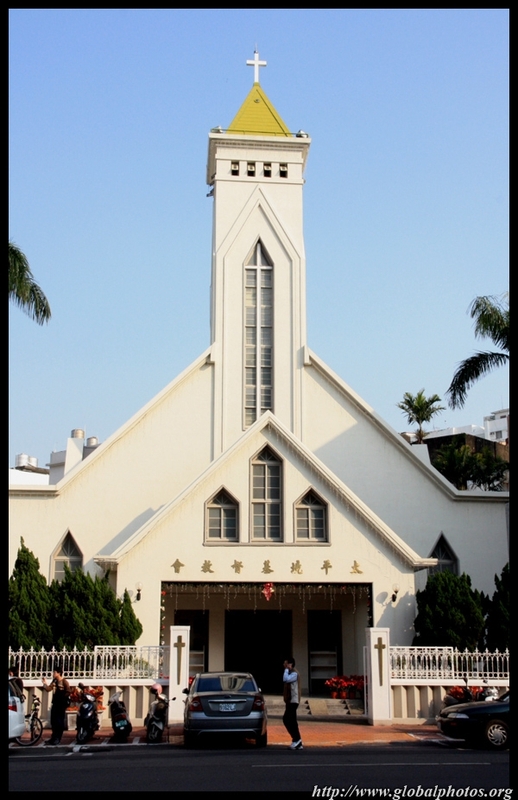 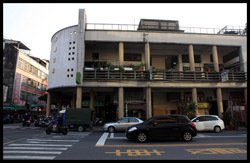 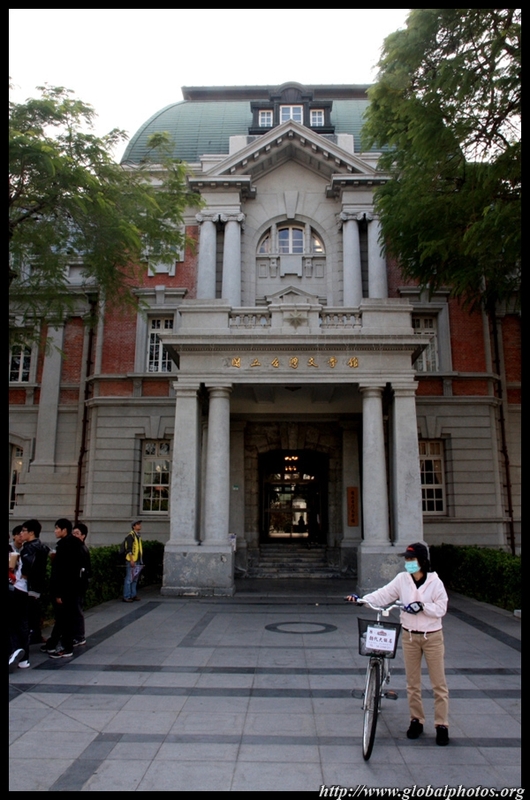 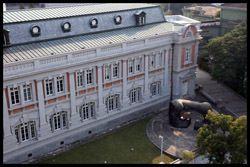 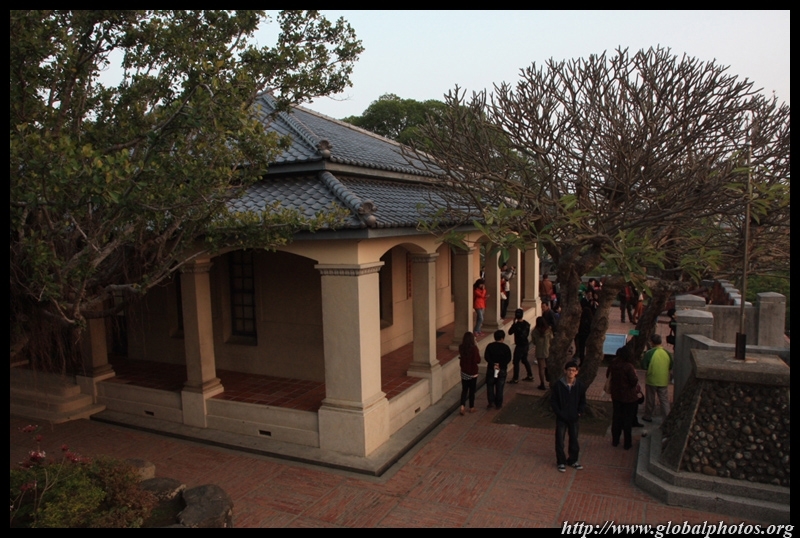 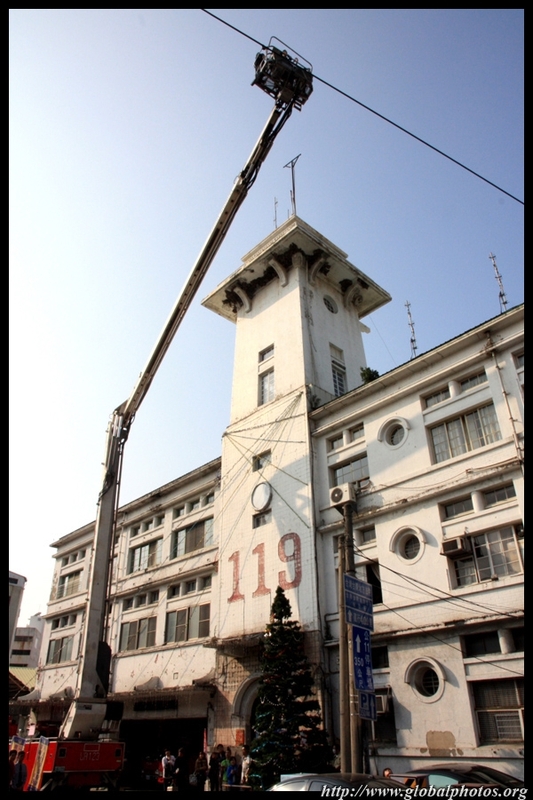 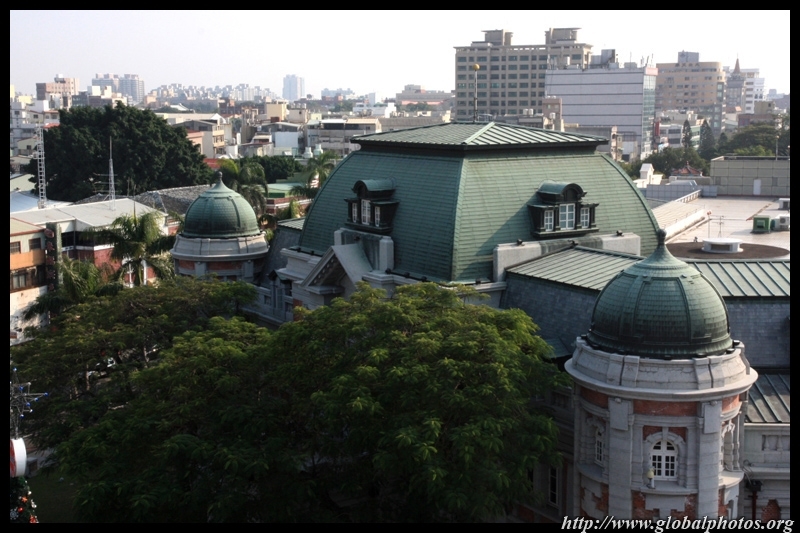 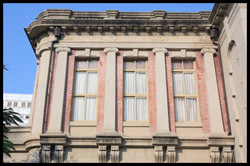 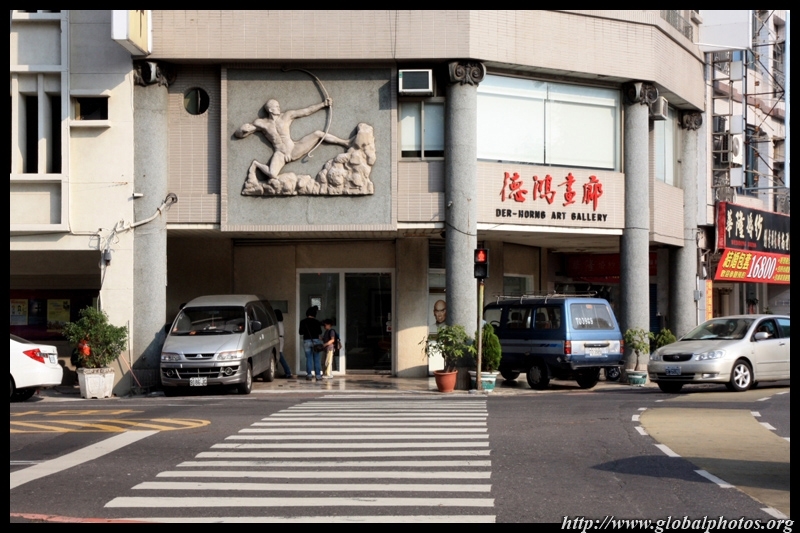 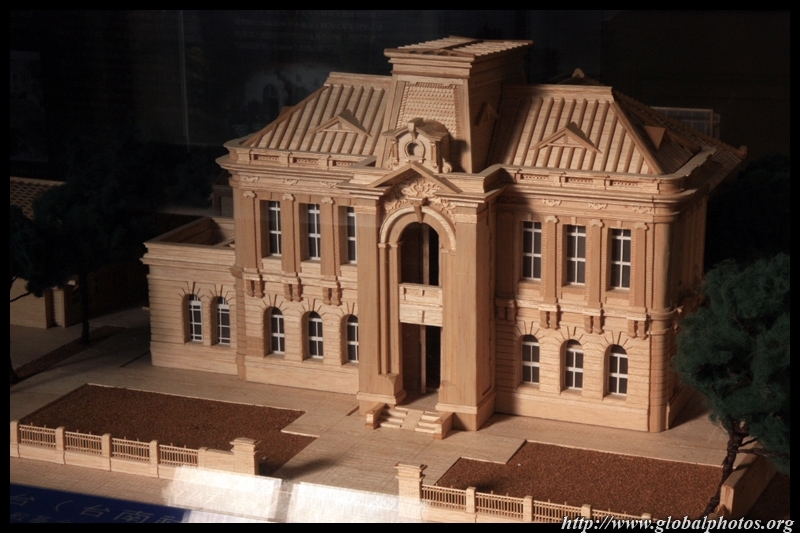 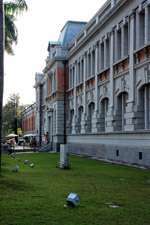 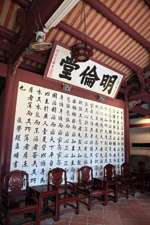 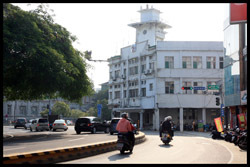 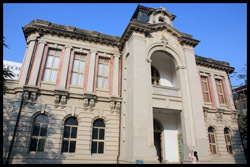 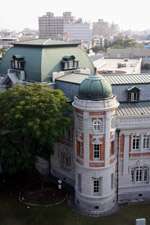 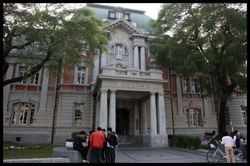 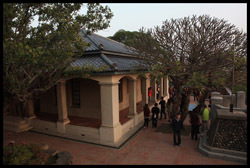 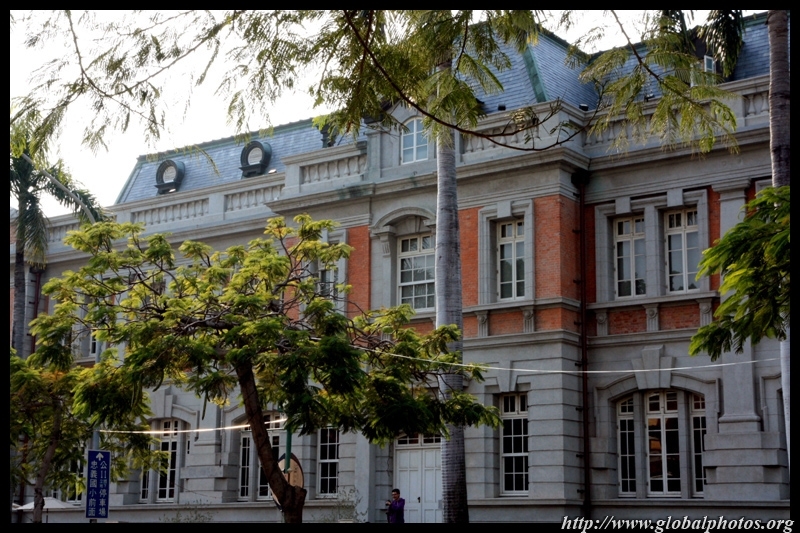 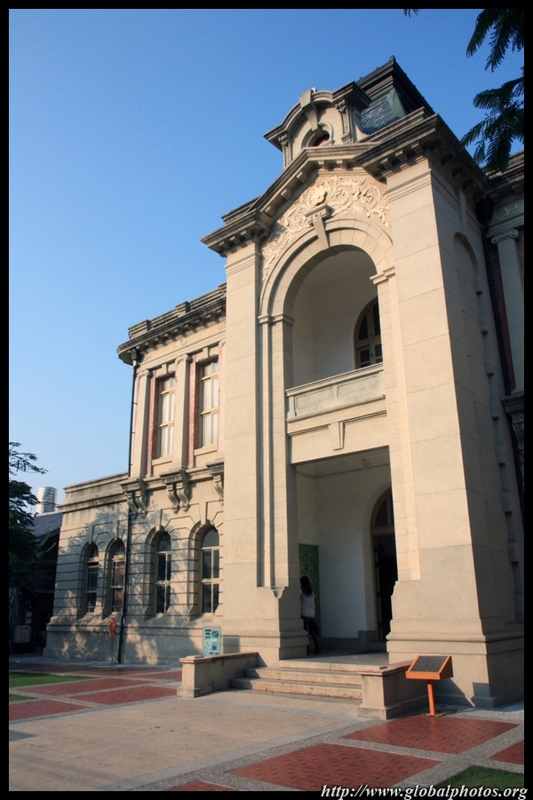 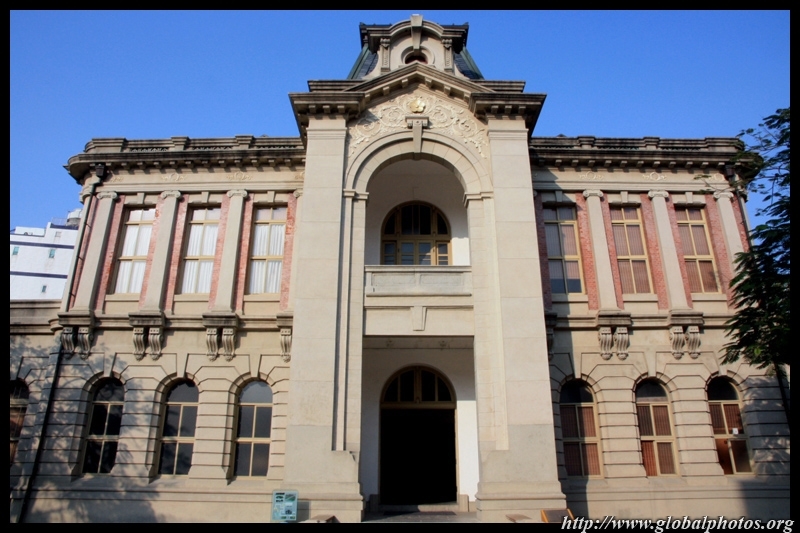 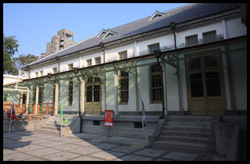 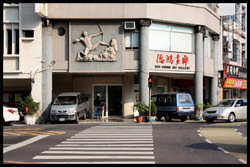 The Tainan Public Meeting Hall is the first public meeting hall in Taiwan, which opened in 1911. 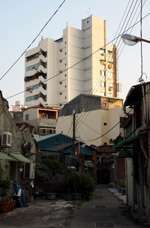 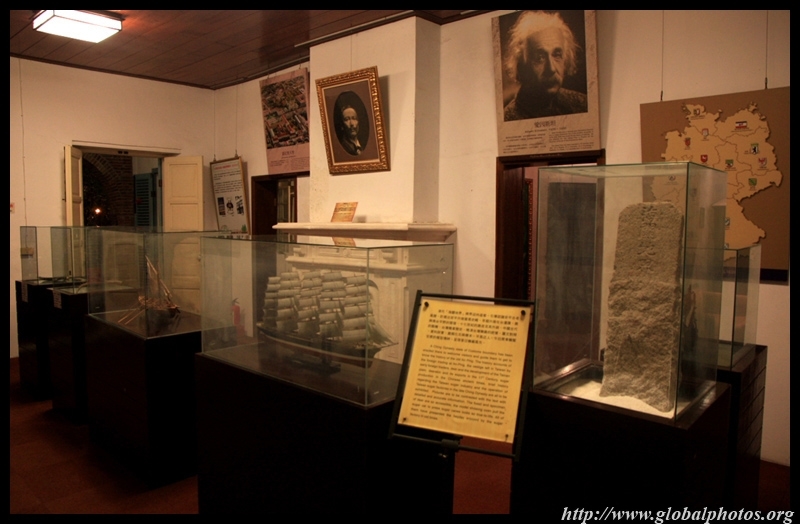 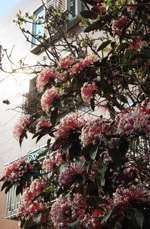 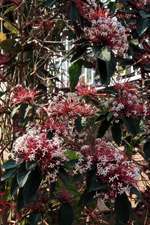 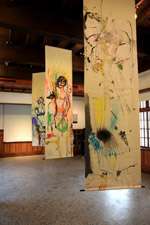 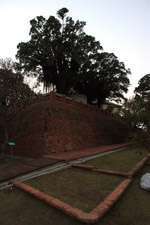 It became a historic site in 1998. 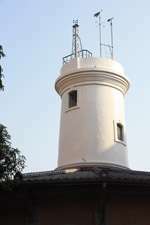 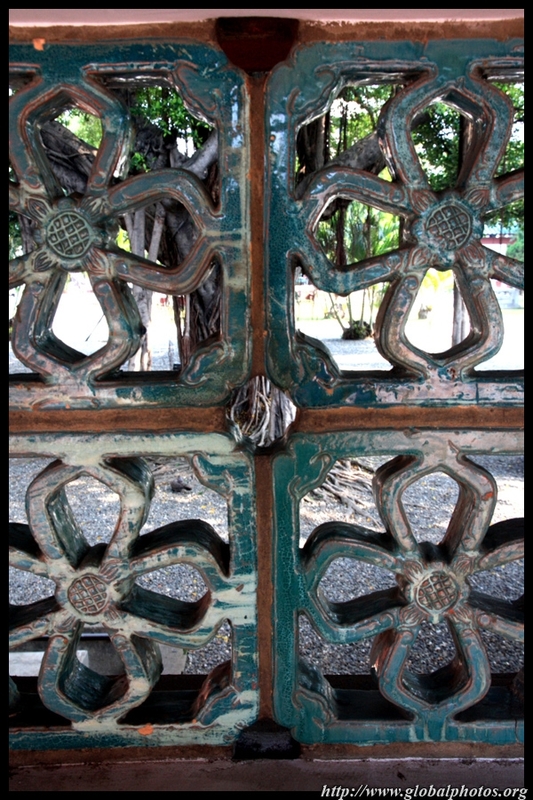 Chikanlou was built by the Dutch in 1652 as their colonial administration centre. 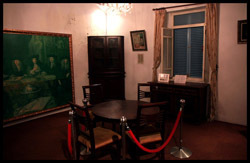 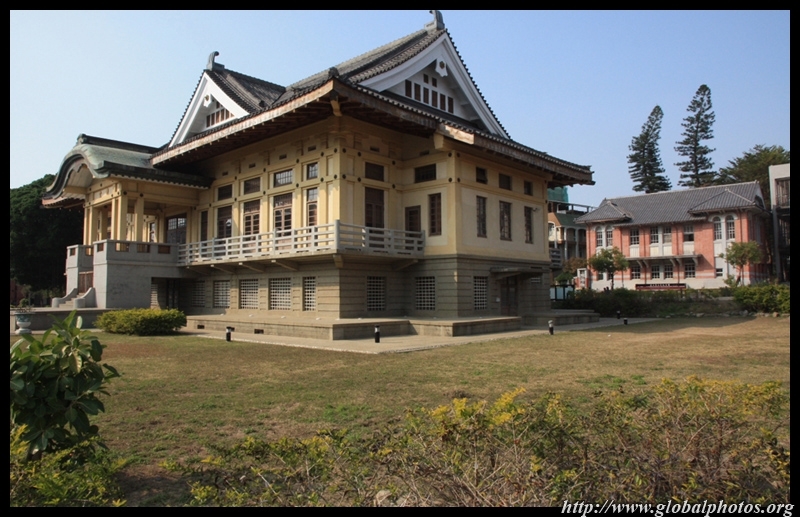 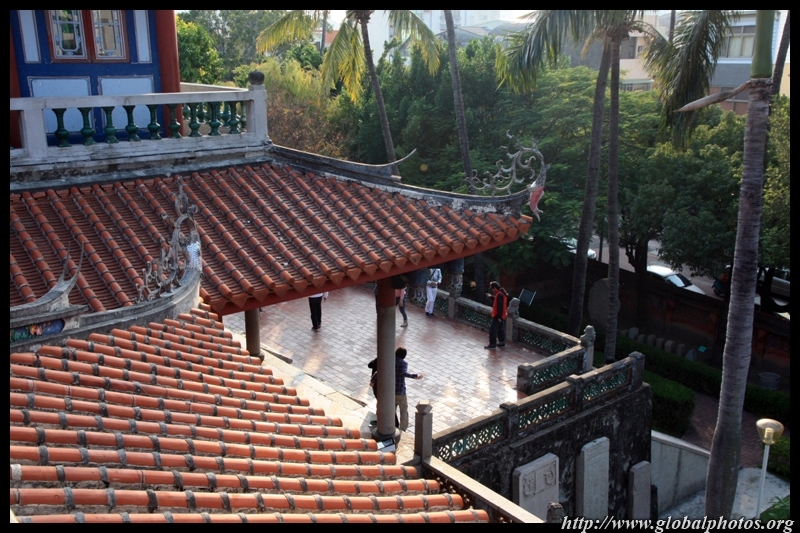 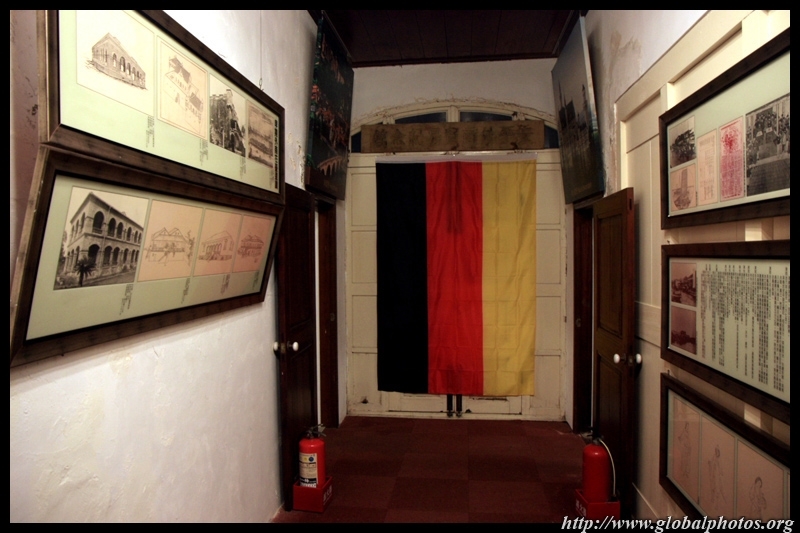 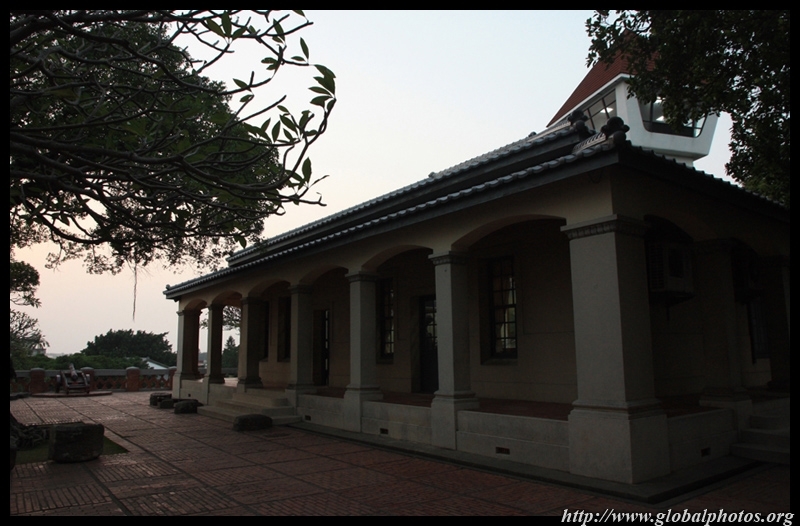 After the Dutch were expelled, the Chinese converted it into the governor's mansion. 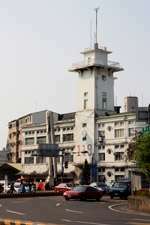 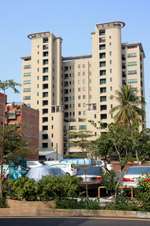 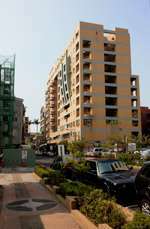 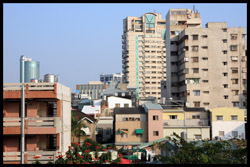 After World War II, the buildings were changed from wood to steel and concrete. 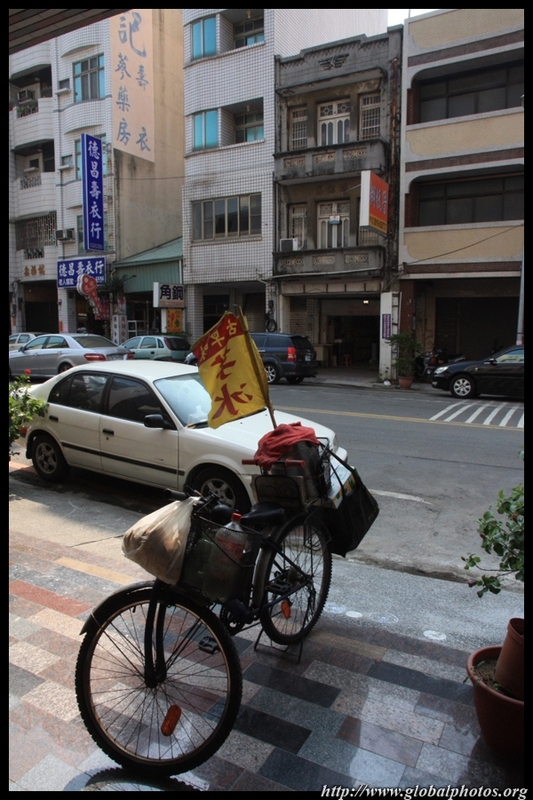 With a little time to spare, I searched for the city tourist bus to head west towards Anping, and a break for my sore feet. 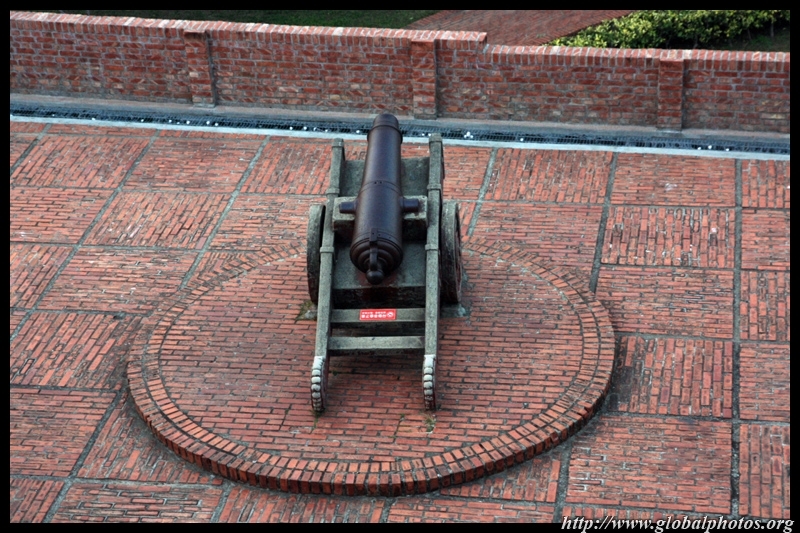 The Dutch built Fort Zeelandia in 1624-34, which consisted of a square fortress wrapped by rectangular outer walls. 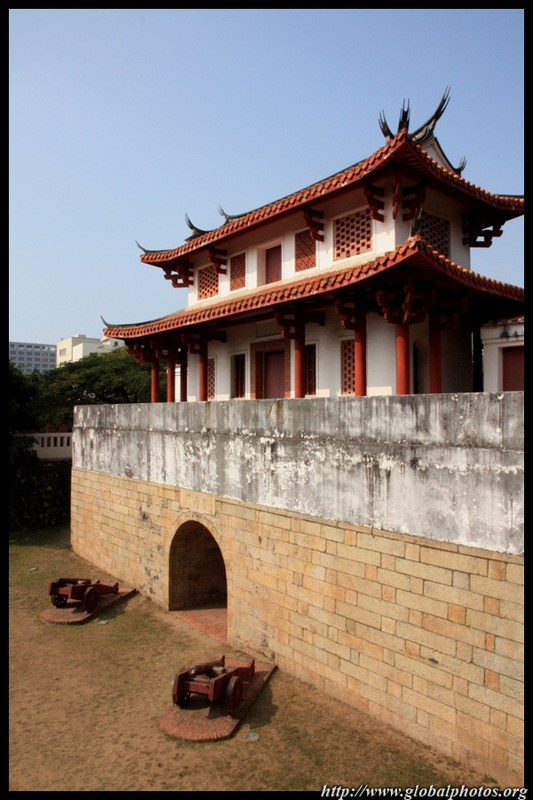 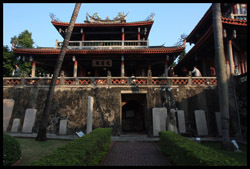 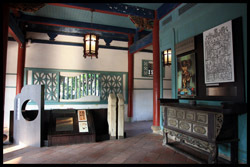 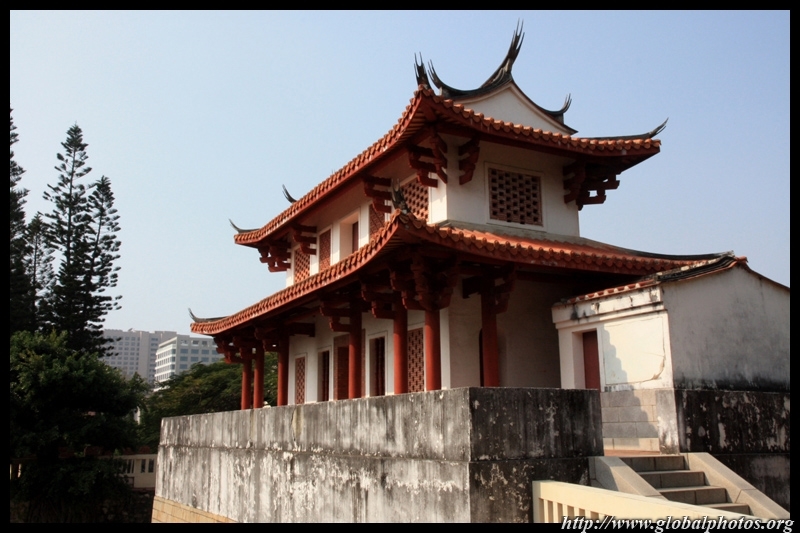 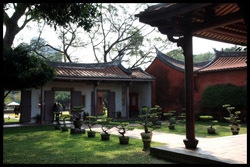 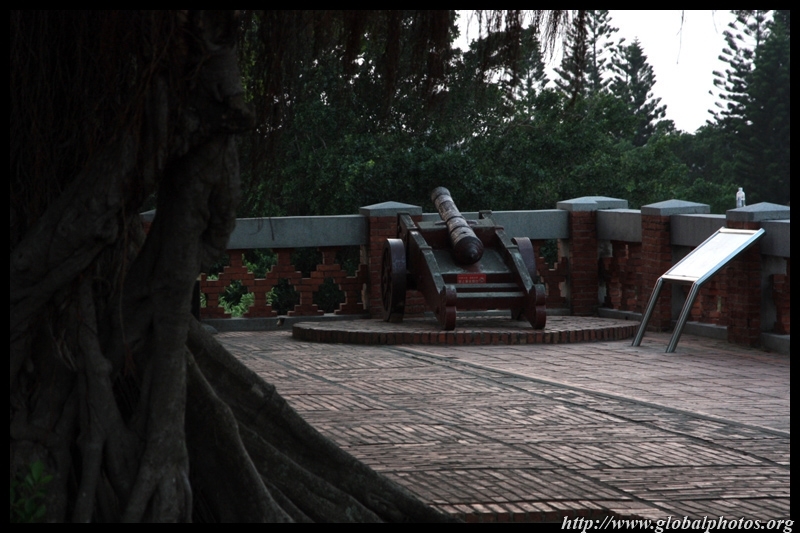 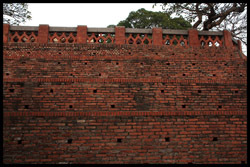 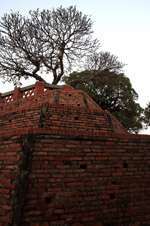 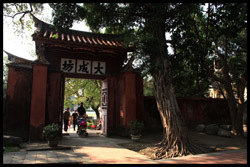 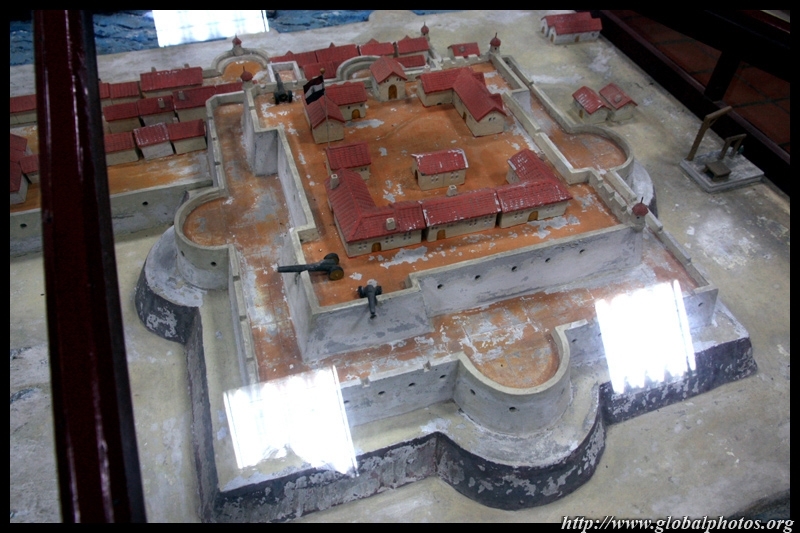 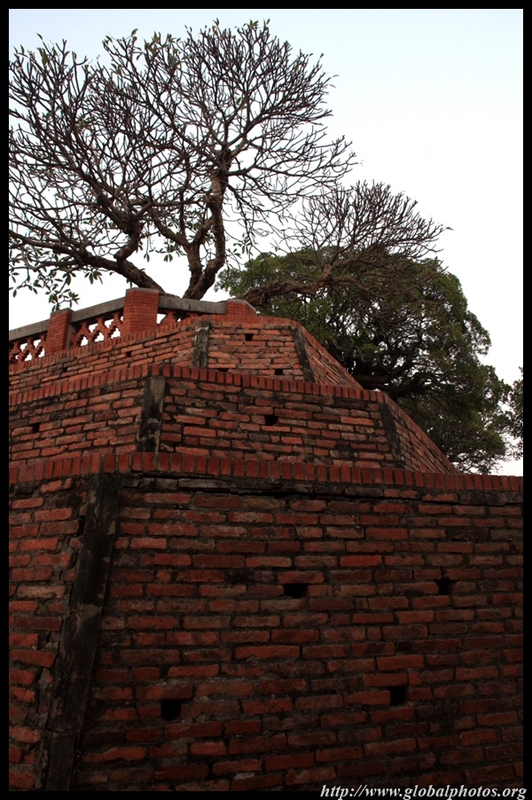 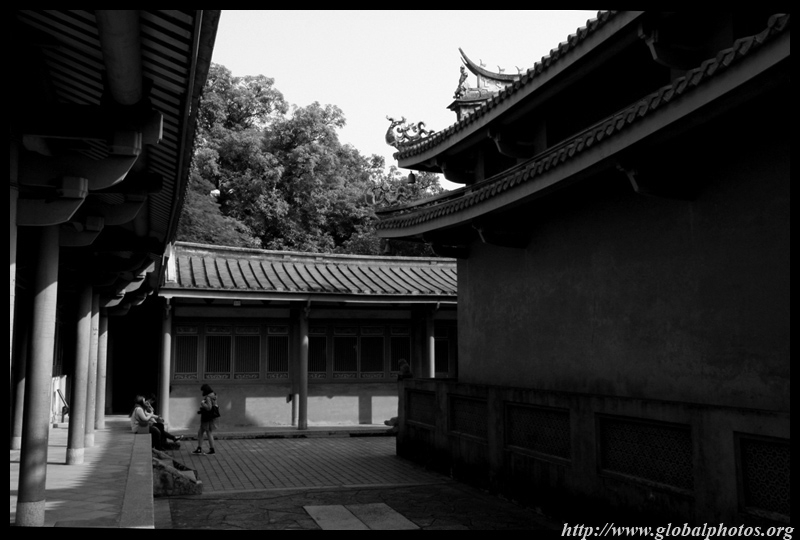 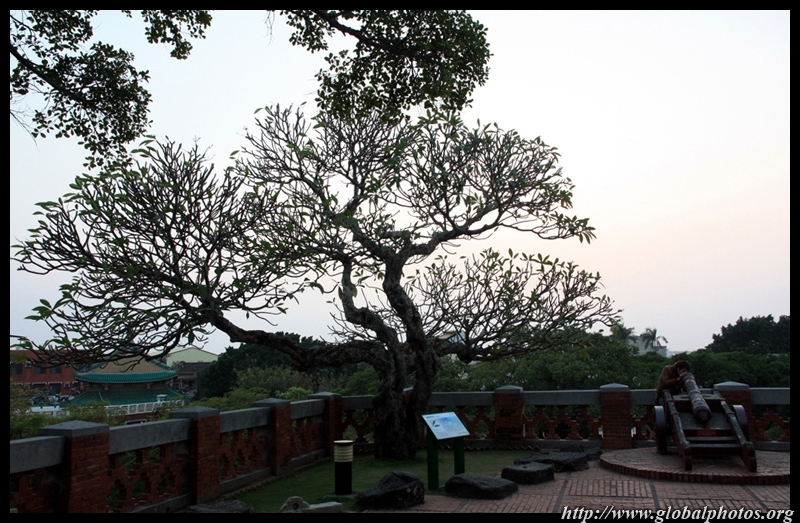 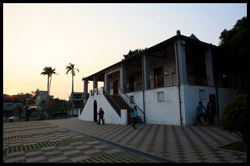 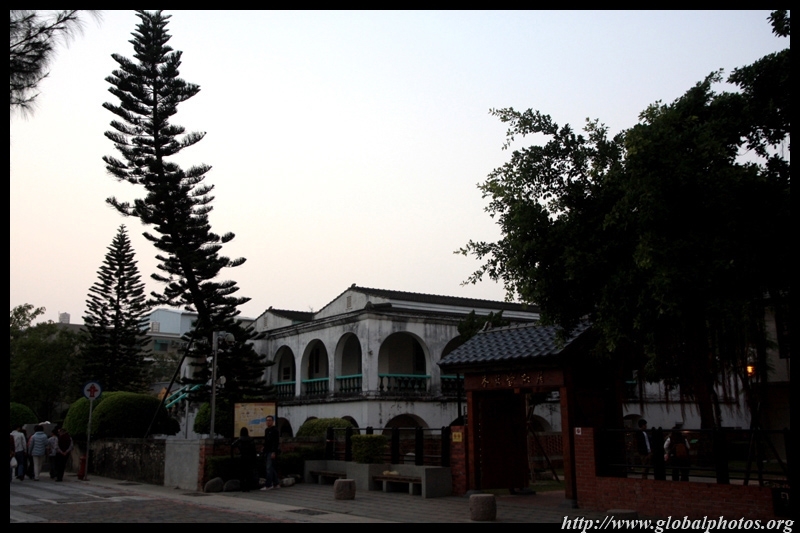 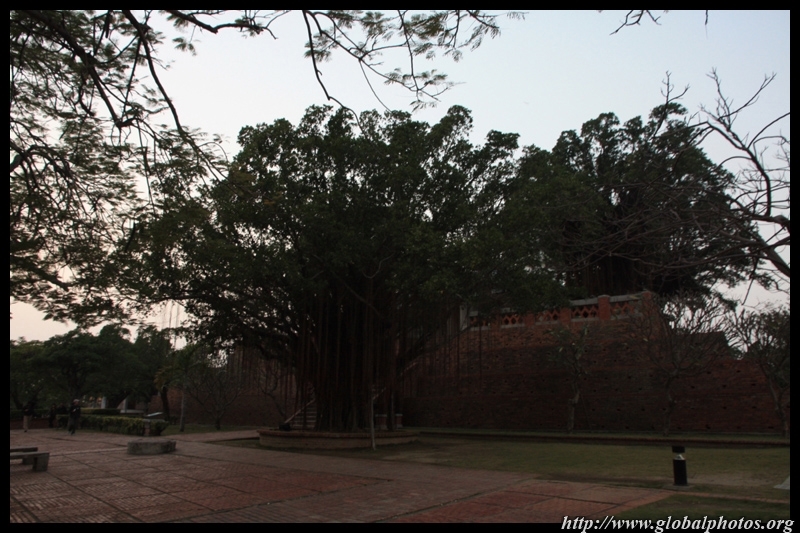 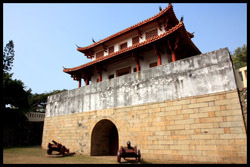 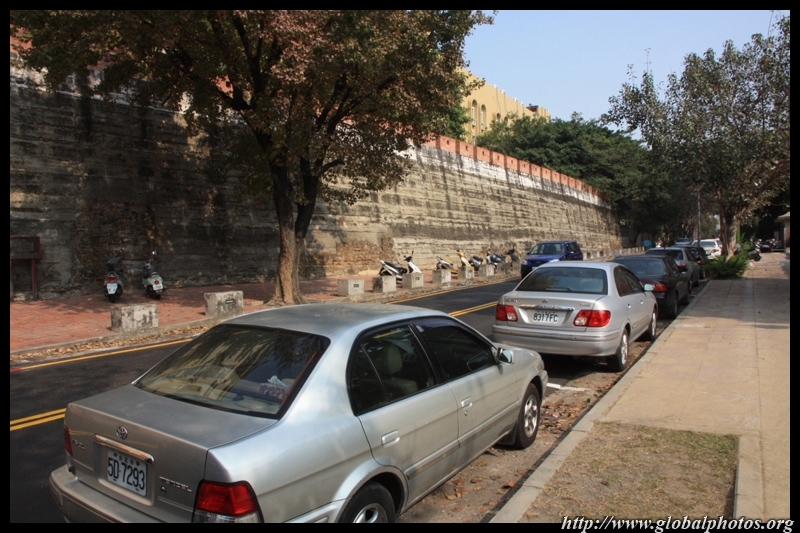 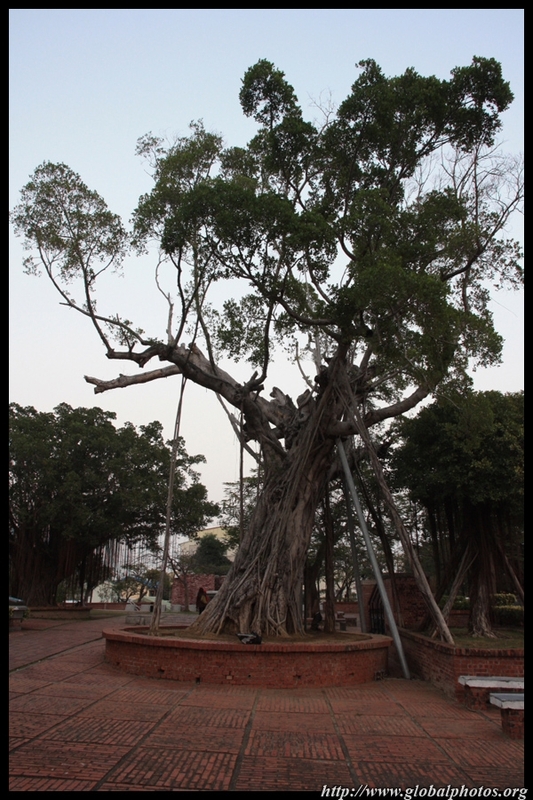 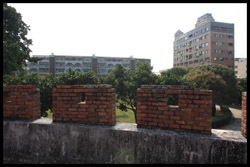 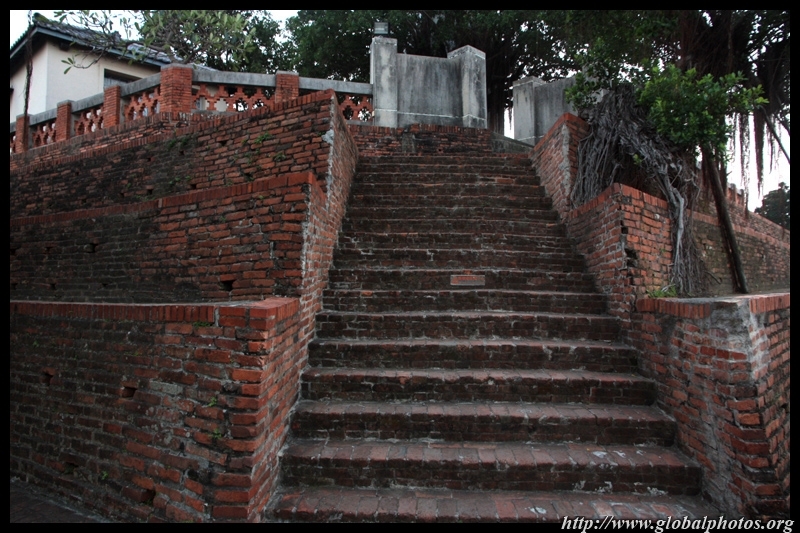 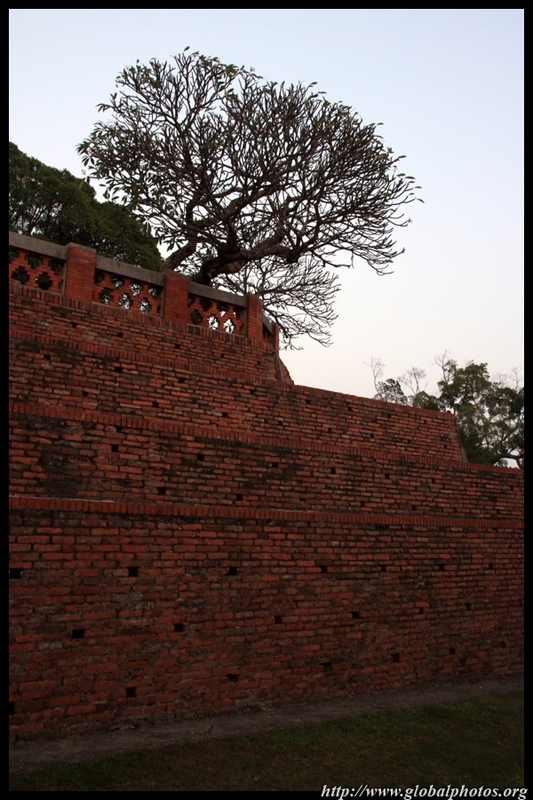 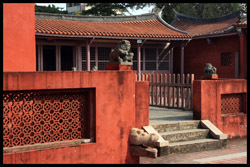 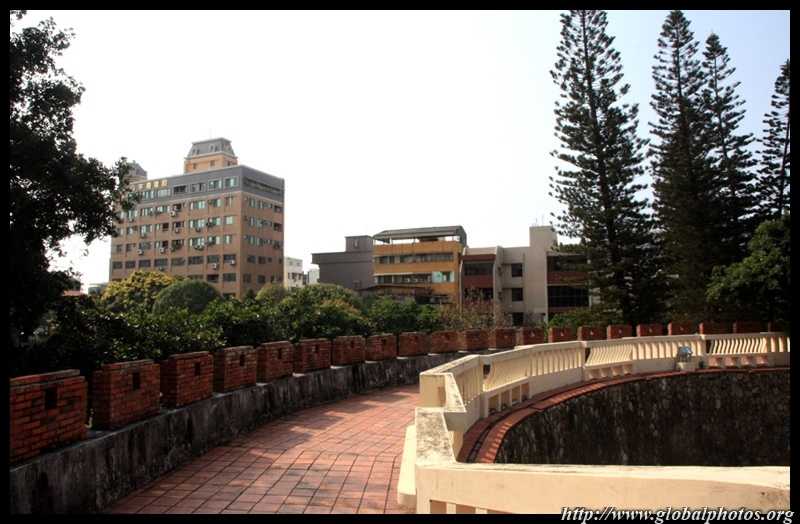 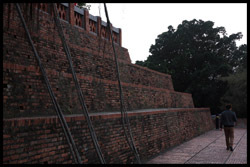 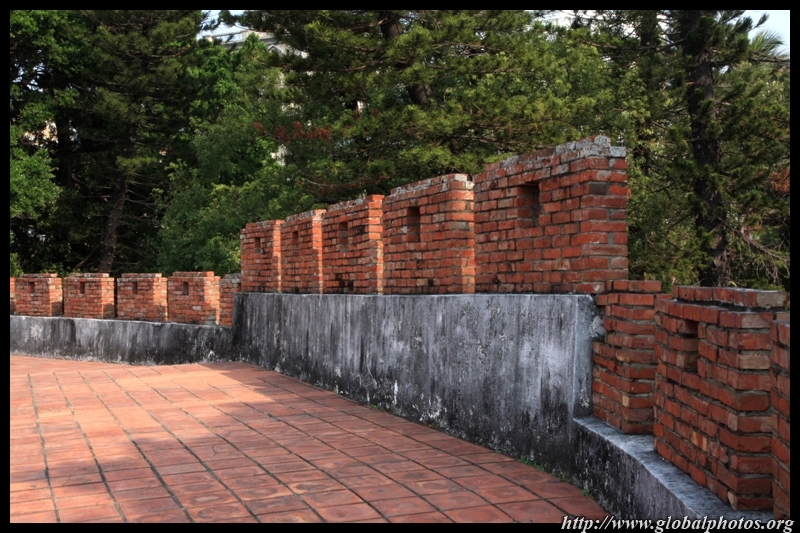 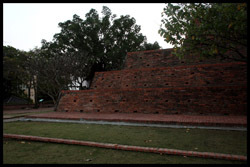 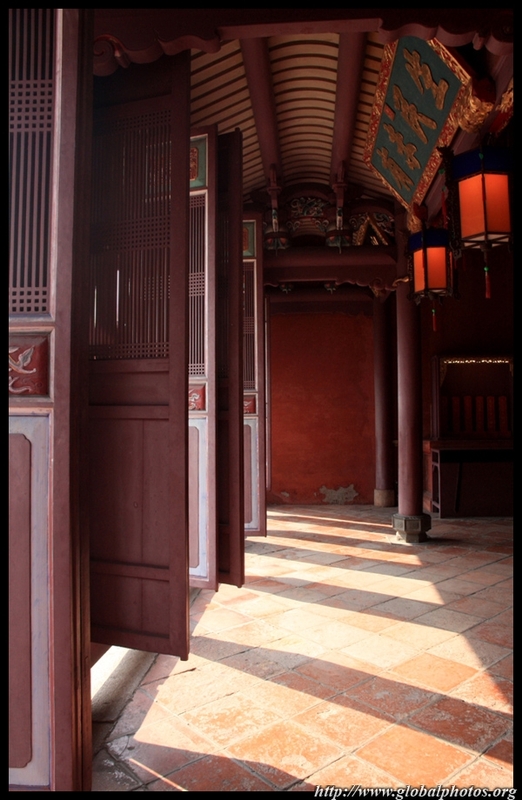 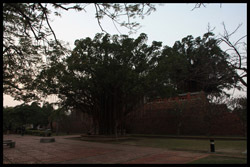 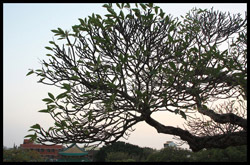 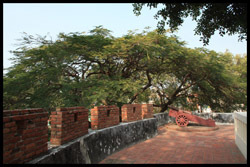 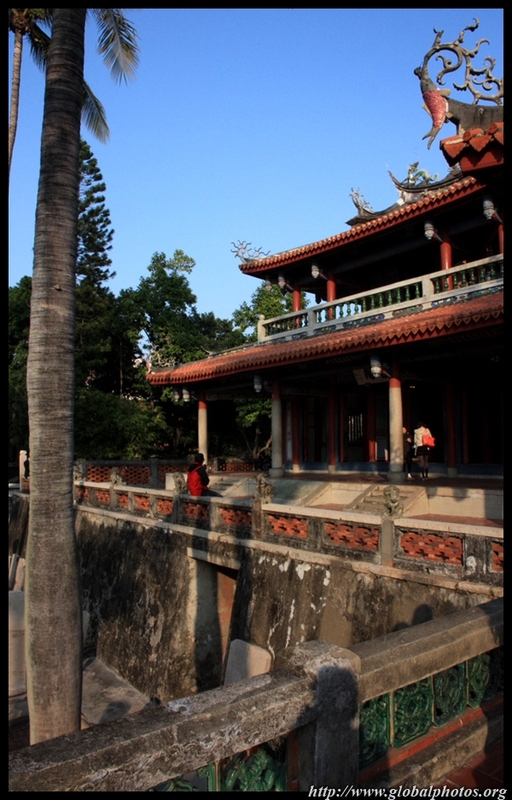 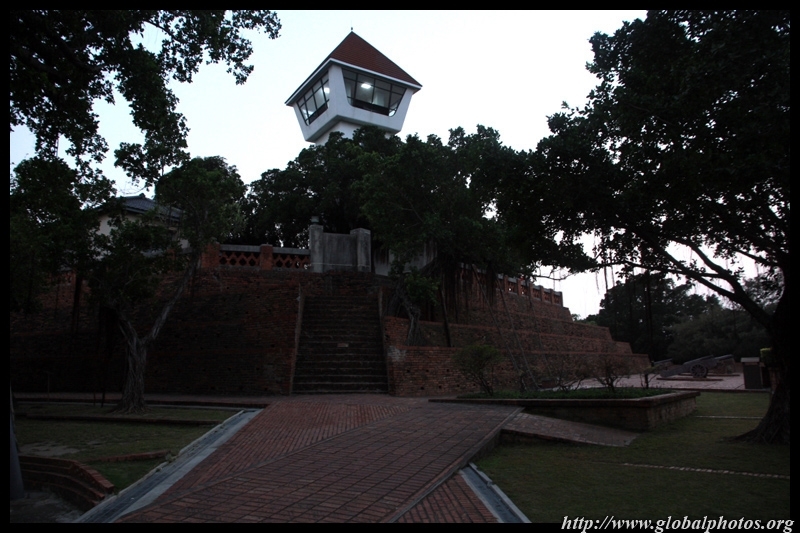 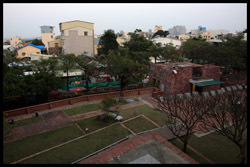 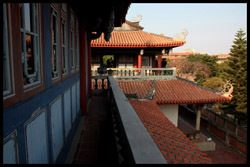 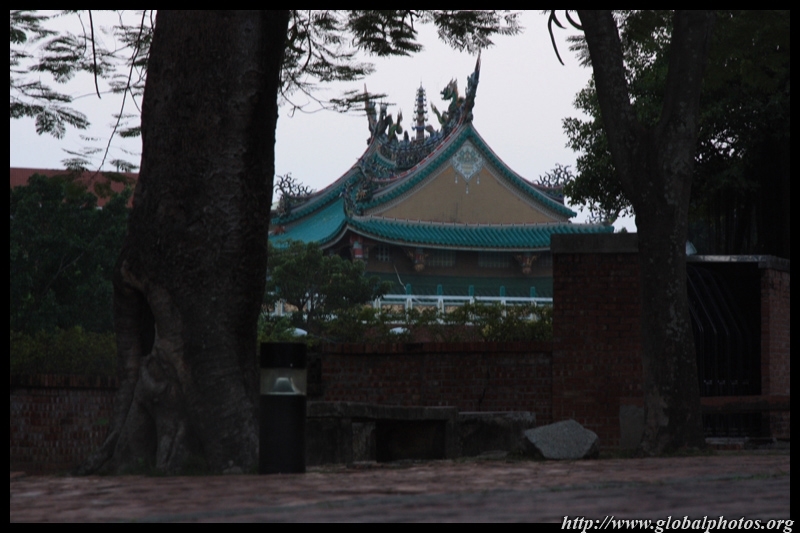 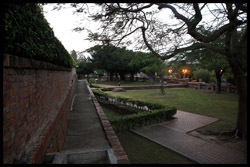 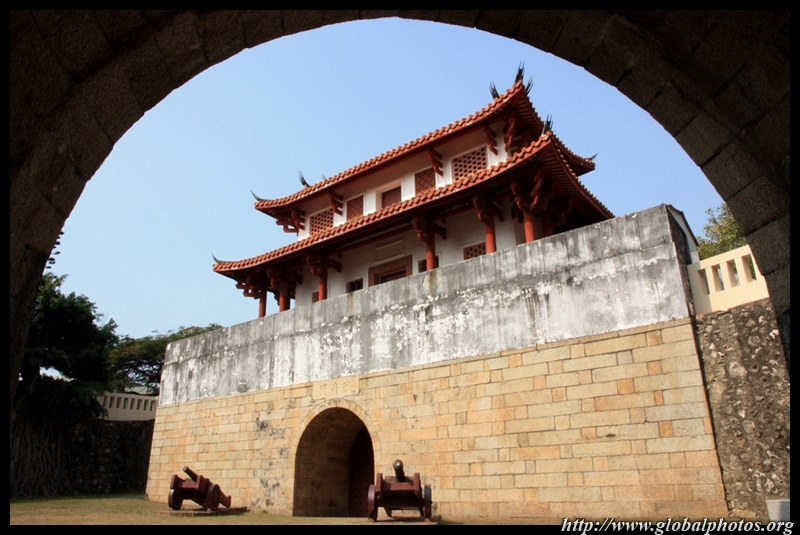 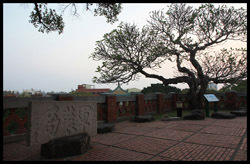 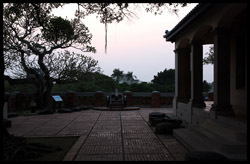 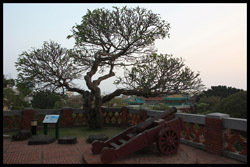 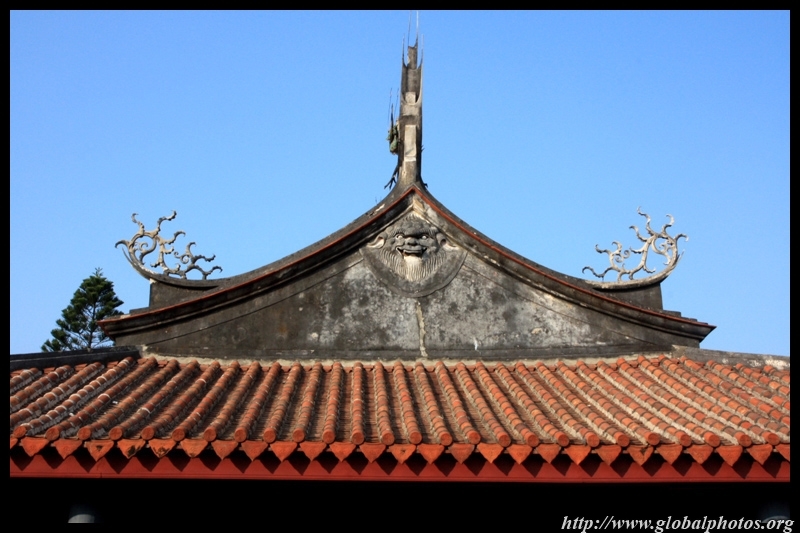 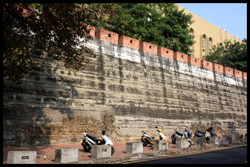 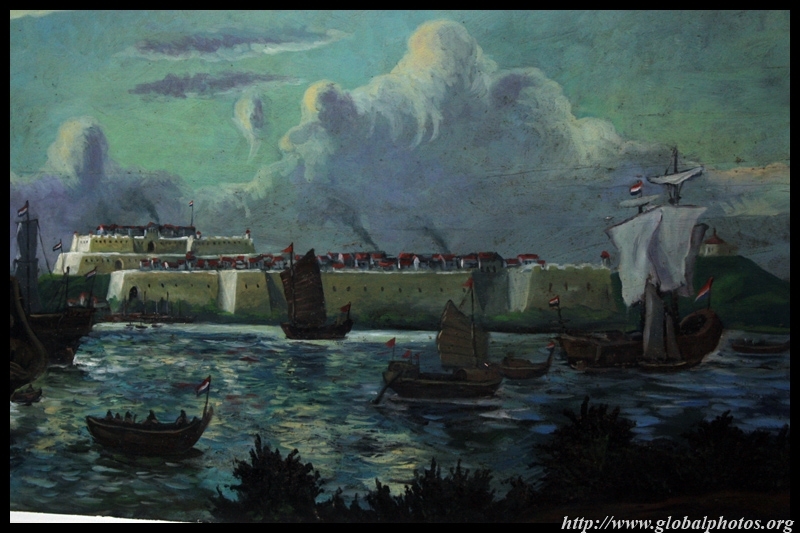 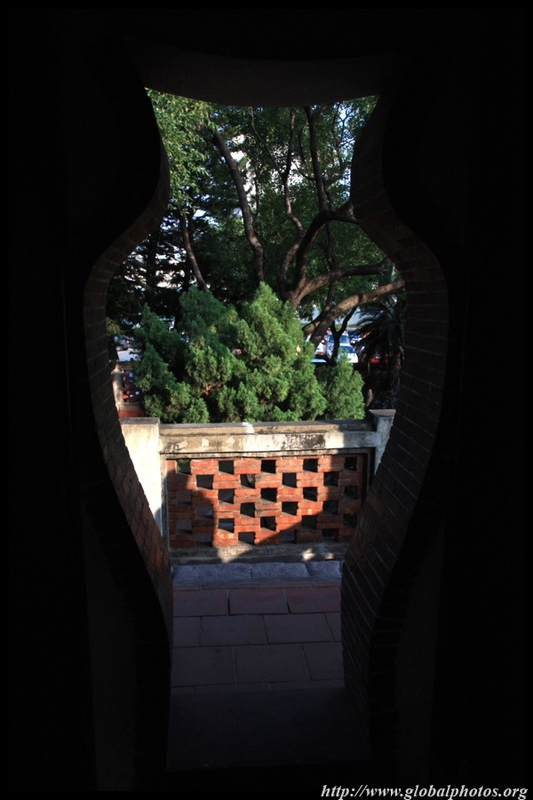 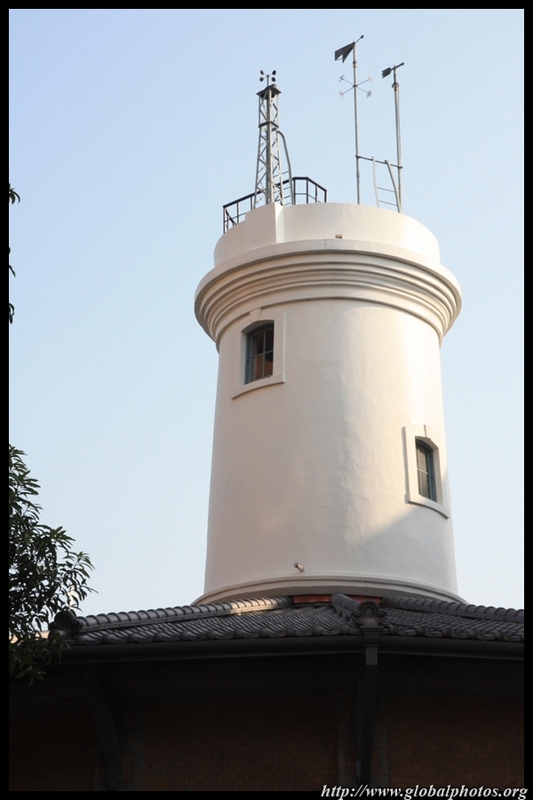 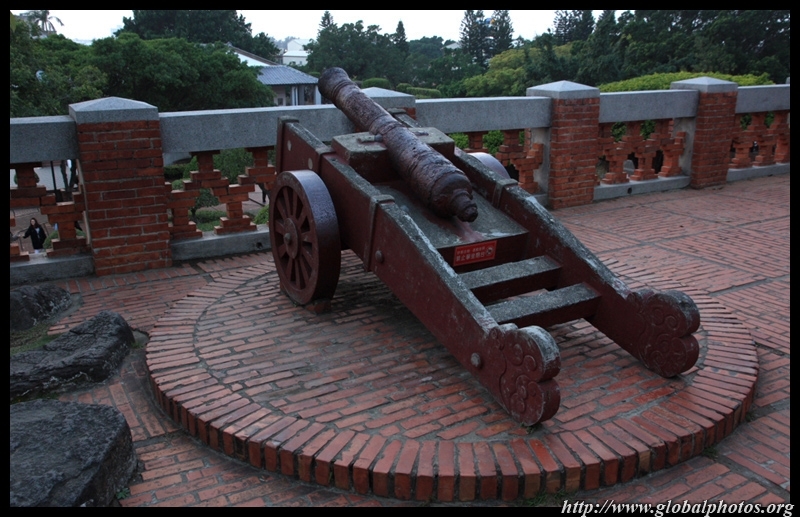 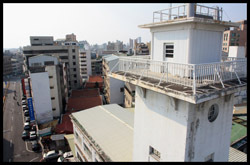 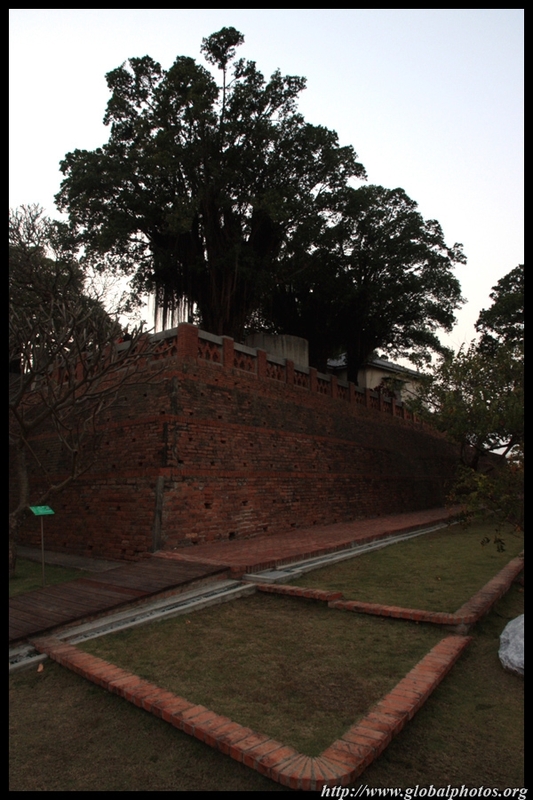 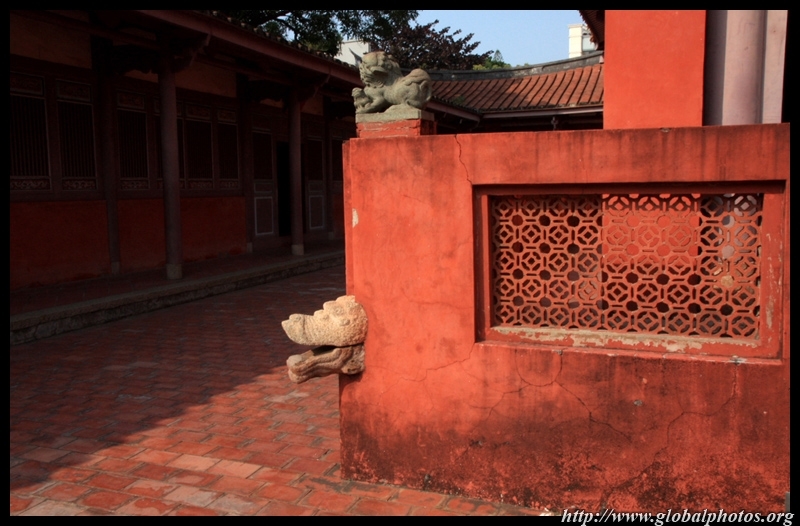 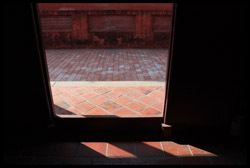 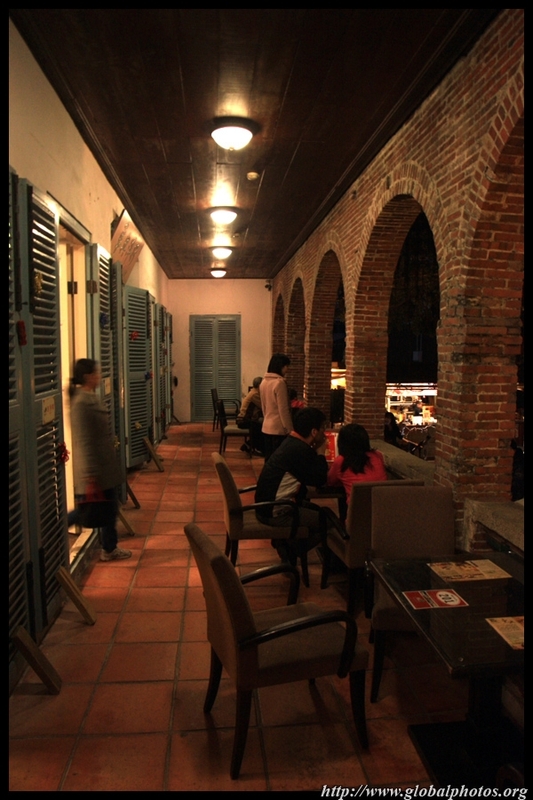 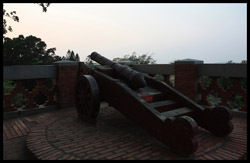 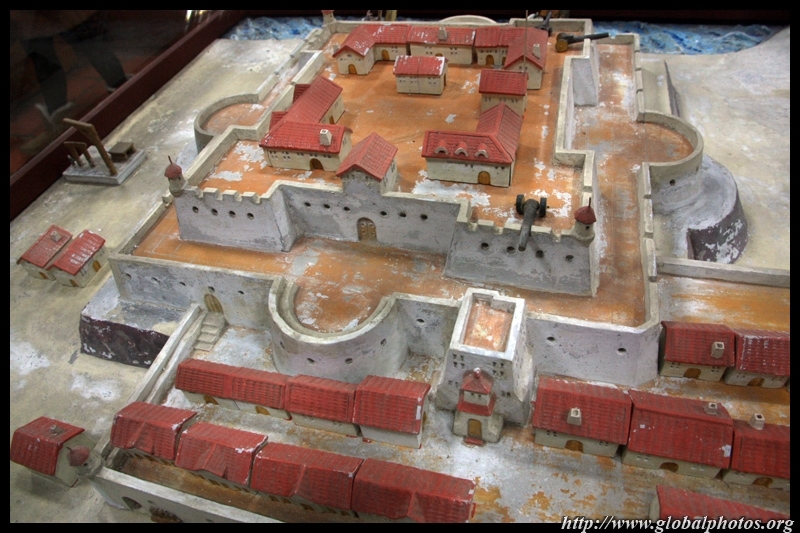 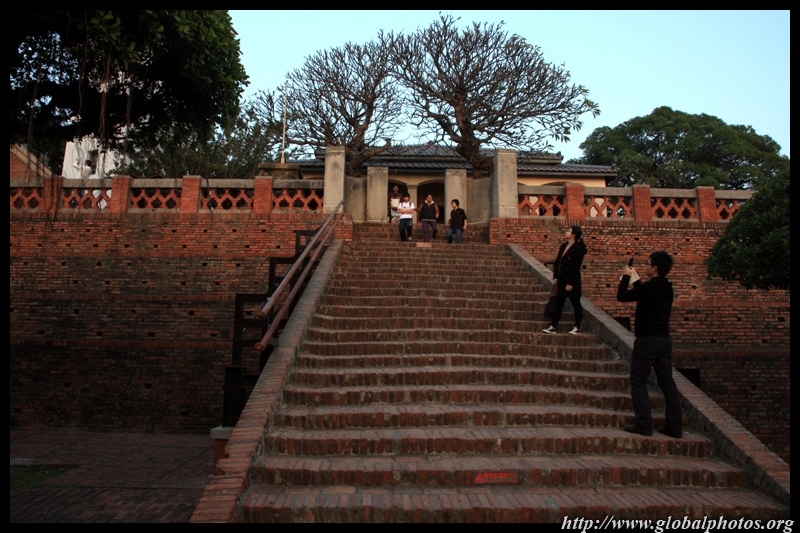 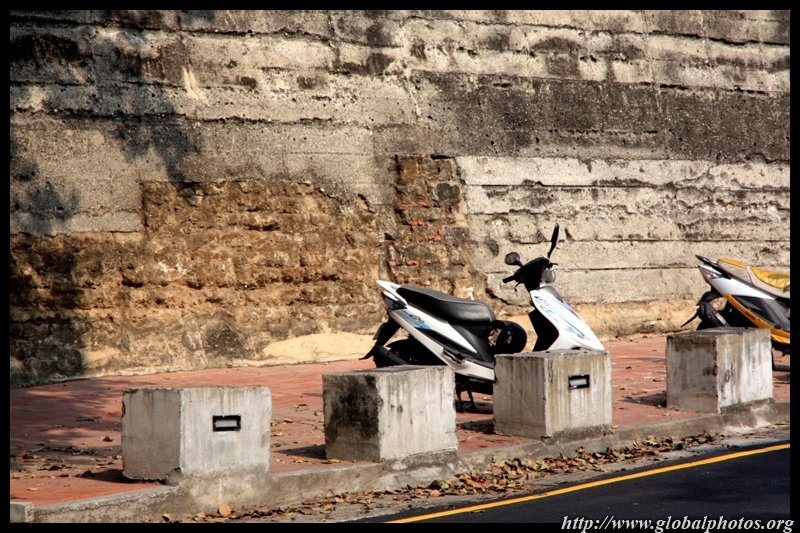 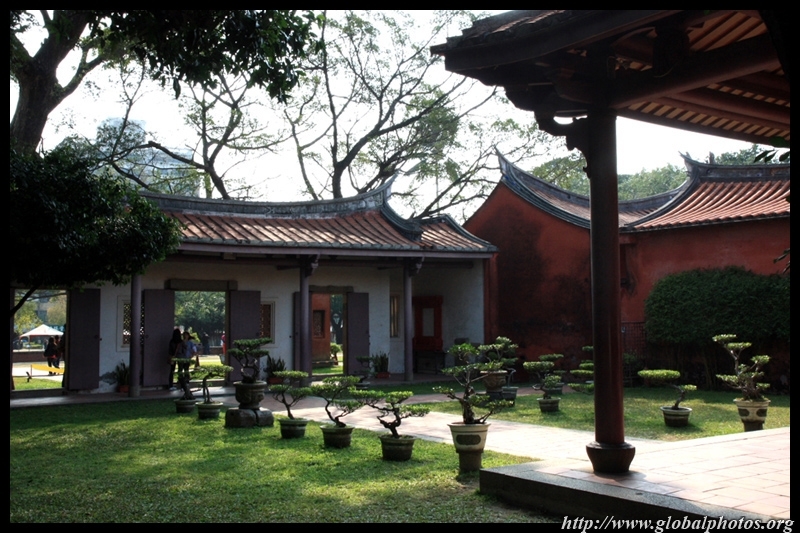 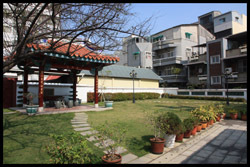 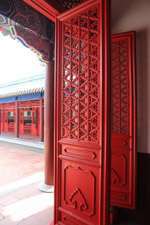 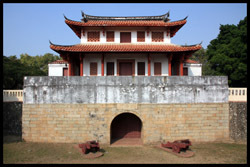 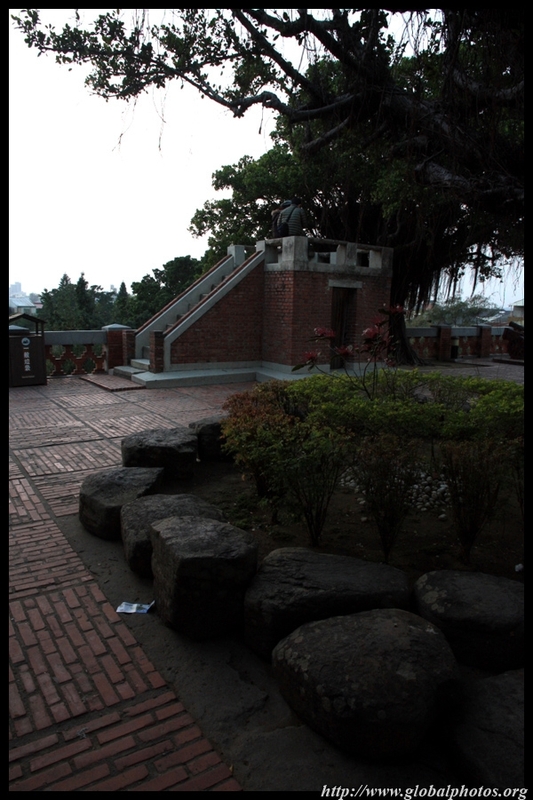 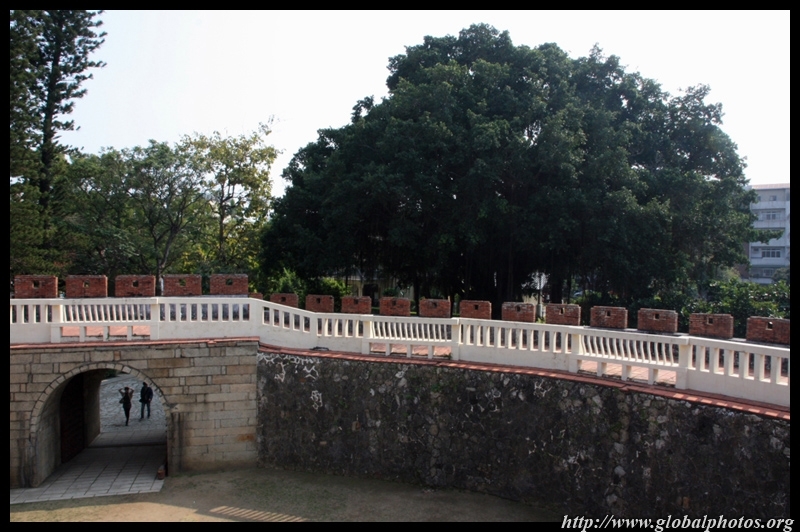 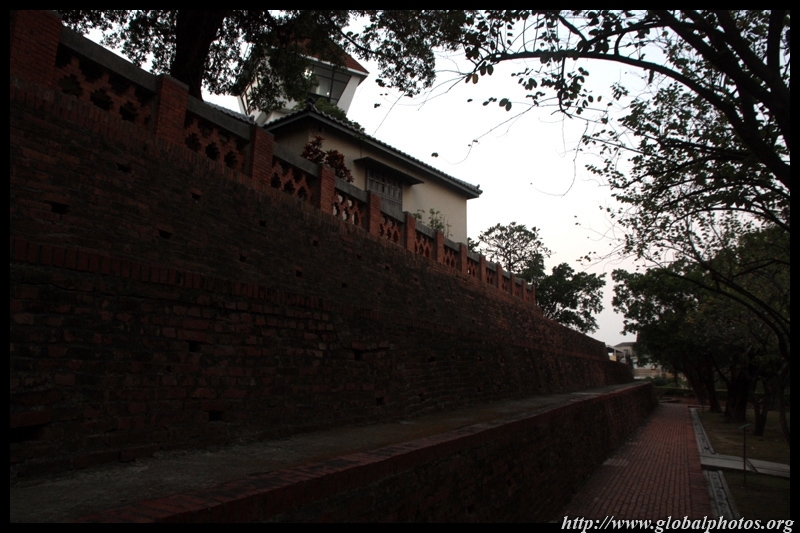 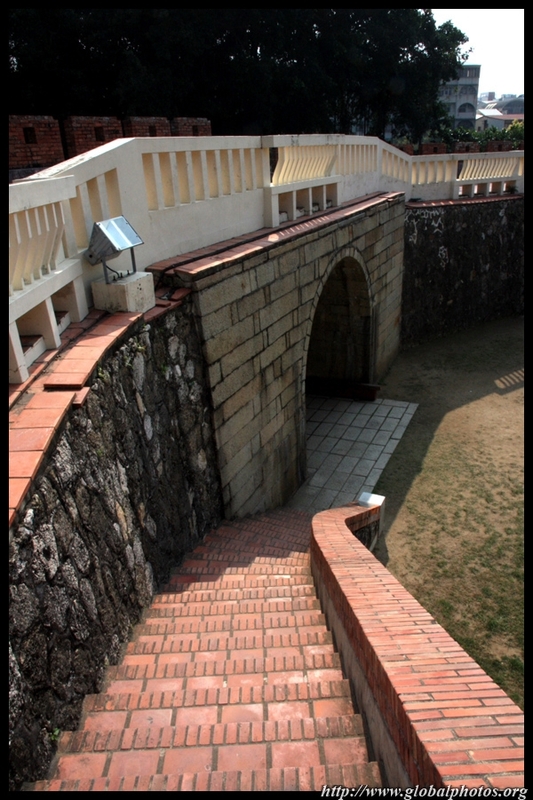 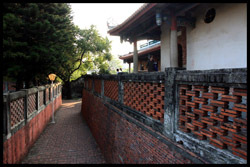 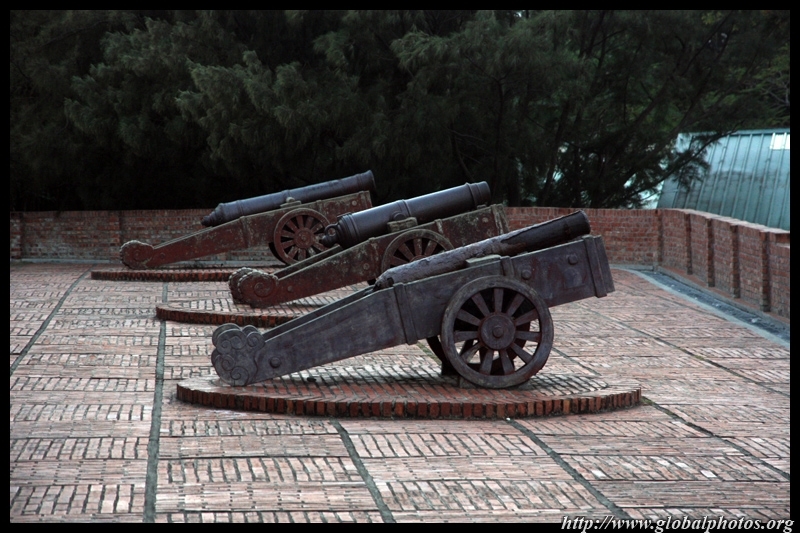 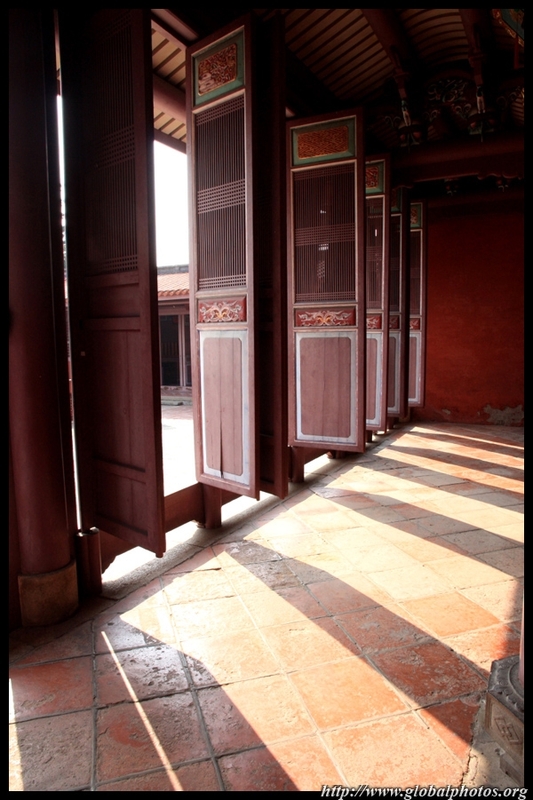 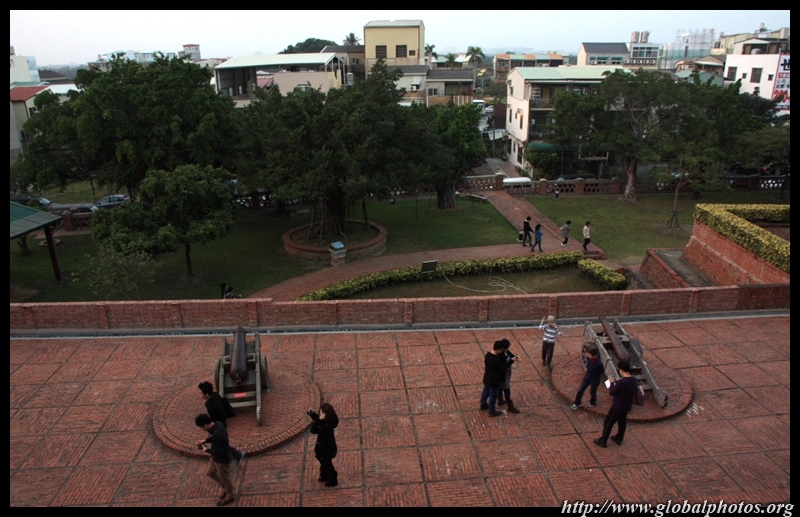 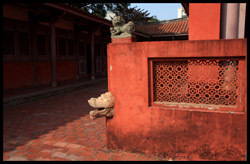 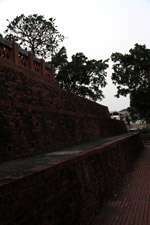 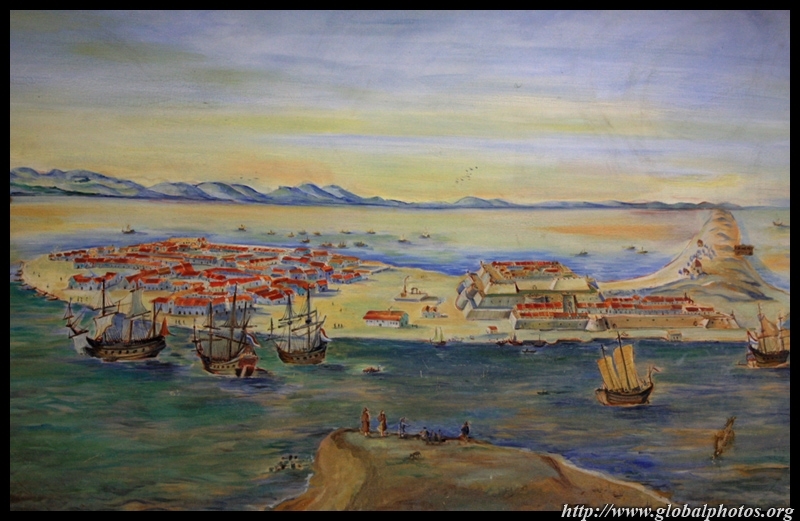 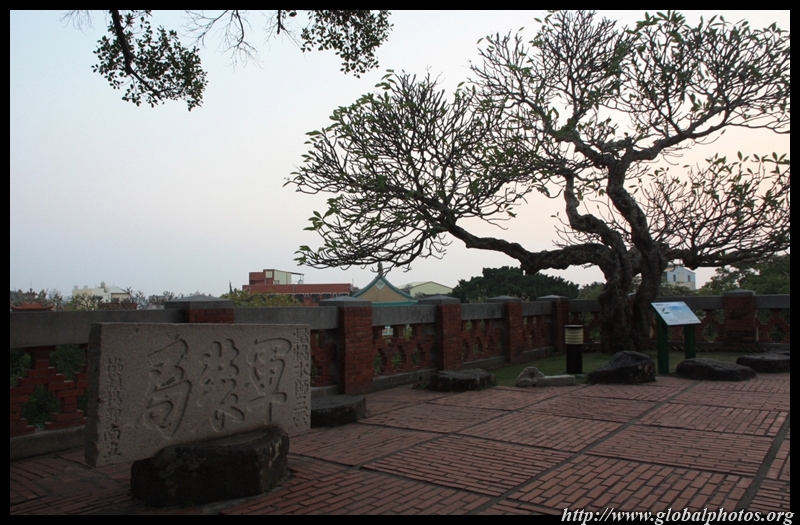 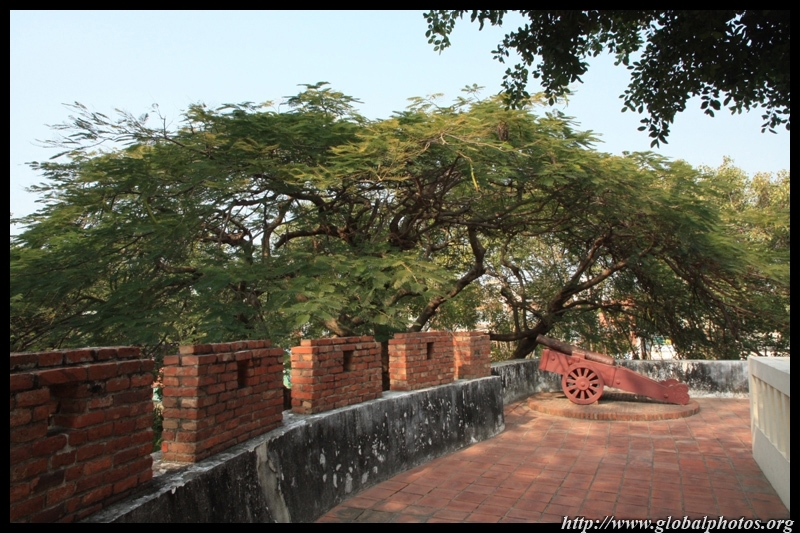 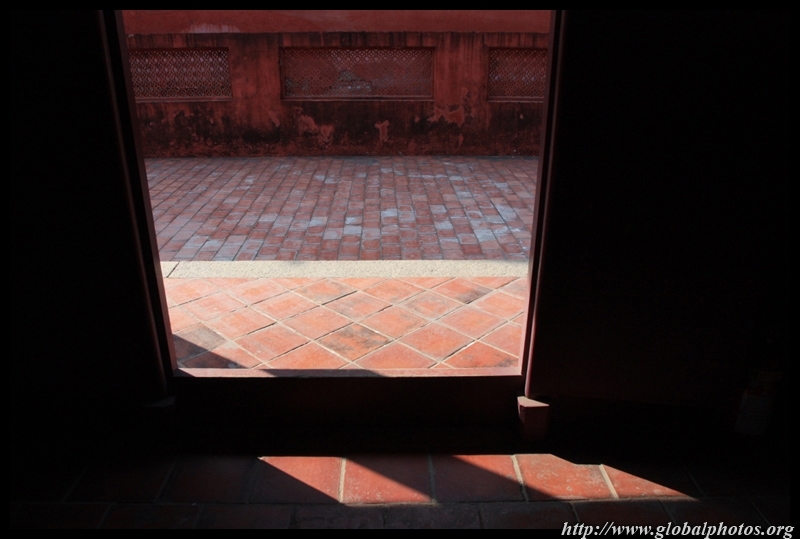 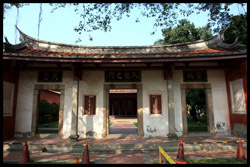 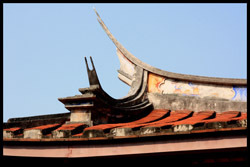 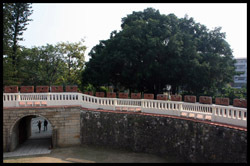 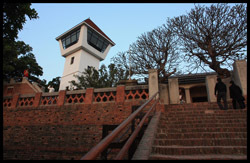 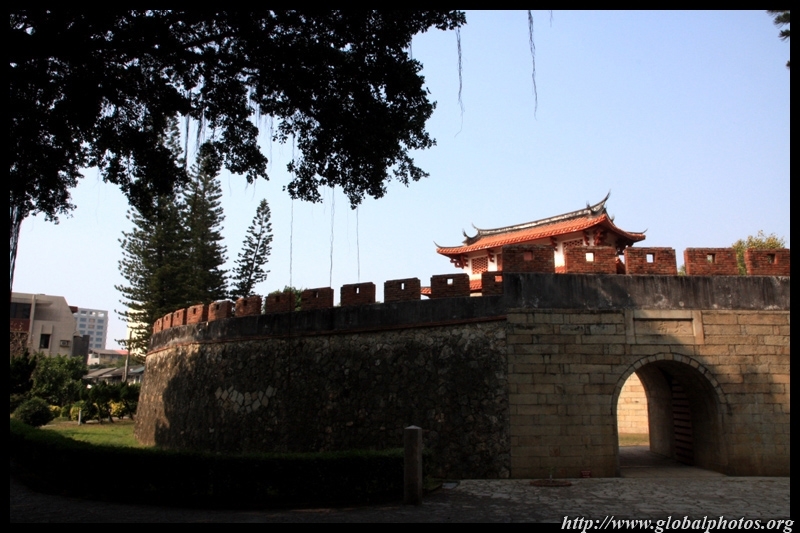 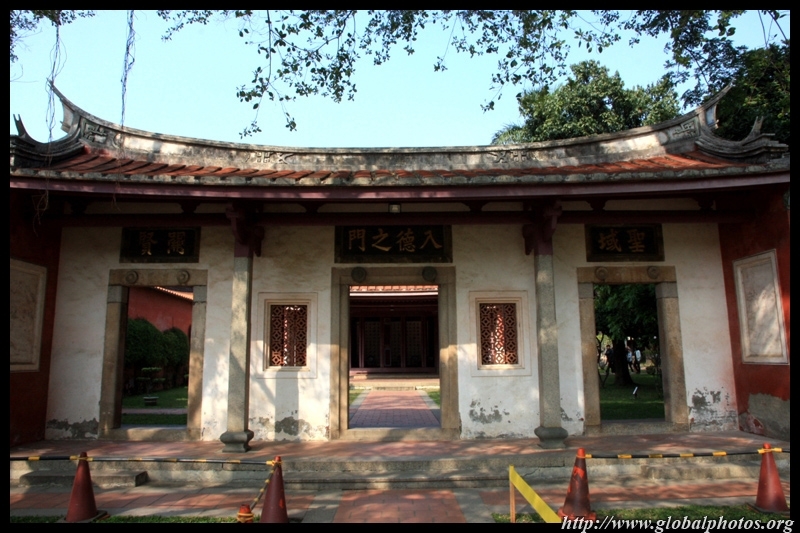 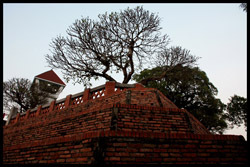 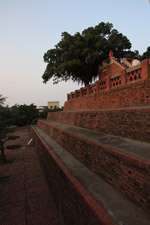 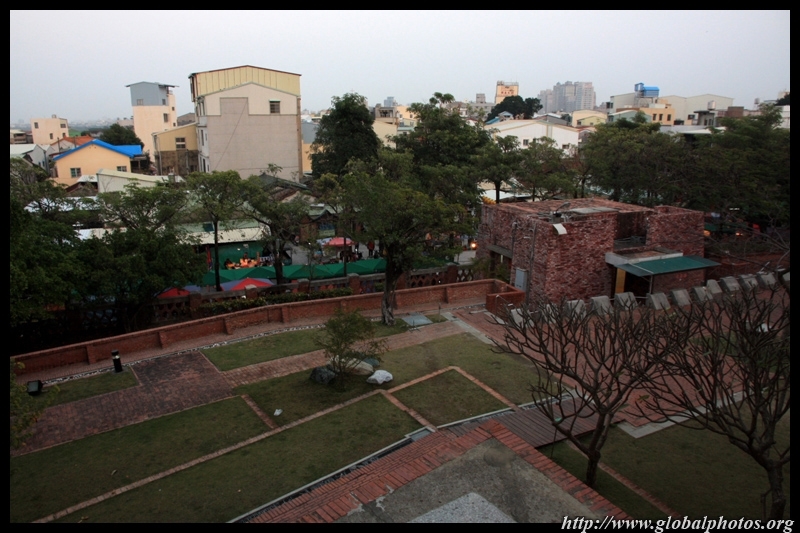 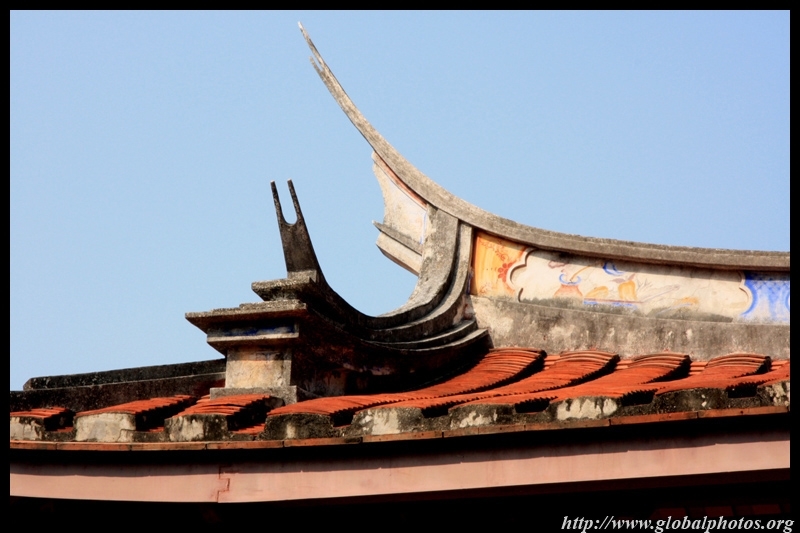 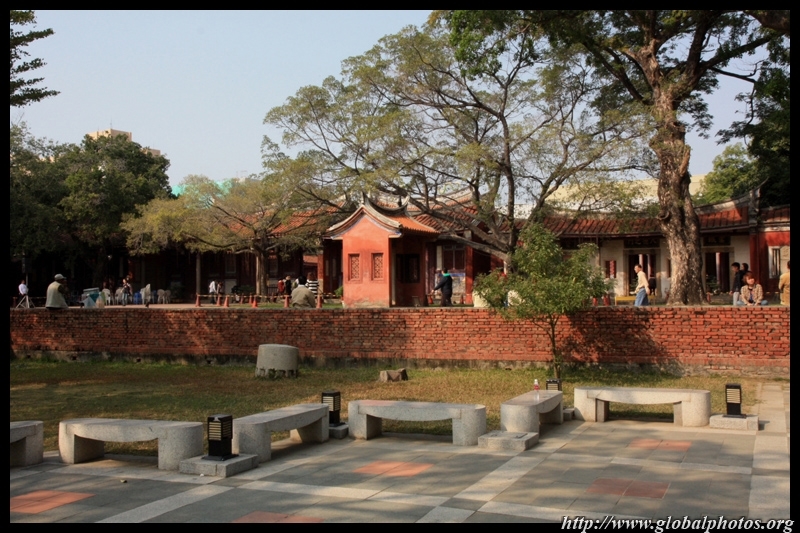 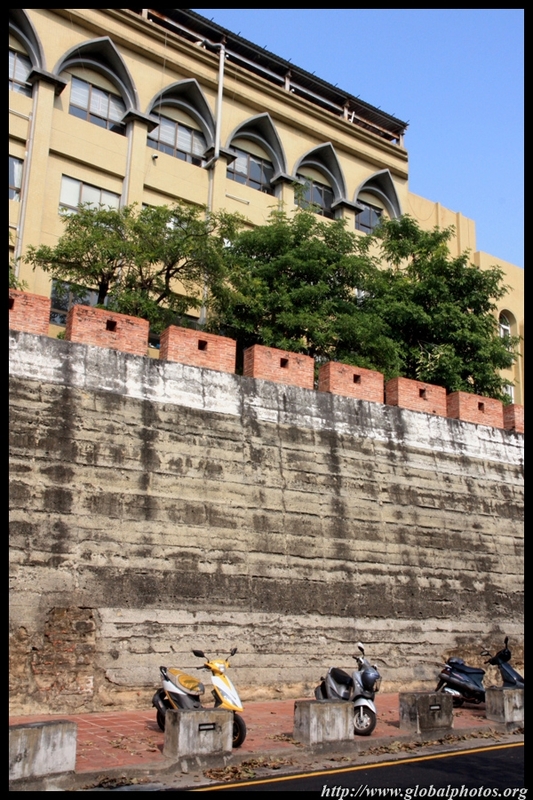 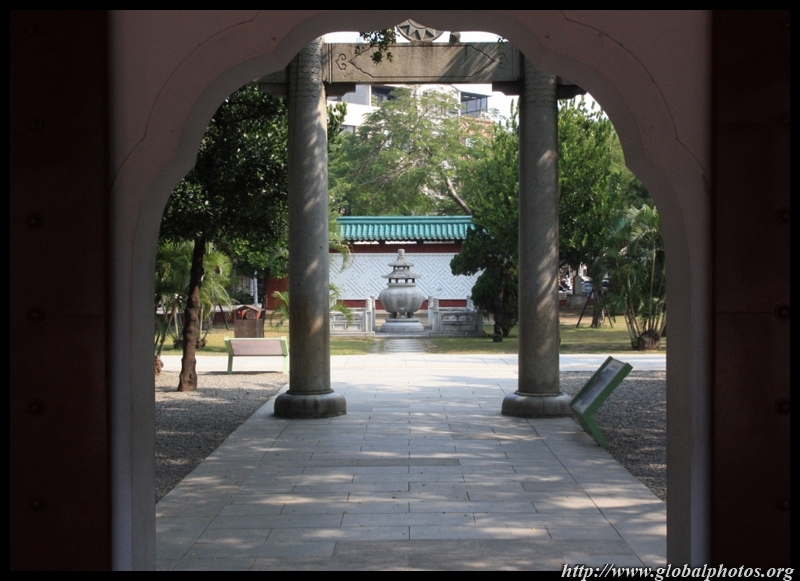 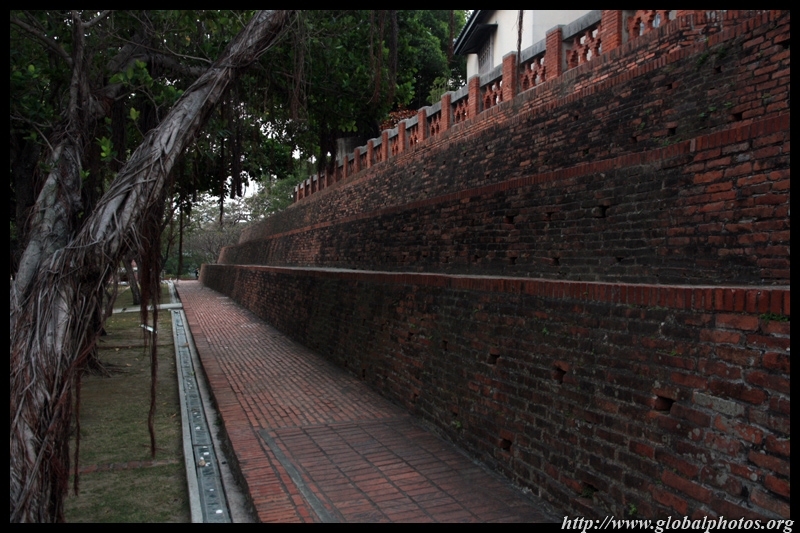 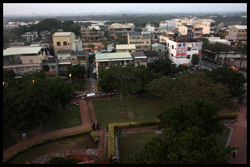 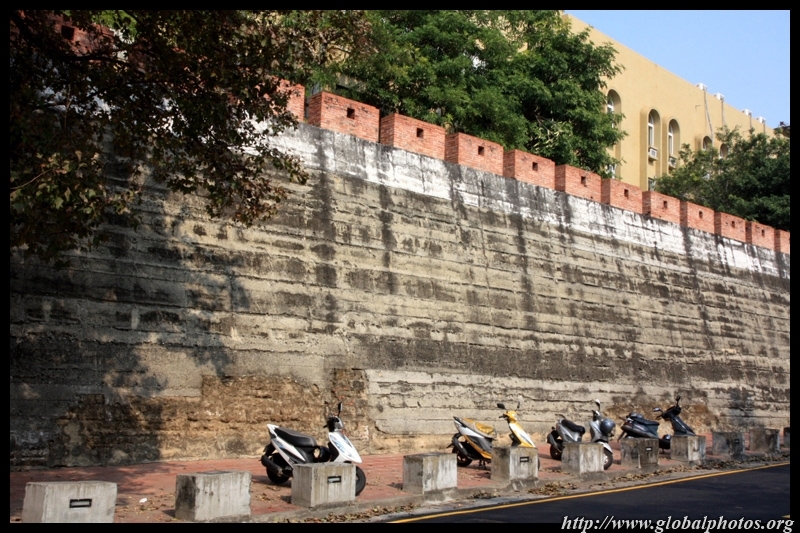 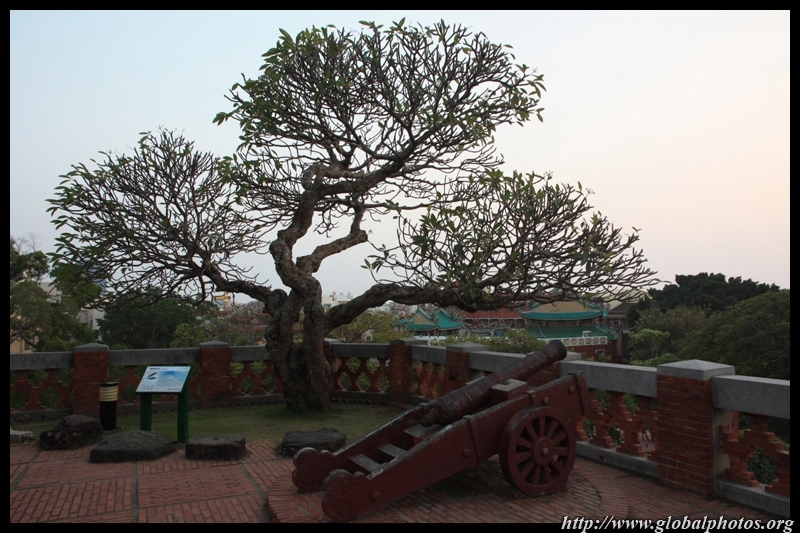 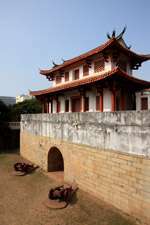 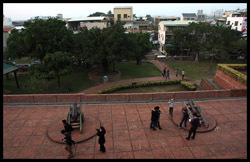 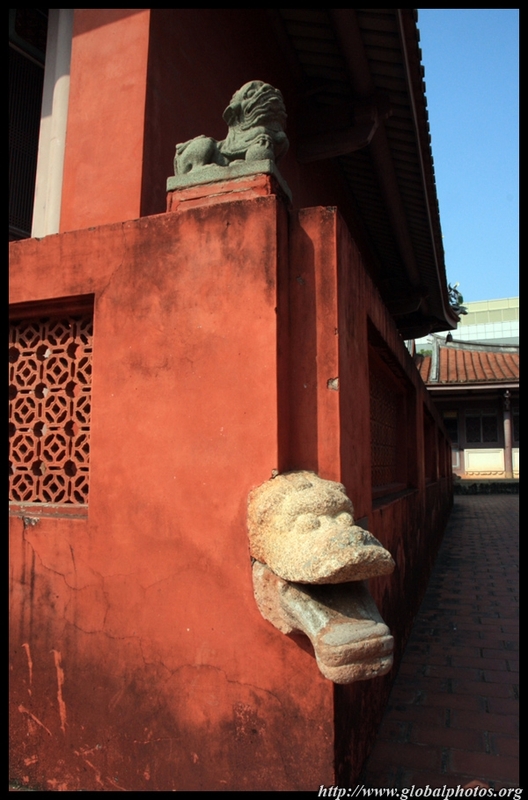 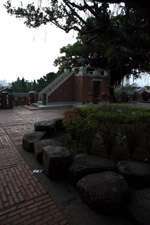 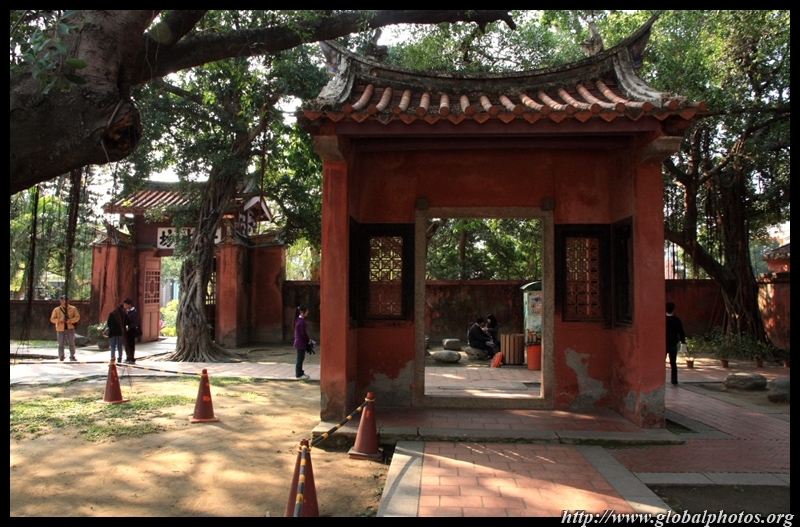 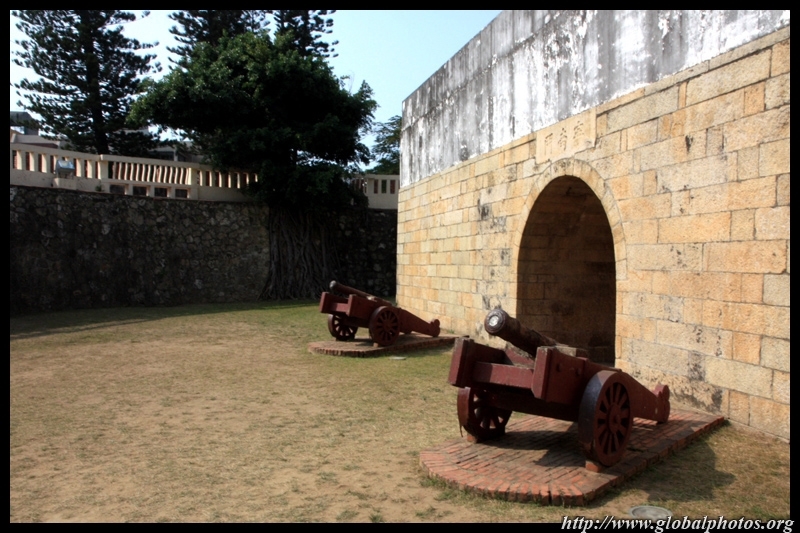 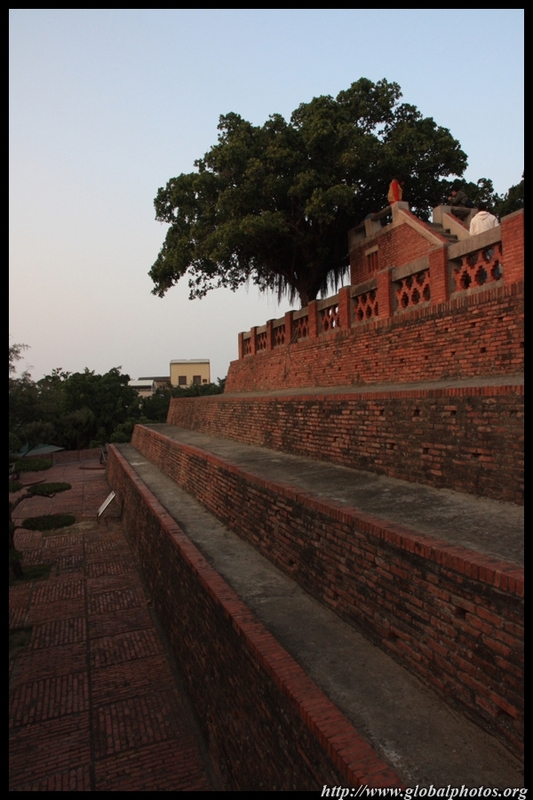 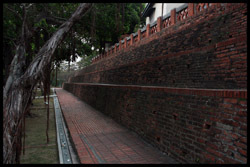 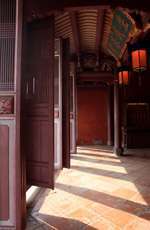 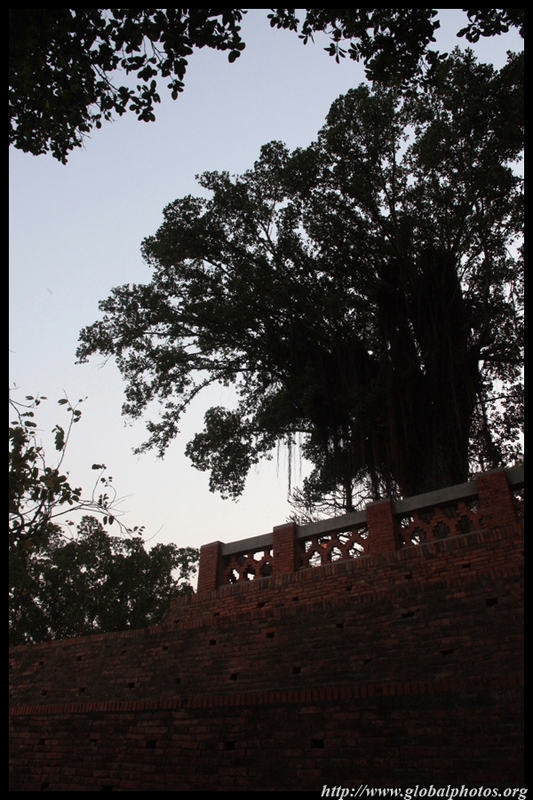 During the Qing Dynasty, Tainan's political centre moved eastwards, and the fort declined. 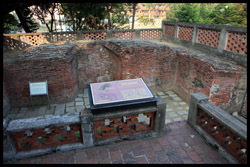 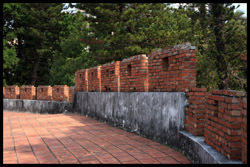 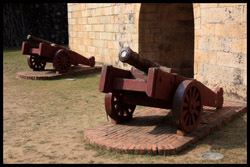 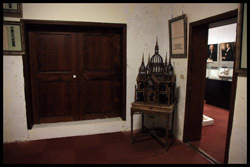 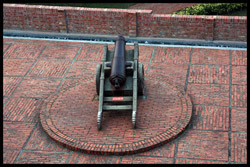 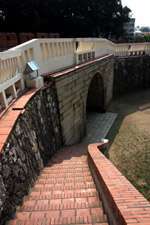 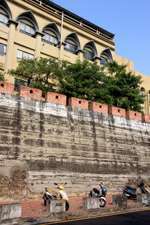 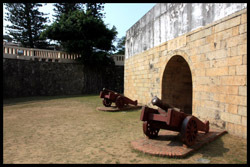 The fortress was partially dismantled during the Japanese occupation but remnants from the Dutch era could still be found today. 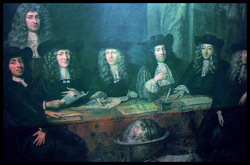 The Tait & Co. 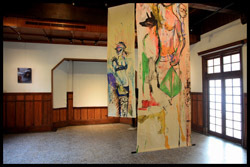 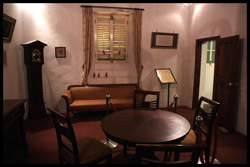 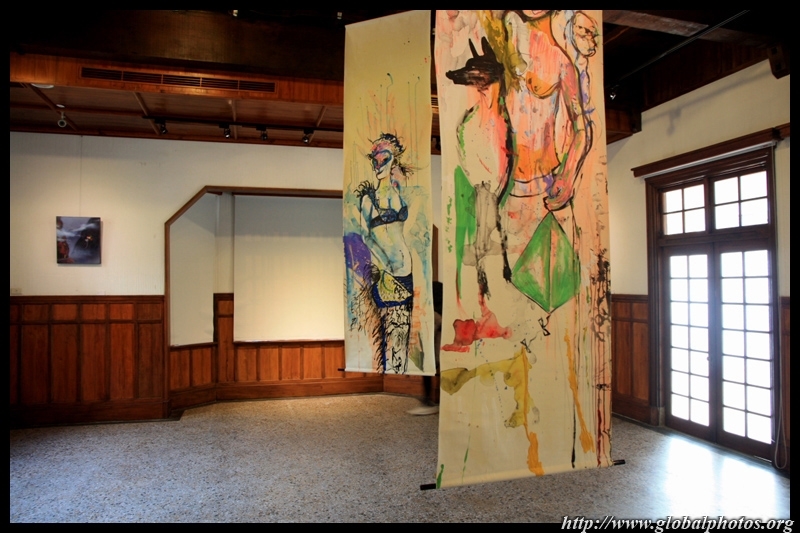 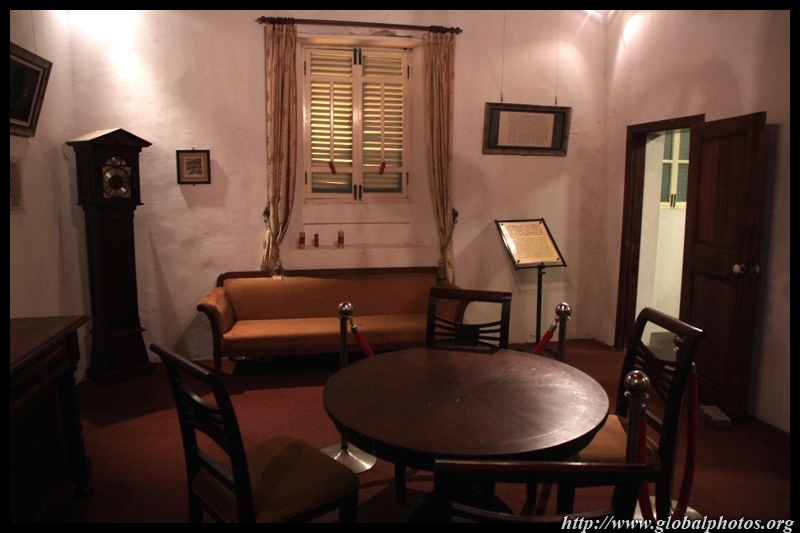 Merchant House was built by the British in 1867 although it now exhibits artifacts from the Dutch colonial era in the 17th century. 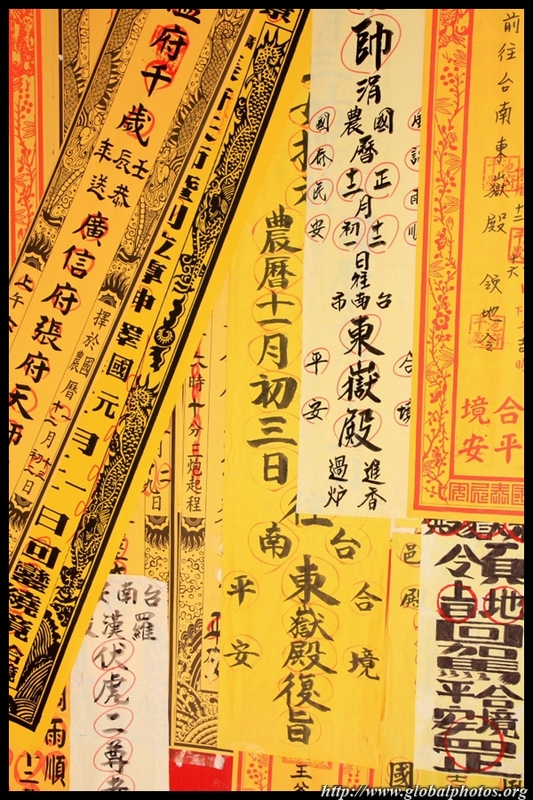 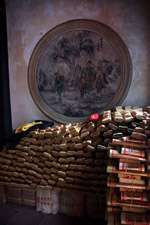 China's loss in the First Opium War with the British forced the imperial court to open up ports in Taiwan for trade. The Julius Mannich Merchant House dates from this post-war era when Europeans came to these shores.